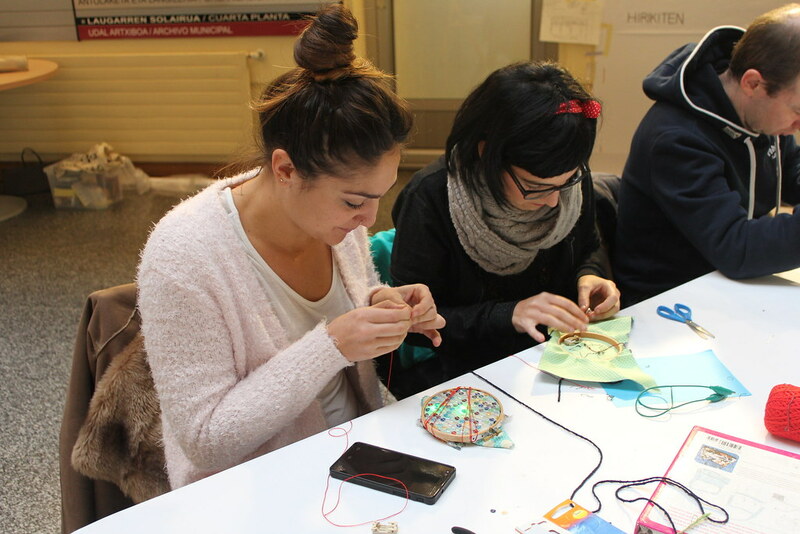 This hands-on workshop serves as an introduction of e-textiles and its possibilities for the applications into the Internet of Things. 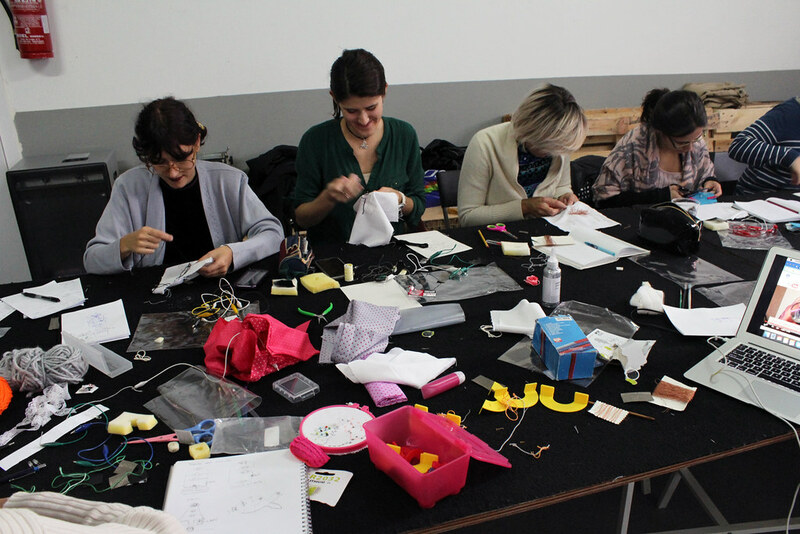 During the workshop, participants will learn how to build and design a DIY door stop object combining textiles and electronics. 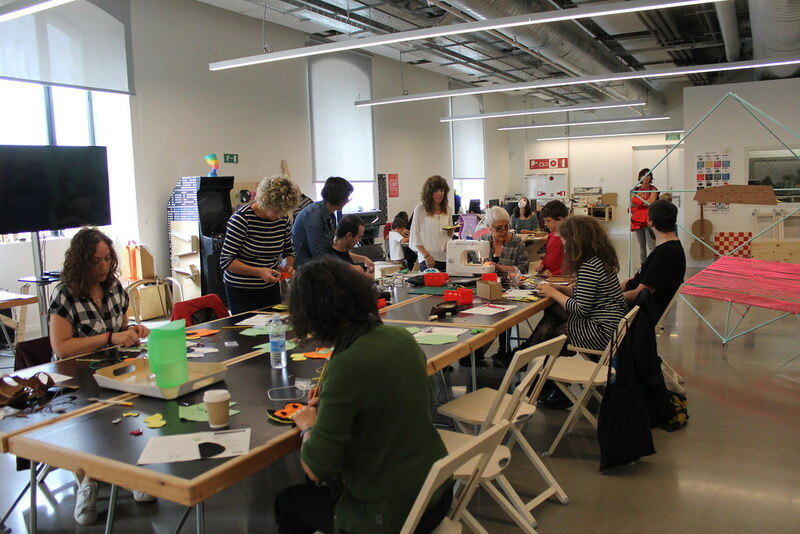 This workshop has been selected to participate in the project #Caseando that is a travelling project launched by VIC that seeks to consider the possibilities held out by self-build and open technologies, by means of a prototype home with self-produced citizen devices. 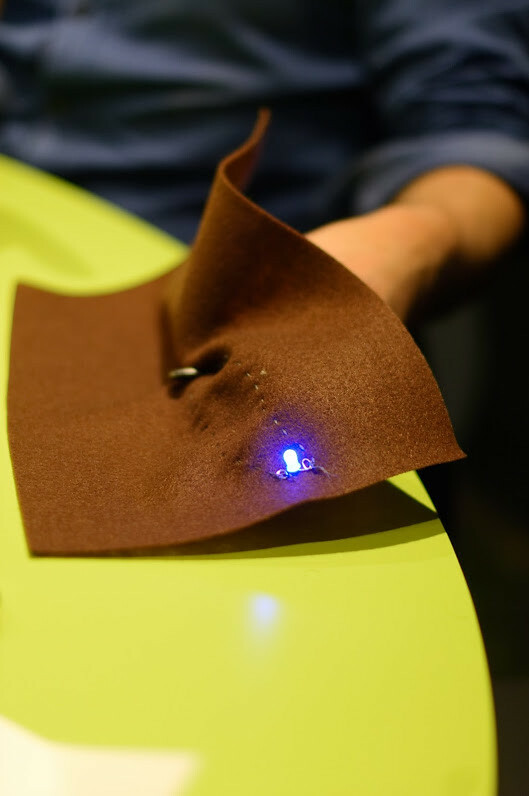 Soft Circuits are a new alternative way to assemble electronic circuitry using conductive thread and conductive fabrics. 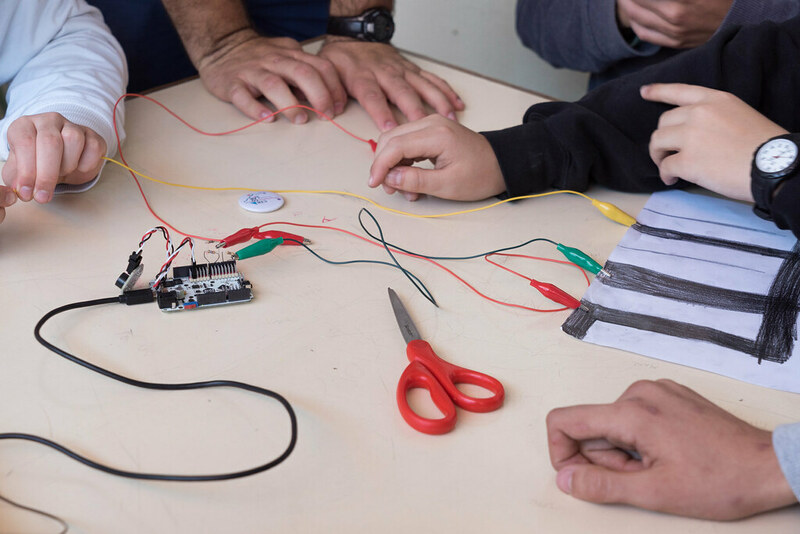 During this workshop for all ages participants will learn to build a soft circuit and basic electronics concepts. 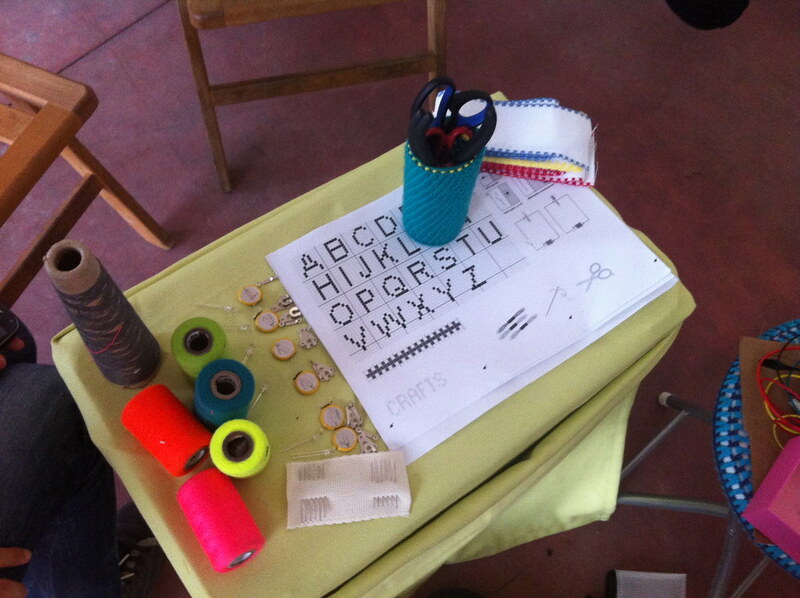 Also, manipulative skills such as sewing, drawing, cutting or pasting will be acquired. 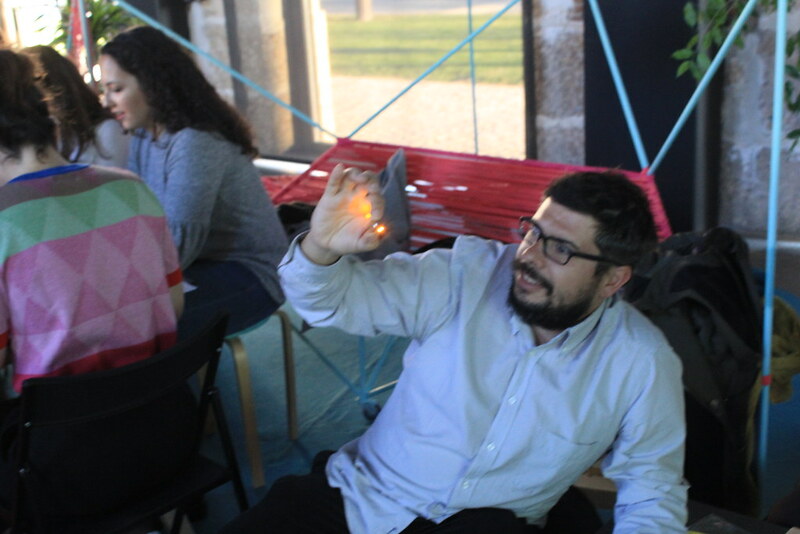 The workshop was held in the context of OSHWDem (Open Source Hardware Demonstration) at the Domus: Interactive science museum of Galicia. 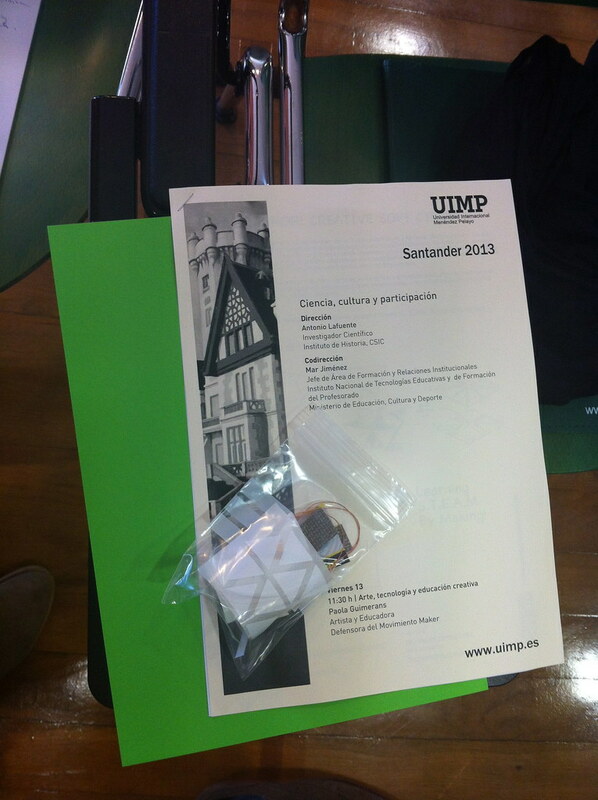 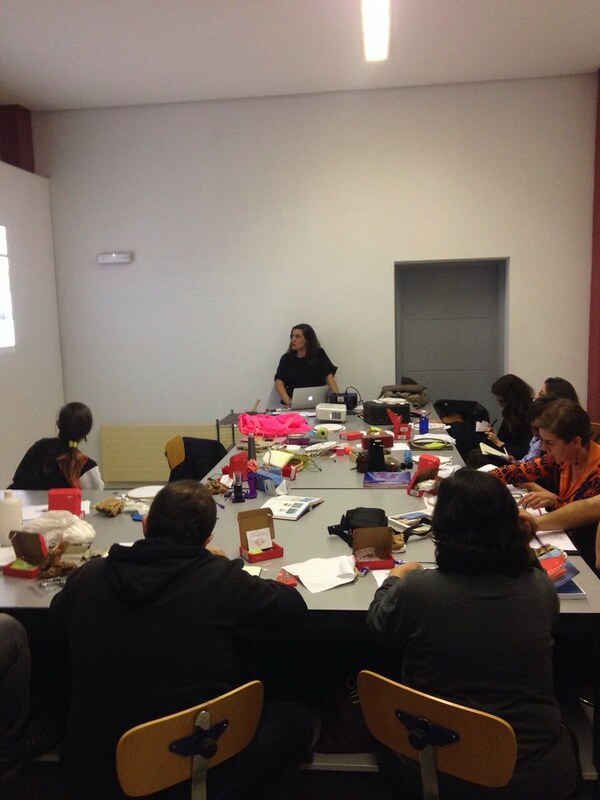 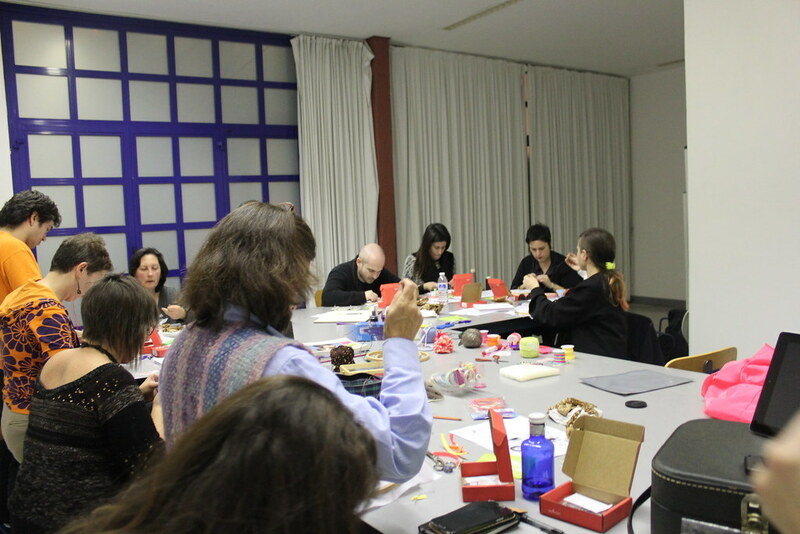 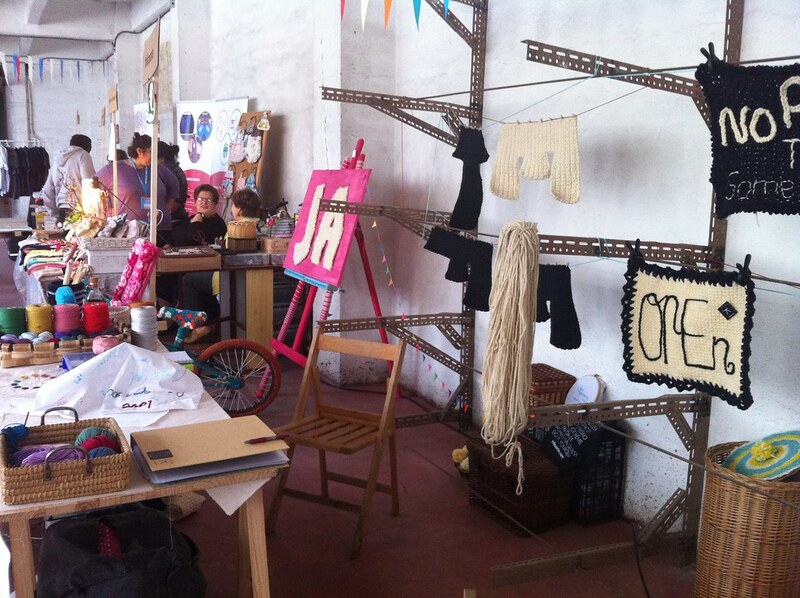 The workshop was held at UNITARIA, a multidisciplinary and collaborative space located in Santiago de Compostela. 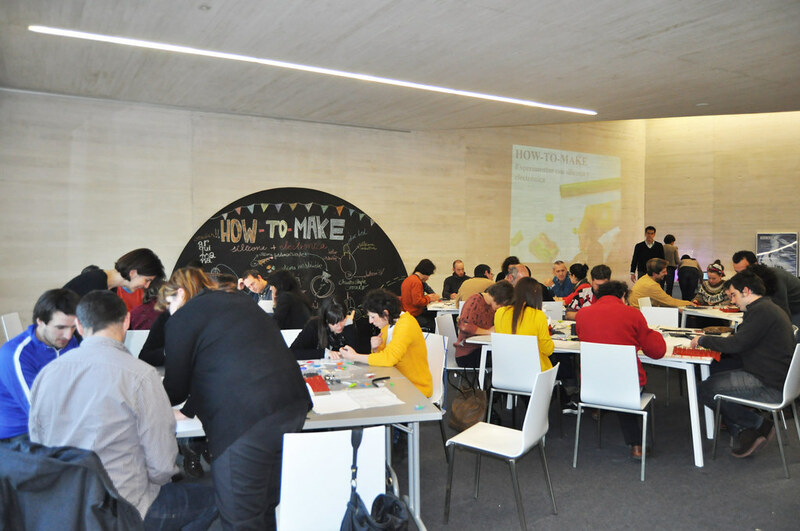 This school has as main objective the development of training actions aimed at professionals mainly in the audiovisual areas, new technologies, design or comic, among others. 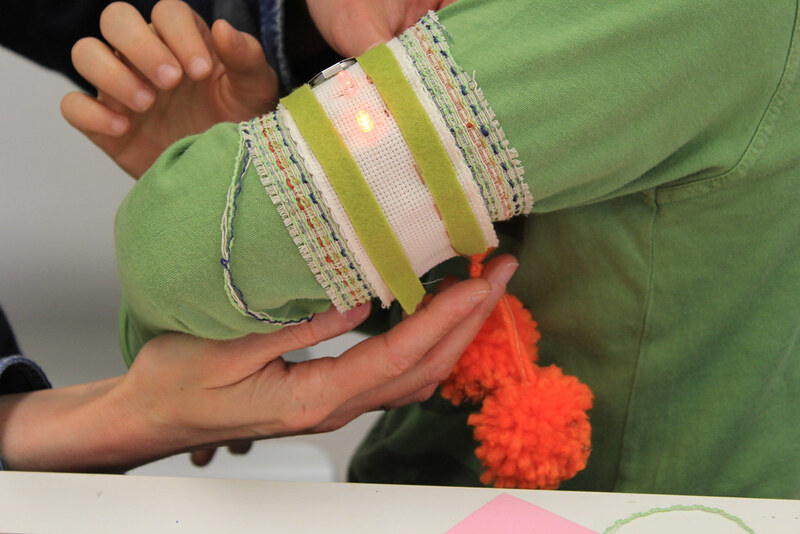 This hands-on workshop serves as an introduction to the new creative possibilities offered by electronic textiles applied to the domestic and personal. 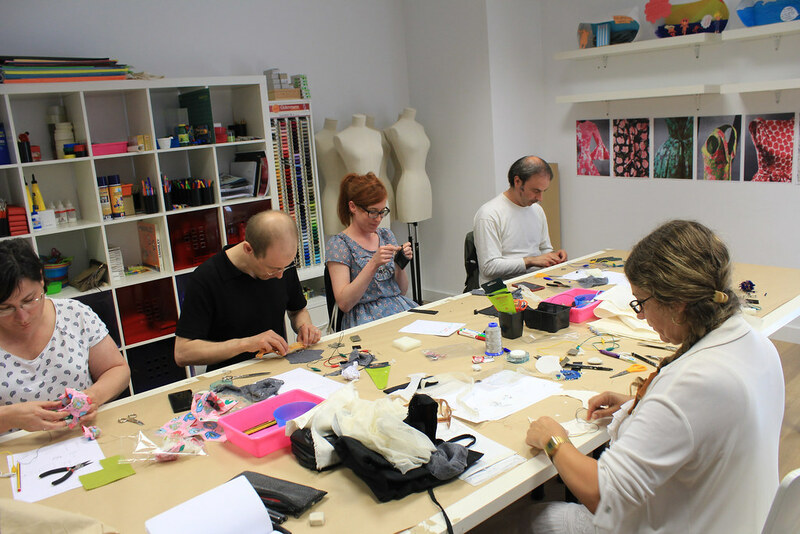 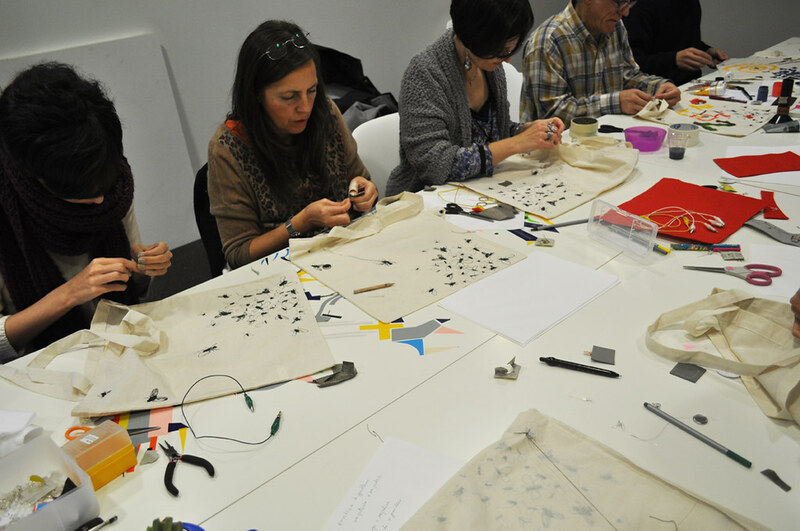 During the workshop, we will look at conductive fabrics, basic circuits and simple interaction elements, stitching and applying them to textiles. 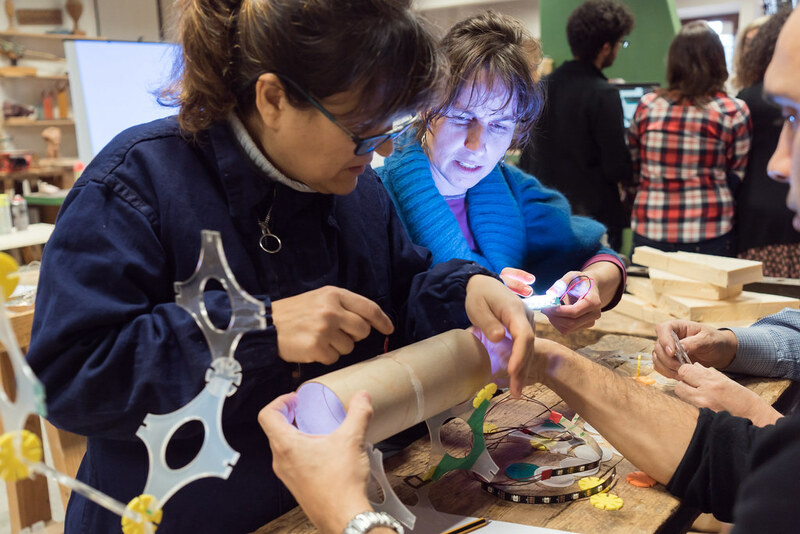 This workshop has been selected to participate in the project #Caseando that is a travelling project launched by VIC that seeks to consider the possibilities held out by self-build and open technologies, by means of a prototype home with self-produced citizen devices. 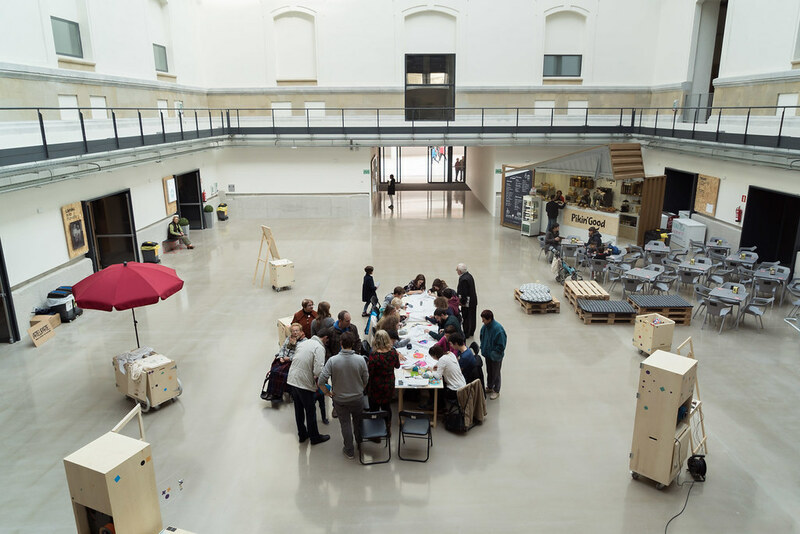 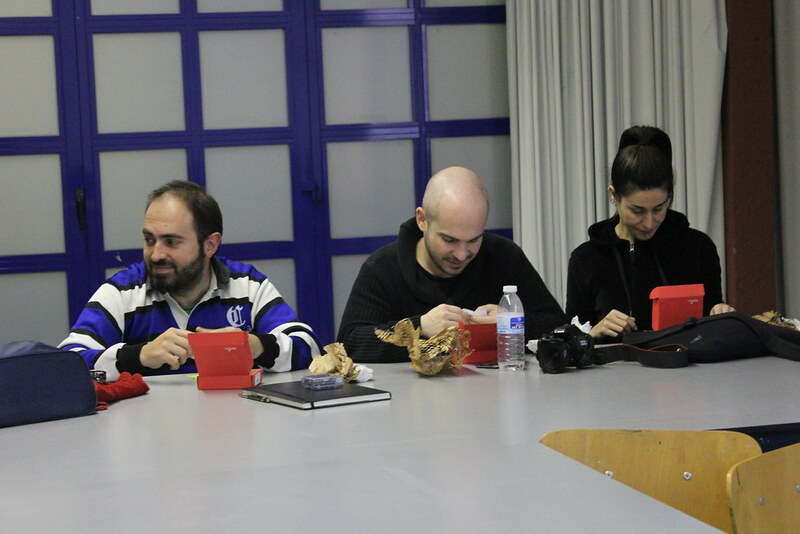 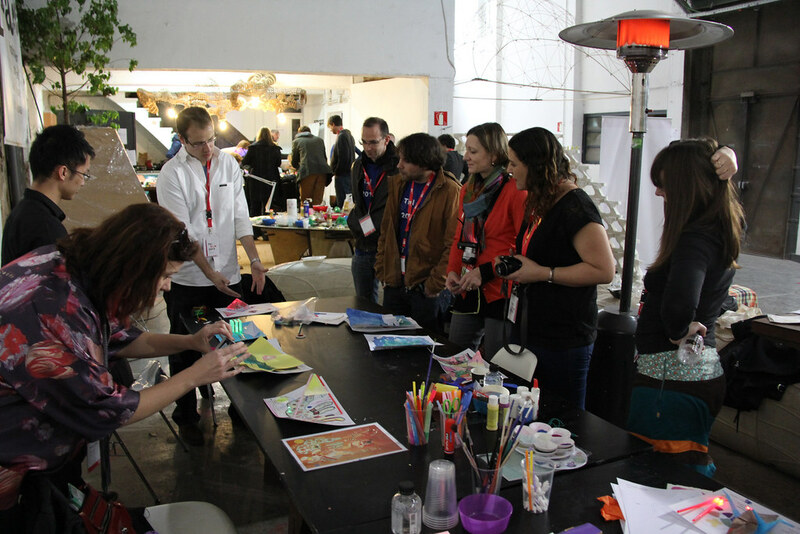 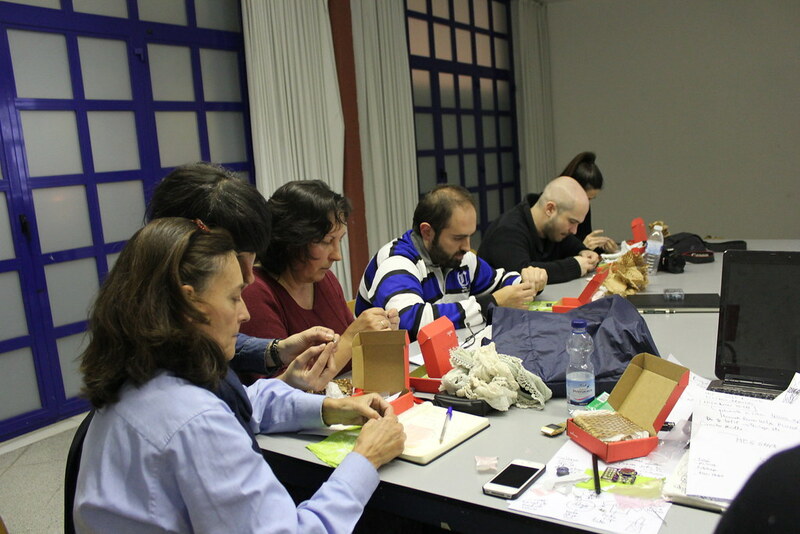 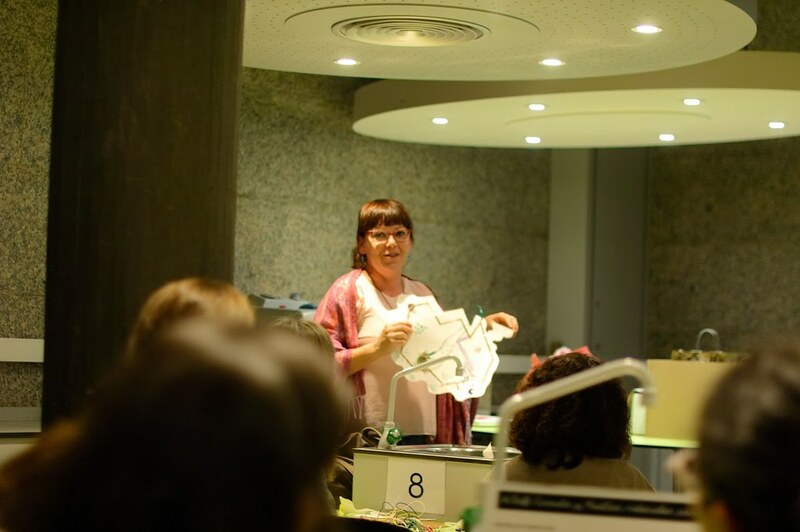 The workshop was held at citizen laboratory of digital culture and technology of Tabakalera International Center of Contemporary Culture of the Basque Country. 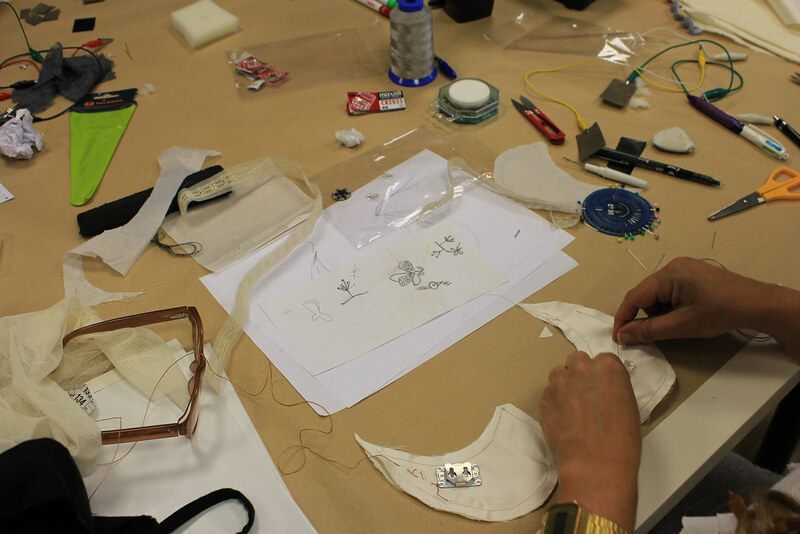 This theoretical-practical workshop of technology applied to fashion is presented as an approach to the new creative possibilities of DIY electronics. 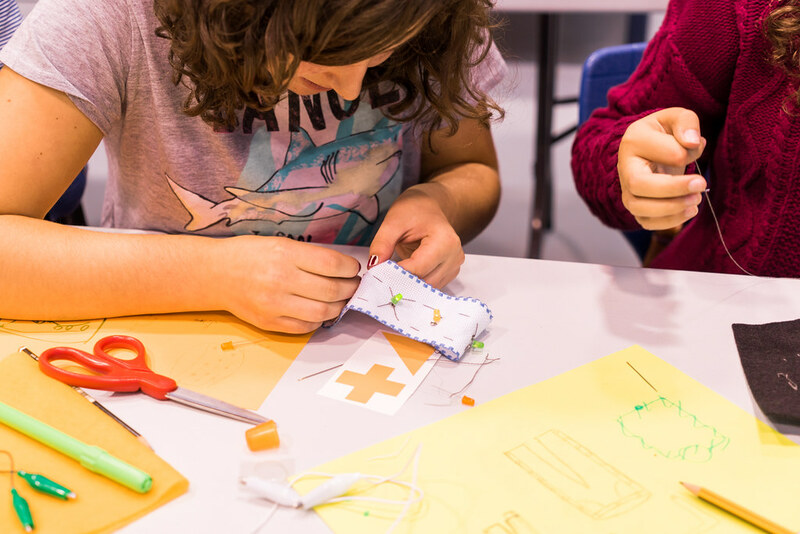 Participants will learn how to build circuits, experiment with smart materials and explore the creative potentials offered by the integration of electronics into textiles. 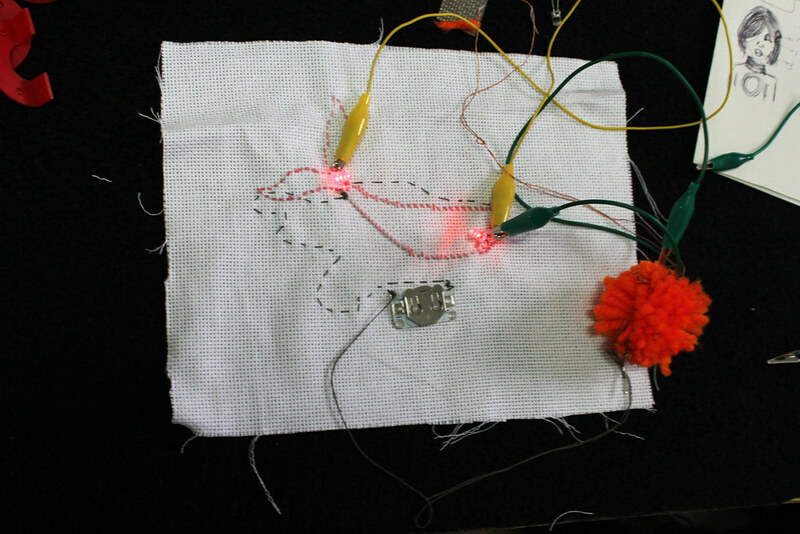 It is proposed the development of two electronic circuits for the preparation of an accessory or an interactive garment with lace. 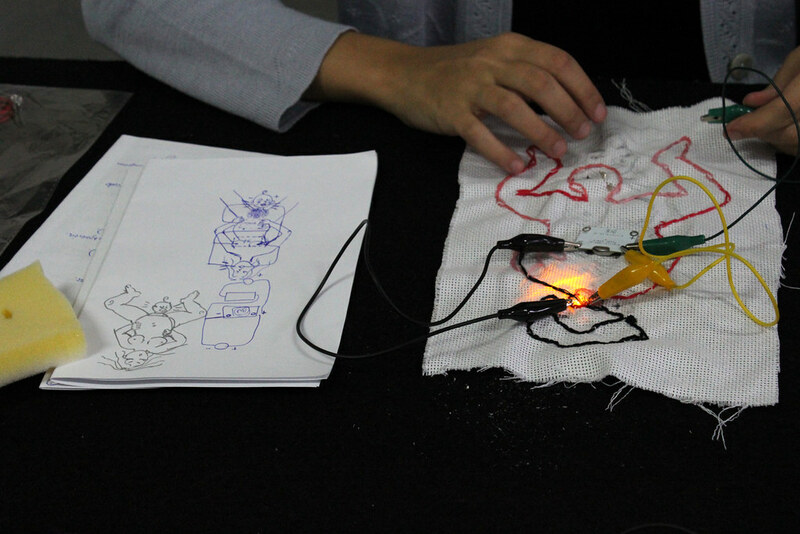 The principles of basic electronics, and the properties of technological materials such as electrically conductive yarn or textiles, will be discussed first. 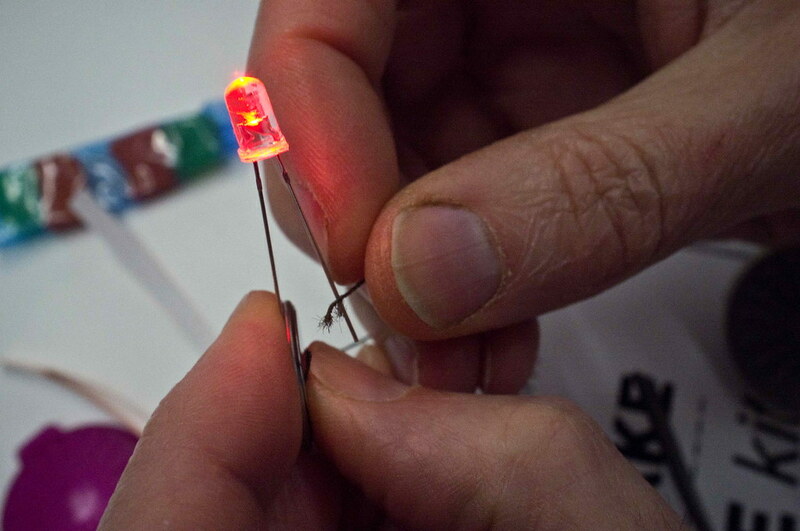 And, later, an initiation will be offered to the LilyTiny Arduino. 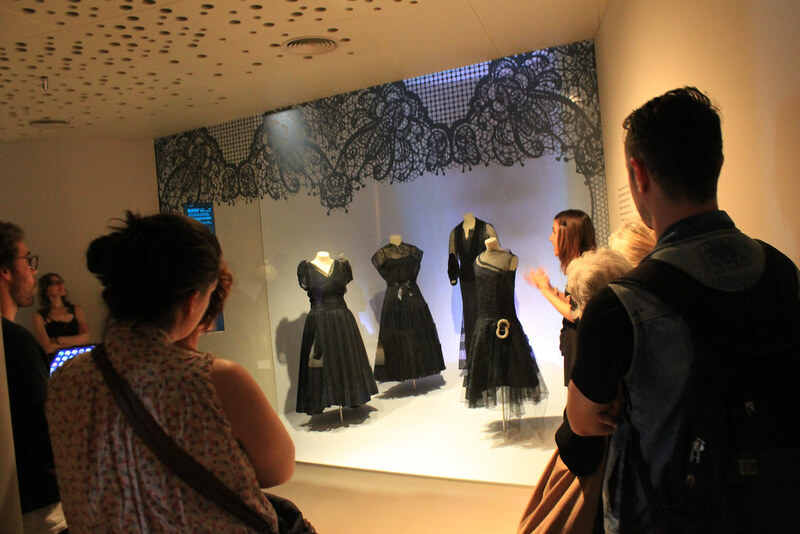 This workshop is a collaboration with the Education Department of Cristóbal Balenciaga Museum durig the exhibition Balenciaga master of lace. 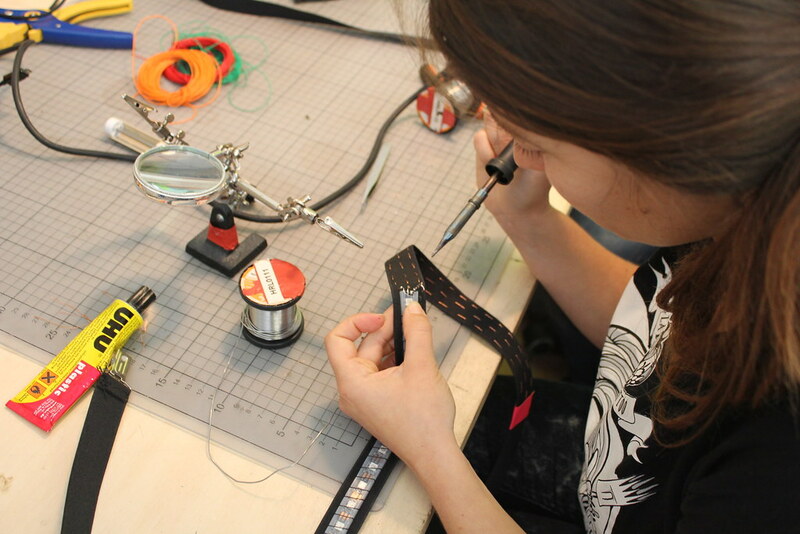 This project-based workshop is aimed at RollerDerby players to learn how to build their own equipment. 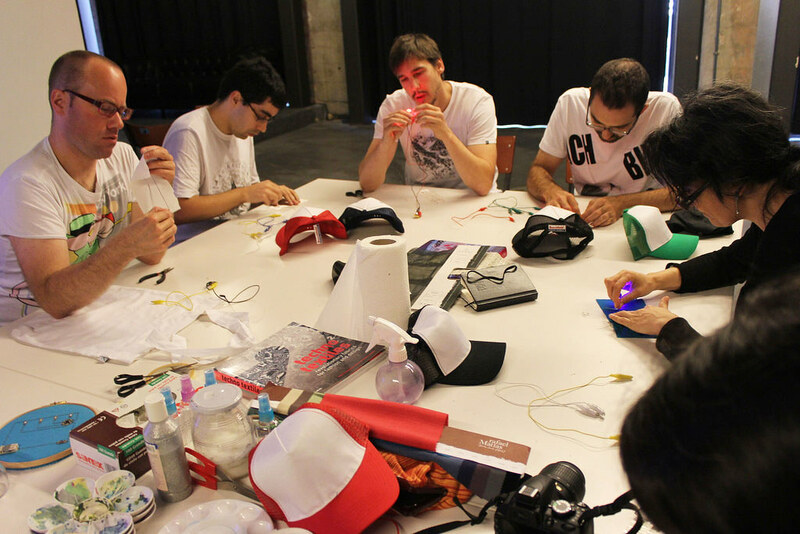 The objective of the workshop is to create light shoulder pads, which serve to differentiate the teams in an outdoor game. 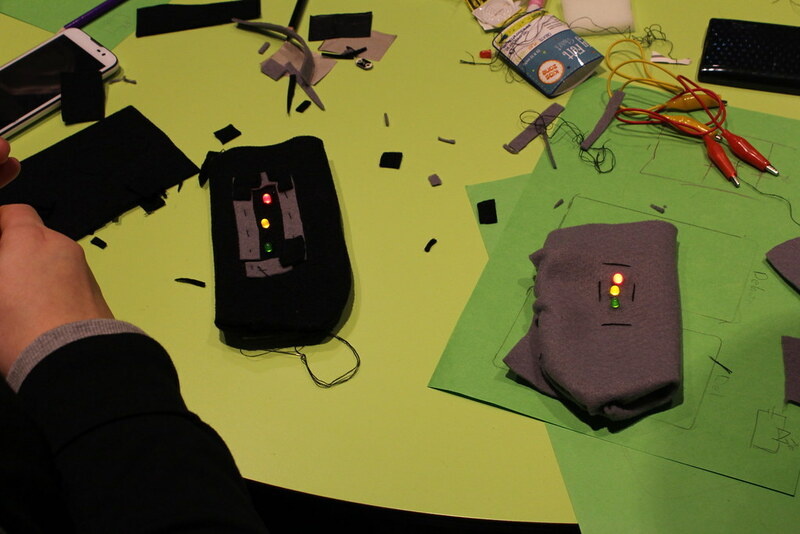 To create the system of lights we will use custom-made straps in which the LED strips will be sewn and the other elements, such as the Arduino Flora and a battery, will be integrated. 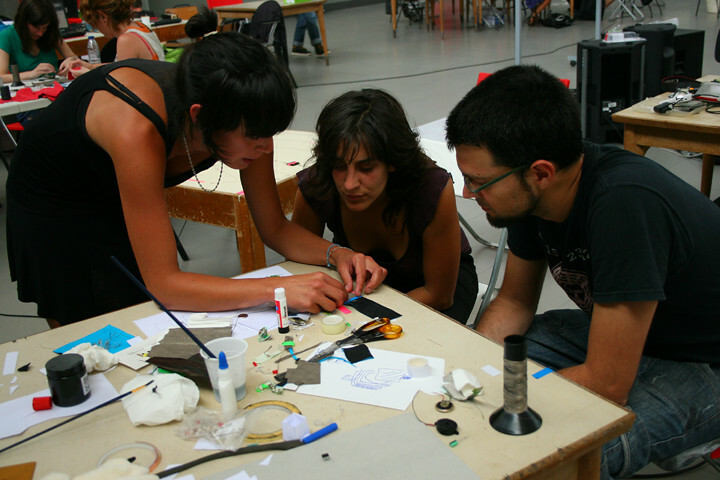 Open Led Roller is a small project that launches in Hirikilabs citizen’s laboratory of Tabakalera International Center of Contemporary Culture at the context of OlatuTalka as a way to socialize open technologies, opening to a certain extent the activity of the laboratory to new agents and collectives. 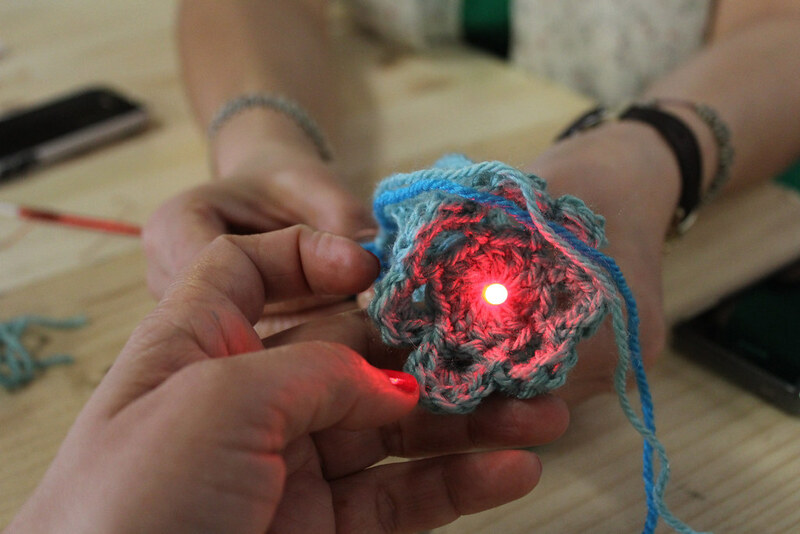 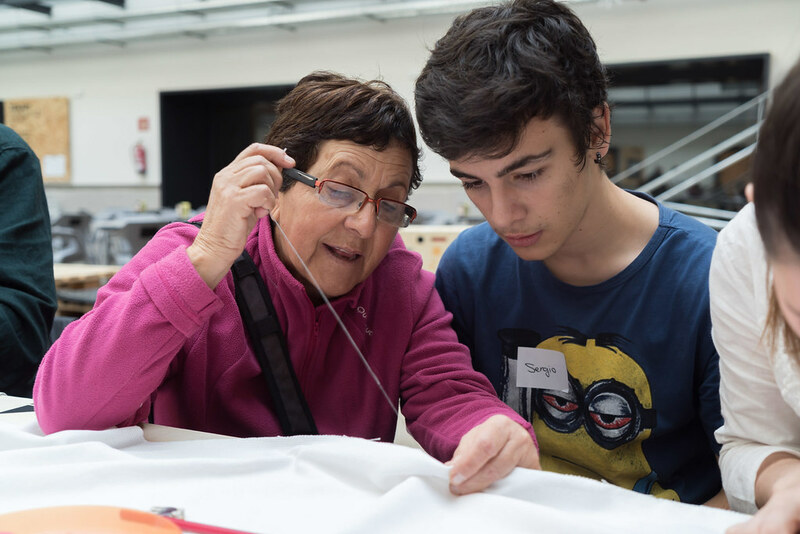 Knitting with LEDs is a collective action that brings technology to the elderly through the traditional processes of sewing, crochet or embroidery. 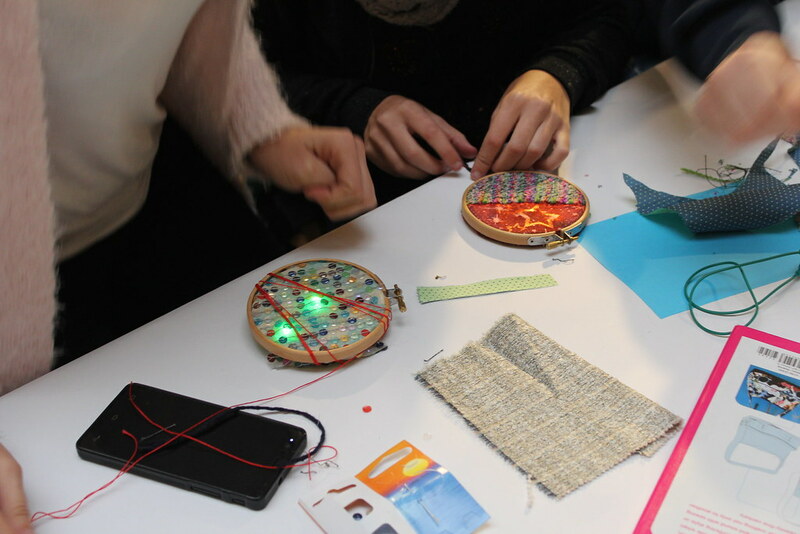 This hands-on workshop explore what you can do to bridge the digital generational gap through e-textile and DIY practices. 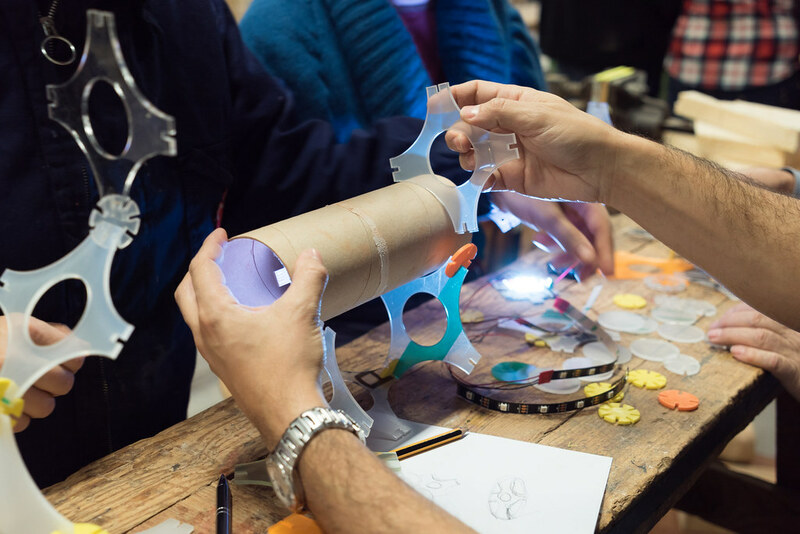 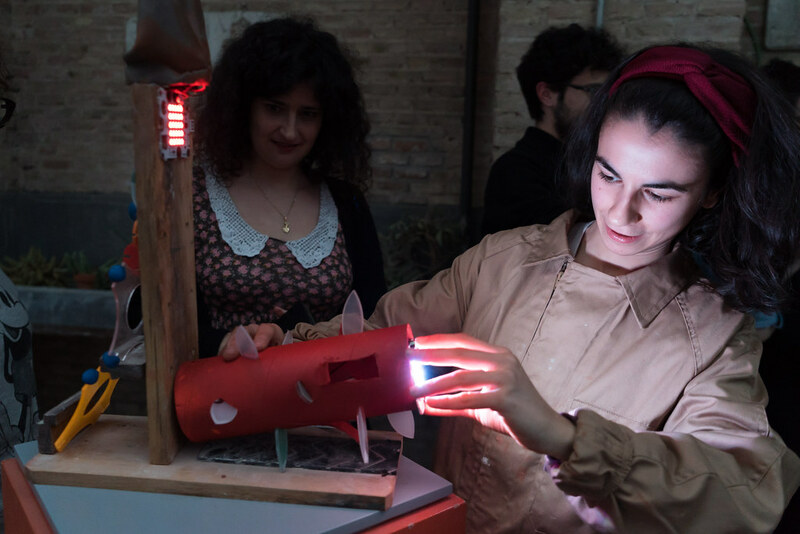 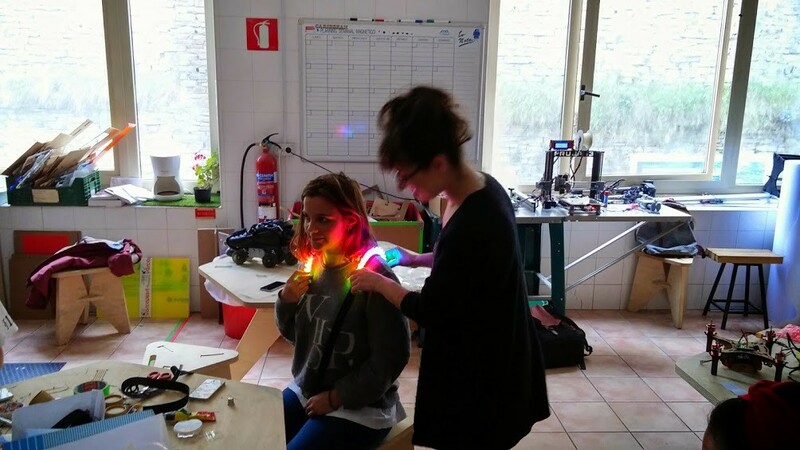 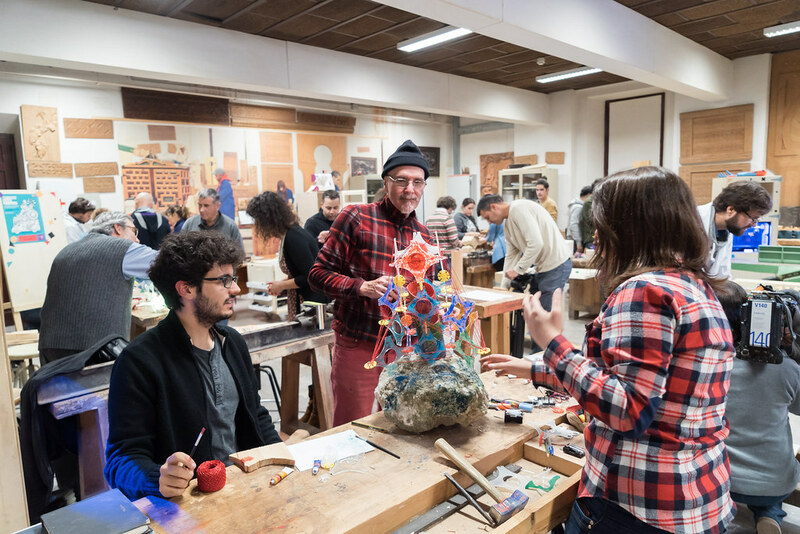 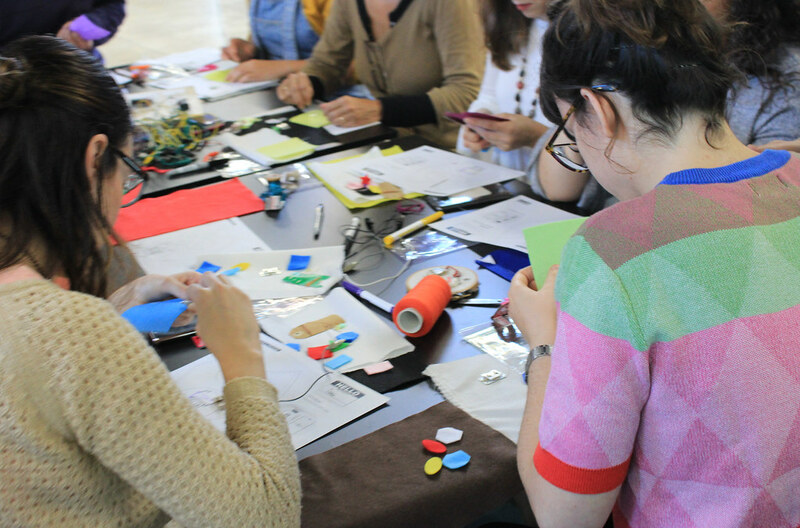 I designed this workshop as a part of the project Circolab that is an itinerant educational-technological experimentation Fab Lab laboratory that aims to bring society closer to the new competences born of Digital Culture. 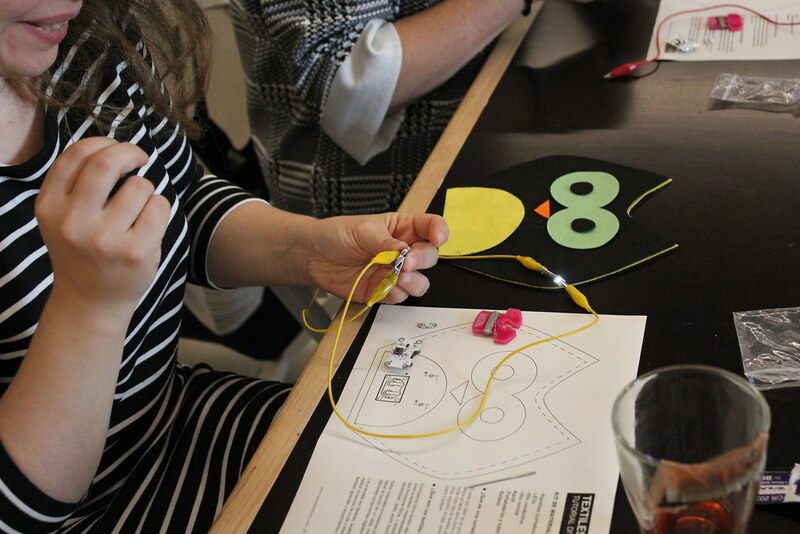 This soft circuits workshop is experimenting with the new possibilities offered by the application of paper circuits in the classroom. 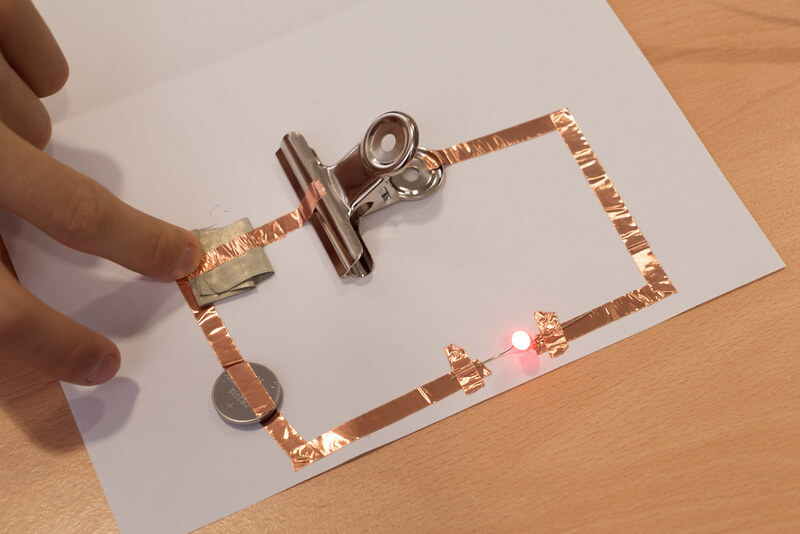 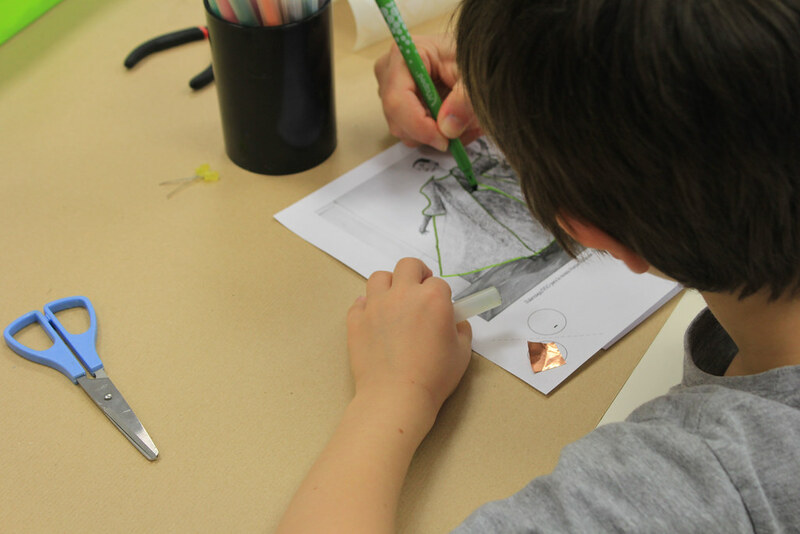 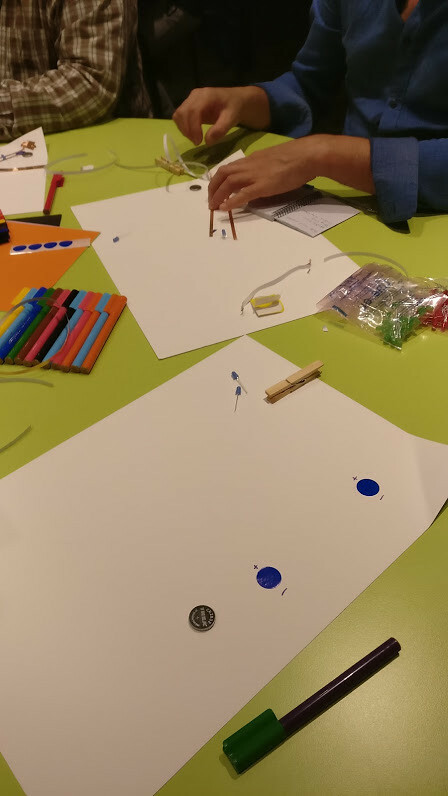 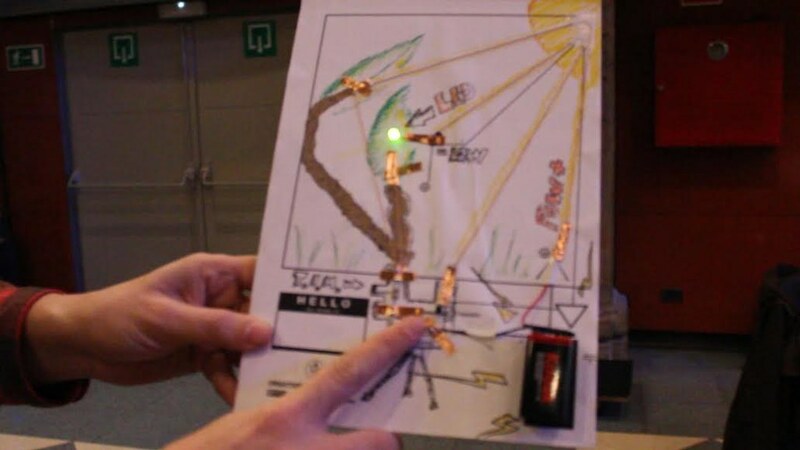 Students will experiment simple paper circuit with copper tape, a coin cell battery and an LED to explore storytelling with electronic drawing. 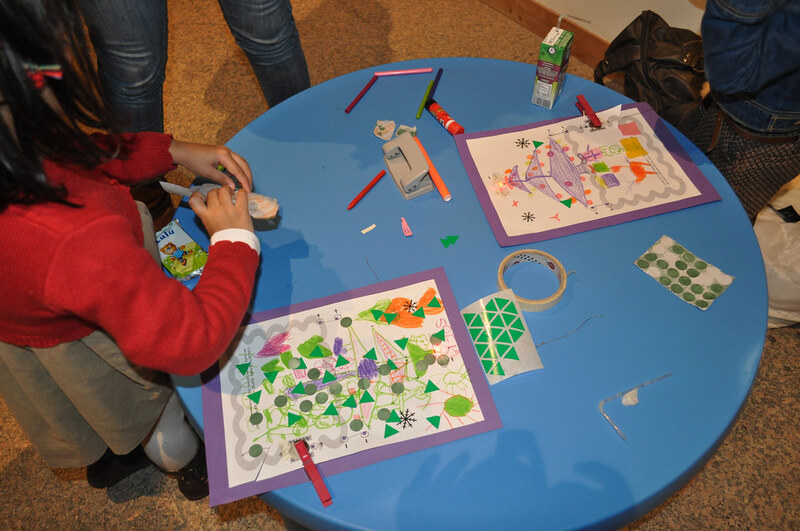 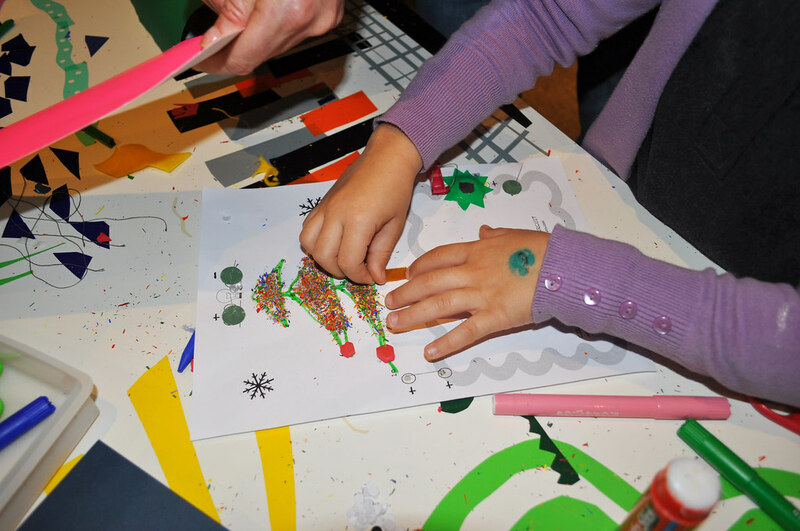 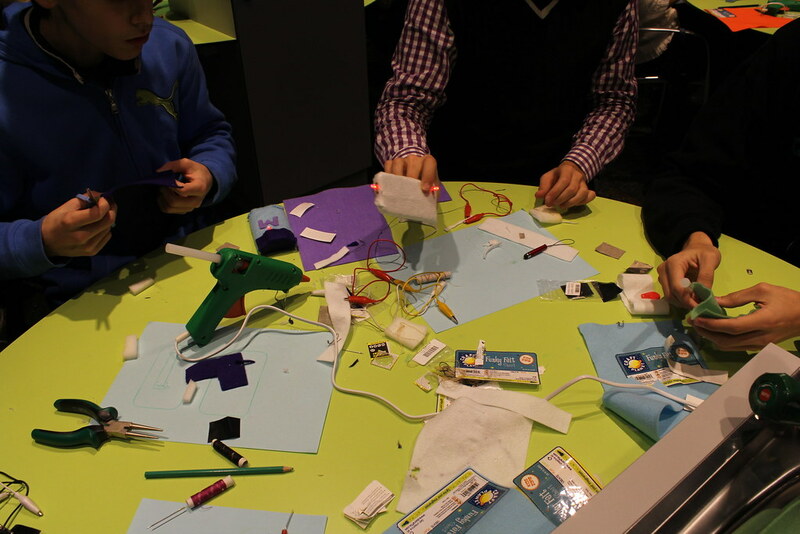 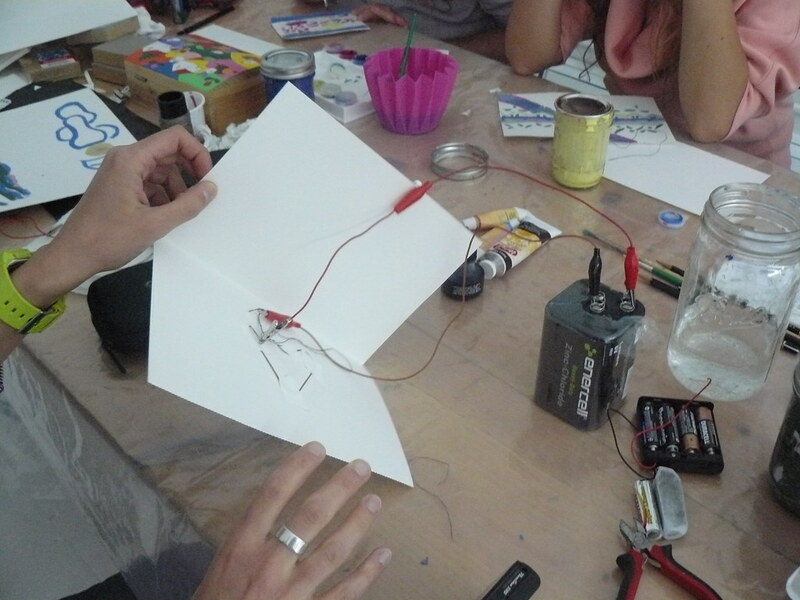 Also, participants will learn how to use conductive and non-conductive materials to build paper sensors. 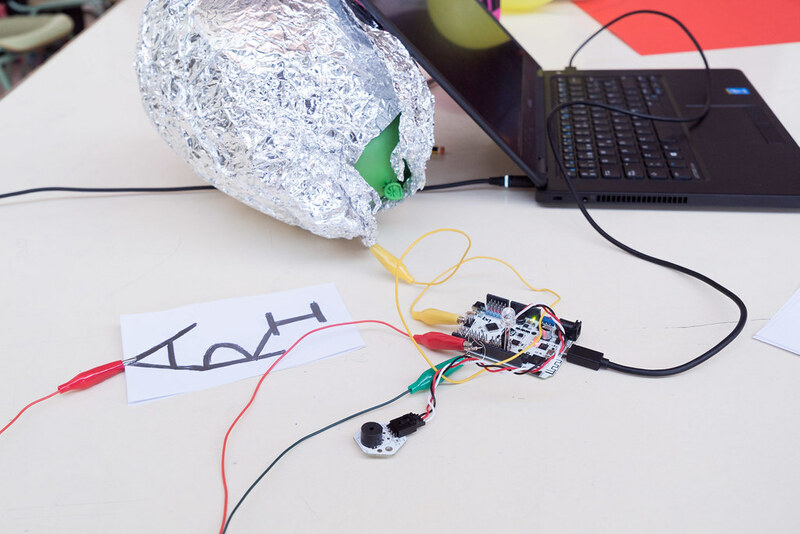 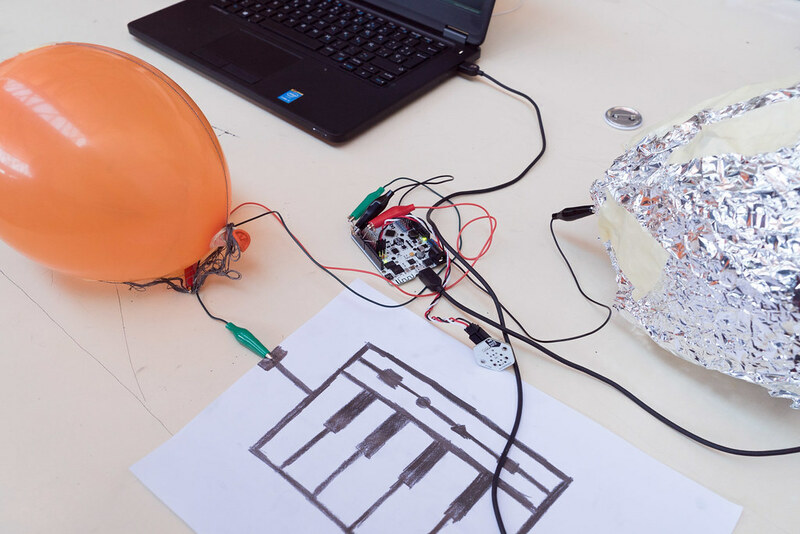 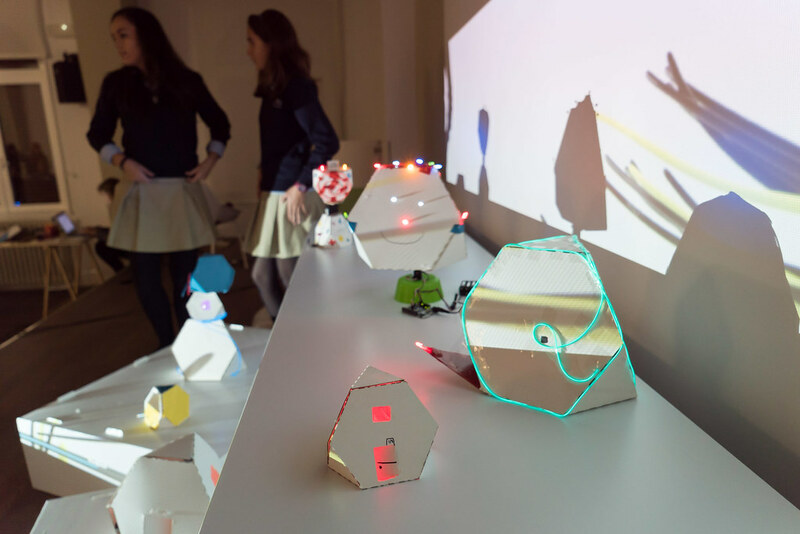 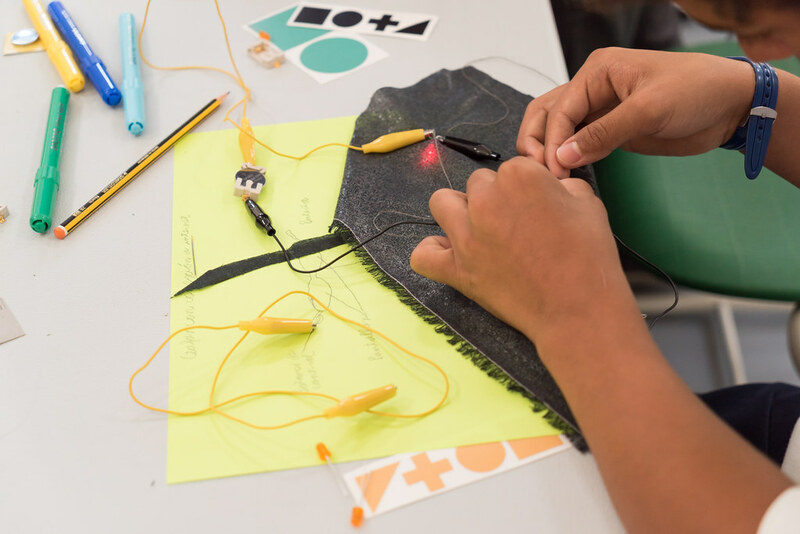 This workshop will give artists and designers an introduction to the possibilities offered by soft circuits and open source technologies, which could change the way we conceive and interact with electronic and digital devices. 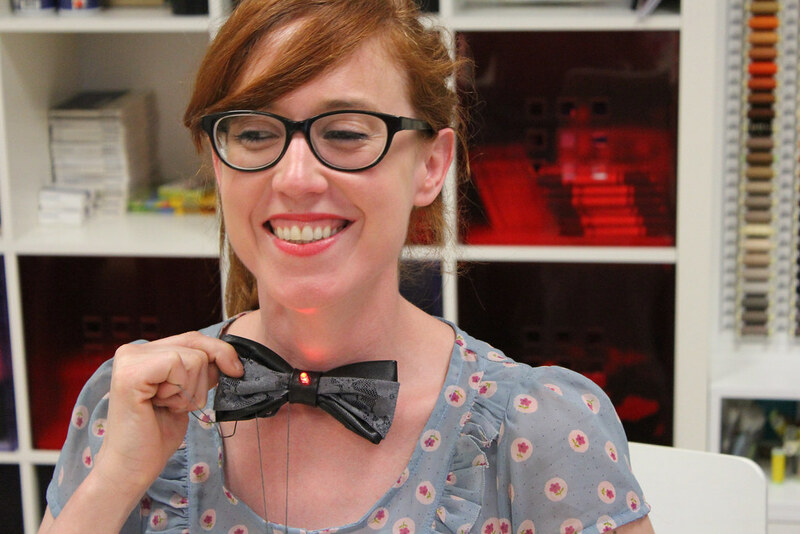 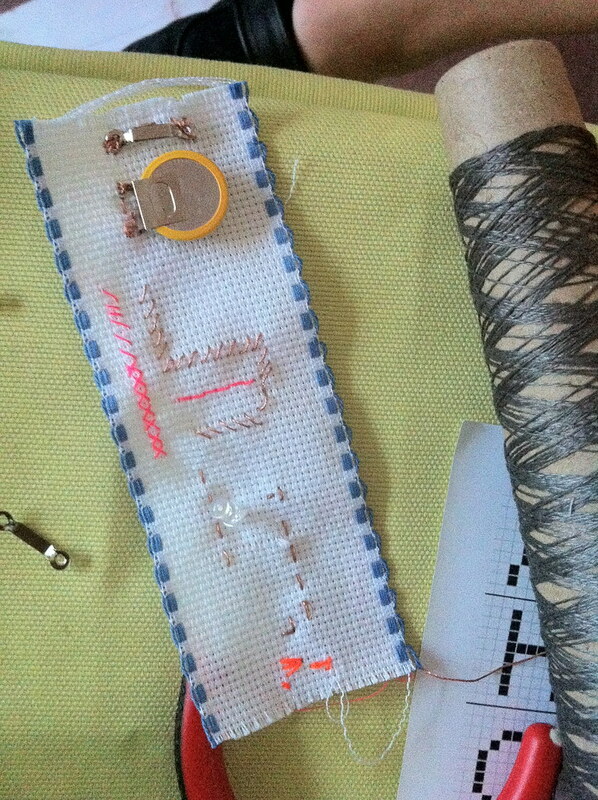 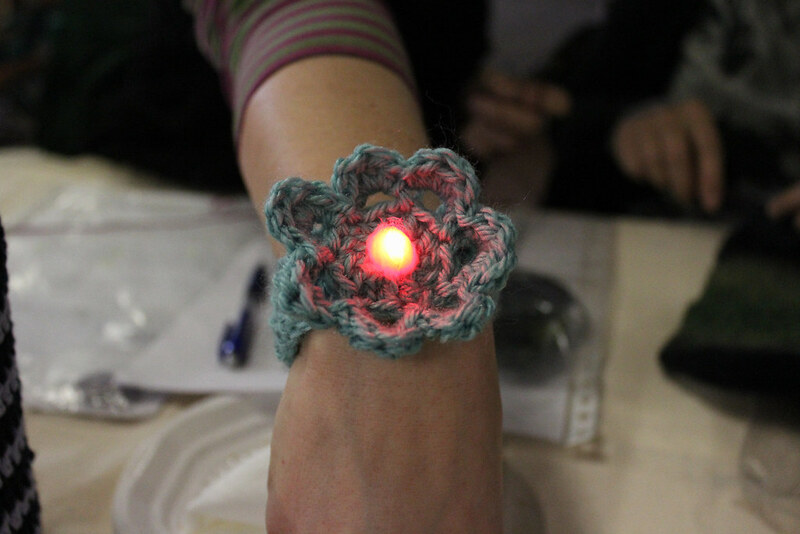 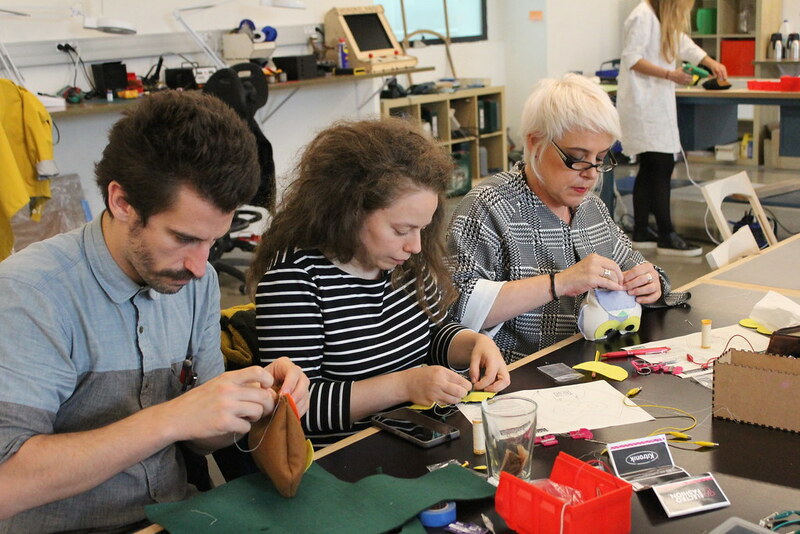 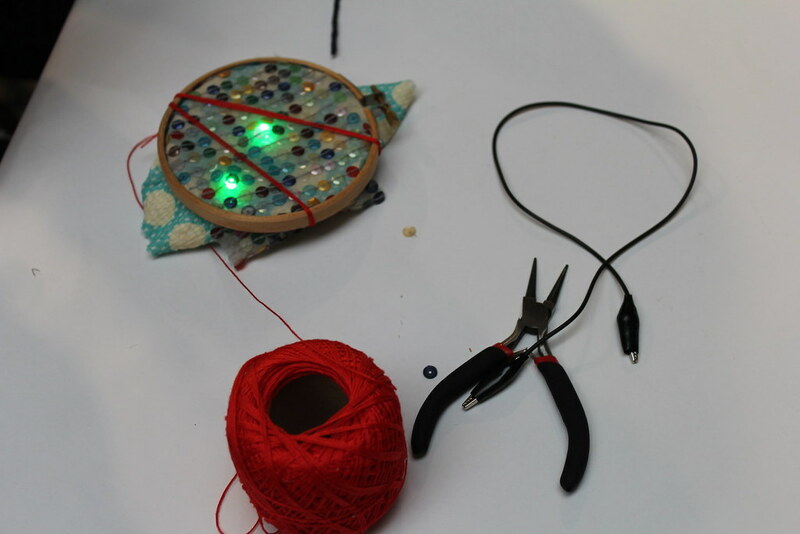 This workshop is a basic introduction to the fun world of e-Textiles. 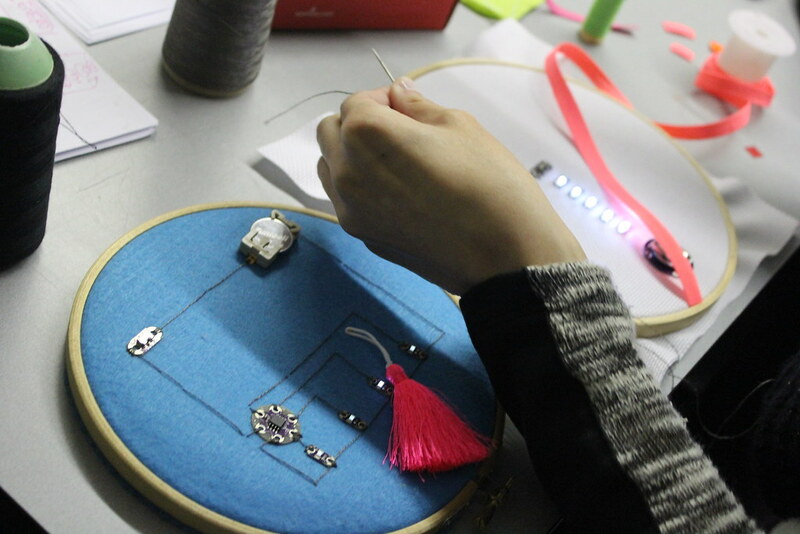 During the worshop participants will be introduced to the basic concepts of electronics and how to apply them to textile based design project. 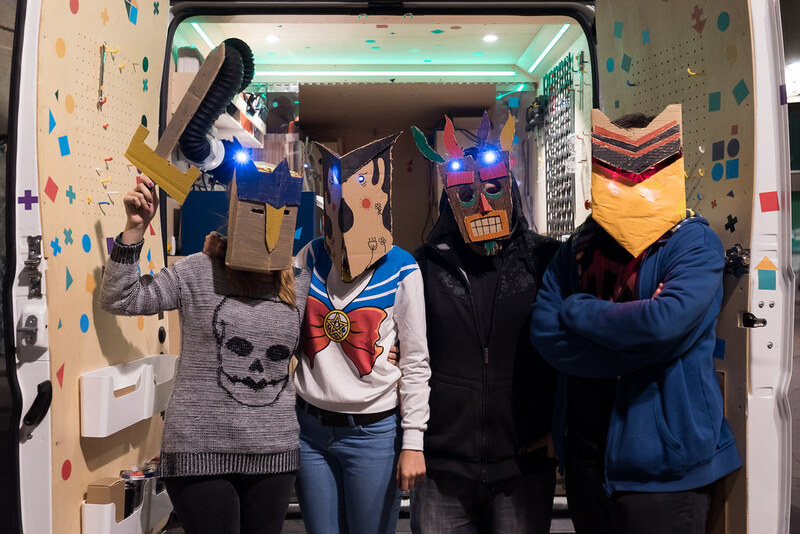 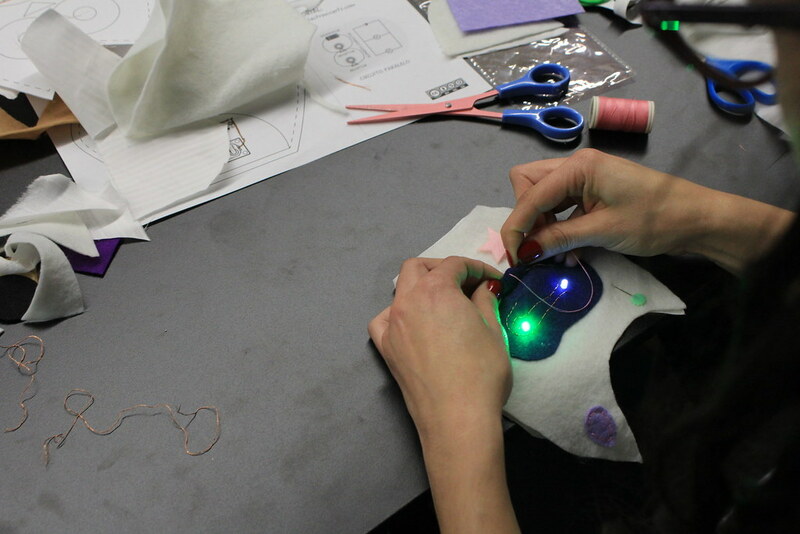 This workshop will give fine artists and designers an introduction to the possibilities offered by soft circuits and open source technologies to make wearable 3D paper electronic costume.During this workshop students will learn to build a soft circuit and basic electronics concepts. 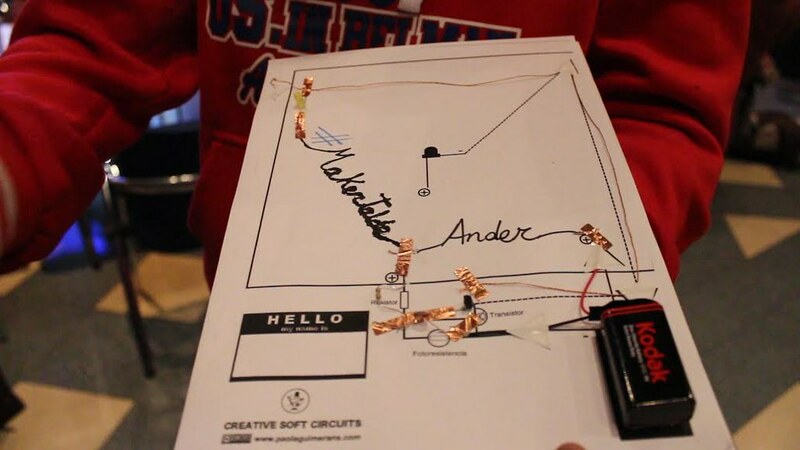 This soft circuits workshop is experimenting with the new possibilities offered by the application of paper circuits in the classroom. 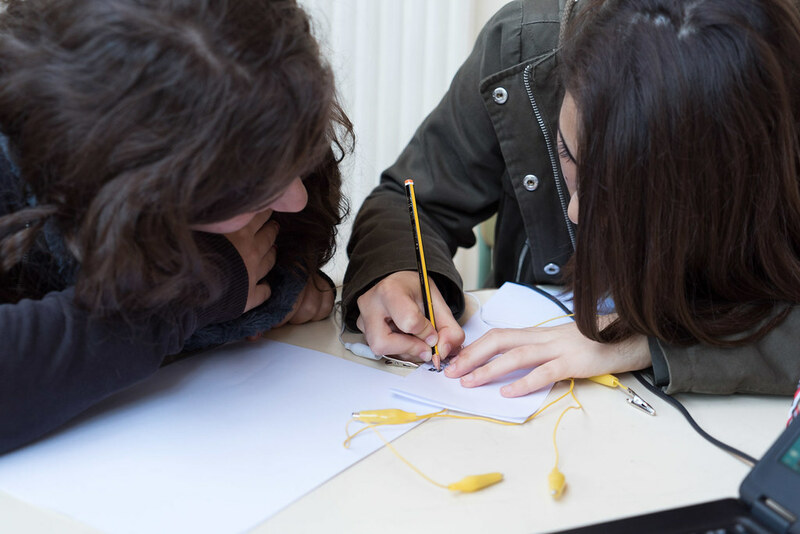 Students will learn basics of electronics, paper crafts techniques and how to program the arduino board BQ Zum and capacitive sensing. 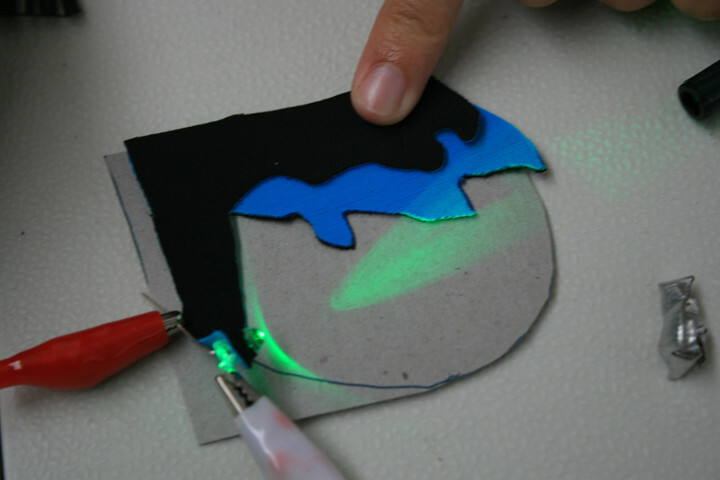 This soft circuits workshop is experimenting with the new possibilities offered by the application 3D paper electronics in the classroom. 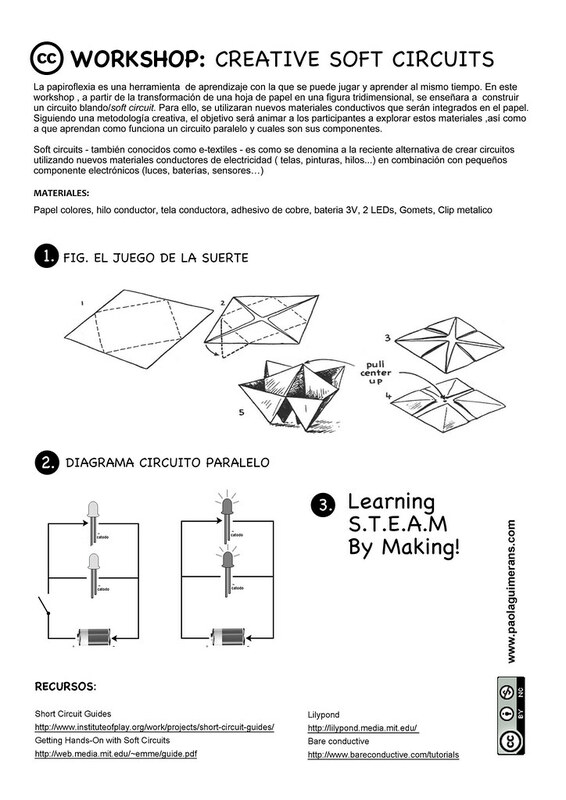 Students will prototype a smart city using paper crafts techniques and learn how to program the arduino board BQ Zum. 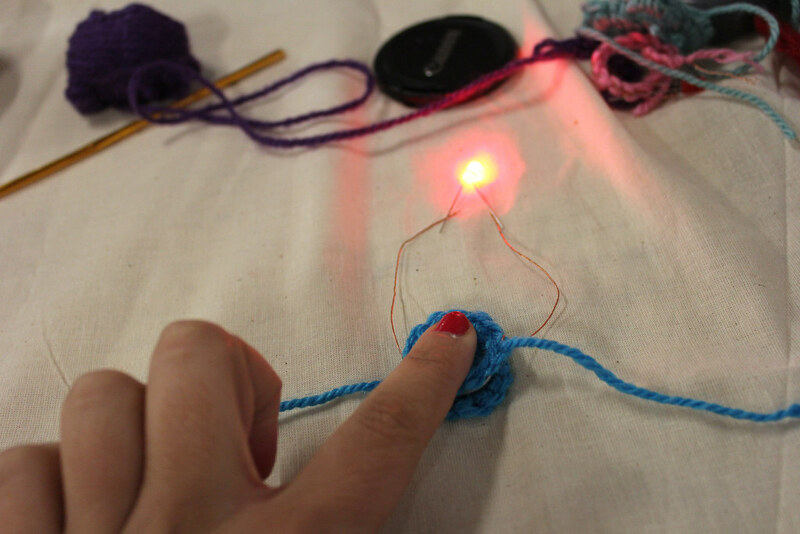 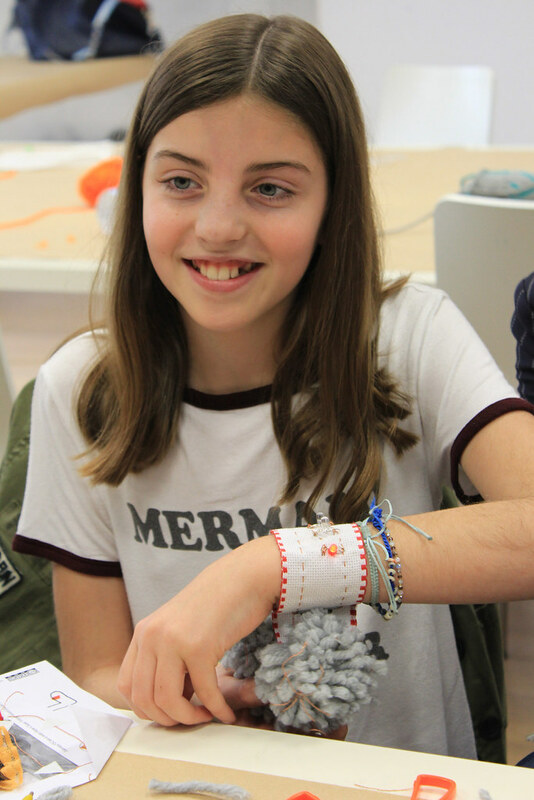 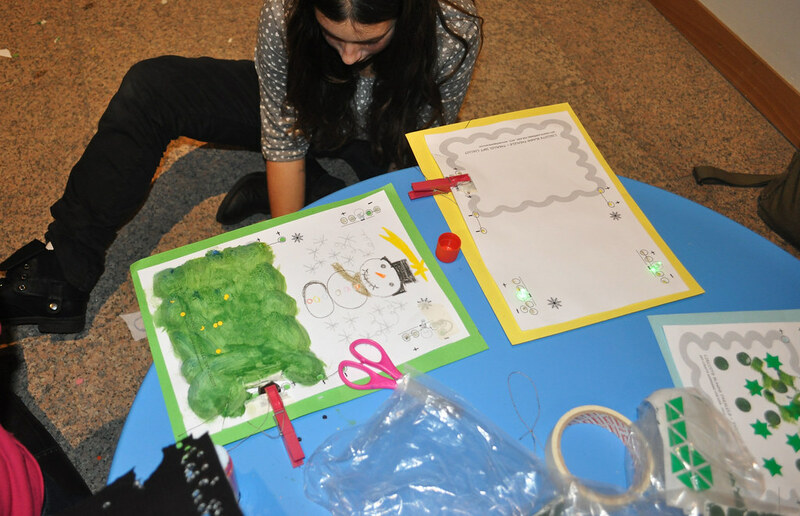 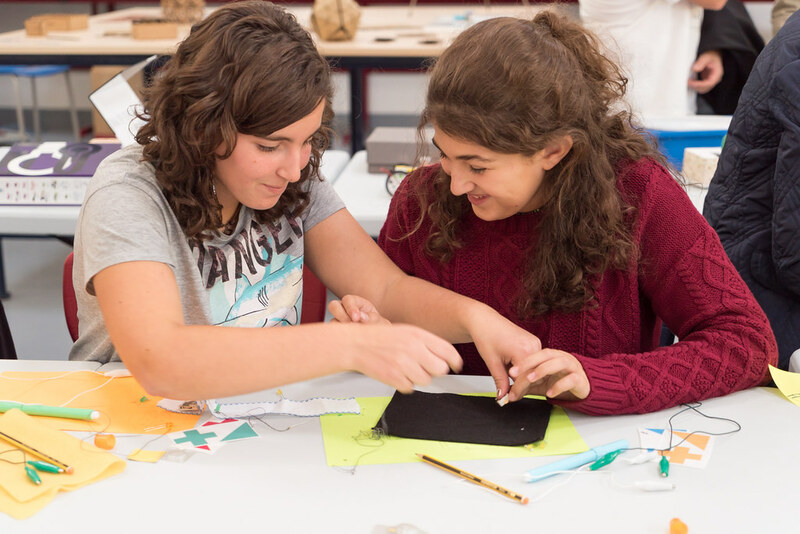 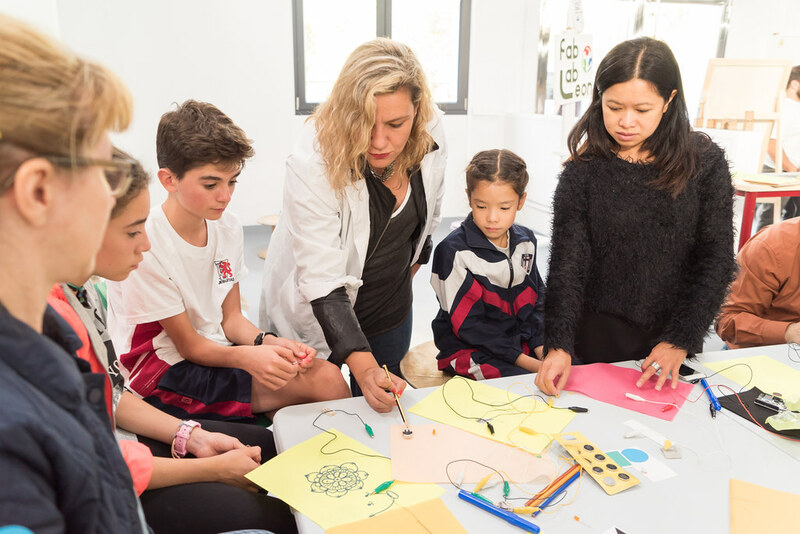 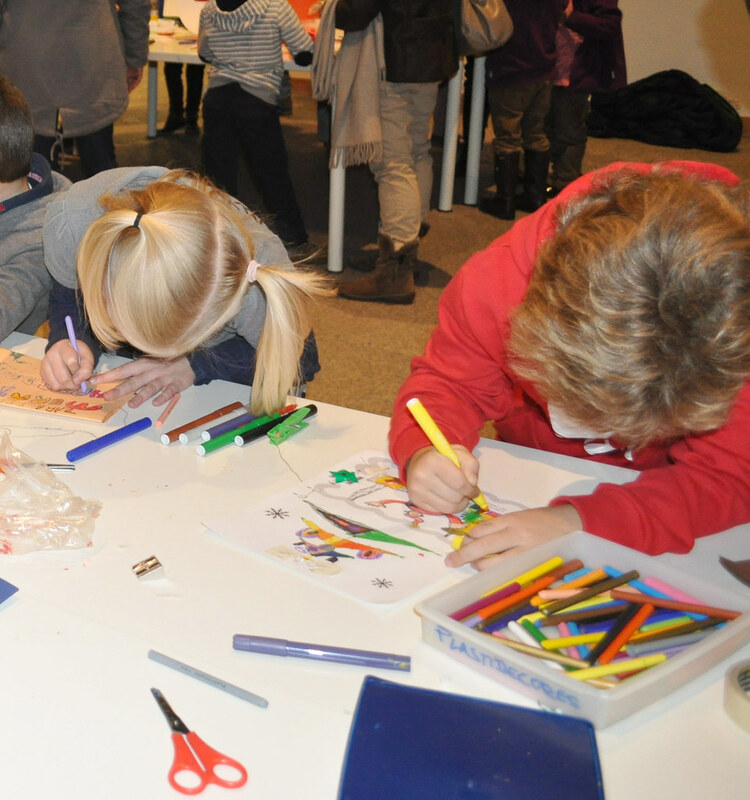 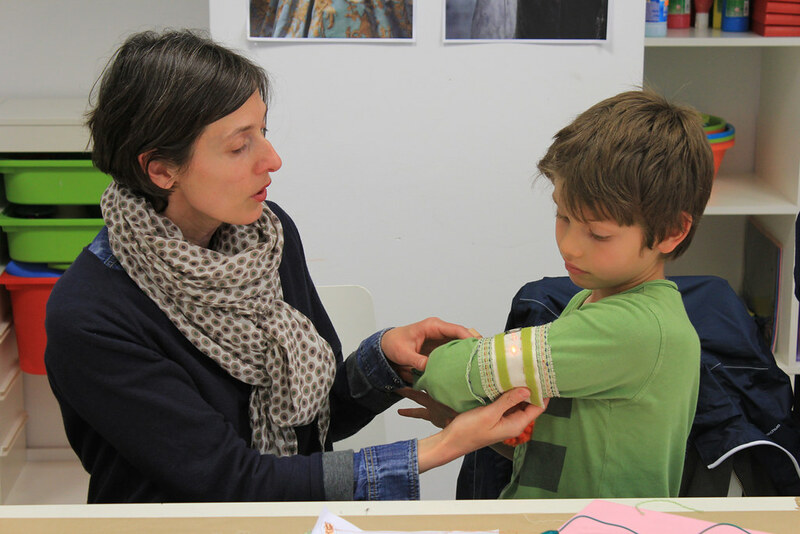 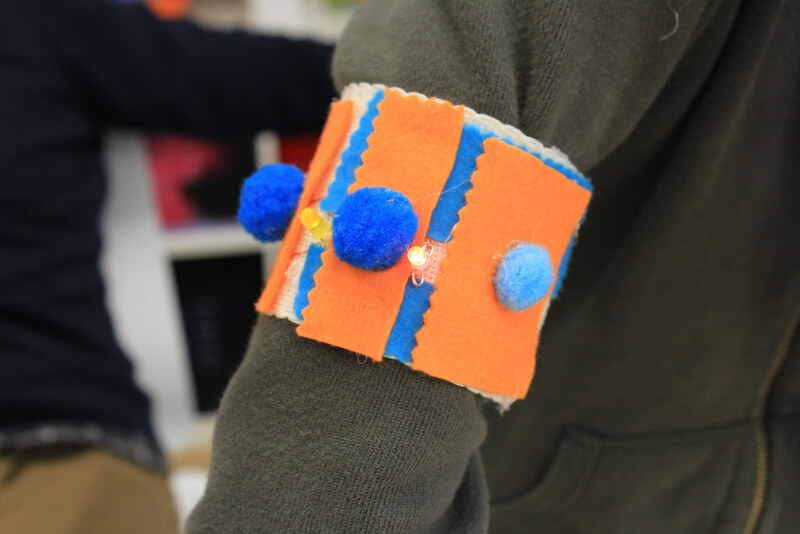 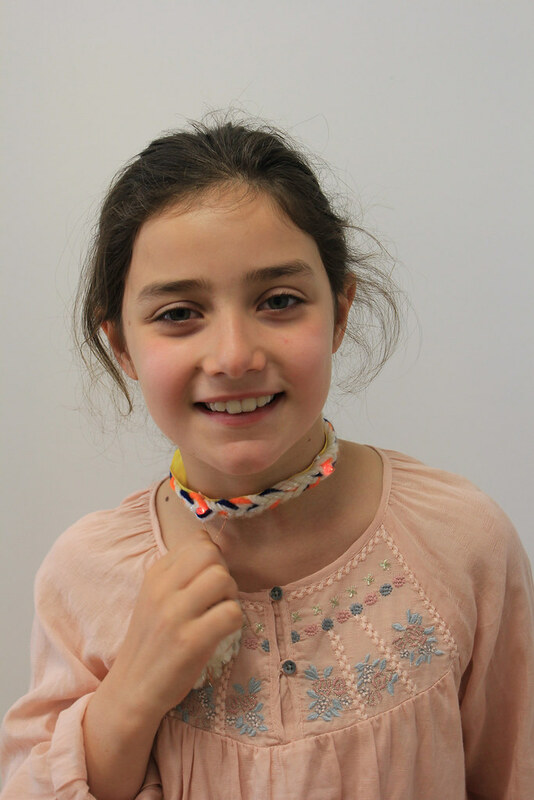 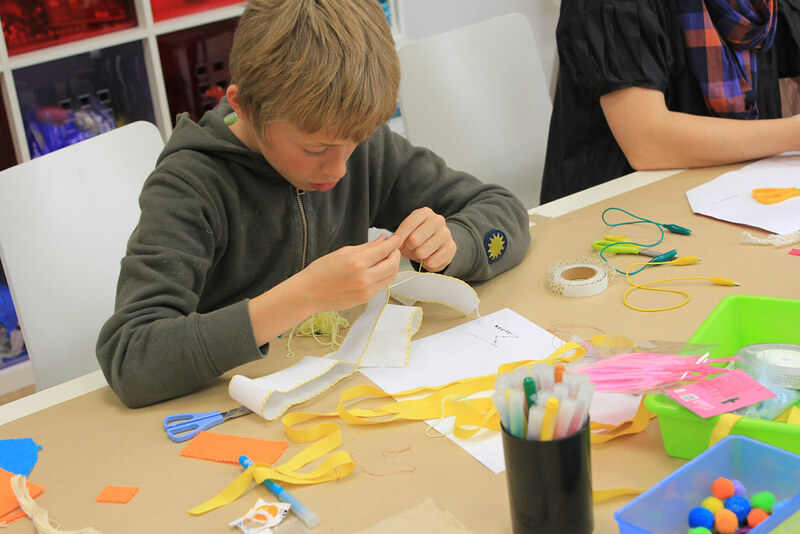 In this family electronic textiles Workshop Children-Adult pairs will learn together about e-textiles and paper circuits working with conductive thread, sewable batteries and color LEDs to make an interactive bracelet. 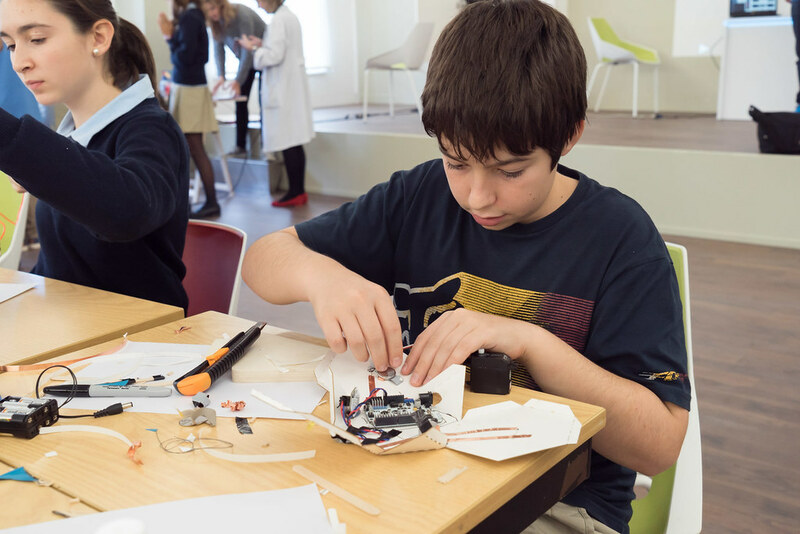 This workshop invites parents to take on new roles as learners with their children while they learn about STEAM education. 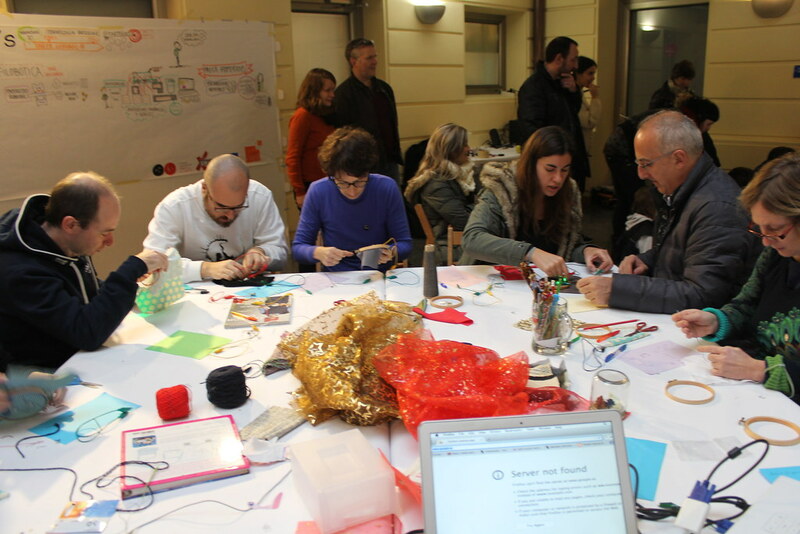 This workshop is aimed at all those citizens who want to approach new techniques for the integration of technology in textiles and learn creative electronics. 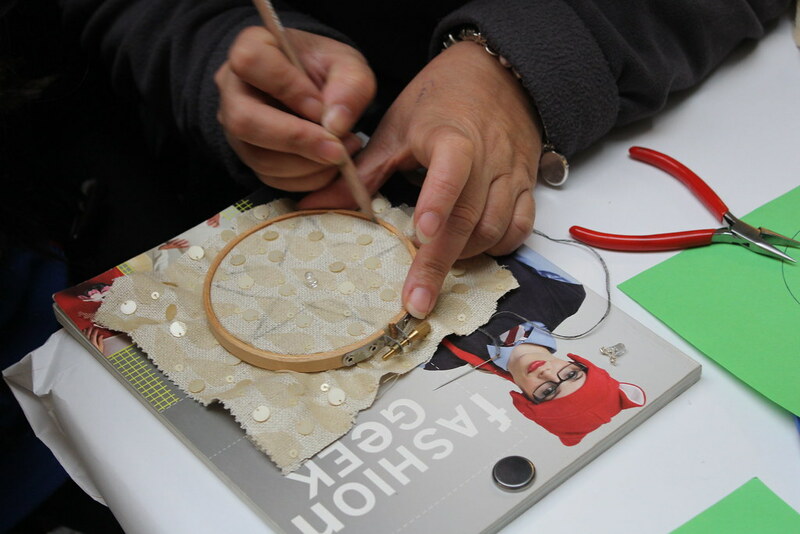 Participants will learn how to make their own Christmas ornament with electronics using traditional craft techniques such as stitching or cross stitch. 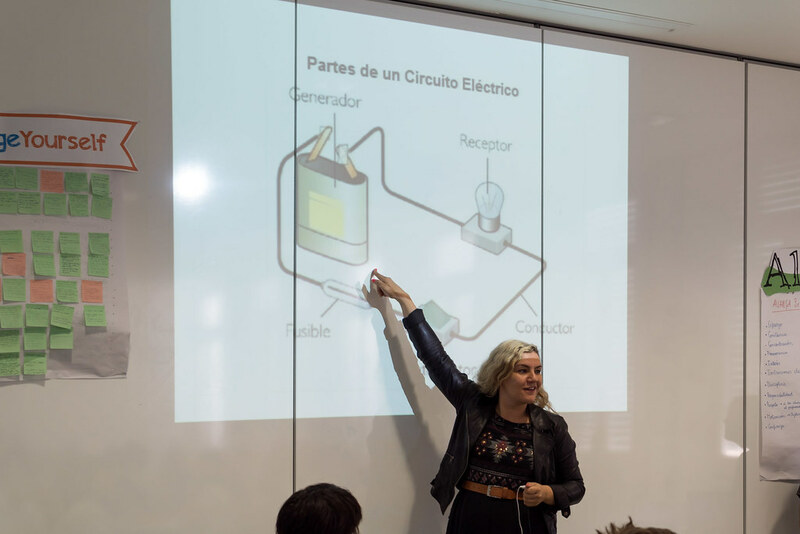 This workshop also serves as an introduction to new materials and presentation of the main online communities linked to this emerging field. 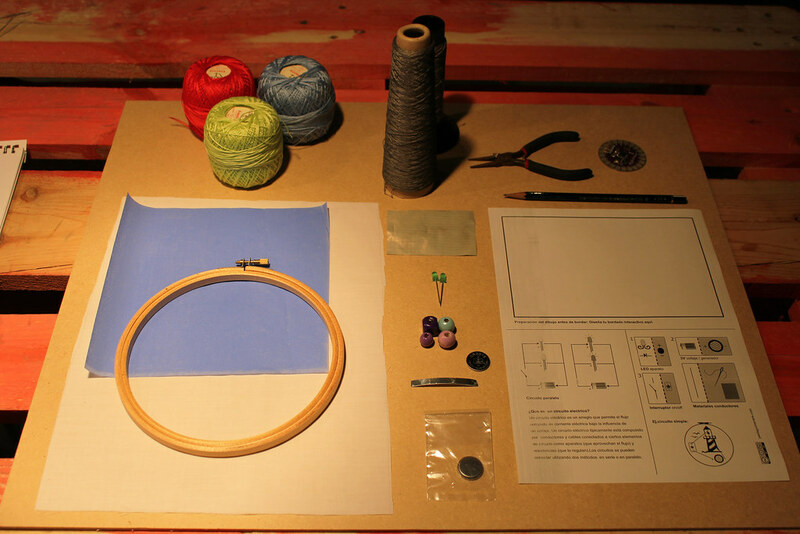 Each participant will receive a kit with all the materials needed to make an interactive project. 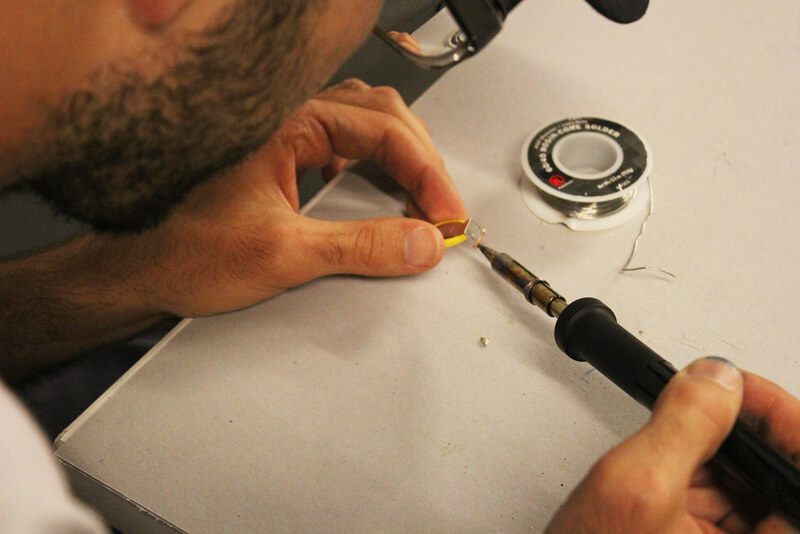 It is not necessary to have previous experience in electronics. 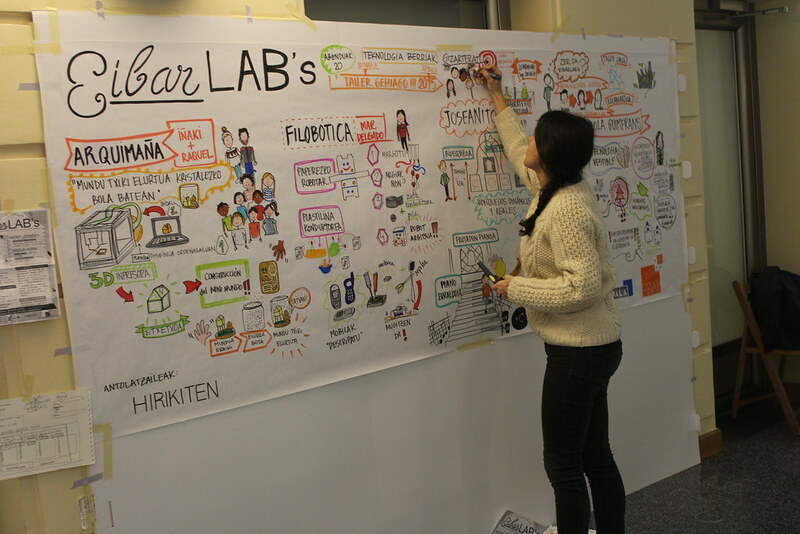 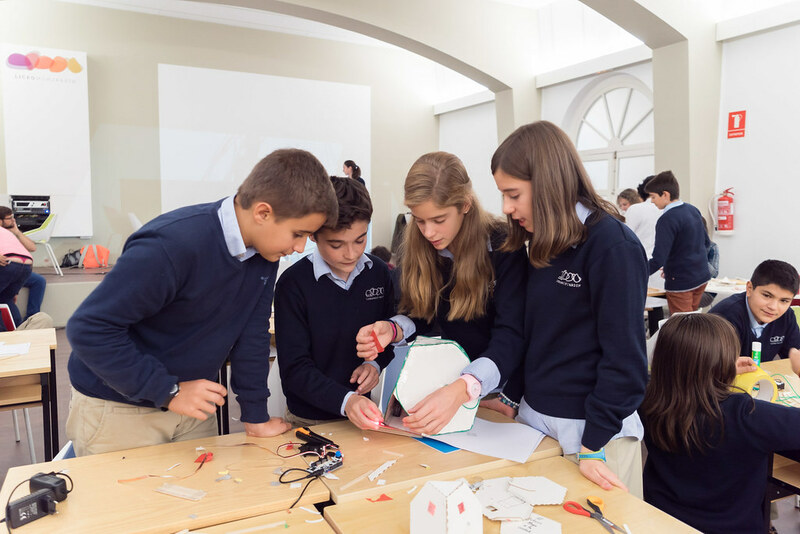 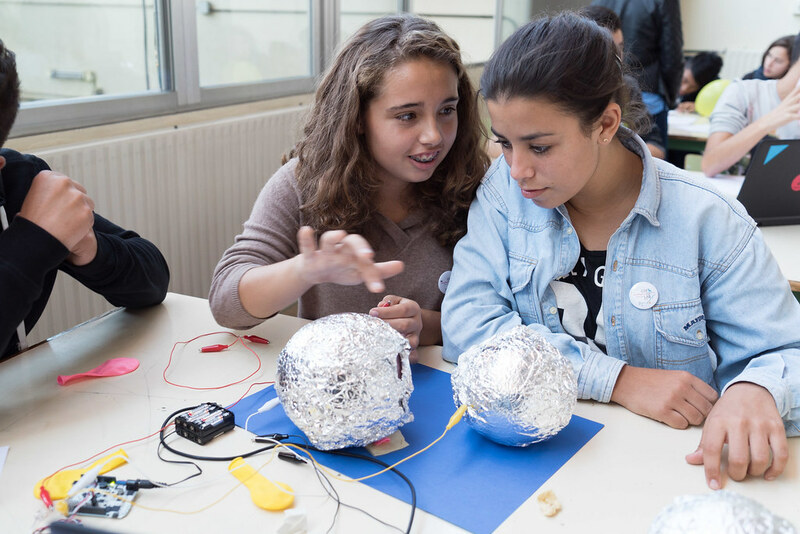 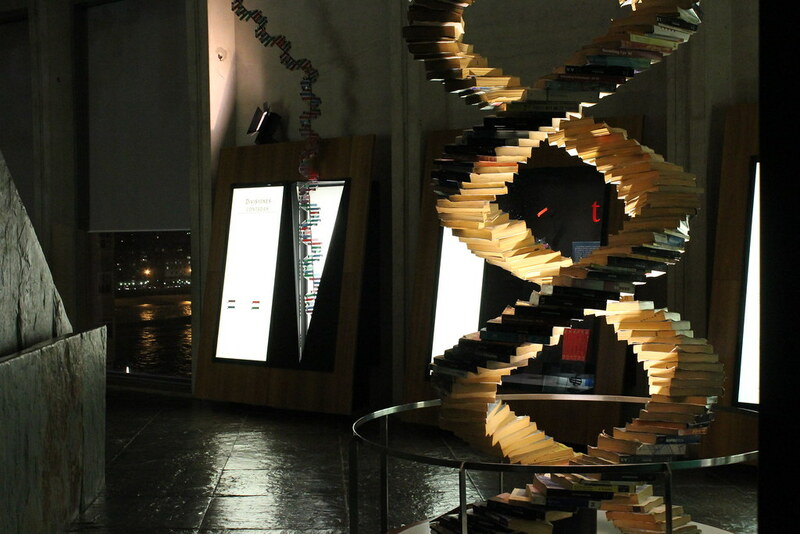 EibarLAB’s is an initiative that will carry out different workshops related to new technologies in order to promote the generational transmission of knowledge in a fun, dynamic and fun way. 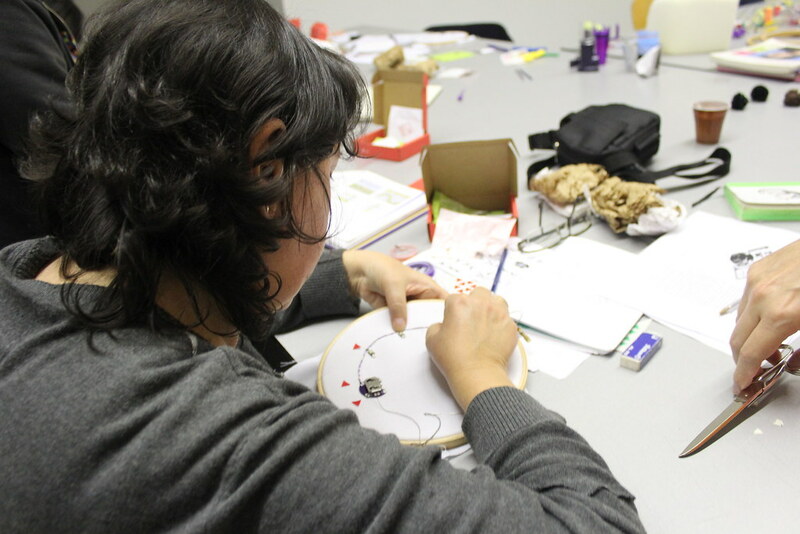 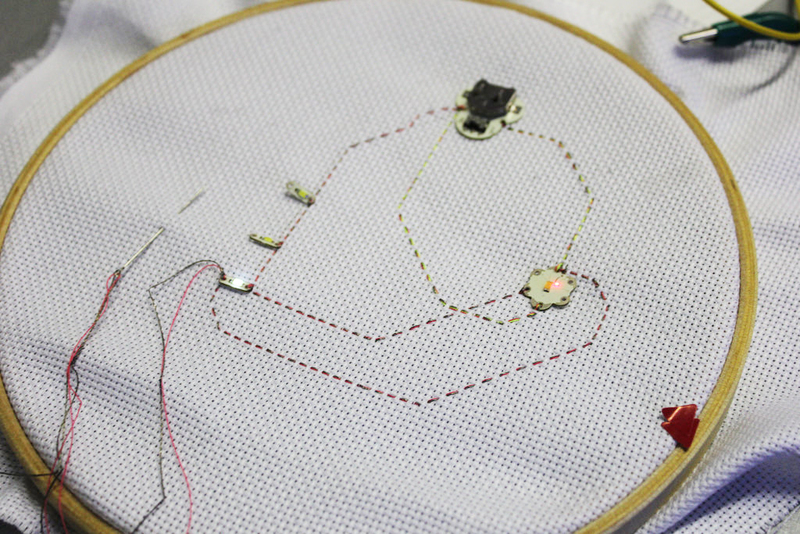 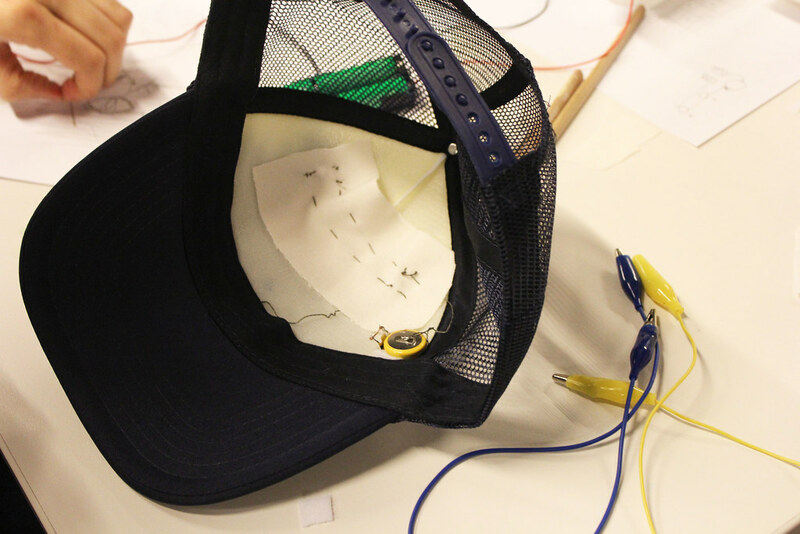 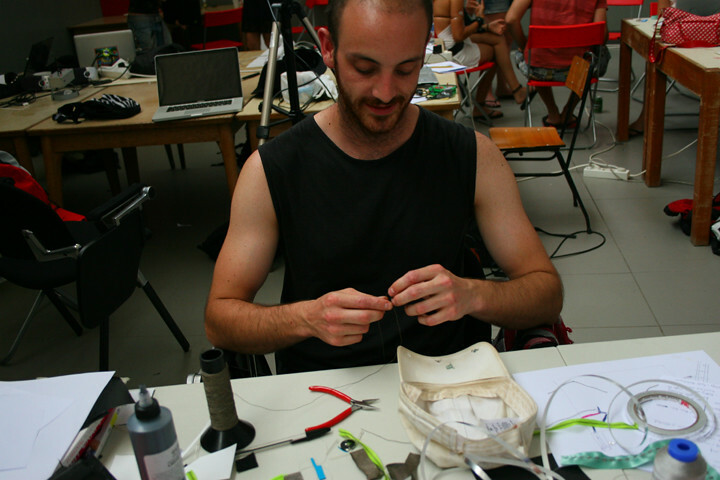 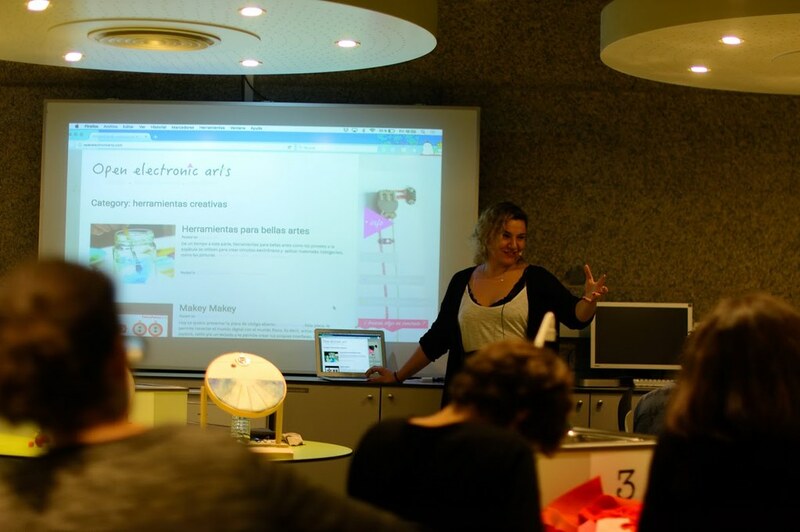 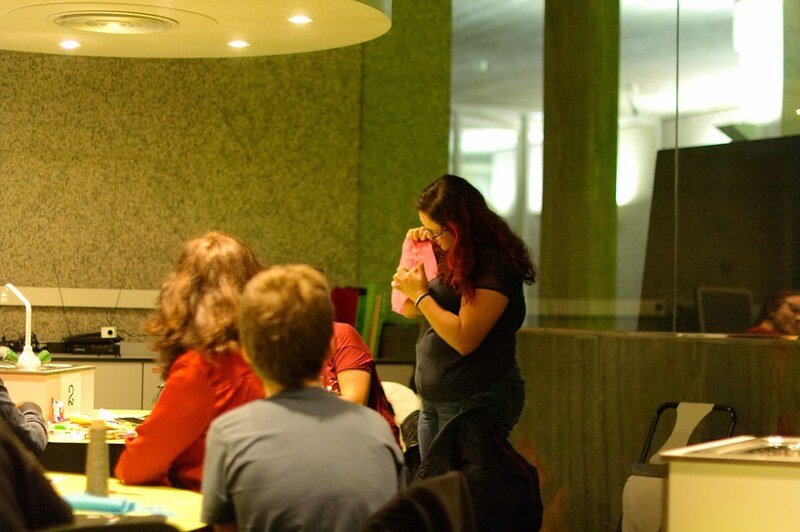 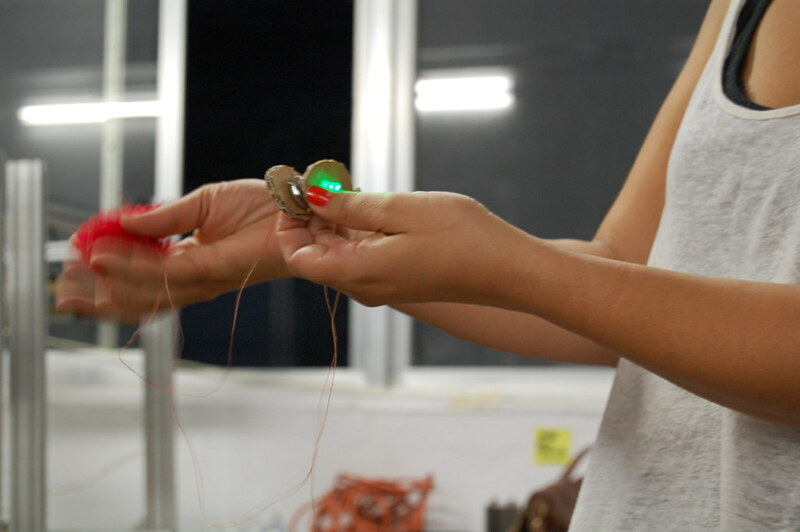 This workshop serves as an introduction to the field of e-textiles. 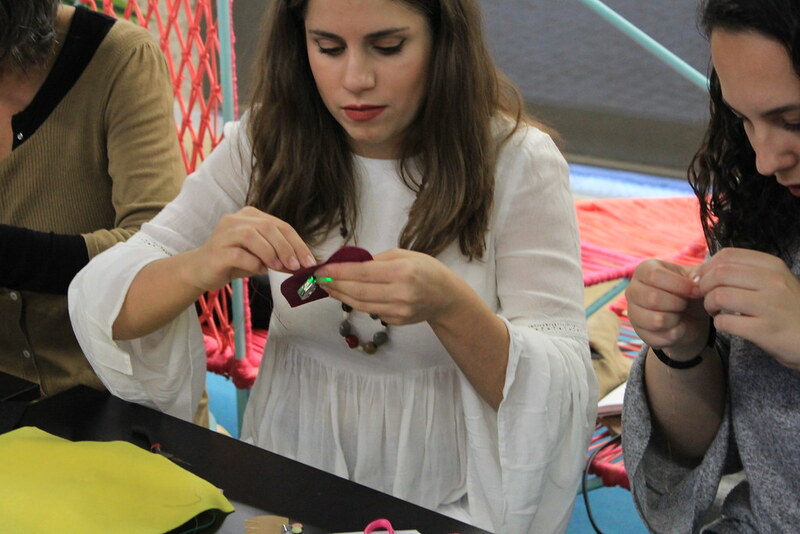 The aim of the activity is to experiment with intelligent materials and explore the creative potential offered by the integration of electronics into textiles. 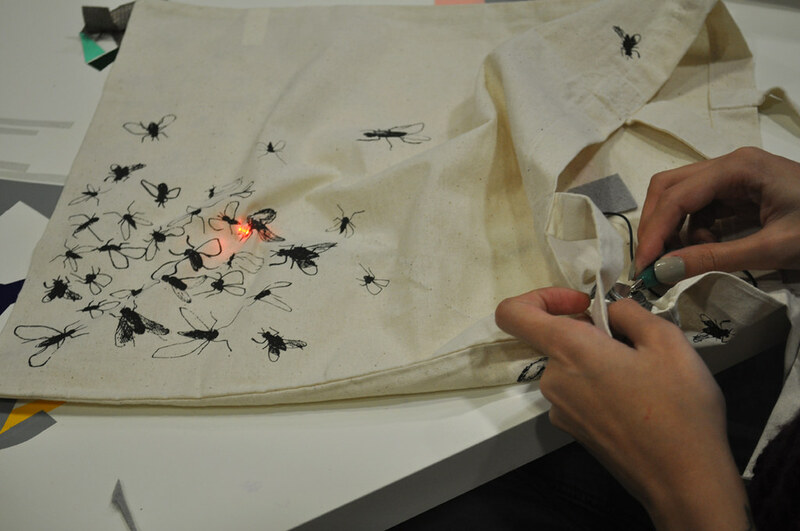 Starting with DIY techniques of direct stamping in textiles, this workshop invites attendees to manufacture their own circuits. 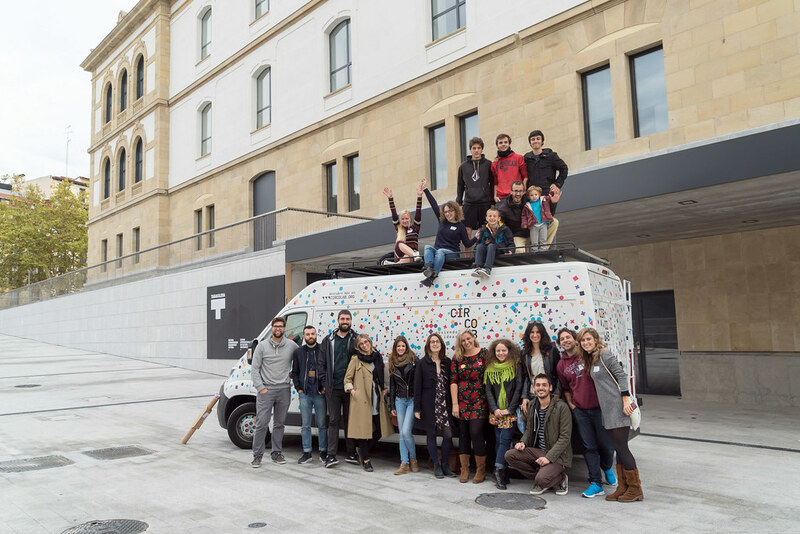 Bilbao Art District is a public-private initiative whose main objective is to support and enhance the visual arts sector in Bilbao, making the city a meeting point for different artistic agents and disciplines, as well as bringing art to the citizenship. 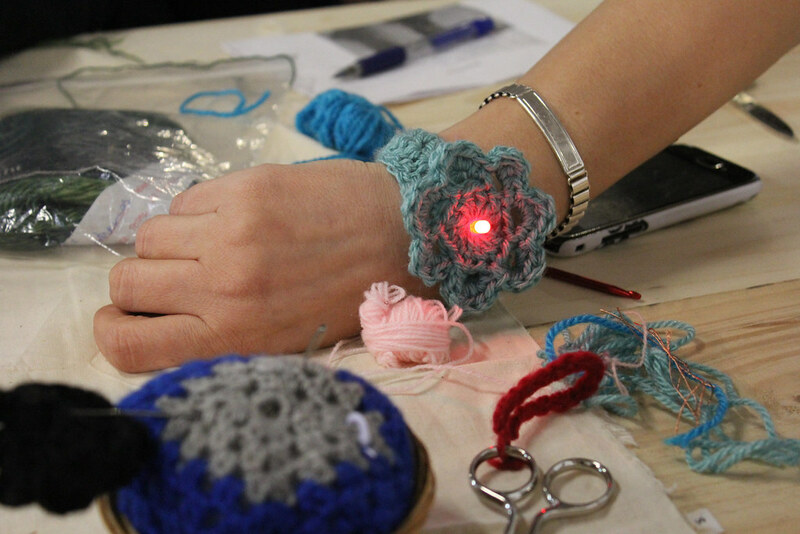 This workshop aimed at all those who wish to discover the new creative possibilities of e-textiles. 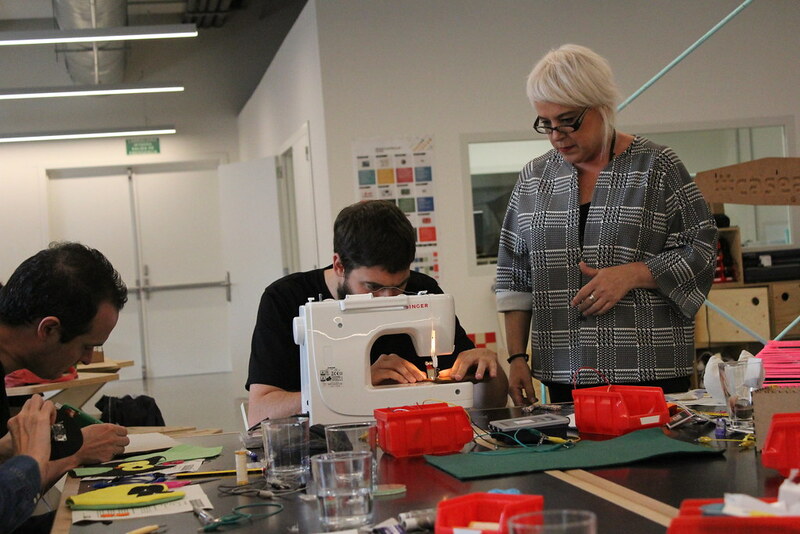 Participants will learn to integrate circuits with electrically conducting wires or fabrics into a garment that they design themselves by recycling old clothes. 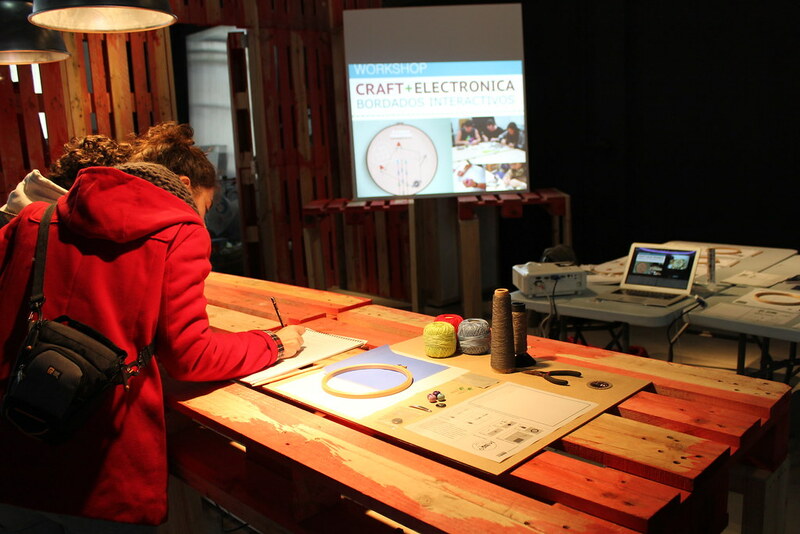 Also experiment with intelligent materials and explore the creative potential offered by low tech technological tools. 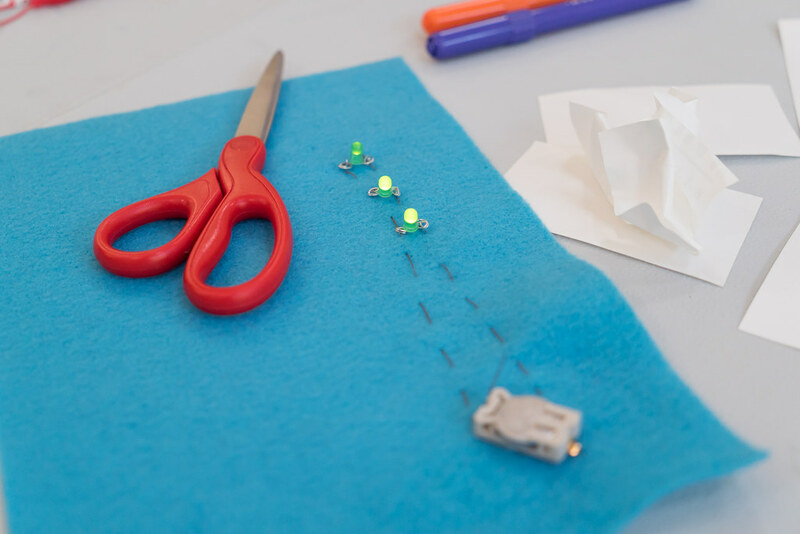 Unlike traditional circuits on rigid circuit boards, soft circuits are flexible and are ideal for building into soft mediums like fabric or paper. 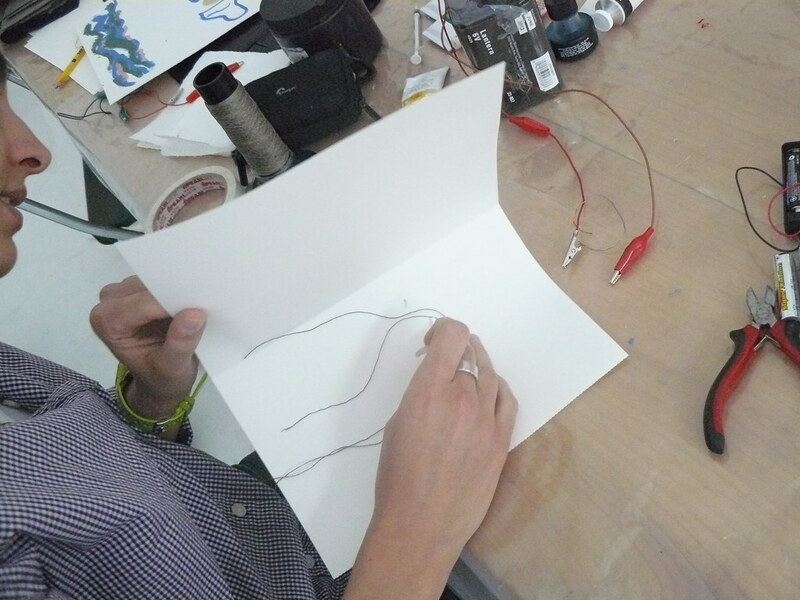 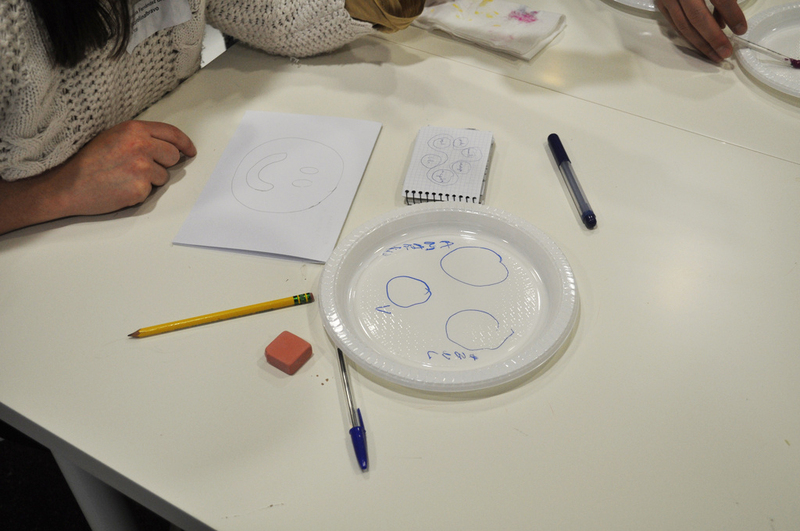 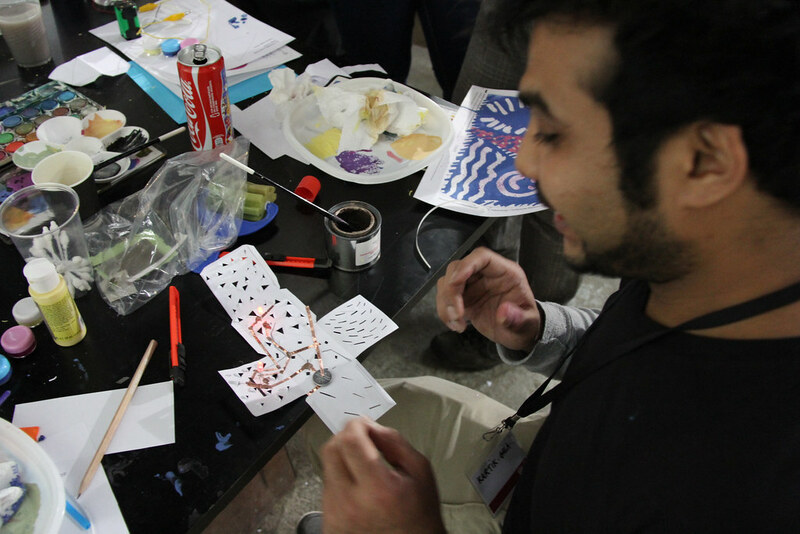 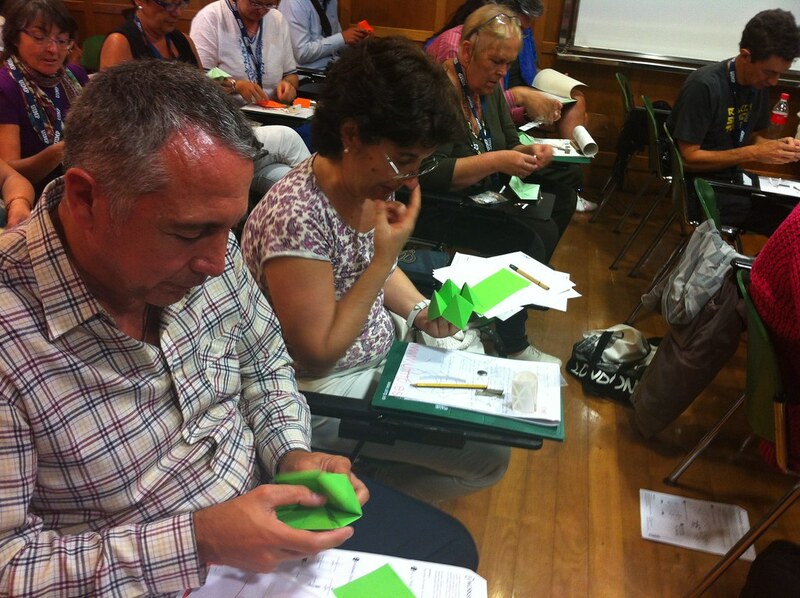 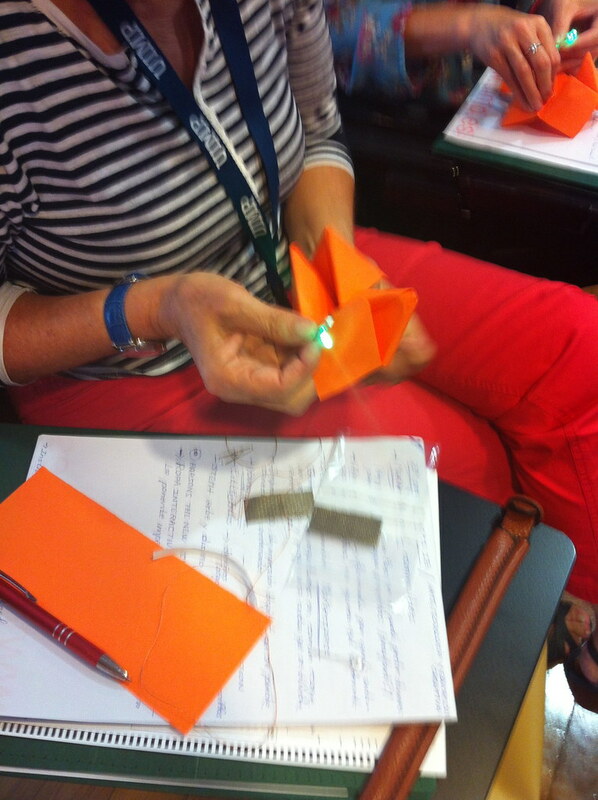 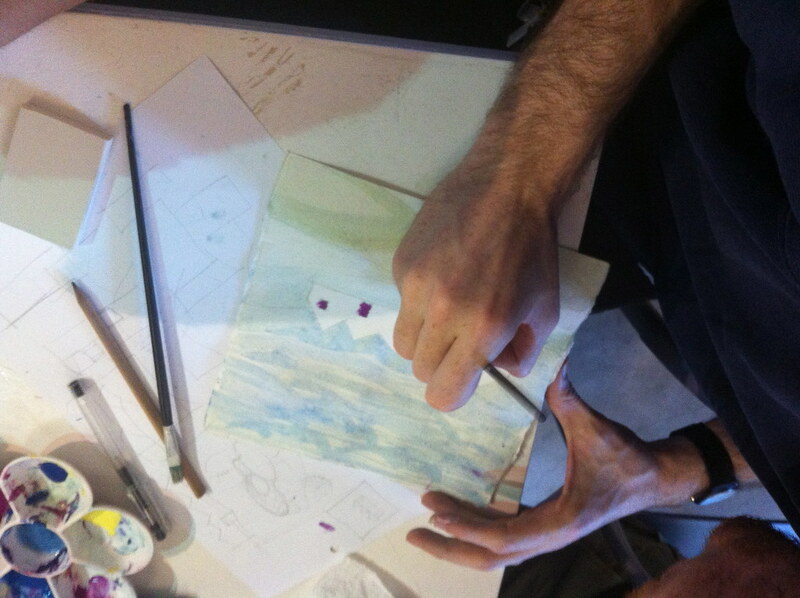 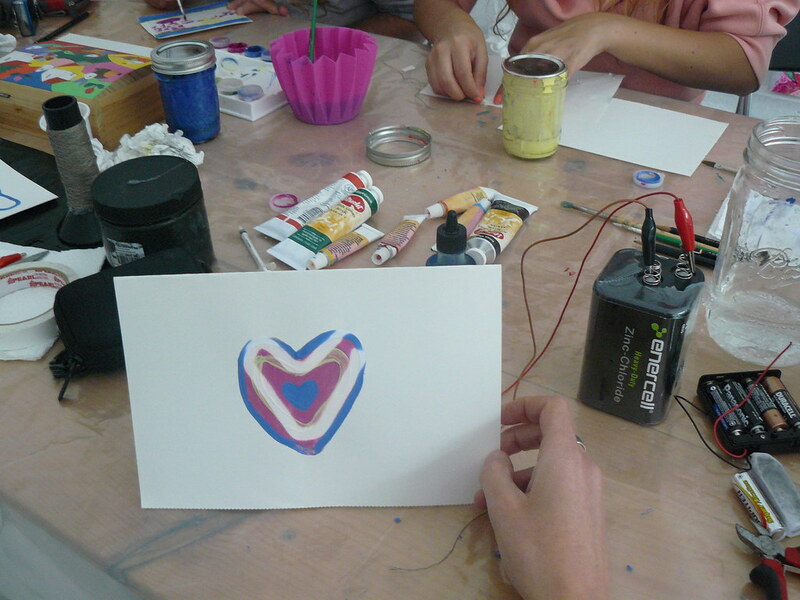 During this workshop participants designed a circuit directly on the paper. 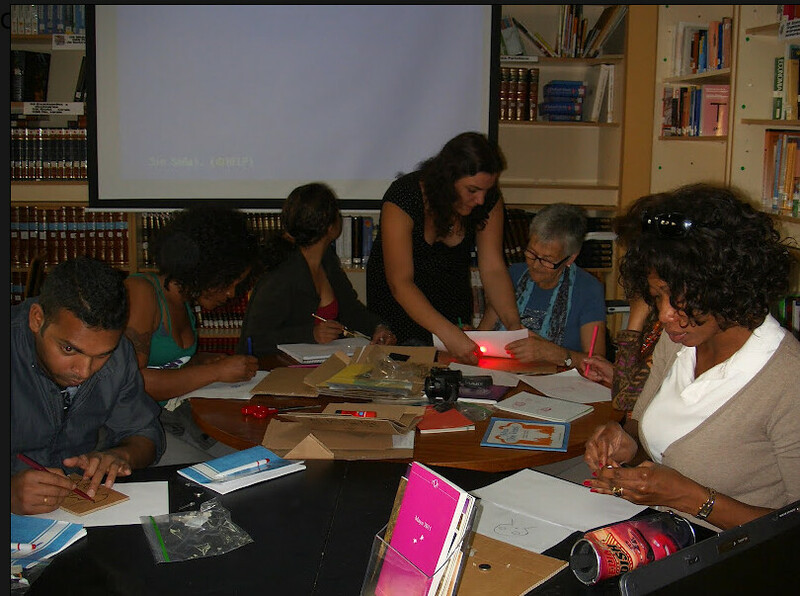 Also, They will learn how to use conductive and non-conductive materials to include a light sensor in paper to make a paper circuit project. 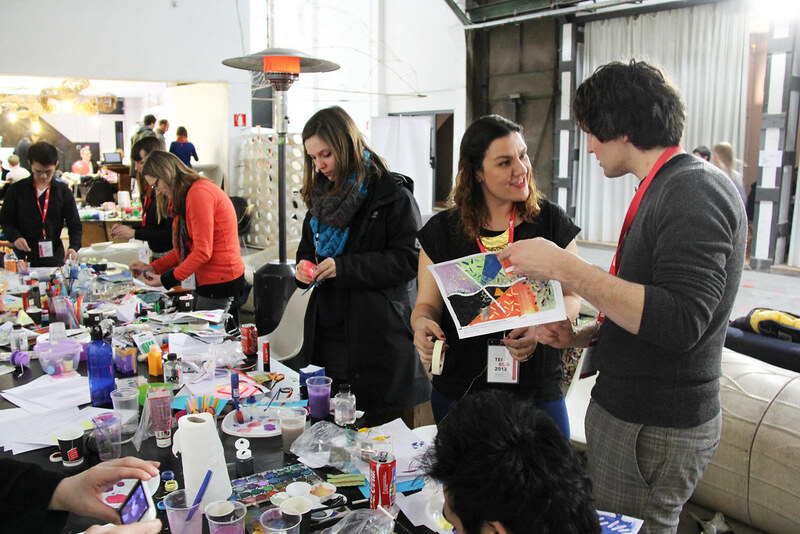 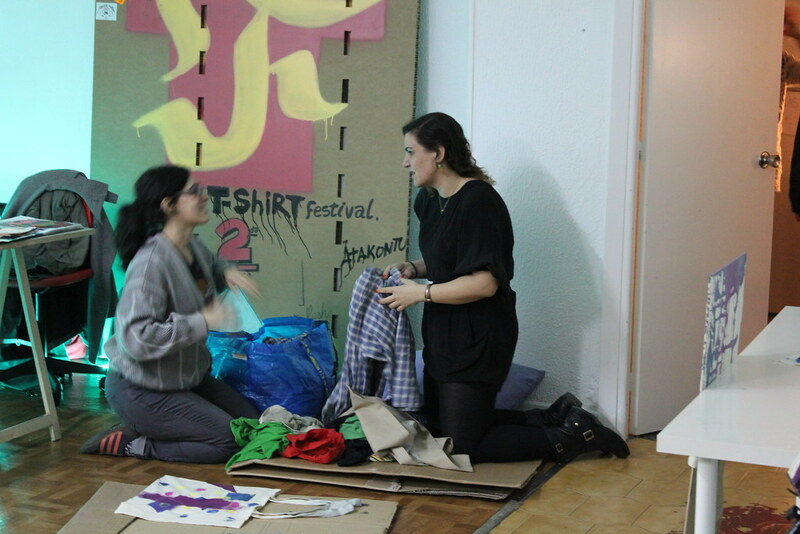 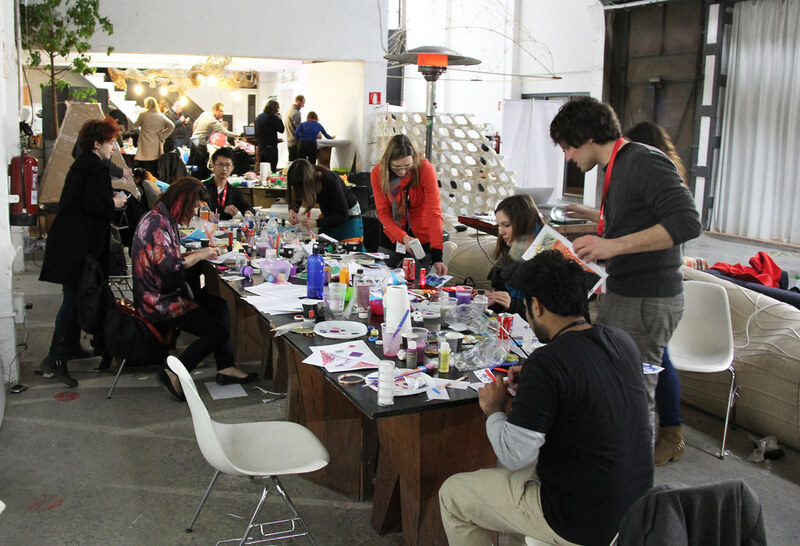 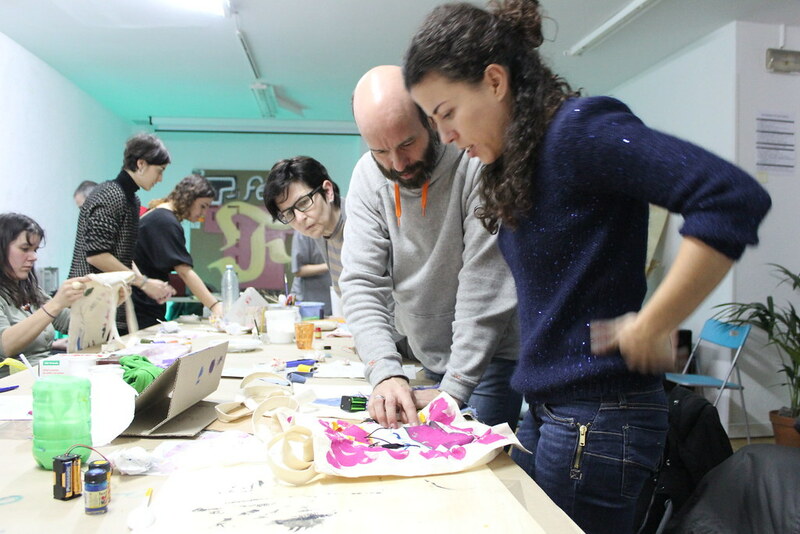 The workshop was held at Bilborock that is a space of reference for young people and groups and companies and cultural promoters entities where to promote, create, exhibit, experiment, produce and share initiatives of interest for young people and the city. 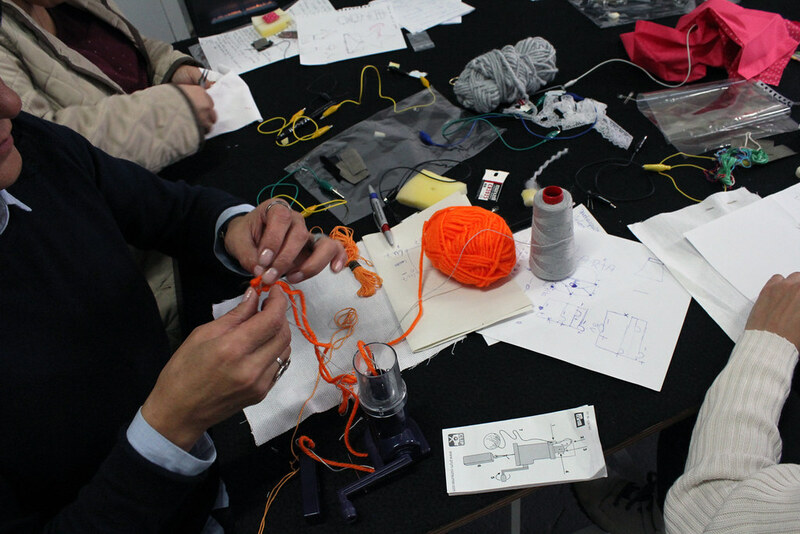 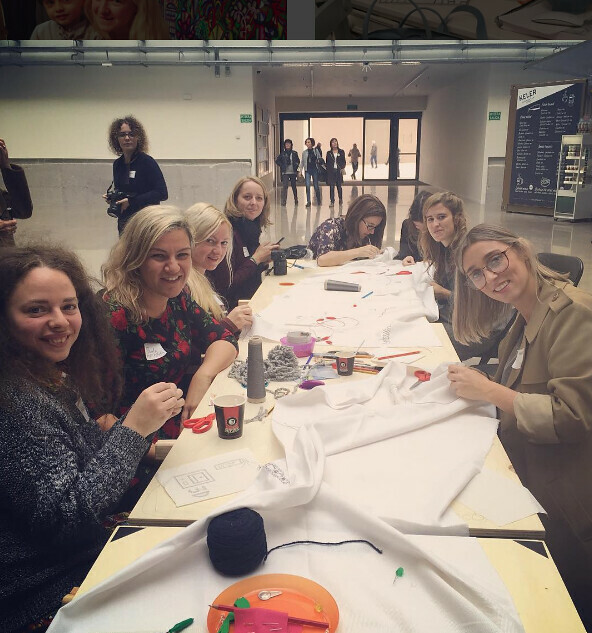 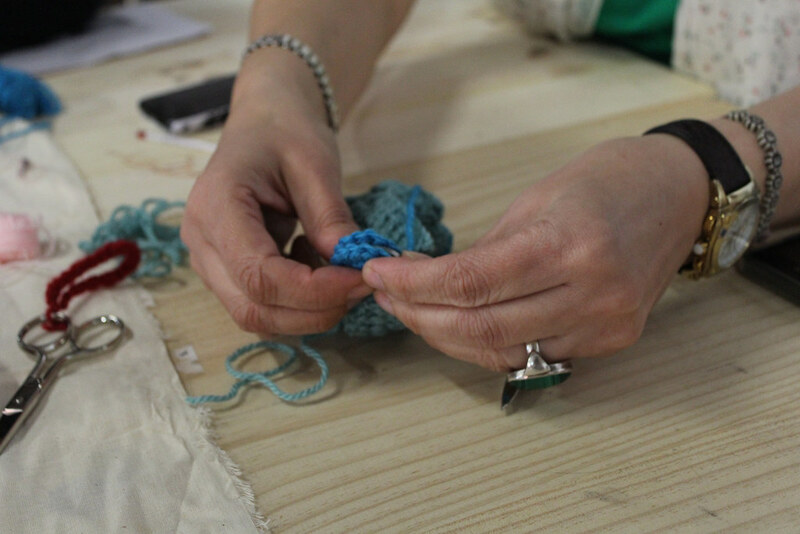 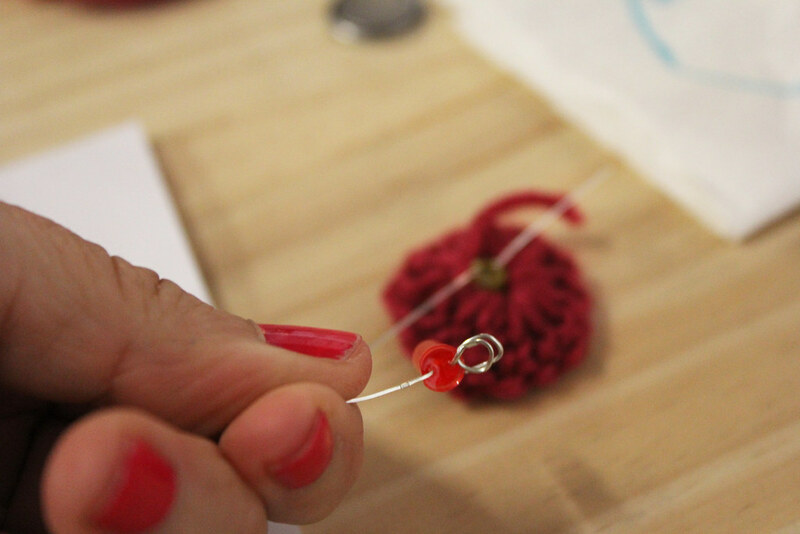 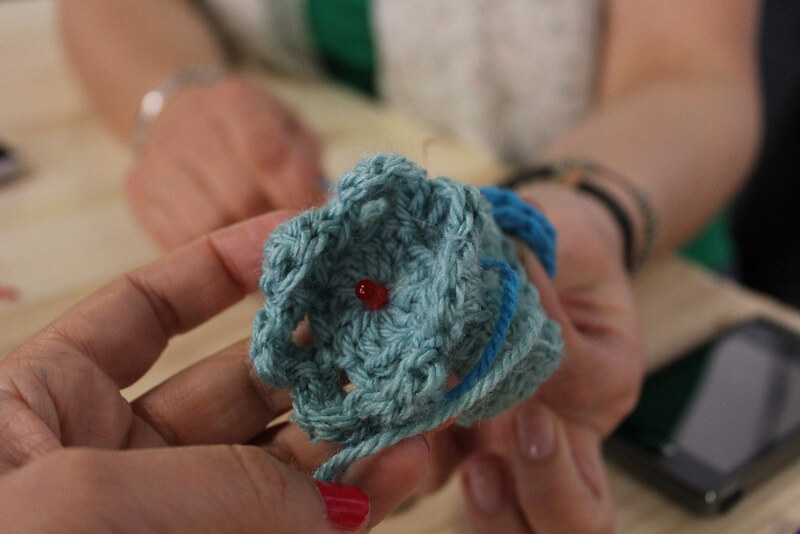 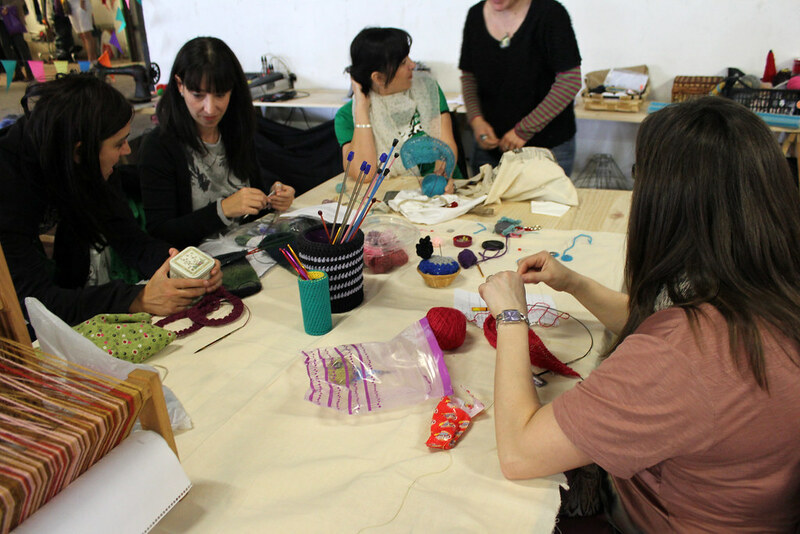 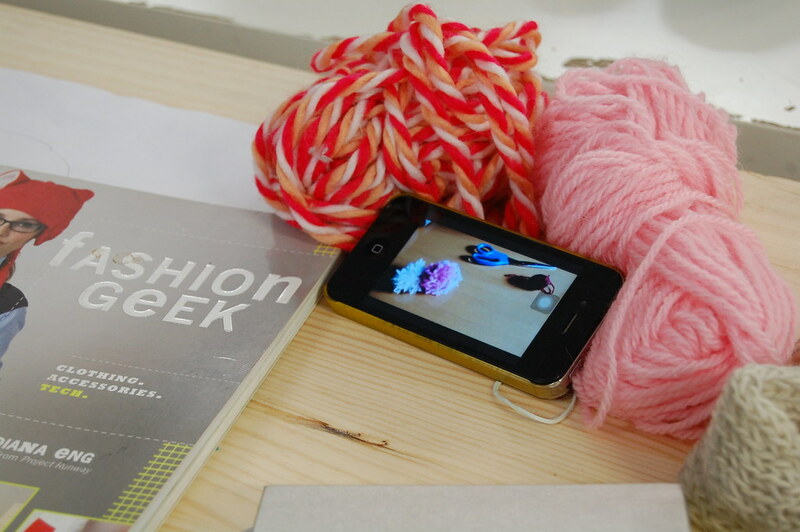 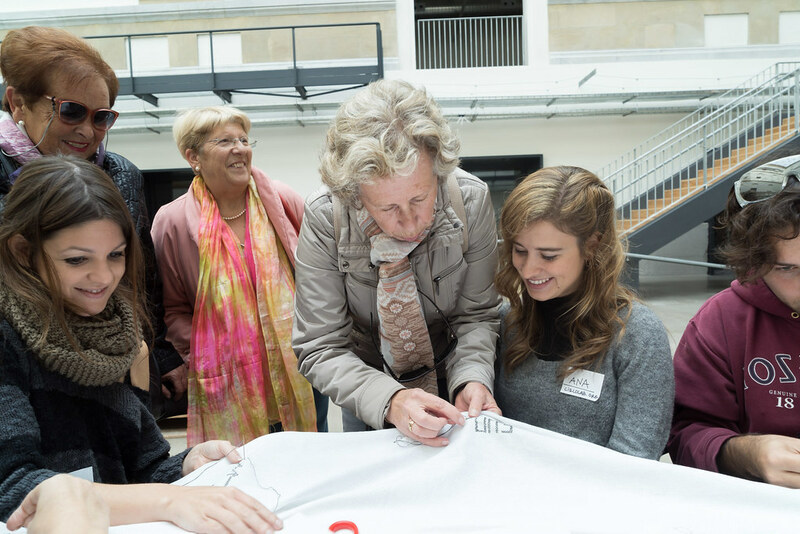 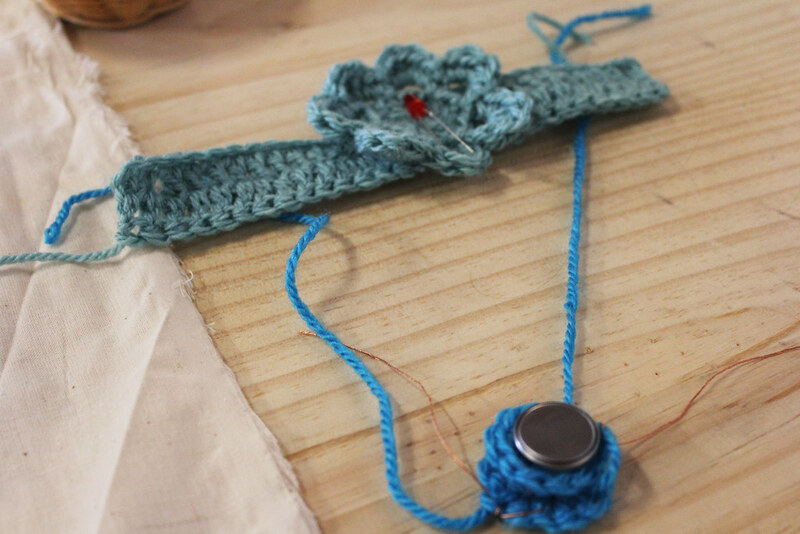 In this introductory workshop, participants will learn how to knitting with conductive thread. 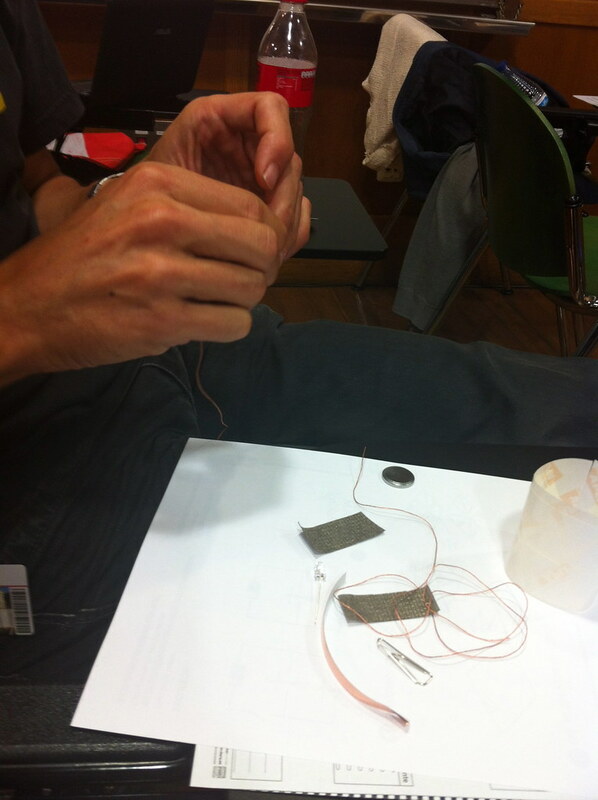 Crafters will explore its electrical and material properties through various e-textiles techniques in order to understand how it works, different types of conductive thread. 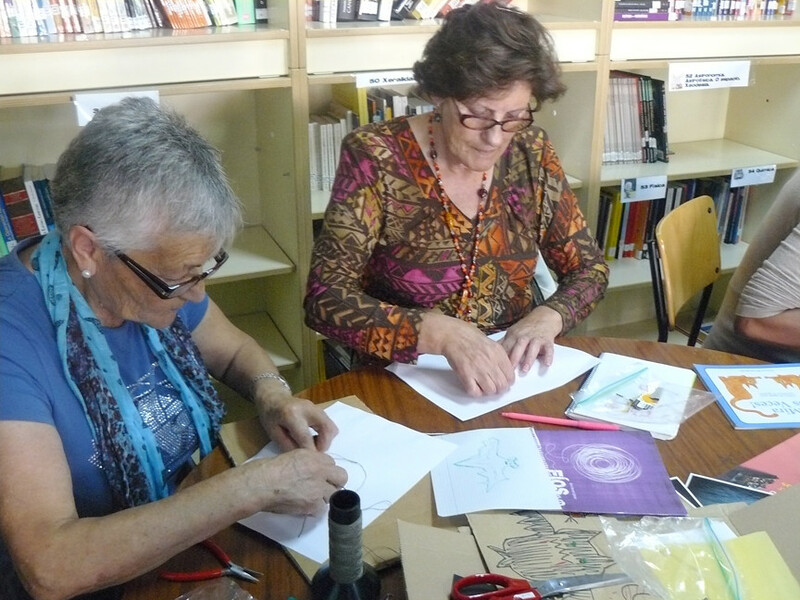 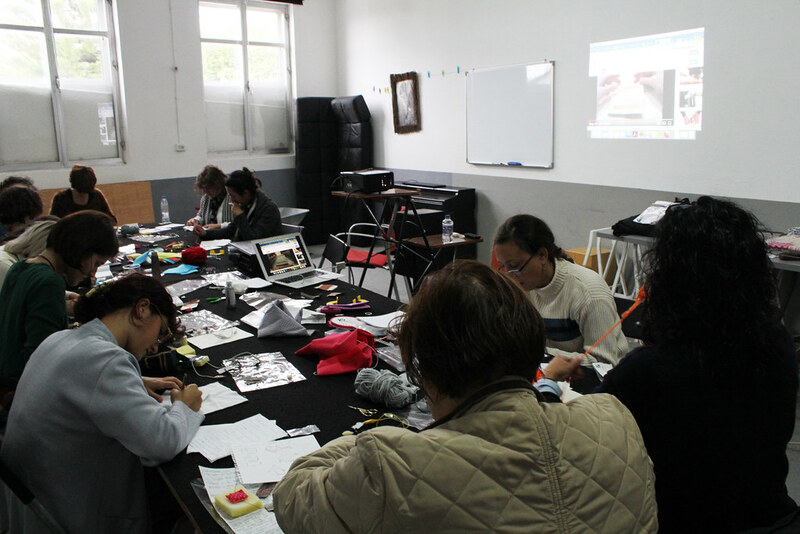 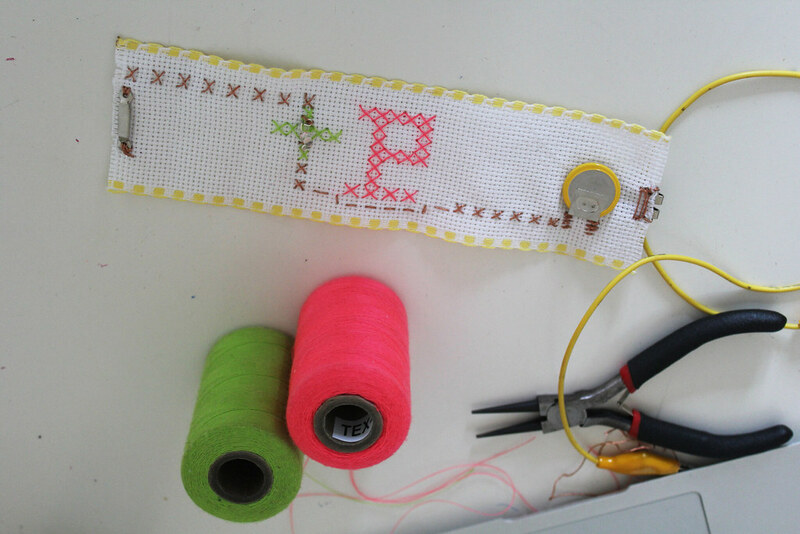 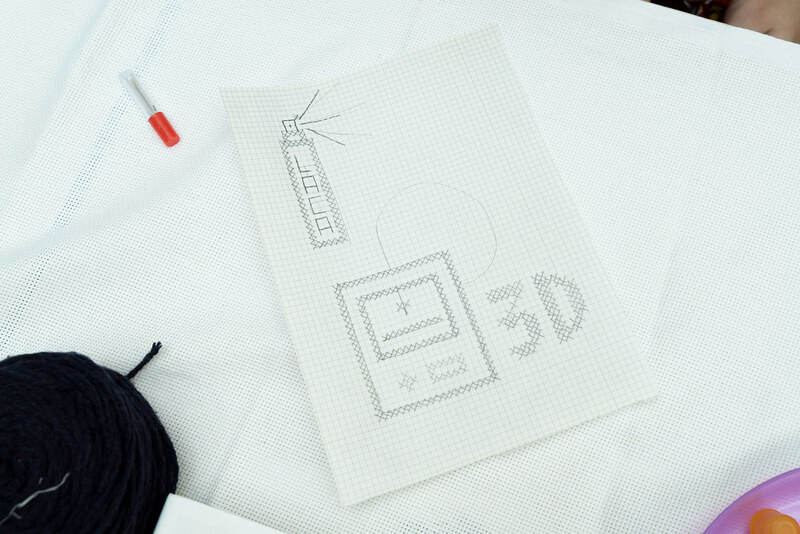 The workshop “How to make letters and cross stiched circuits” invites the participants to learn to embroider the letters of the ABC in cross-stitch with the aim of initiating them to the construction of e-textiles. 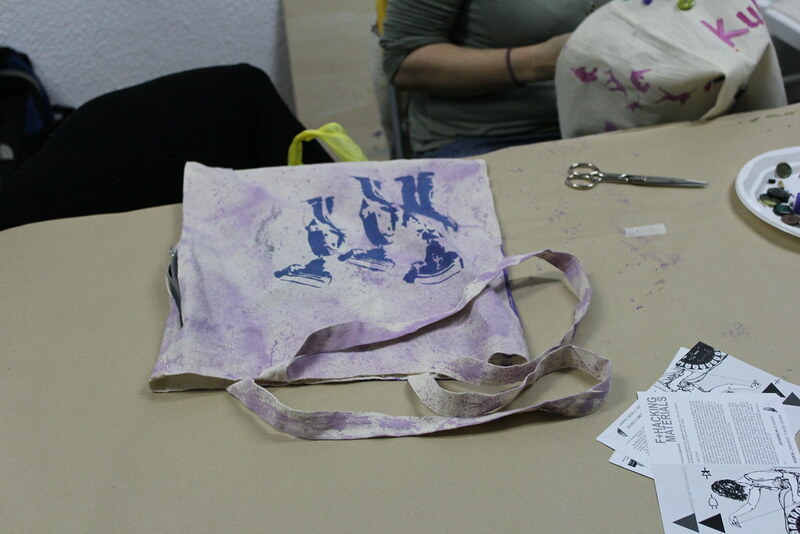 Each participant will receive a kit with all materials. 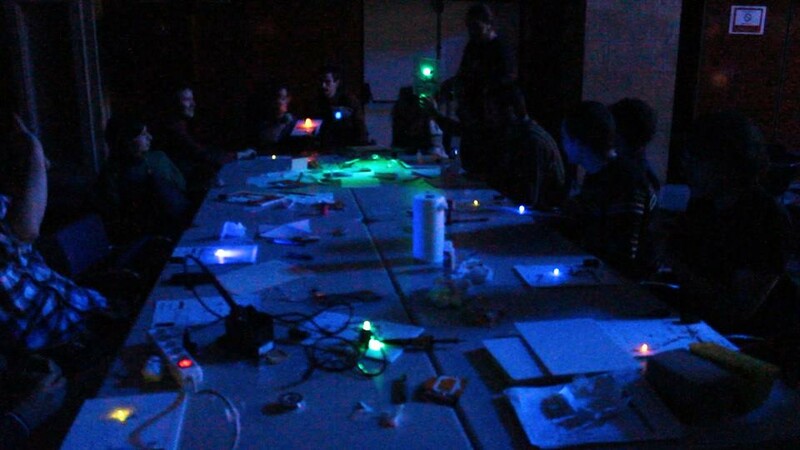 This workshop is done in collaboration with Trikoarte, during the Maker Faire. 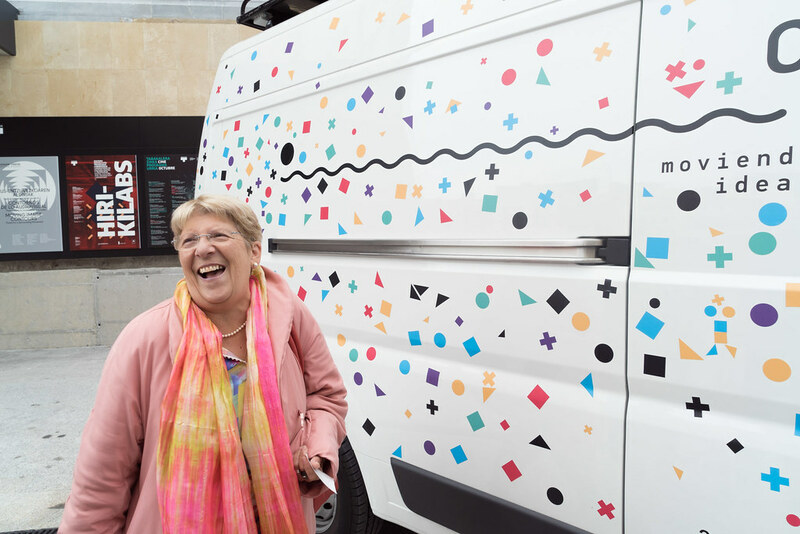 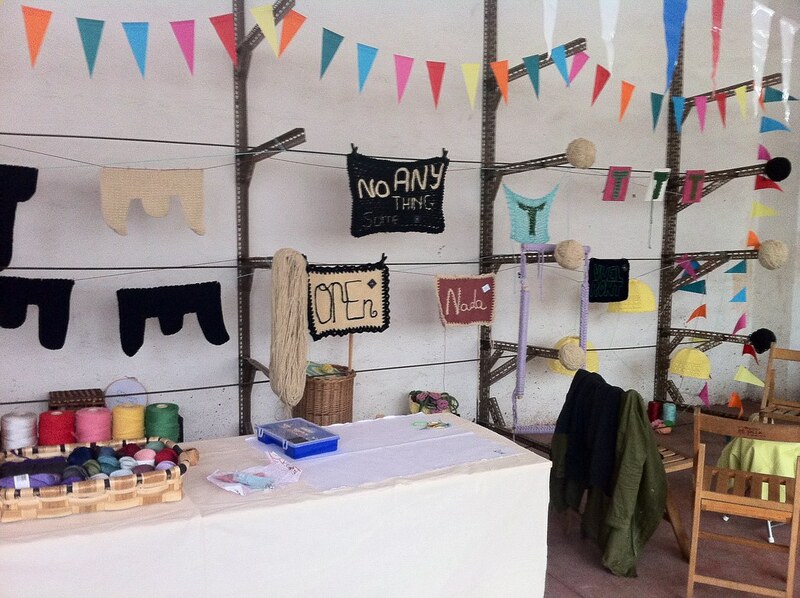 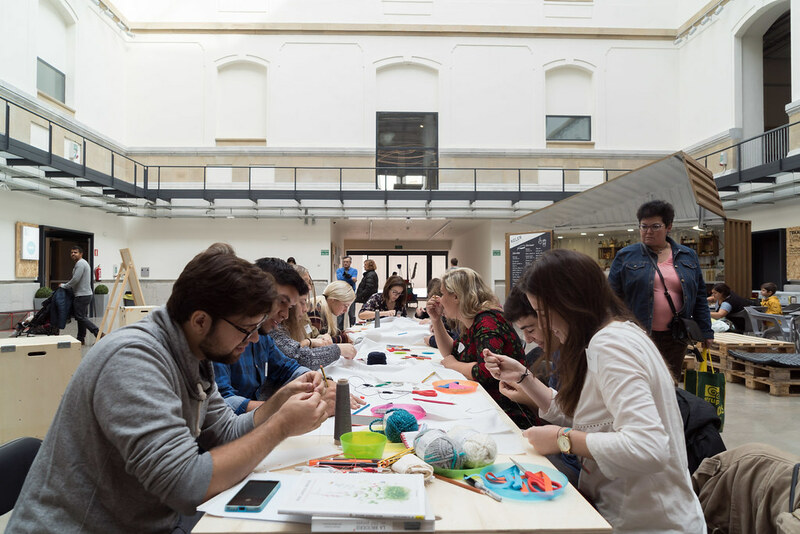 Trikoarte is a project that designs an exclusive merchandising, decorates places and promotes the wool with workshops, events and stays of people weavers and knitters. 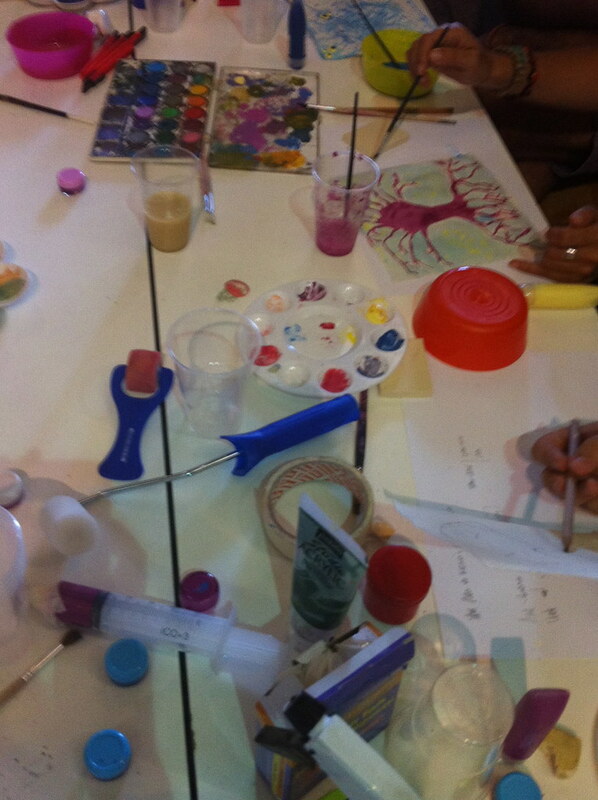 This workshop is aimed at children of 3 years. 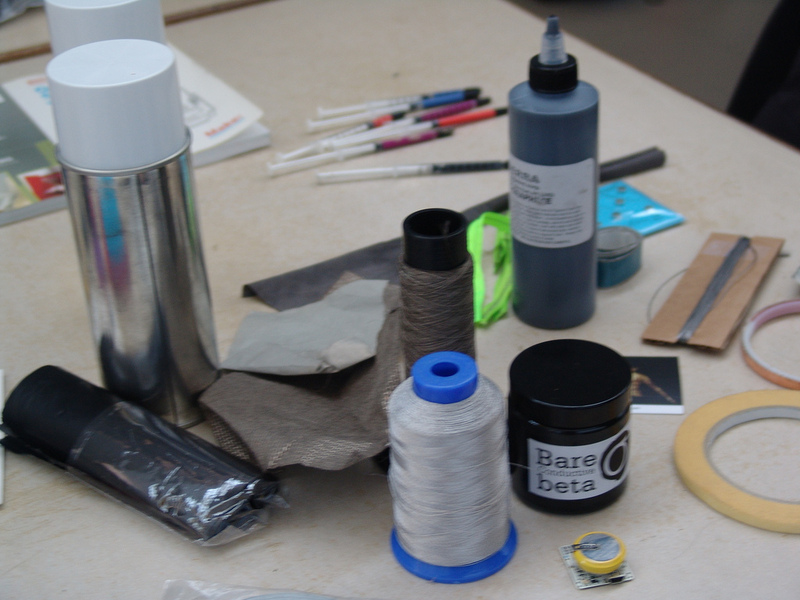 Each one receives kit with different materials. 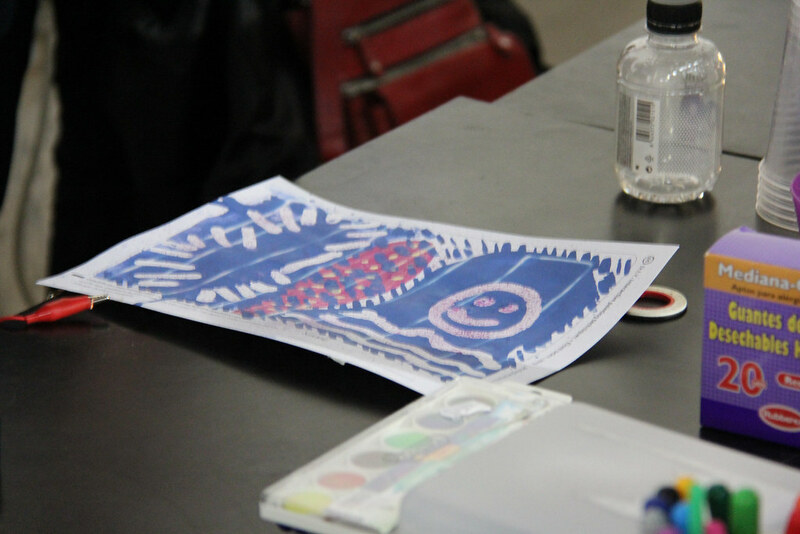 Among them, a colorable A4 template – with silhouettes to fill and use stickers inspired by Sunrise by Roy Lichtenstein – adhesive circles of normal colors and other reagents to heat. 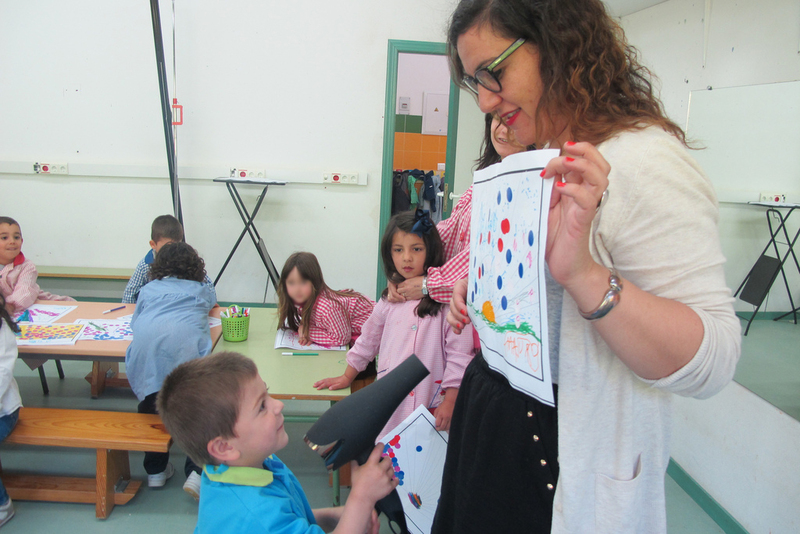 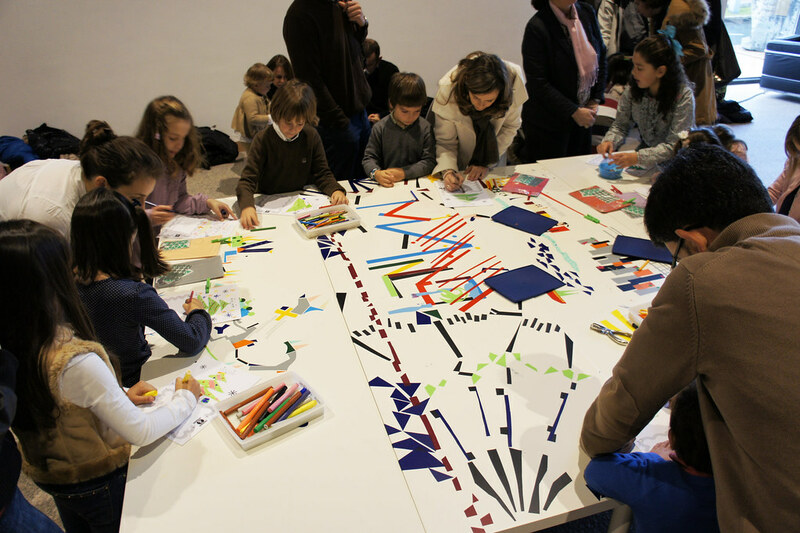 During the workshop, the children will be told to complete their Pop Art “drawing” by placing the stickers with their corresponding shape. 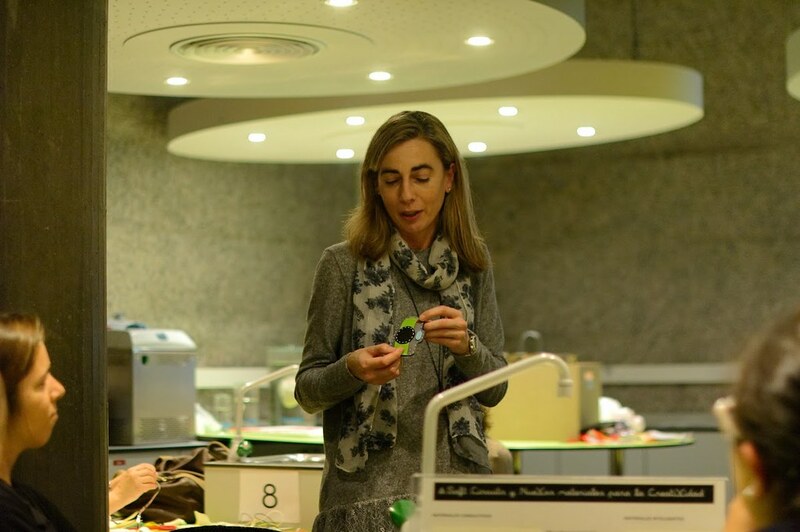 It will also explain that circular stickers are special because they are heat-reactive so children can identify the differences between those who are and those who are not. 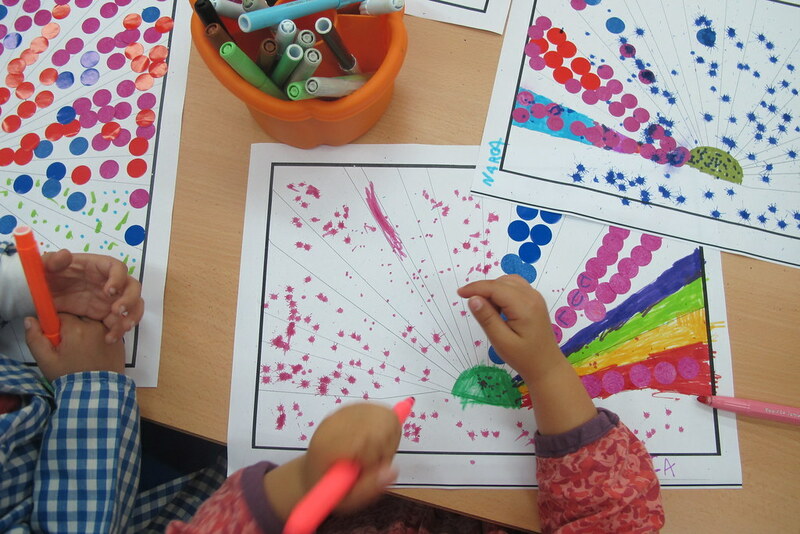 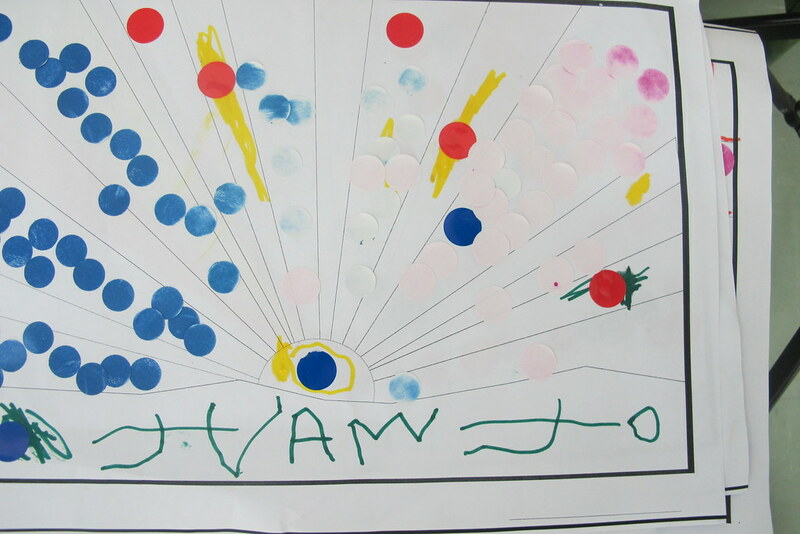 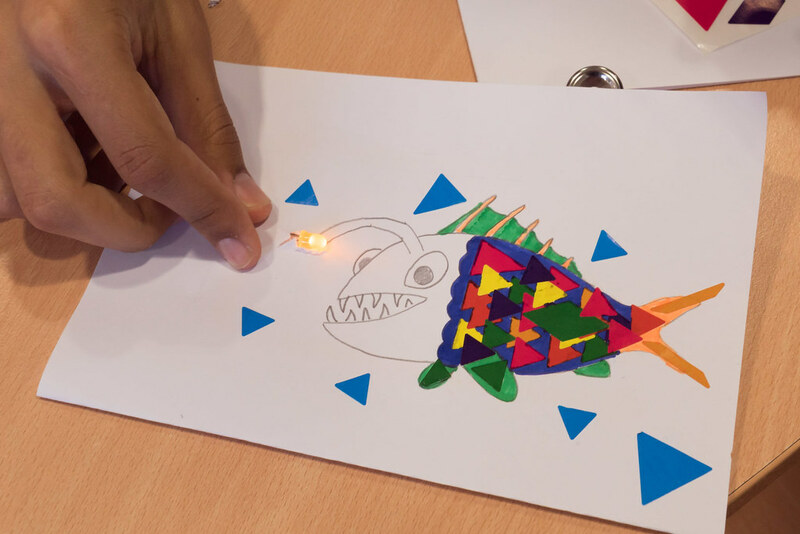 Once the “drawing” is finished, children will be encouraged to explore how to hide letters using the Stickers that are reactive to heat using different colored pencils. 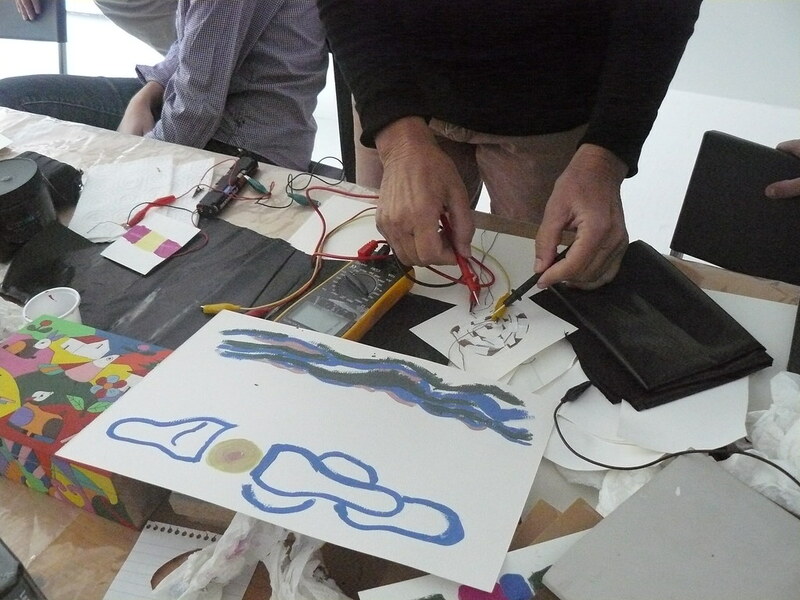 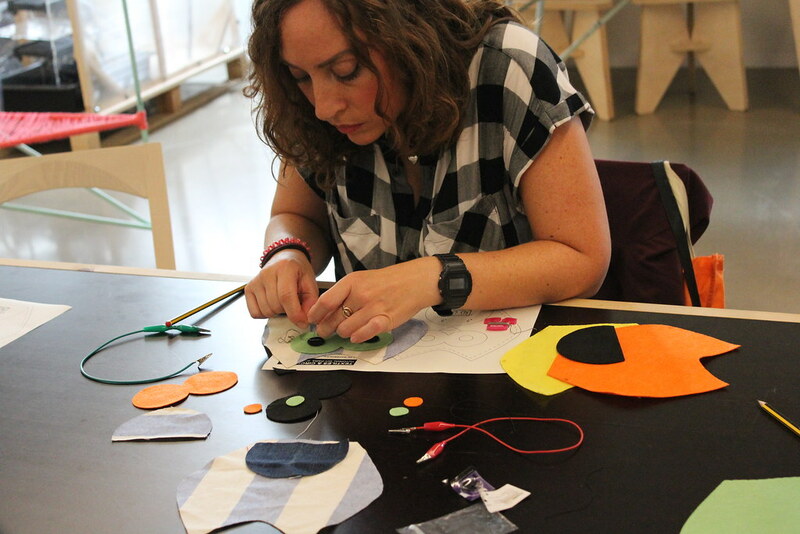 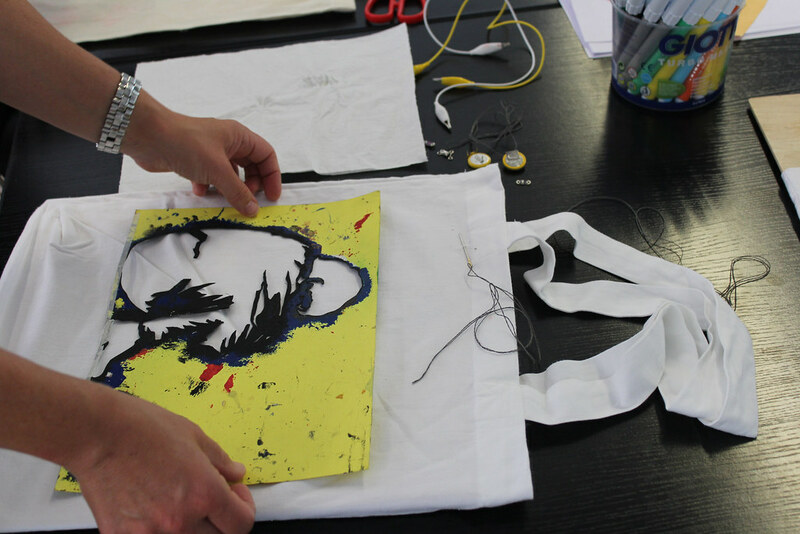 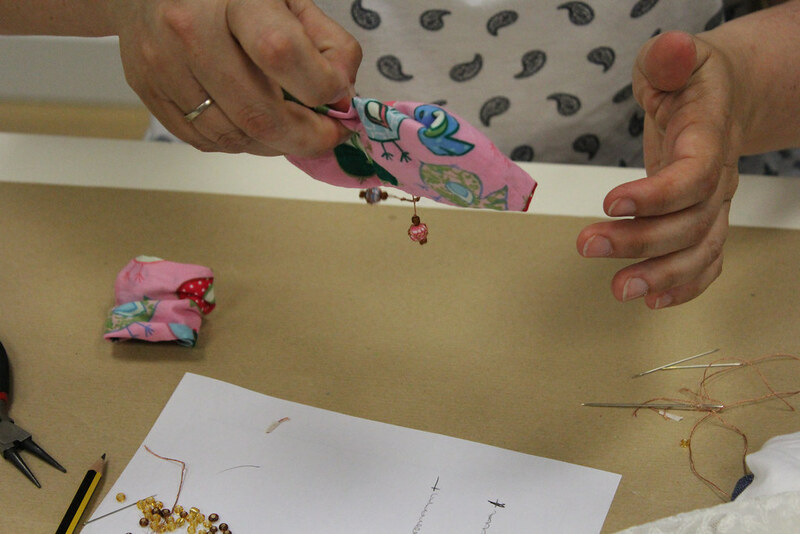 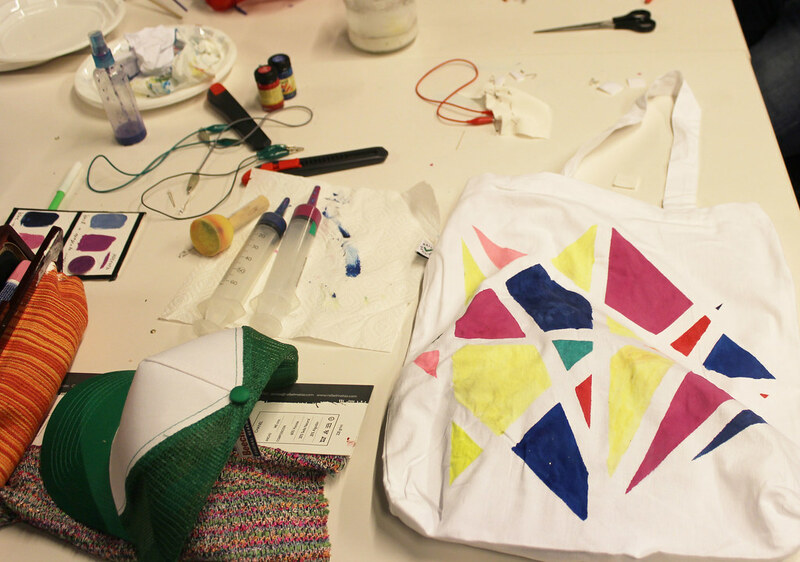 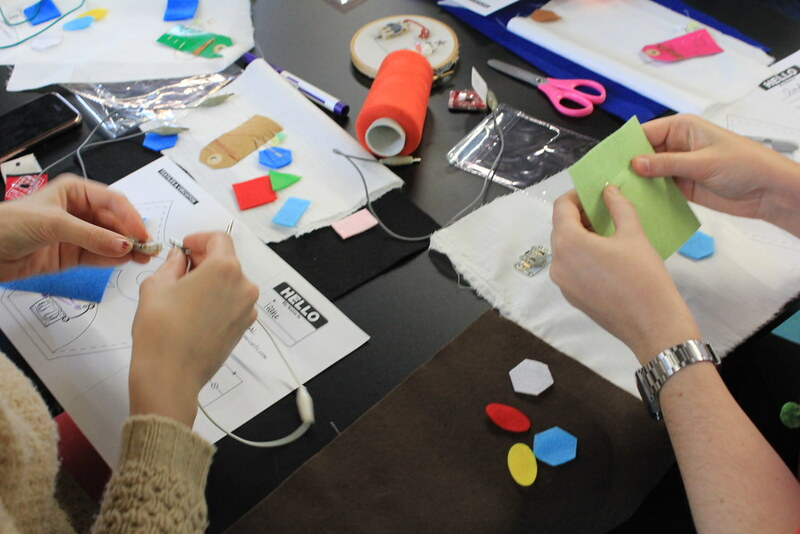 Through drawing, painting and sewing, this workshop invites participants to build circuits, experiment with new materials and explore the creative potential offered by the integration of electronics into textiles. 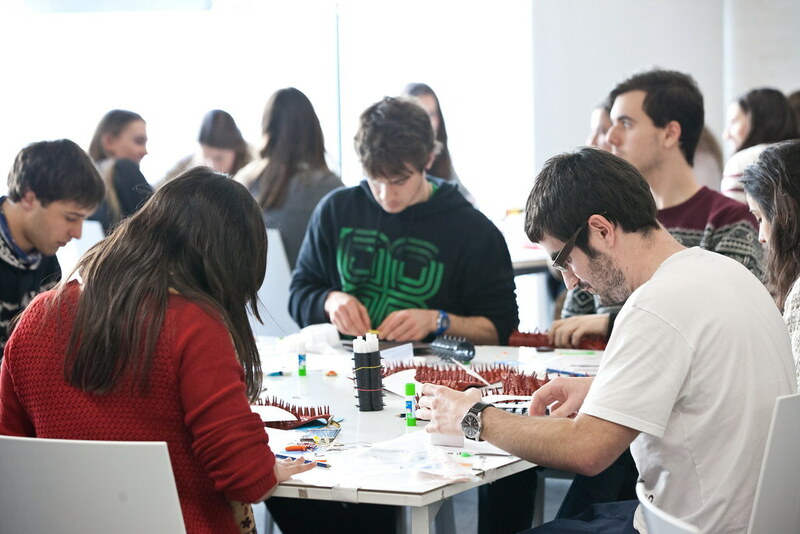 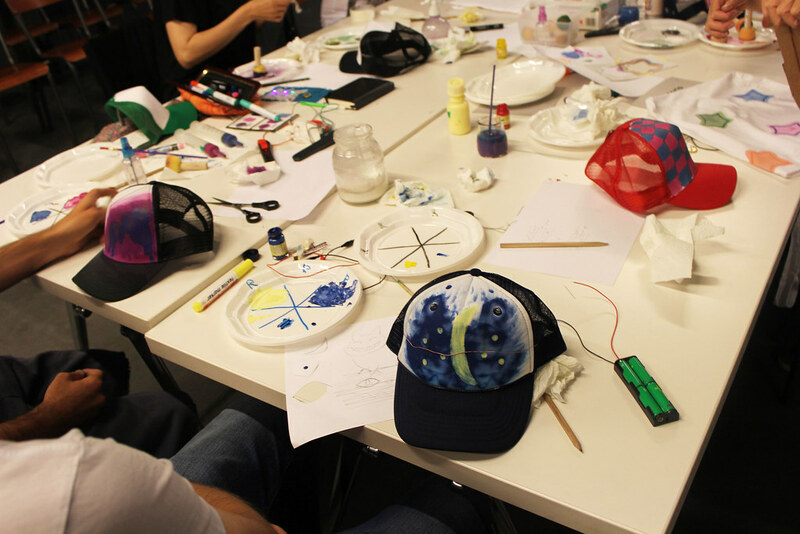 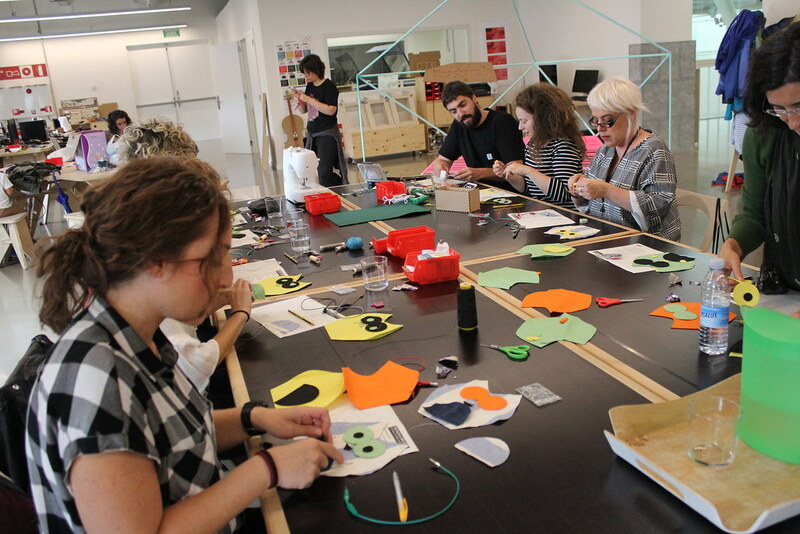 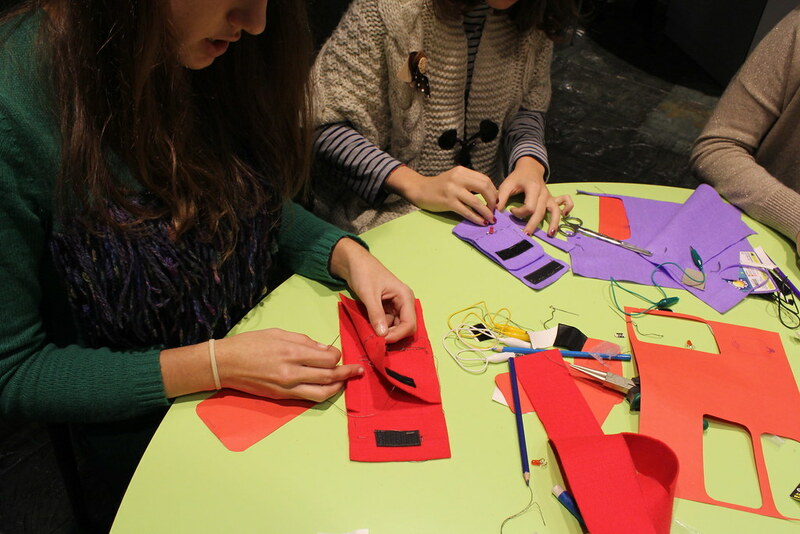 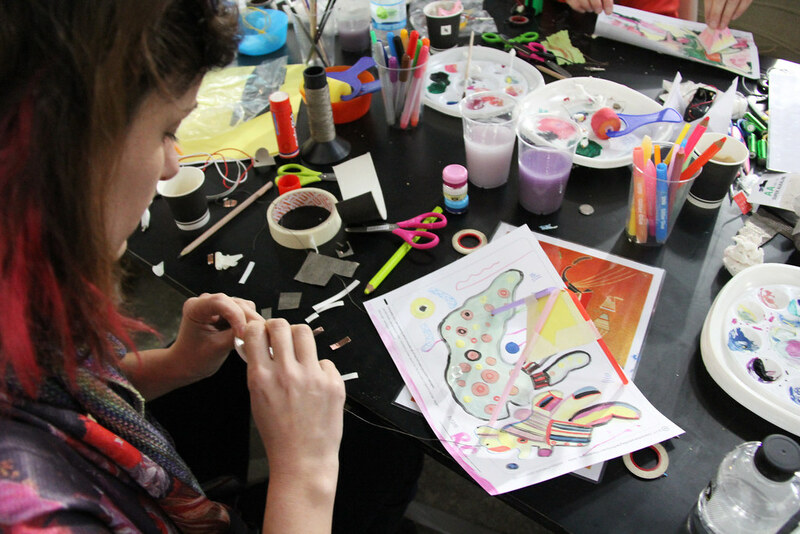 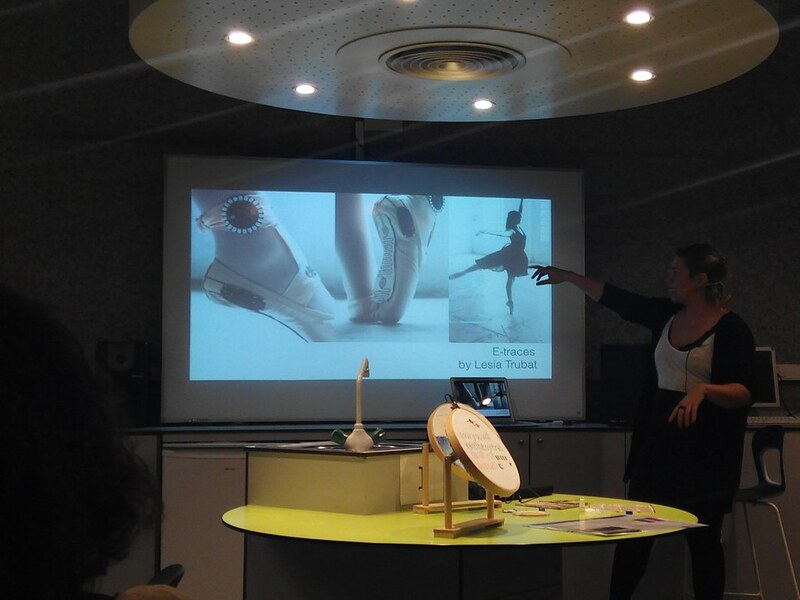 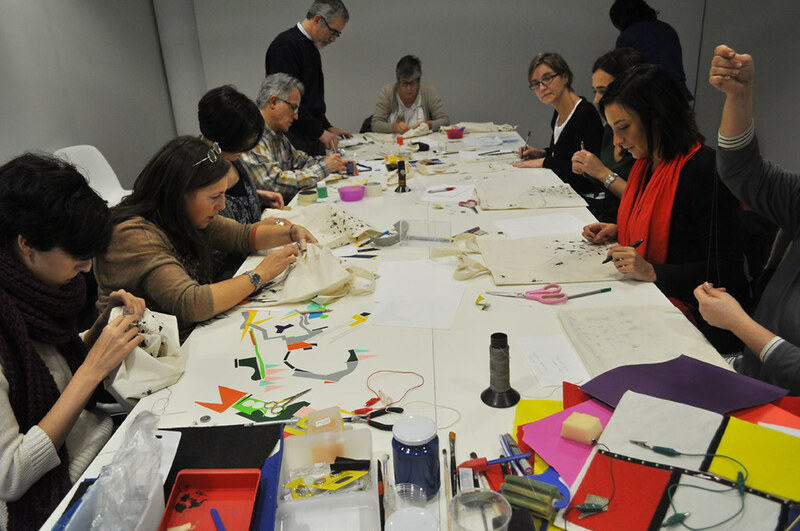 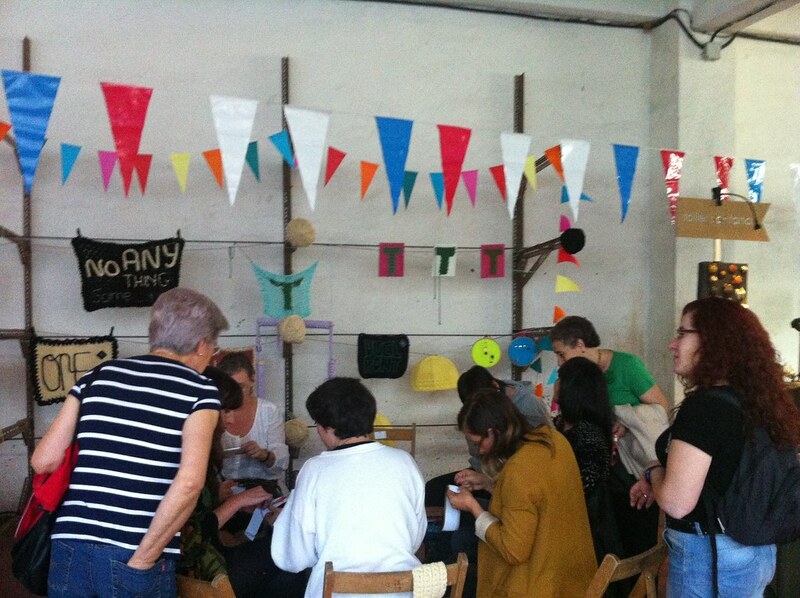 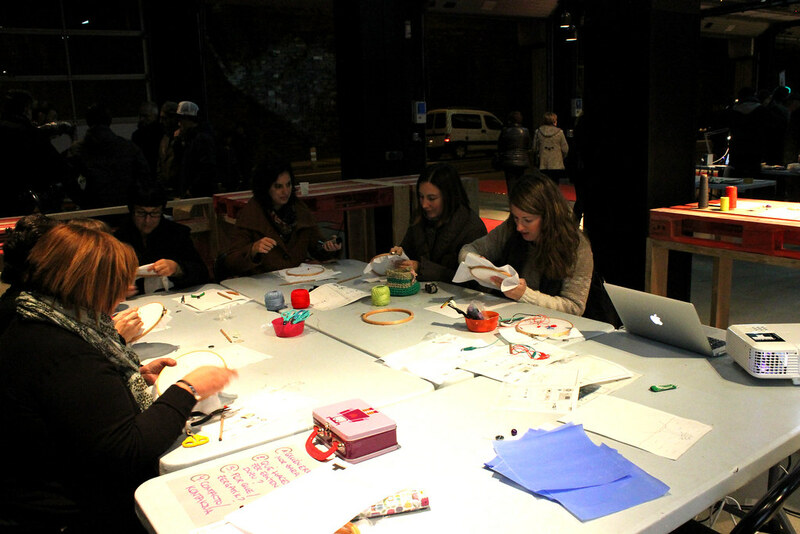 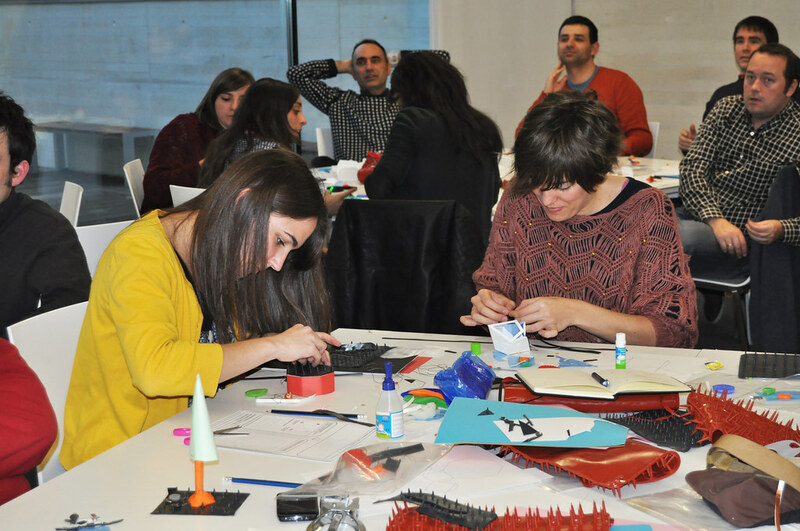 It is an ideal initiation workshop for those who Want to discover the new creative possibilities of e-textiles. 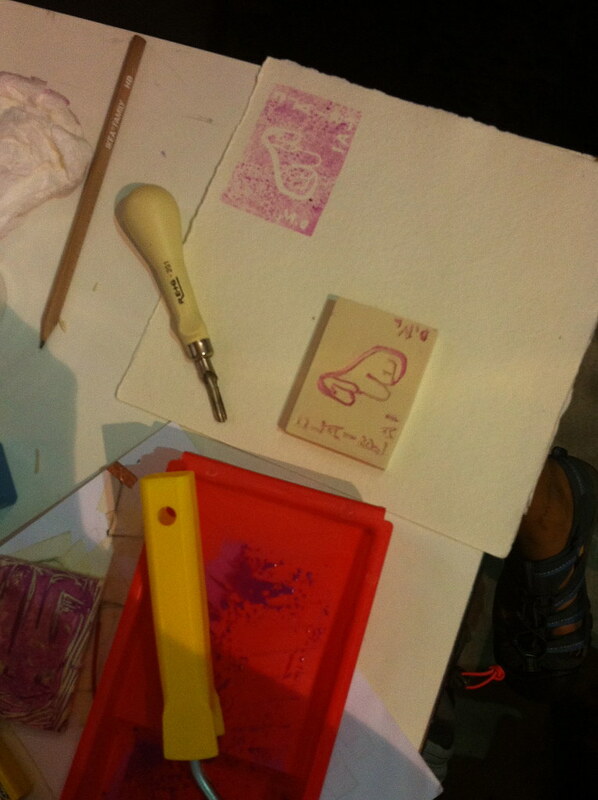 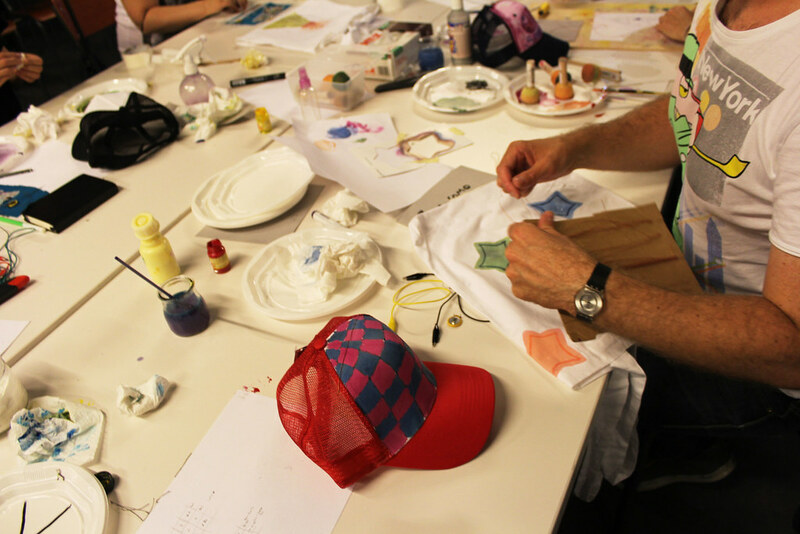 This workshop is held during the T-festa celebration (Art T-shirt festival). 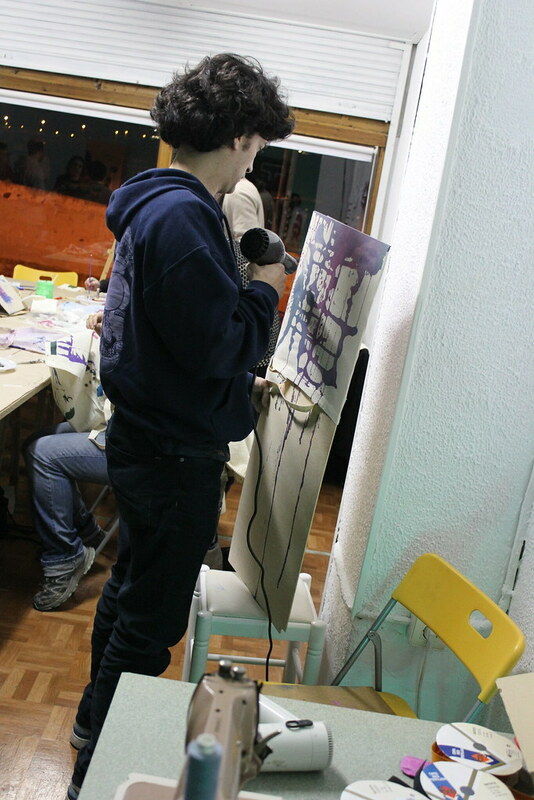 The objective of this event is to provide artists and designers / is a platform to show their work in its different aspects. 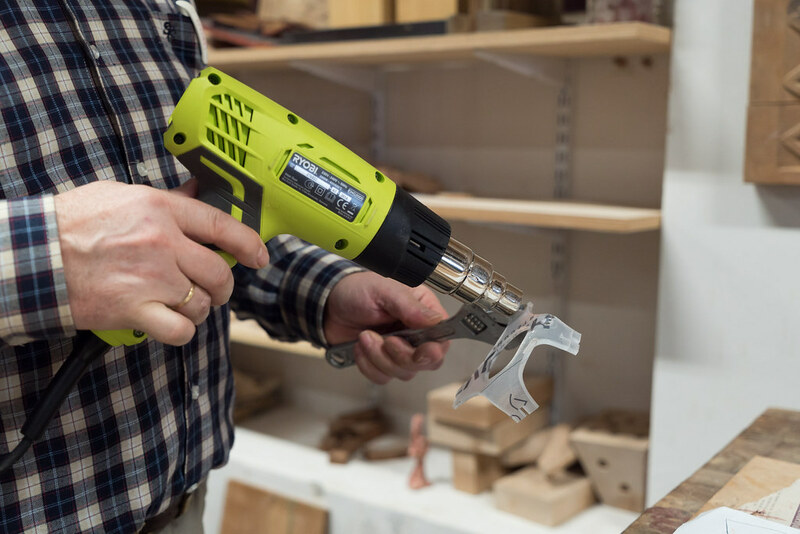 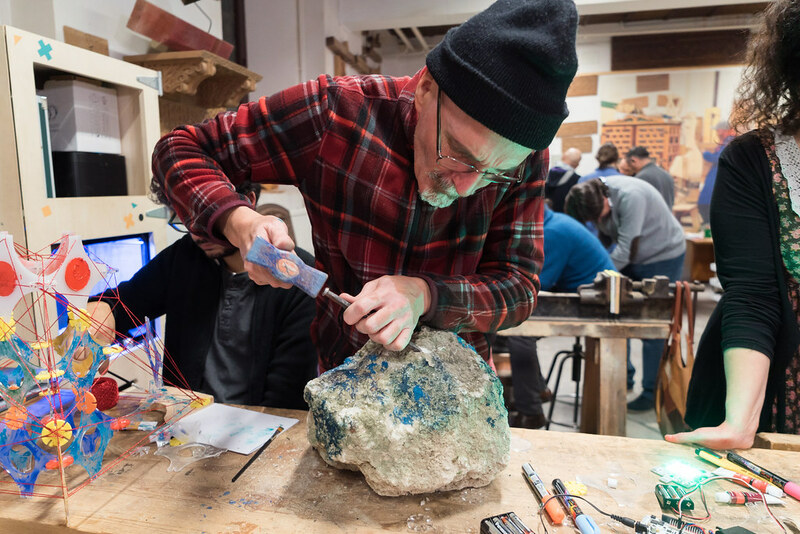 Recently, technological democratization, DIY culture and maker along with the appearance of new materials is allowing the artist to manufacture his own electronic devices. 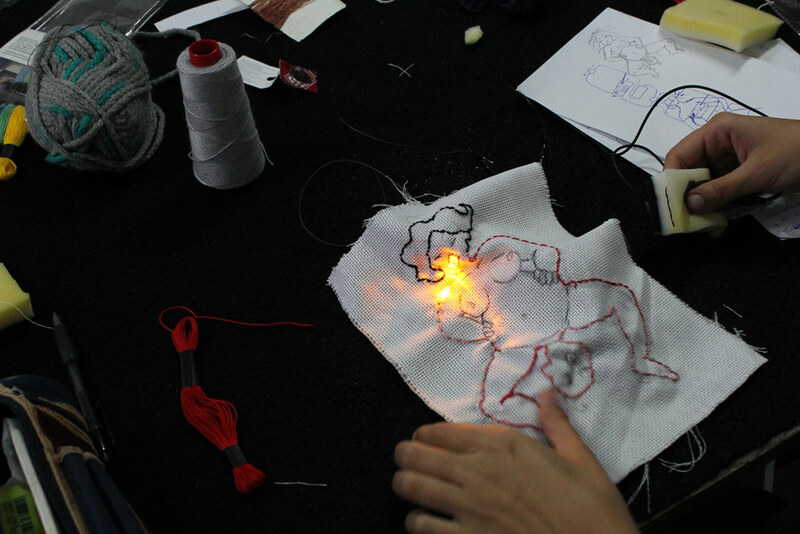 Today we have at our disposal materials such as wires or electrically conductive fabrics that allow the artist to mix technology with traditional craft techniques (sewing, crochet, embroidery, etc.). 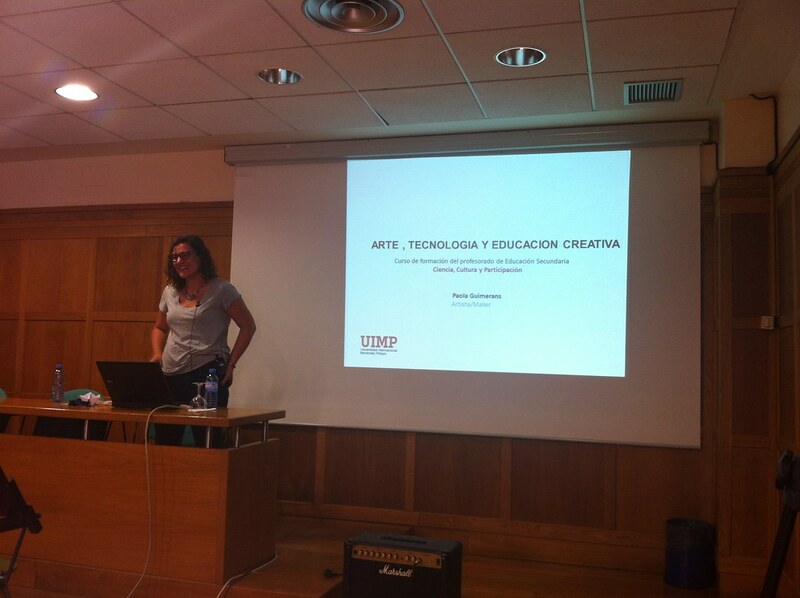 In this context the workshop is proposed CRAFTOGRAFIAS DIGITALES. 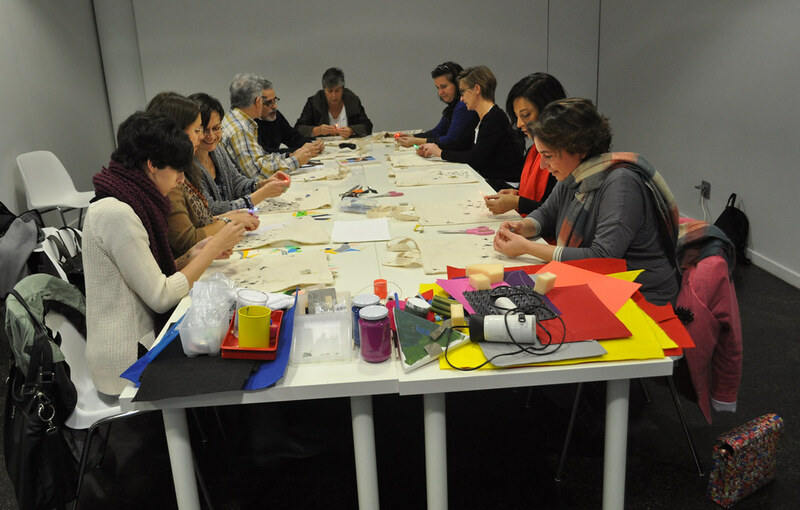 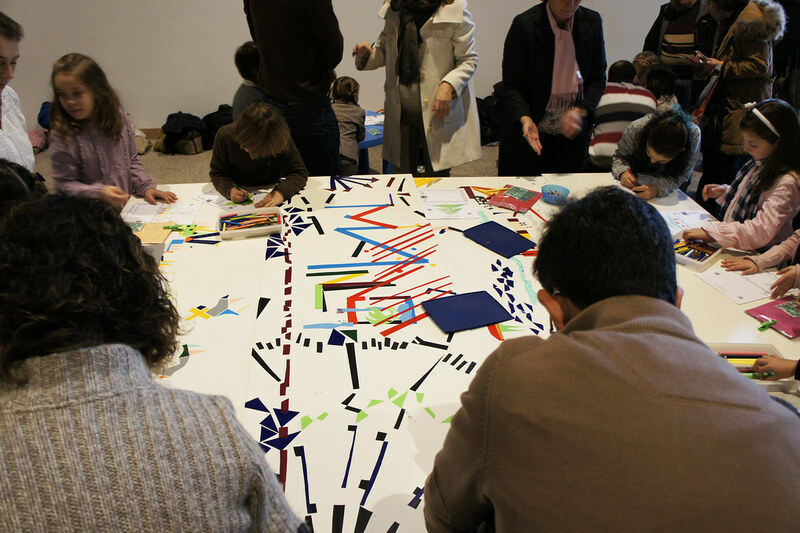 The workshop craftografías digitales invites you to reflect on the use of open source tools and new materials in artistic creation processes. 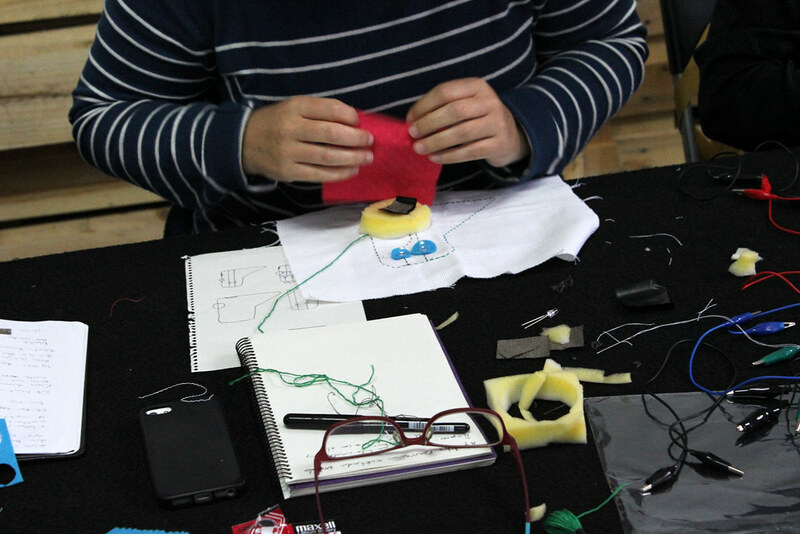 Participants will receive a theoretical and contextual introduction to the practices you apply yourself specifically to electronic textiles. 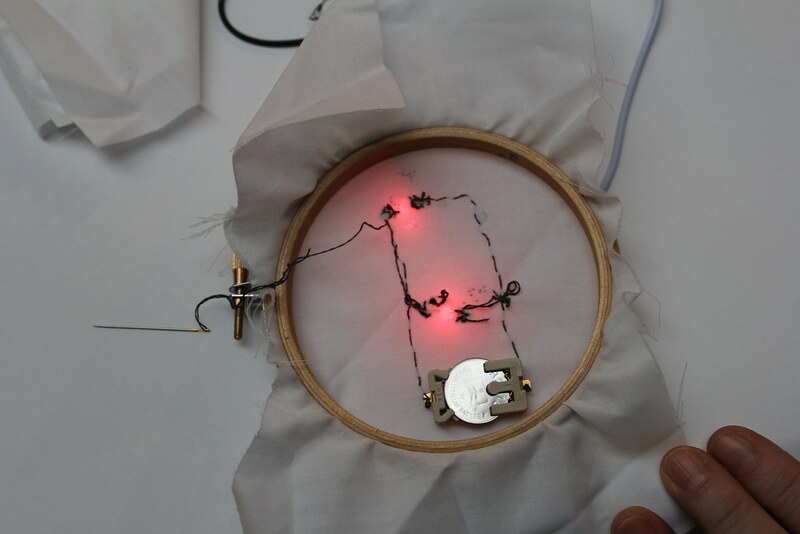 Taking as a reference the structure of the electronic circuit itself, as a basic element and relating it with its inherent identity as a map, we will perform an exercise in which we will learn to design and sew a textile circuit. 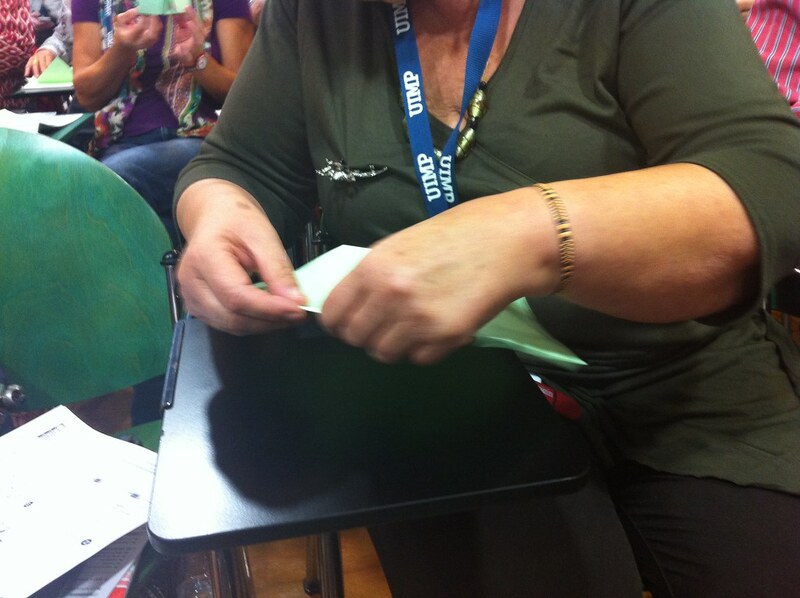 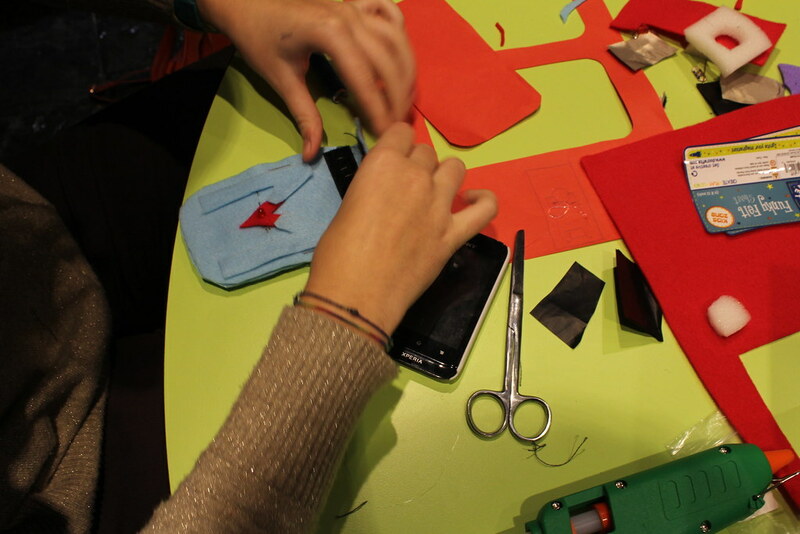 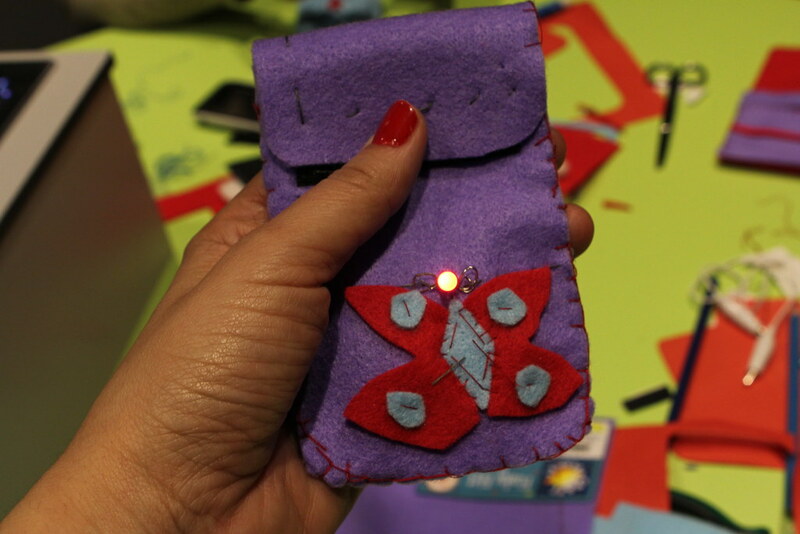 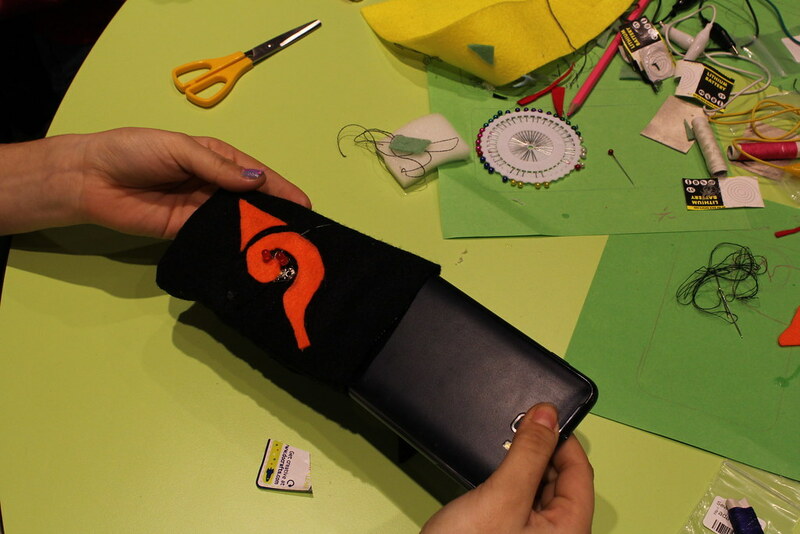 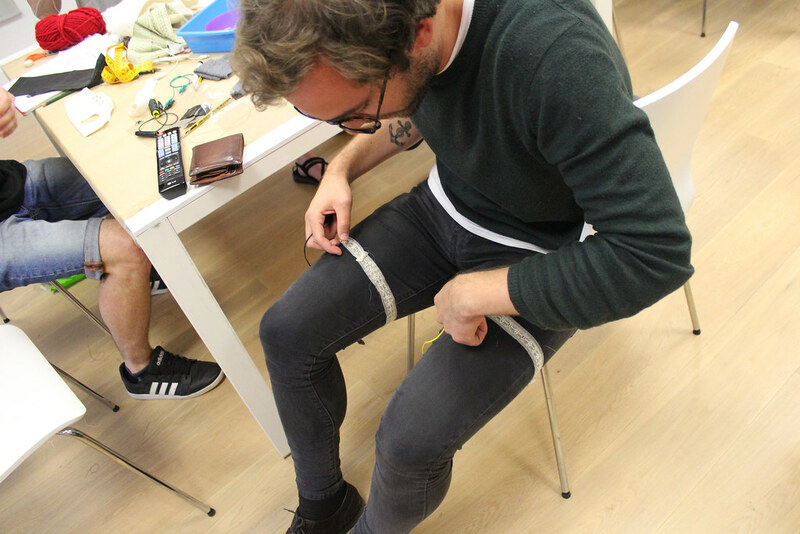 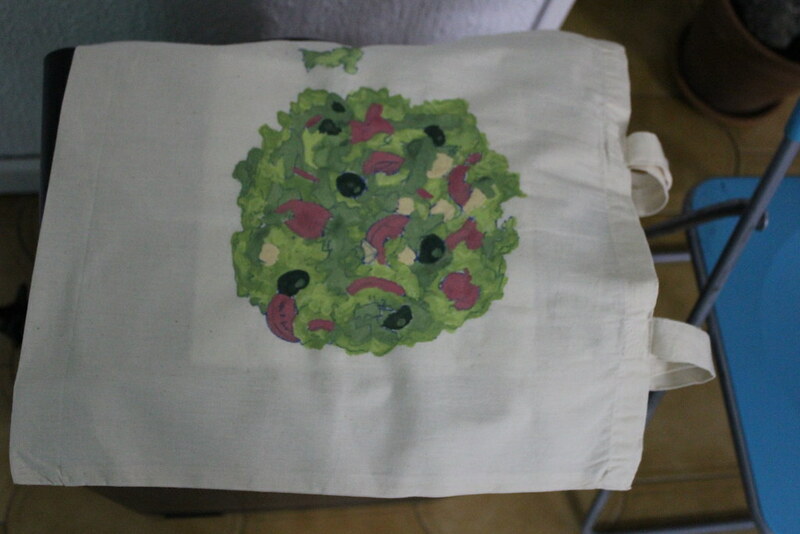 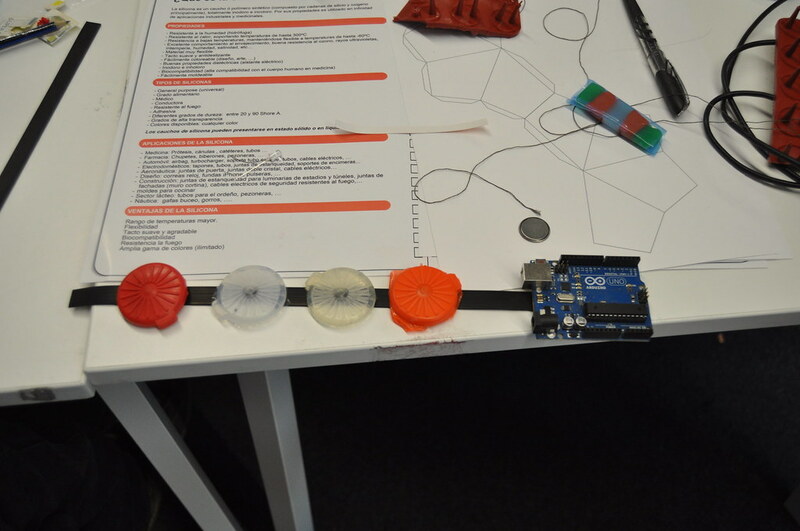 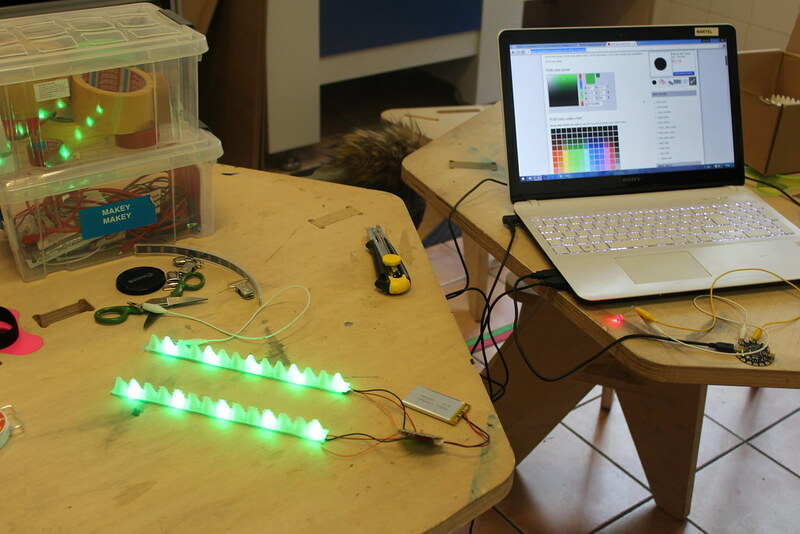 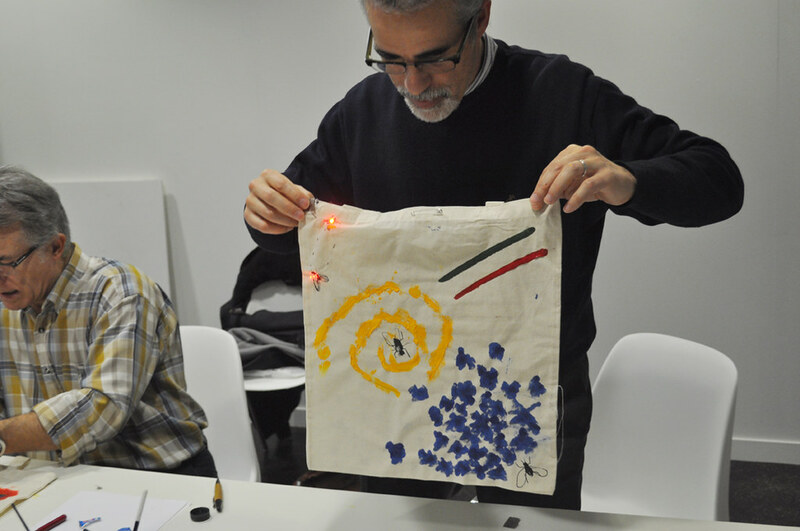 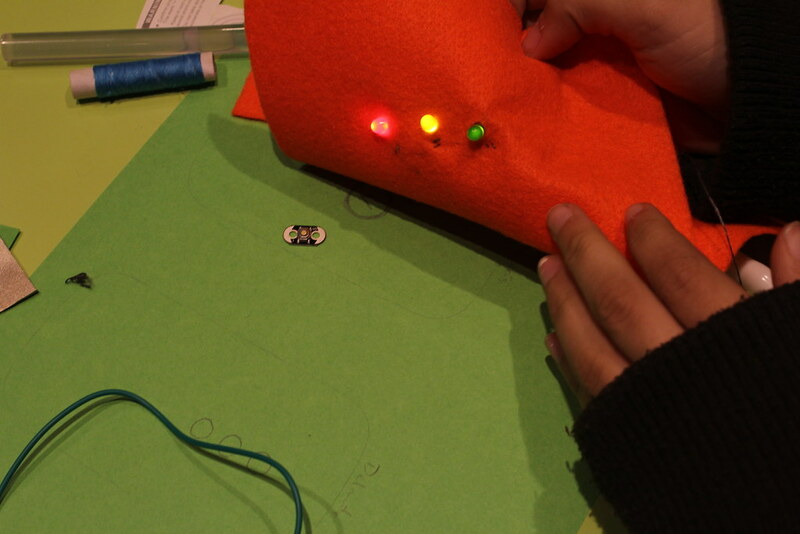 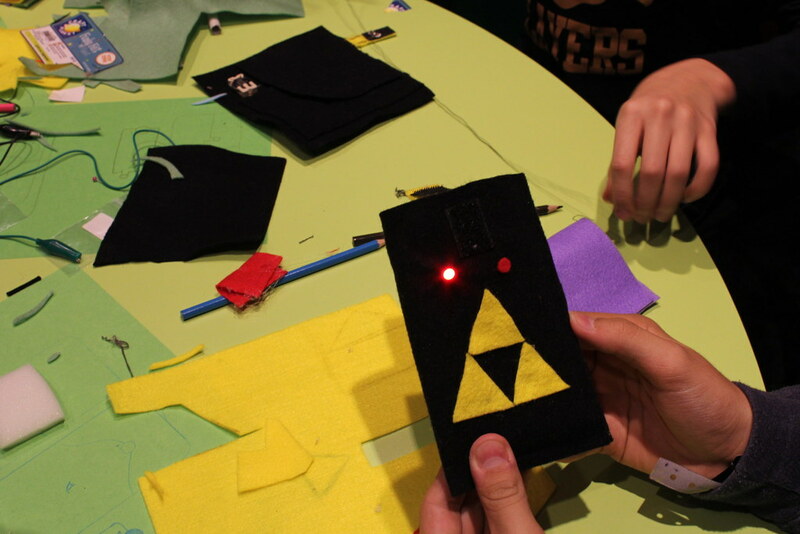 During the workshop we will work with the Aniomagic and Lilypad Arduino e-textile kit. 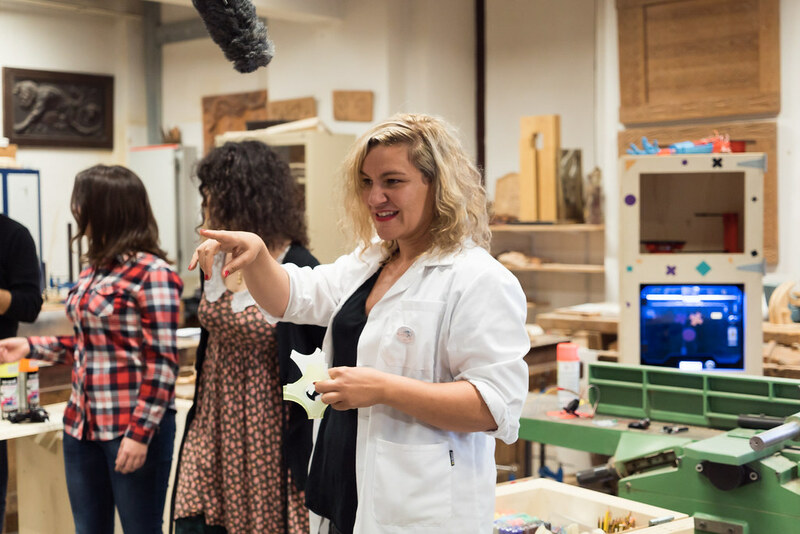 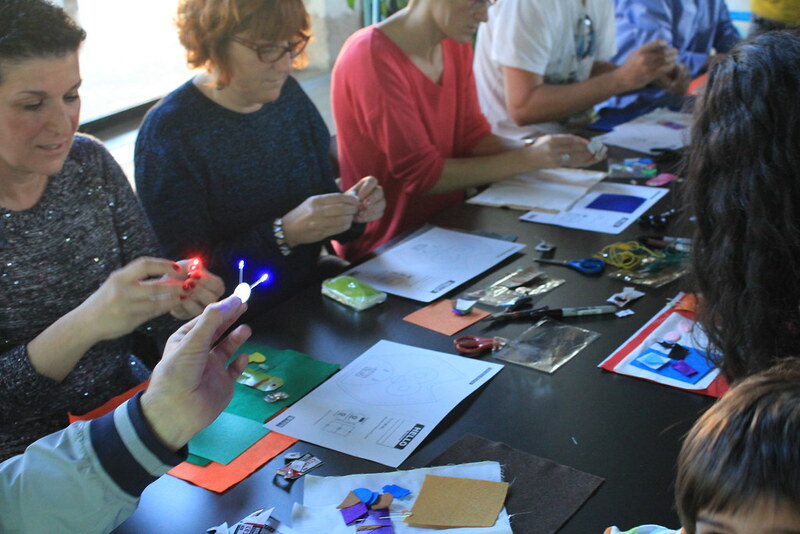 This creative and material exploration workshop invites participants to experiment with different electronic components and silicones. 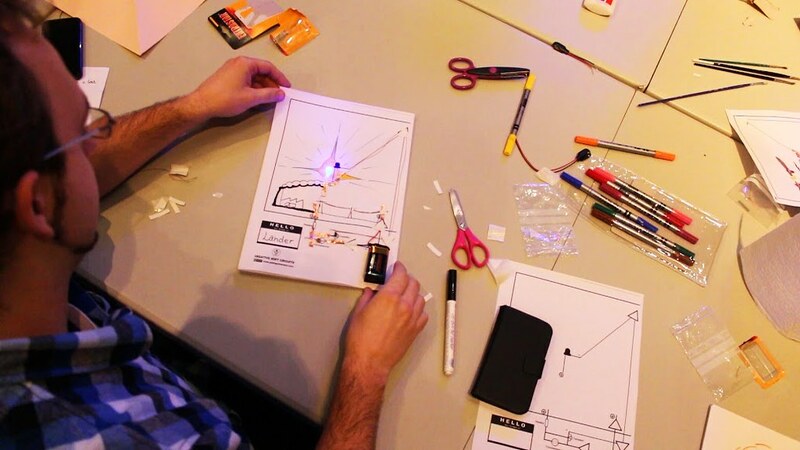 The attendees of this workshop will be able to manufacture their own interactive device in three dimensions integrating technology in conductive, photoluminescent or recycled silicones. 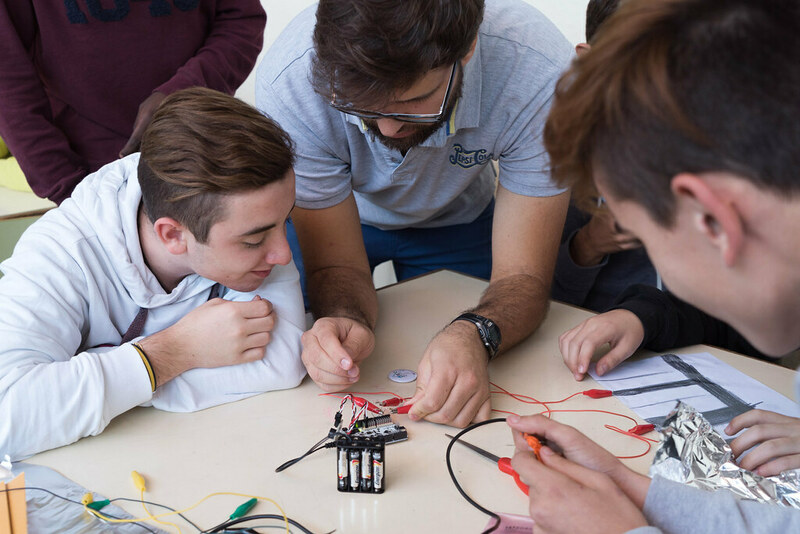 Each participant will receive a kit with the basic electronic components and materials needed to prototype their ideas and share in a collaborative environment their learning process. 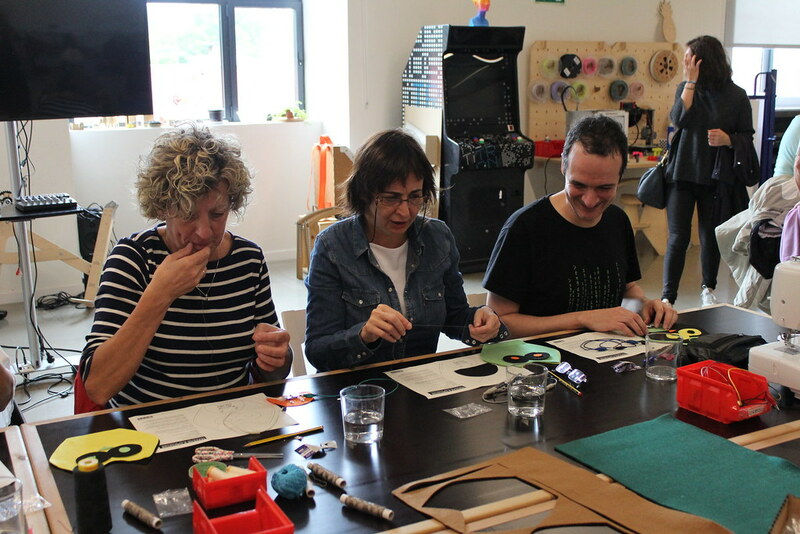 This workshop took place in the framework of the Improbable Connections project. 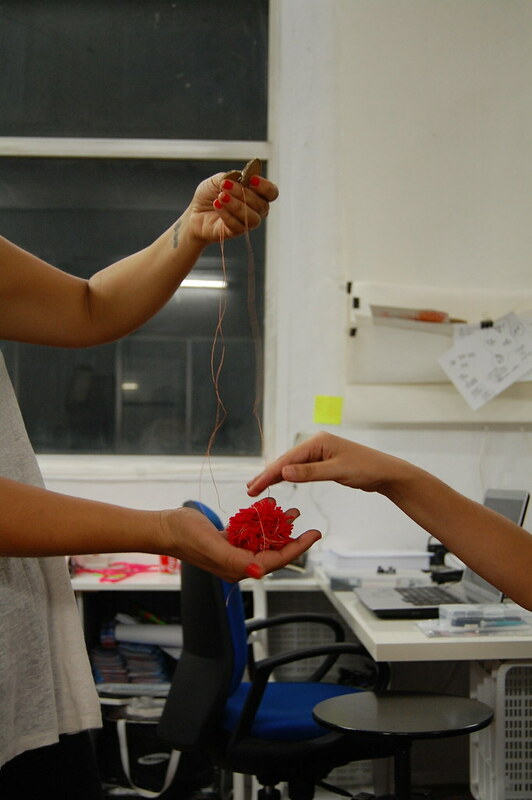 Silicones Silam is an industrial company dedicated to the transformation of silicone into industrial products; Collaborates with Paola Guimerans, an artist and educator, who works at the intersection of art, design and technology. 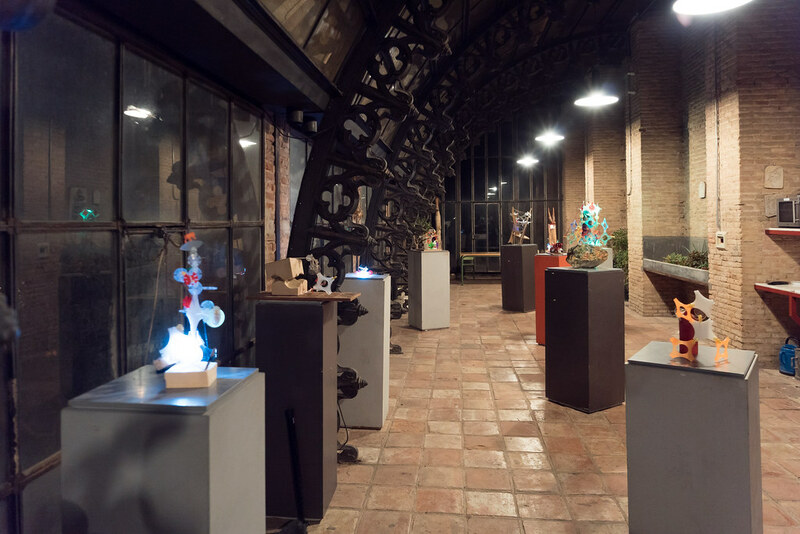 The artist as creator or inventor, in their attempt to use new materials and technological tools to express their ideas, has managed to generate new forms of interaction. 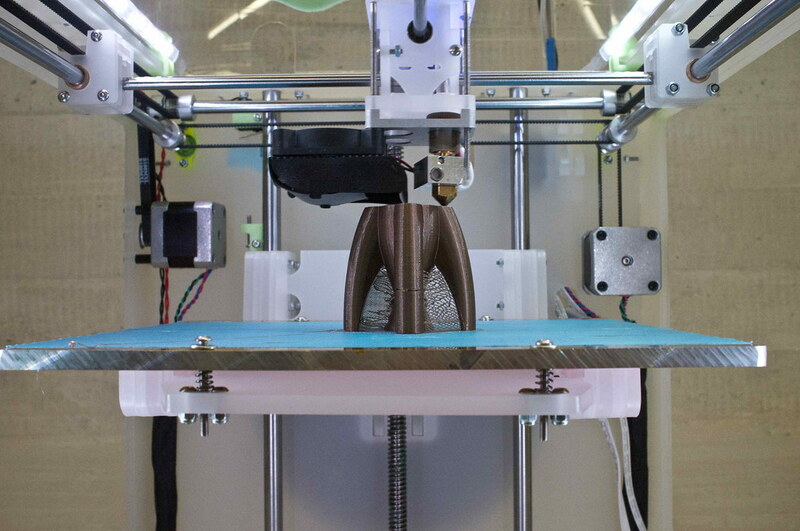 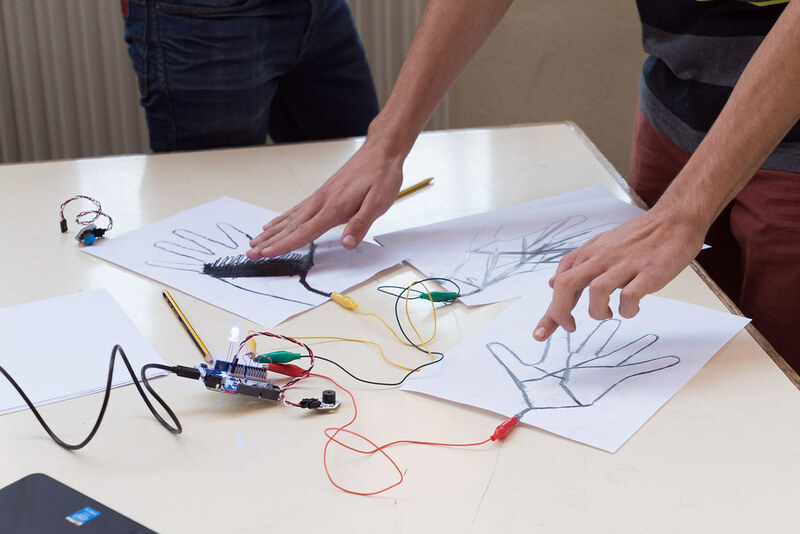 Beyond digital practices, we have a new understanding of technology as a design material. 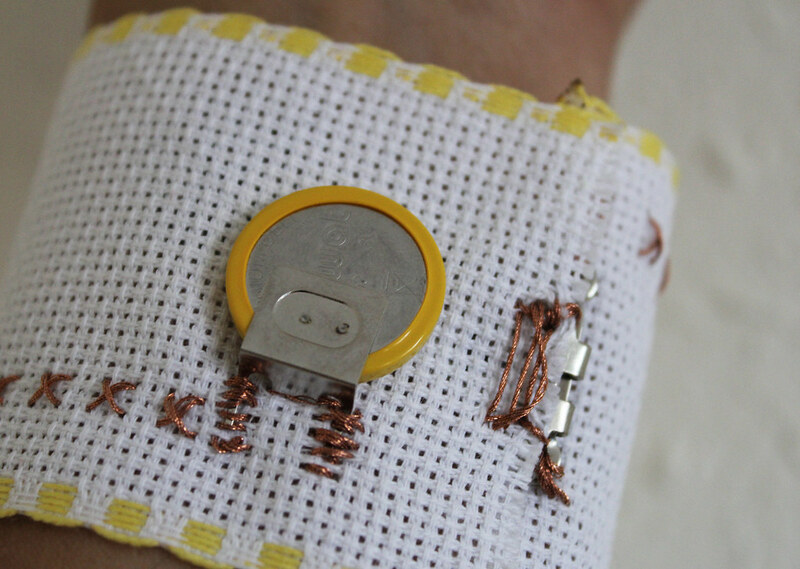 Conductive yarns and fabrics, paints that react to heat, open source electronic tools or philosophy do-it-yourself are just some of the keys to the current hybridization between electronics and traditional crafts techniques. 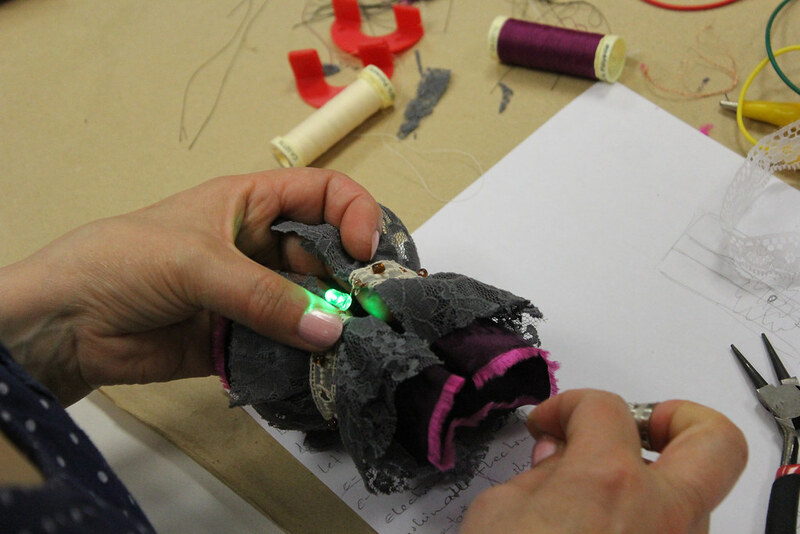 Diluting the border between disciplines, through drawing, painting and sewing, this workshop invites participants to build circuits, experimenting with new materials and explore the creative potential offered by the integration of electronics into textiles. 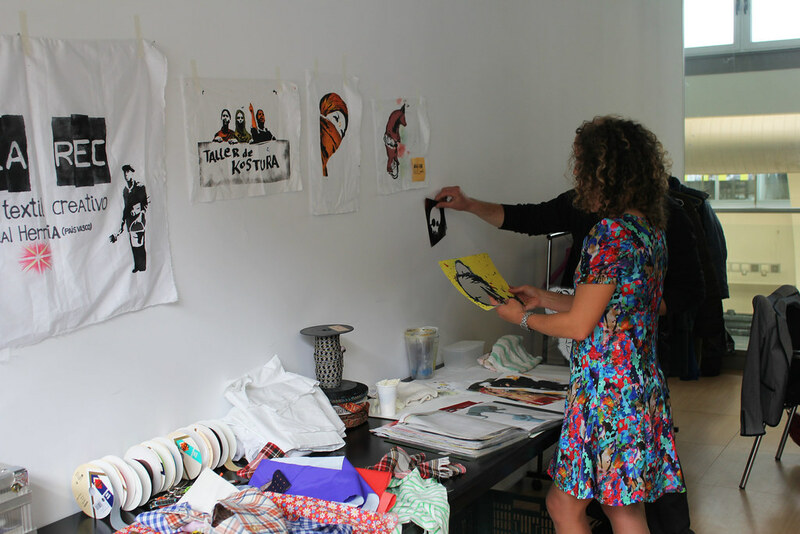 PUERTA is a cultural space founded in 2013 where workshops, work sessions, meetings, film screenings, debates and proposals take place. 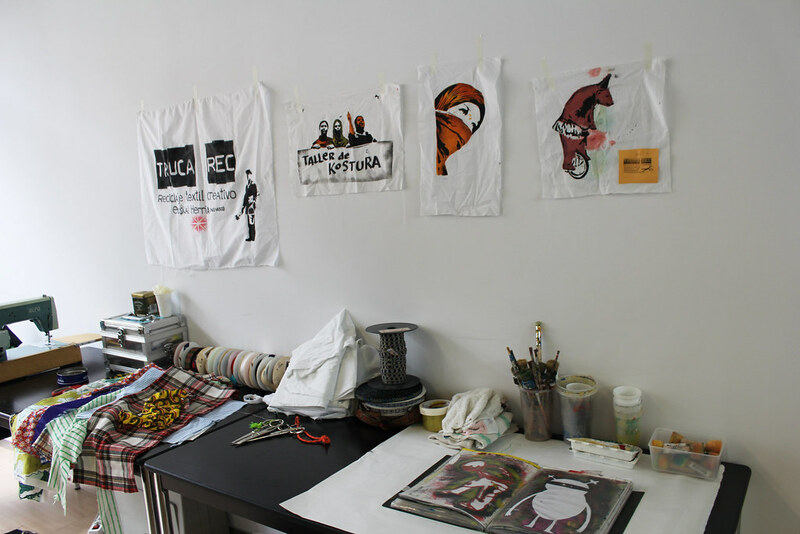 The lines of support and research tend to be mixed: drawing, audiovisual, painting, counterculture, textile, writing, figure of artist, essay, matter, speech, process. 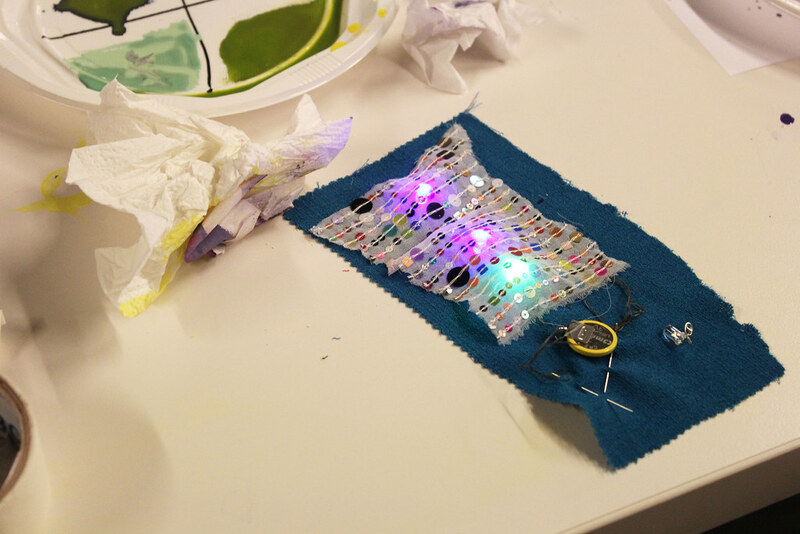 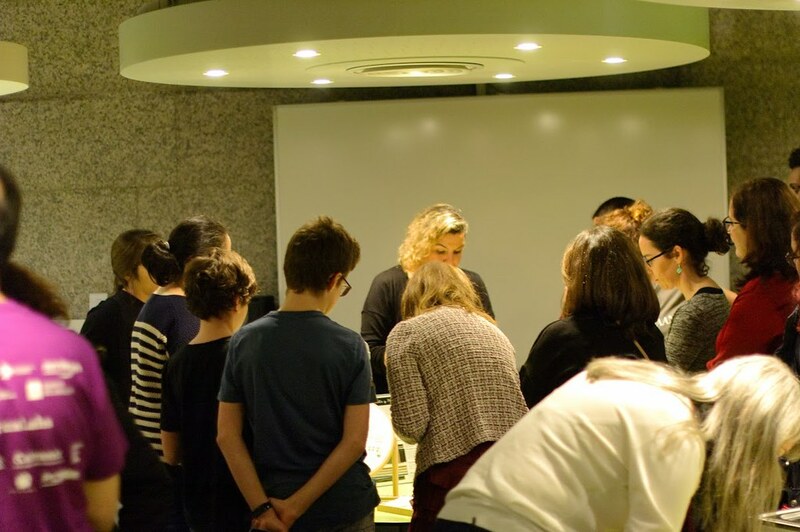 This workshop serves as a basic introduction to electronics and exploration of new techniques for the integration of technology into textiles. 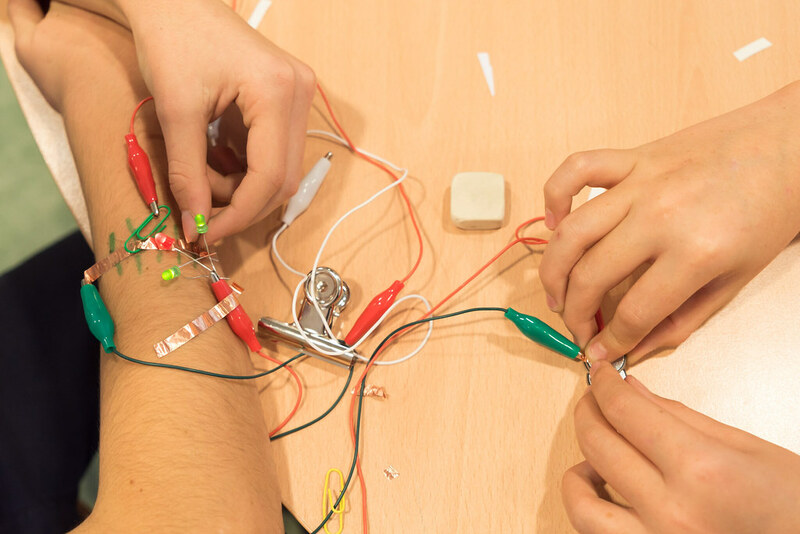 The aim is to familiarize students with new methodologies and materials, so that they can manufacture a prototype of a wearable electronic device. 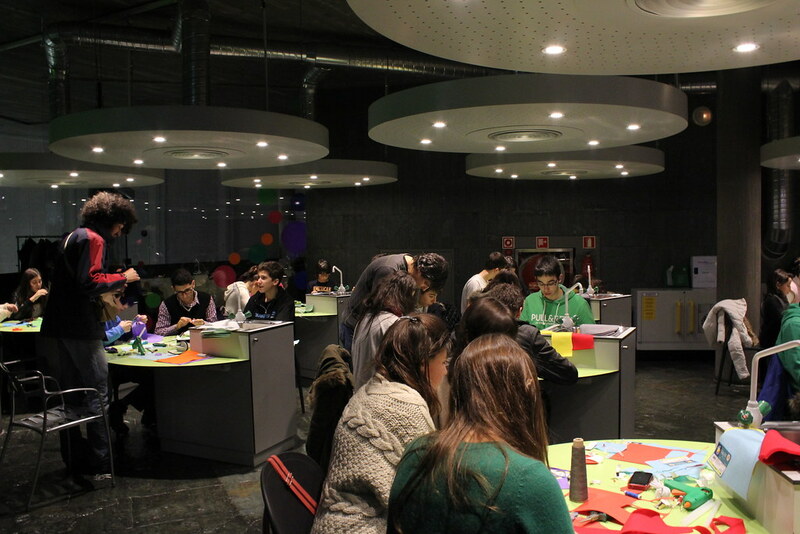 This workshop tooks place as one of the activities within the community project of scientific dissemination KiiCS (Knowledge Incubation in Innovation and Creation for Science) . 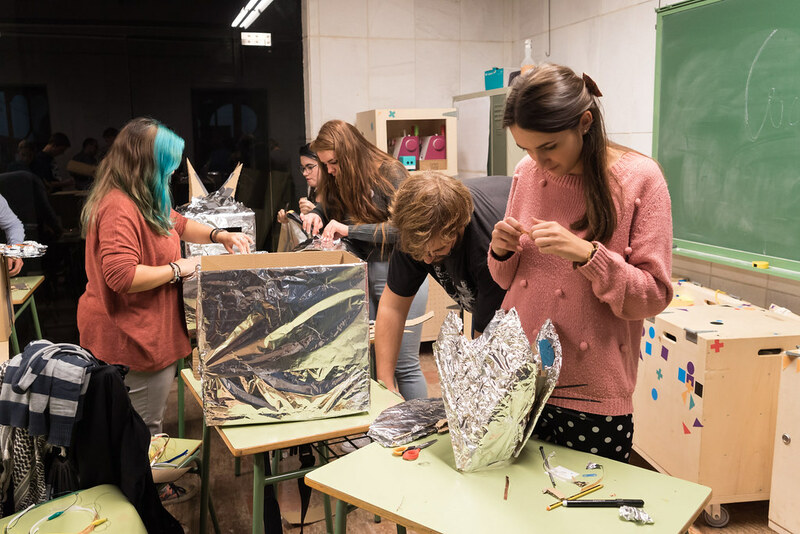 This European project emerges as an innovative proposal to bring together creative people, scientists and young people in a process of co-creation for innovation. 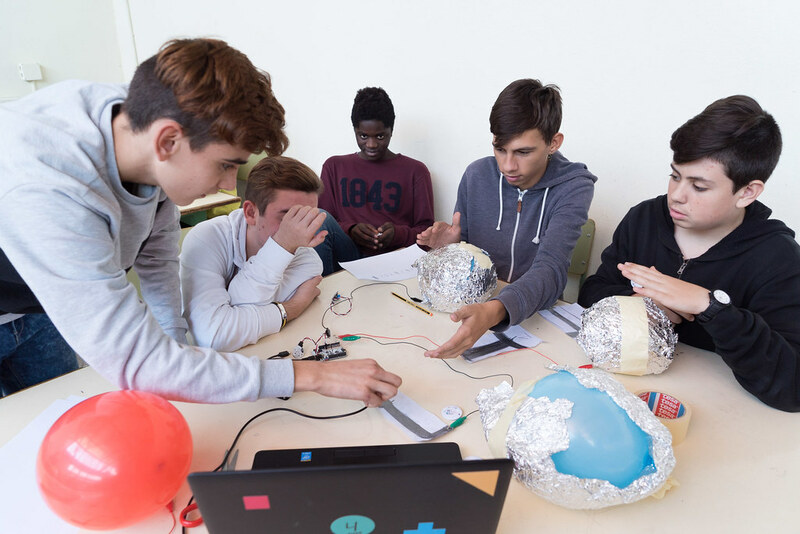 Its objectives include designing activities to attract young people between the ages of 14 and 17 to the world of science and technology, incubating science, art and technology through multidisciplinary actions, or creating business opportunities if the ideas of Science, art and technology have enough quality and interest to reach the market. 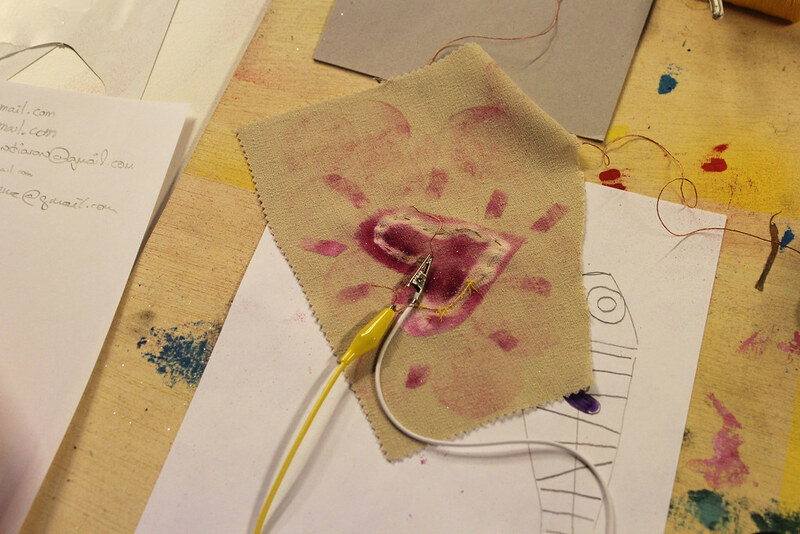 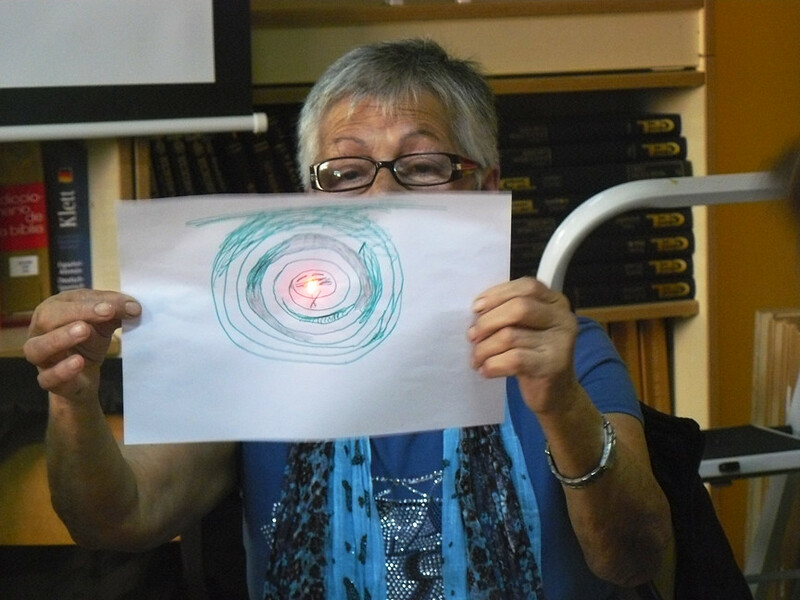 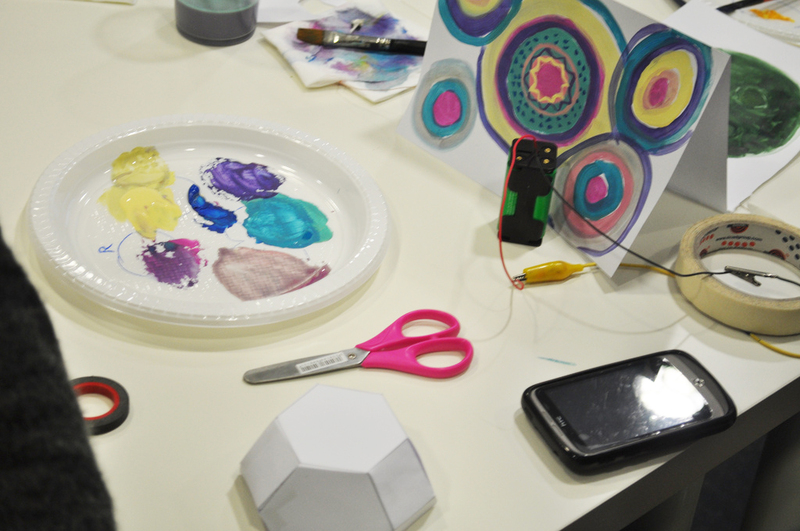 This workshop intends that children have their first contact with electronics. 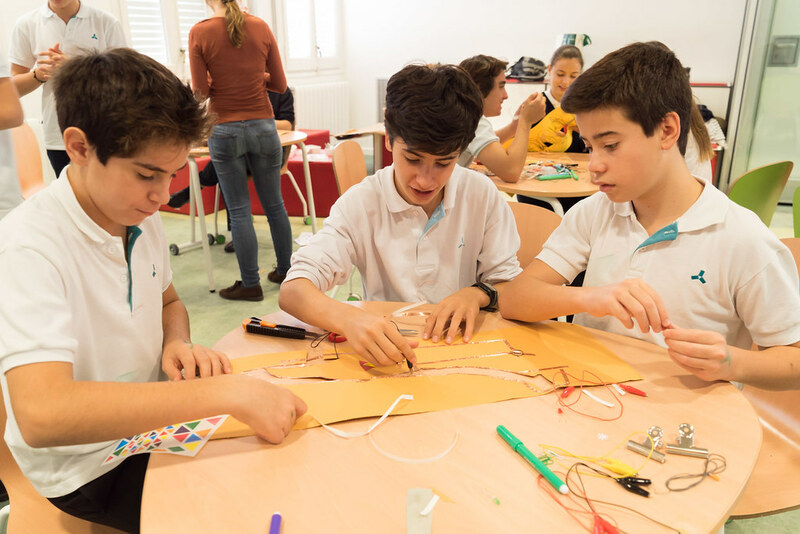 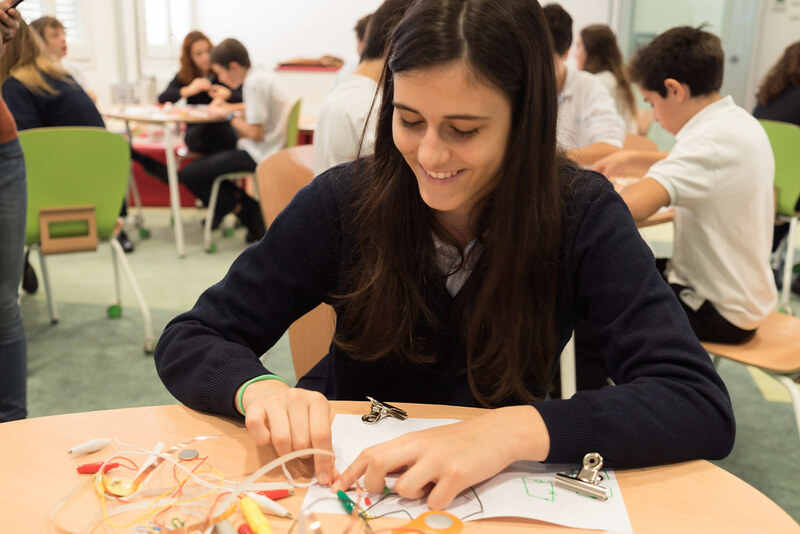 During the activity, you will acquire knowledge of basic electronics, materials and will develop creative skills such as sewing, gluing or coloring. 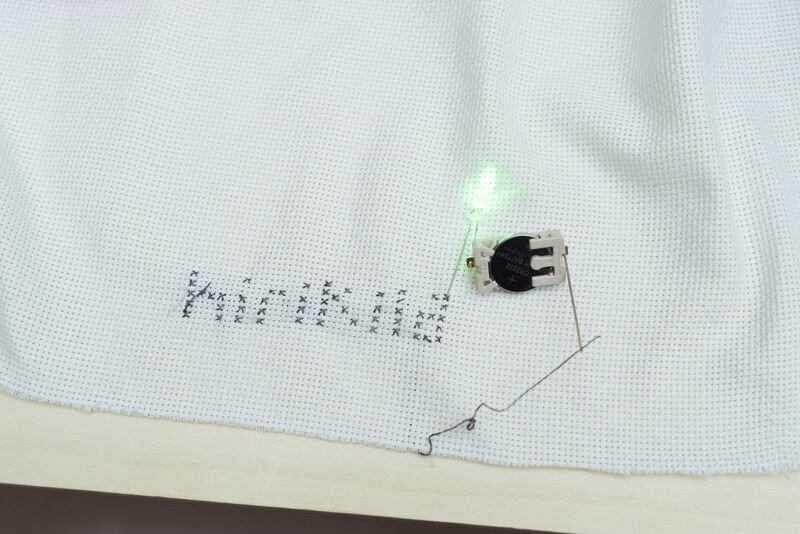 D.I.Y. 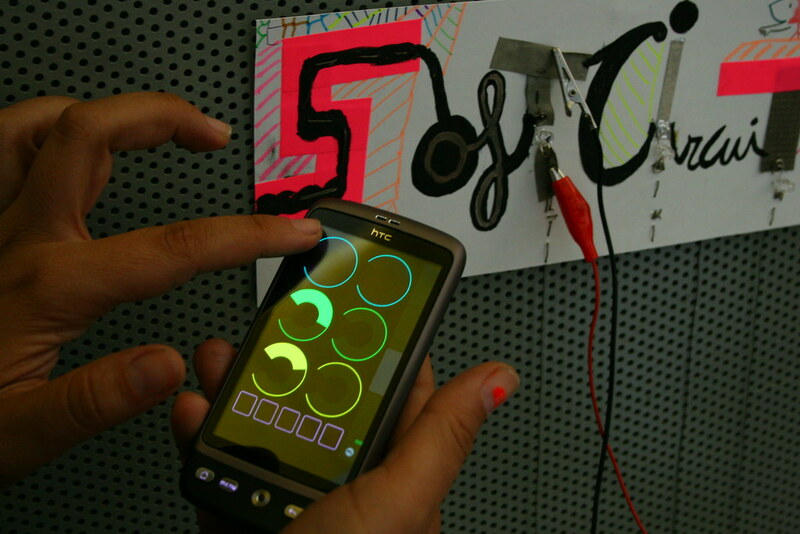 Interactive painting techniques + electronics will allow participants with non-technical-education to learn basic skills and electronics concepts that include combining reactive paints with traditional art techniques. 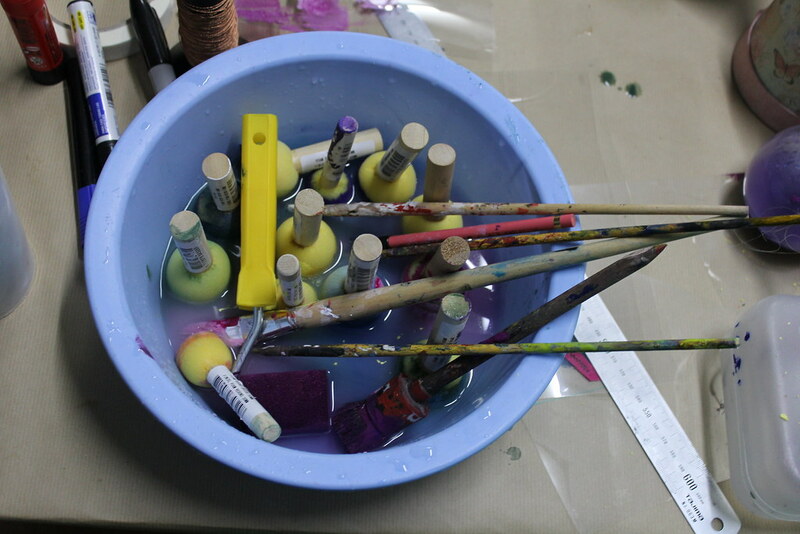 Participants will learn color theory by mixing reactive paints with traditional art techniques, such as watercolor or acrylic painting, as a bridge to introduce them to basic electronics concepts in order to make a basic animation on their painting or illustration. 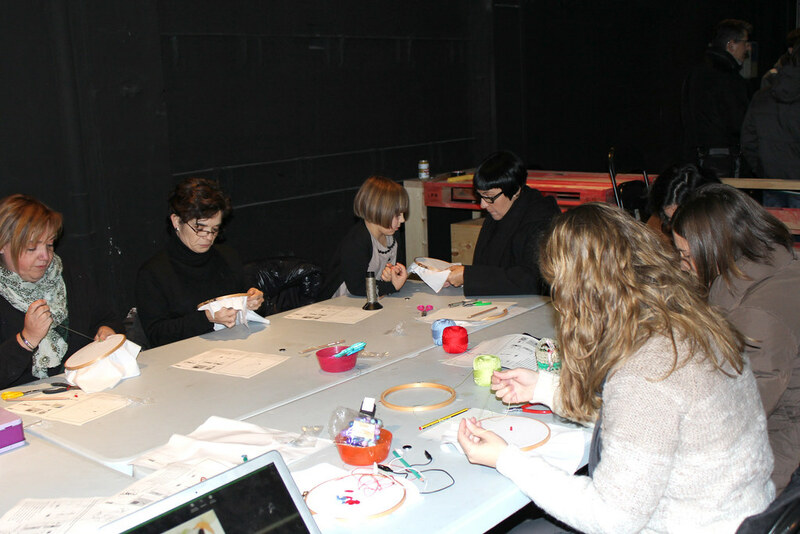 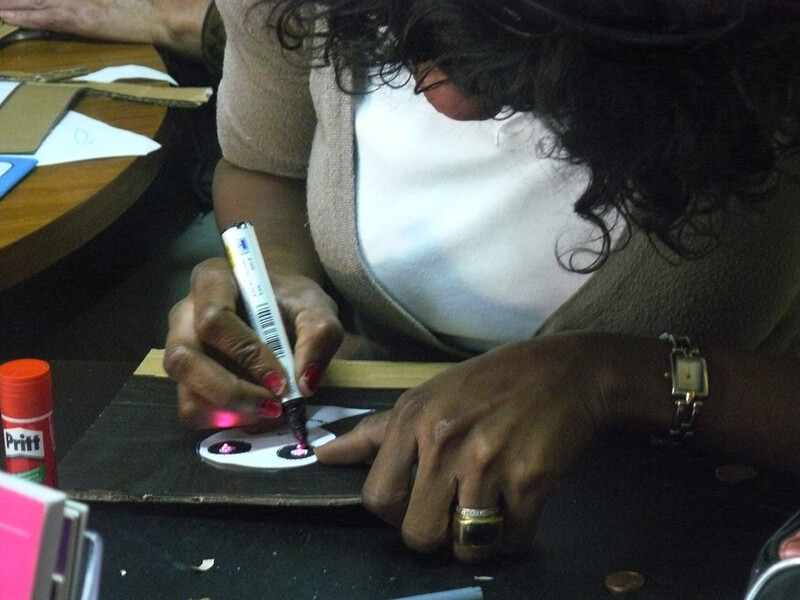 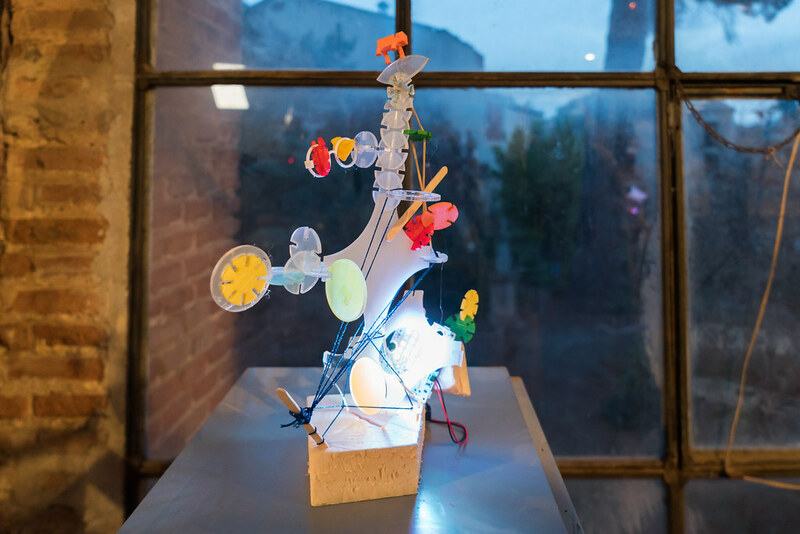 The goal of the studio is to familiarize participants with new available materials, introduce them to simple circuitry concepts and to learn new practices of creating artwork with electronics. 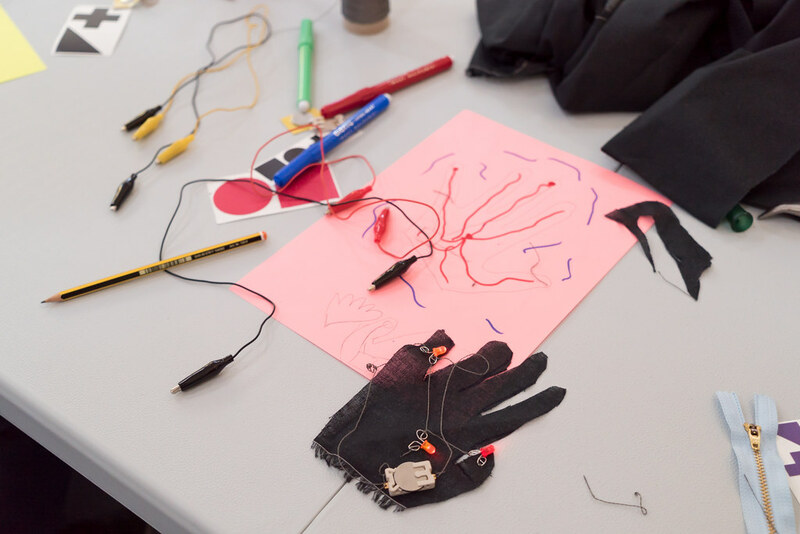 This workshop serves as a basic introduction to electronics and exploration of new forms of interaction from the integration of technology into textiles. 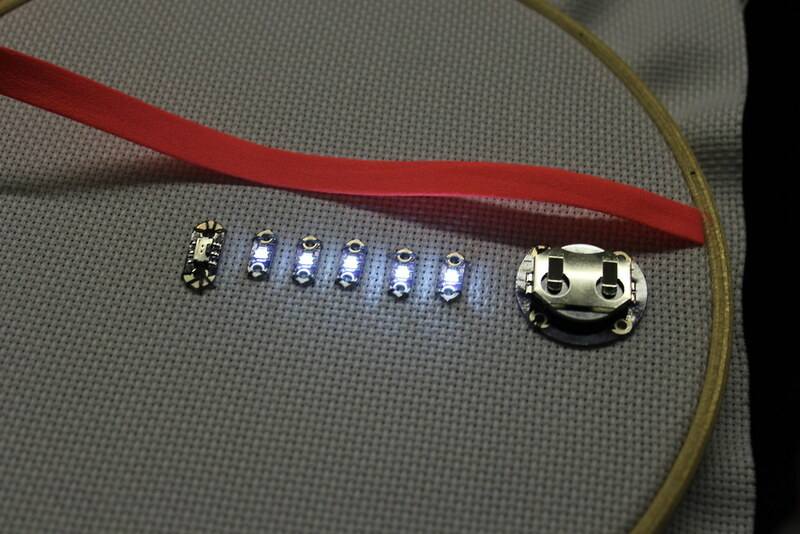 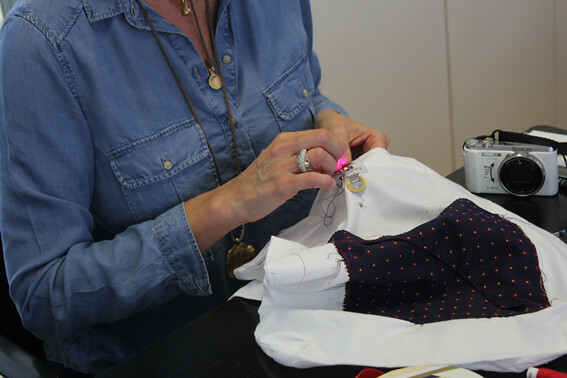 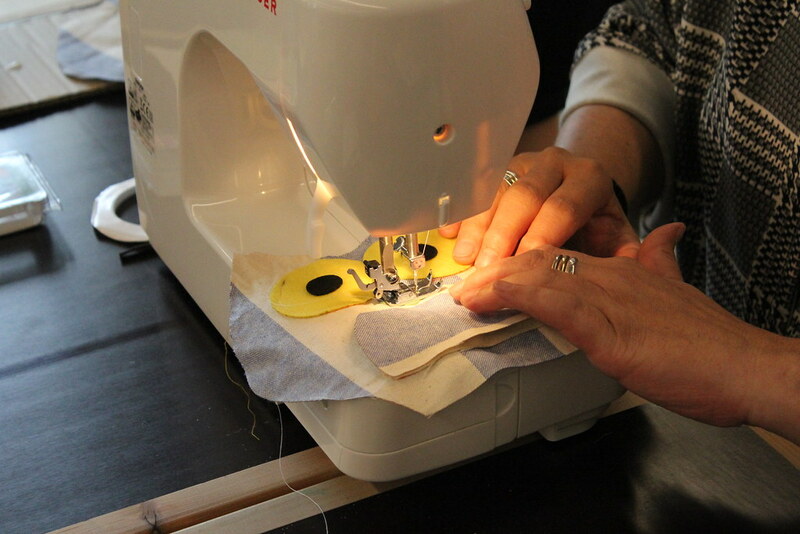 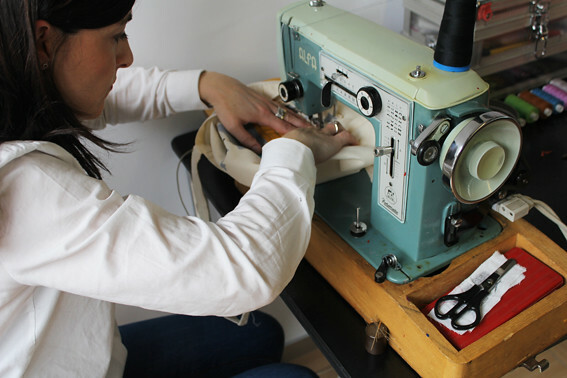 Through the process of designing and sewing will learn to build a basic circuit on fabric. 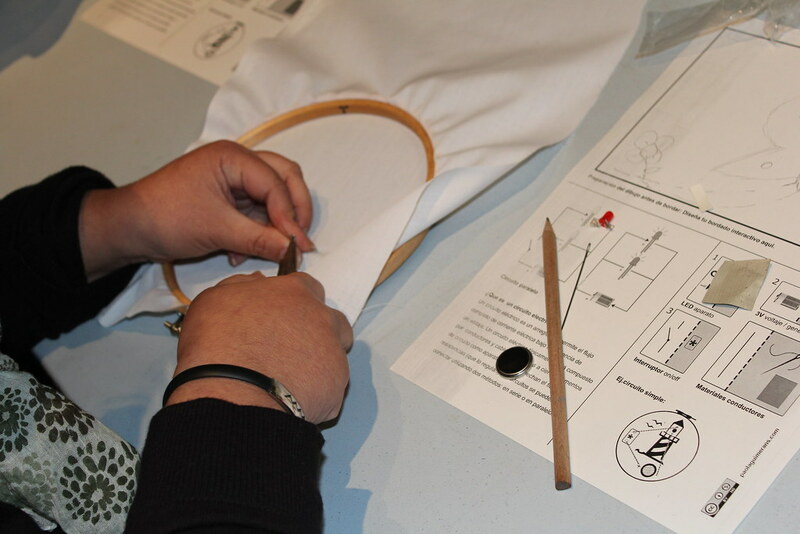 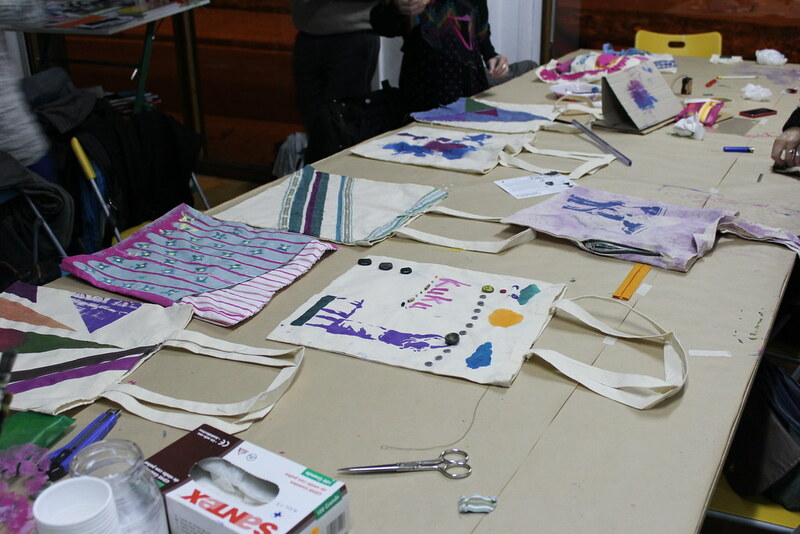 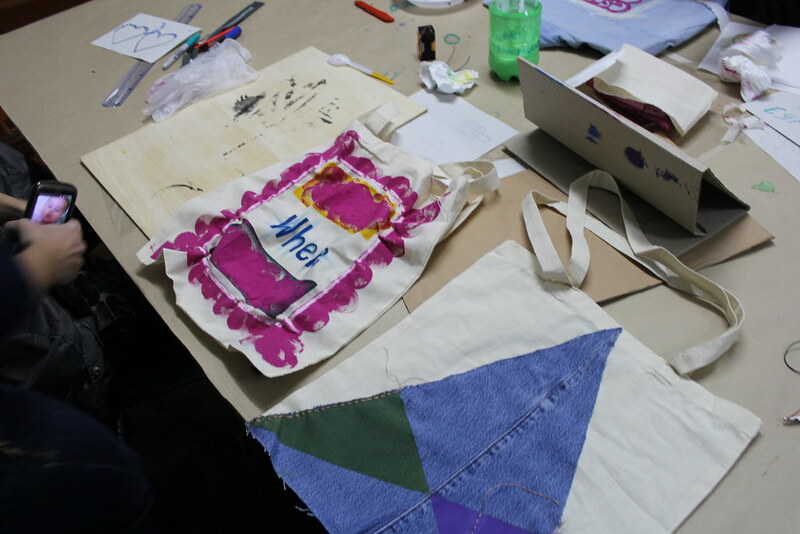 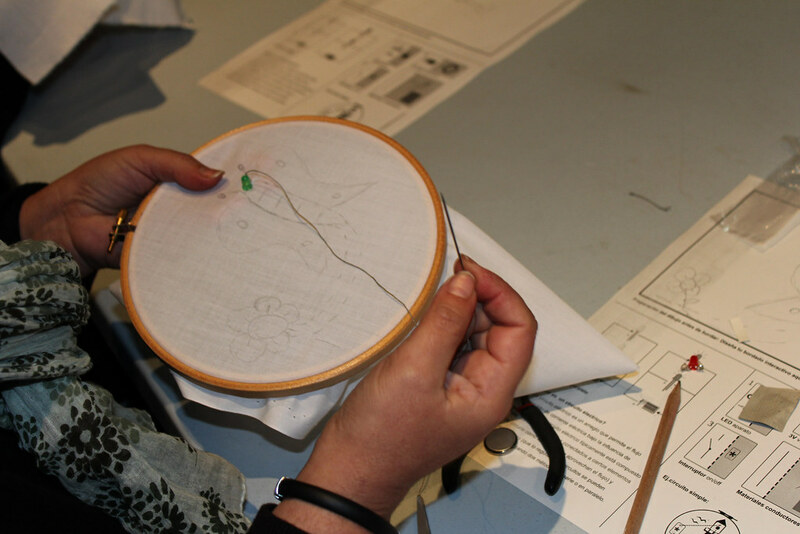 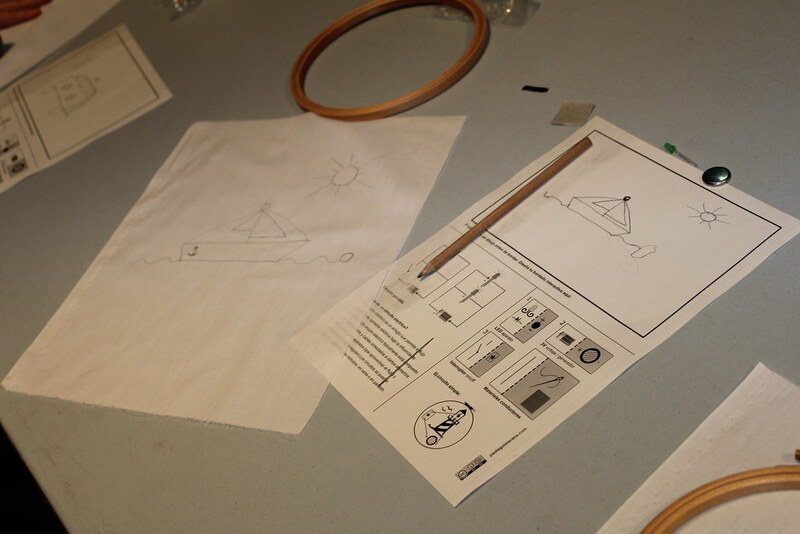 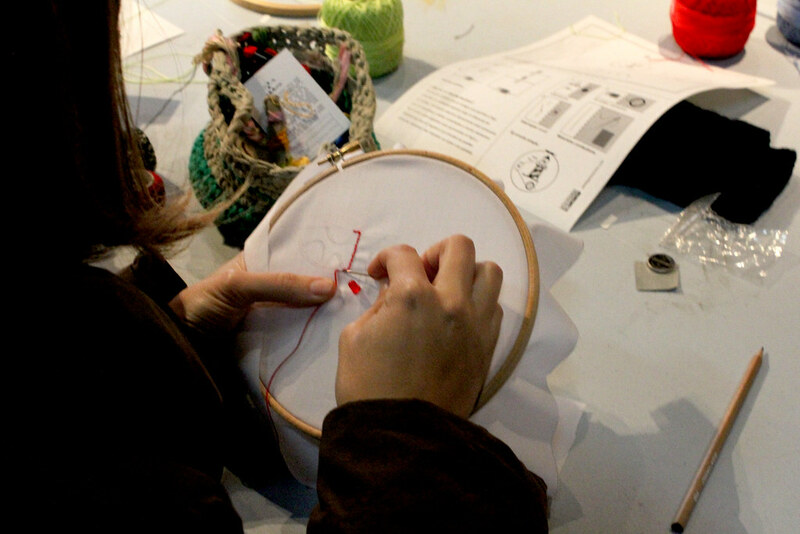 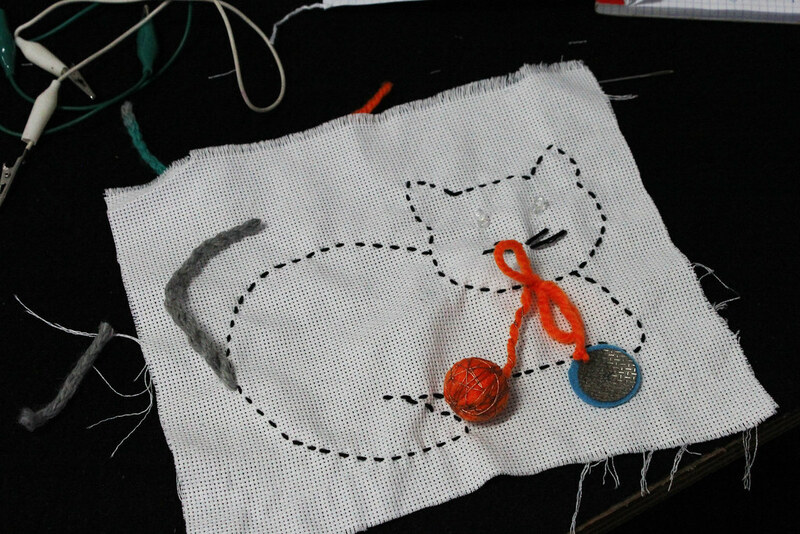 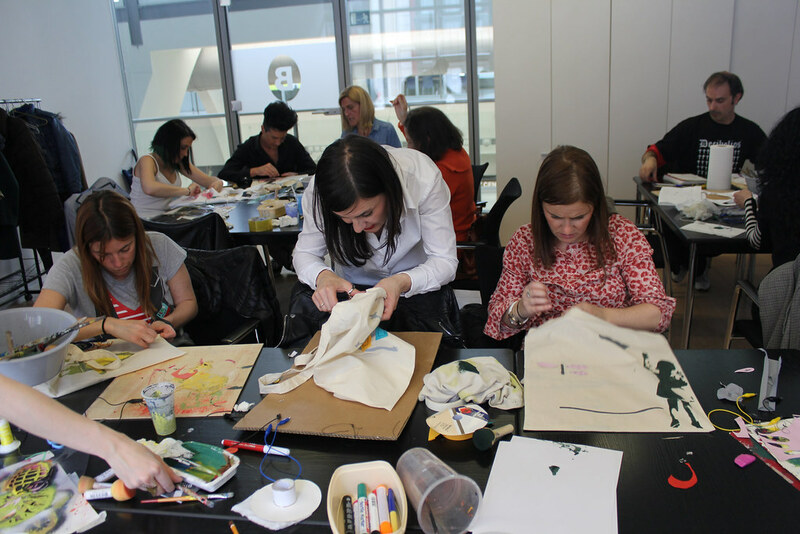 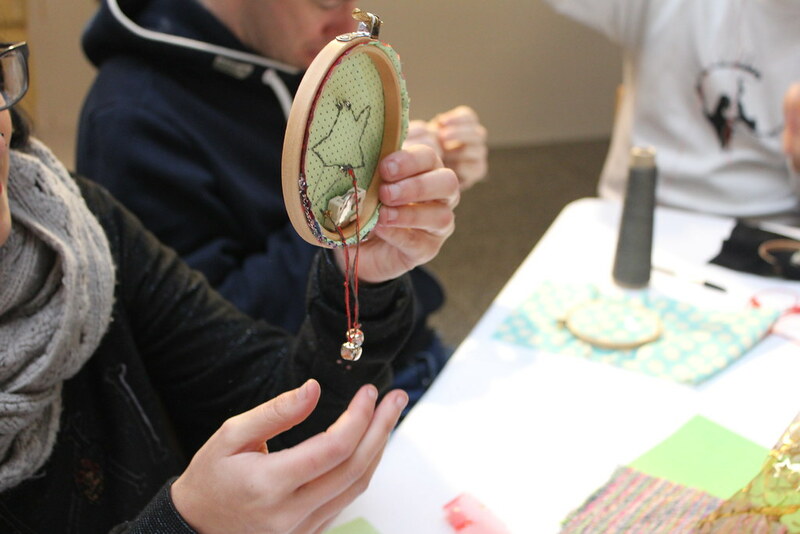 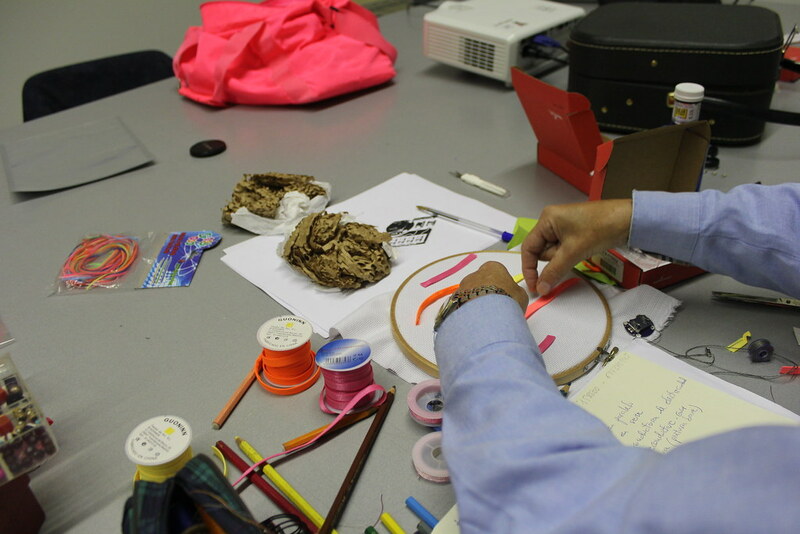 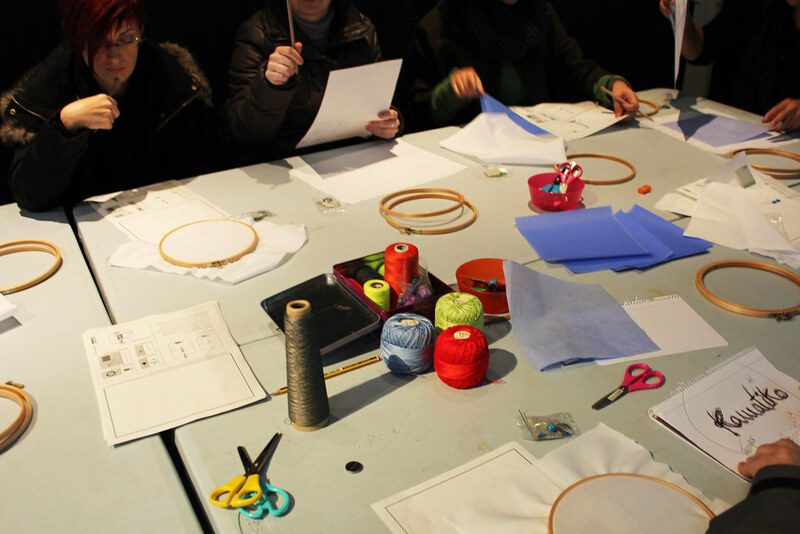 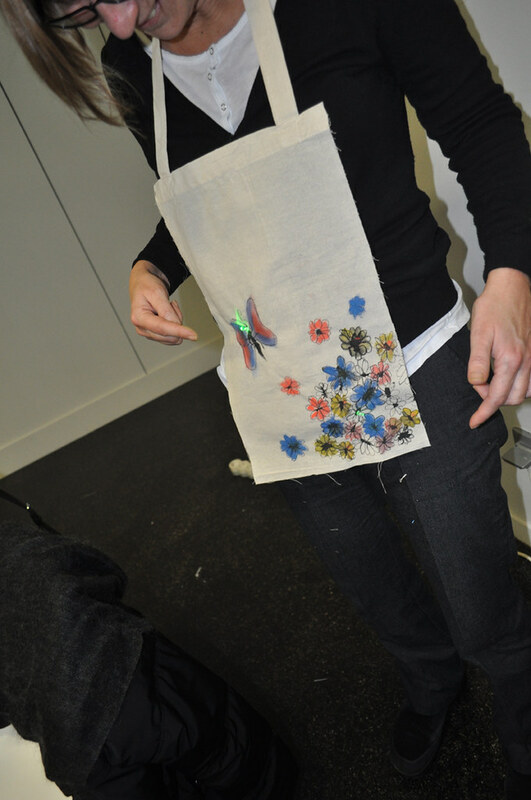 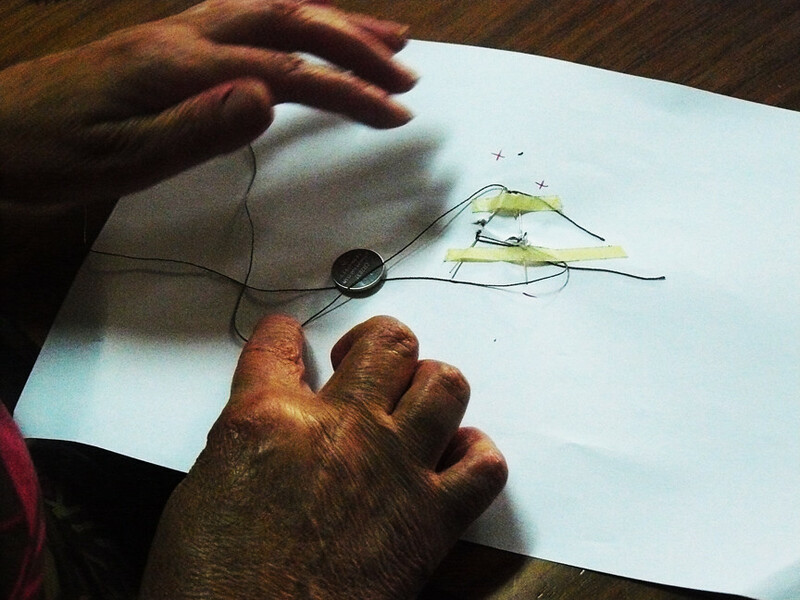 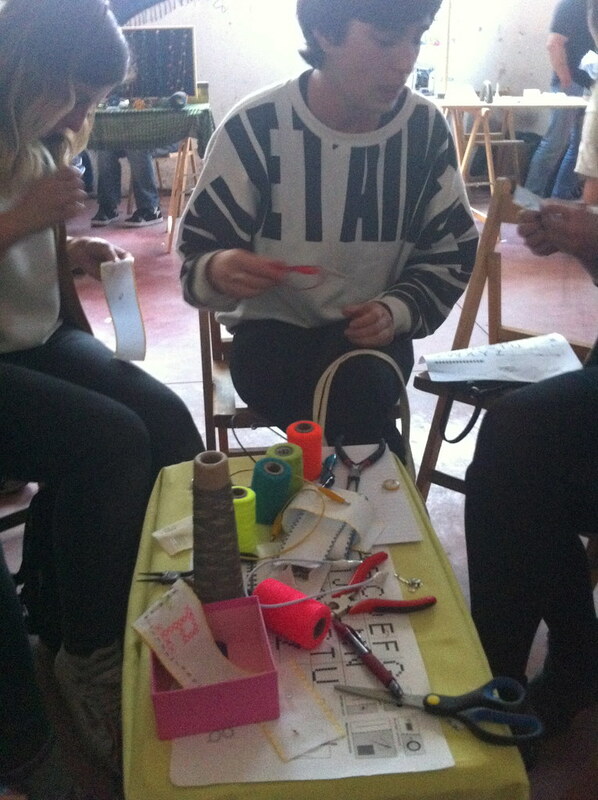 Each participant will receive a kit with all the materials needed to make their own interactive embroidery. 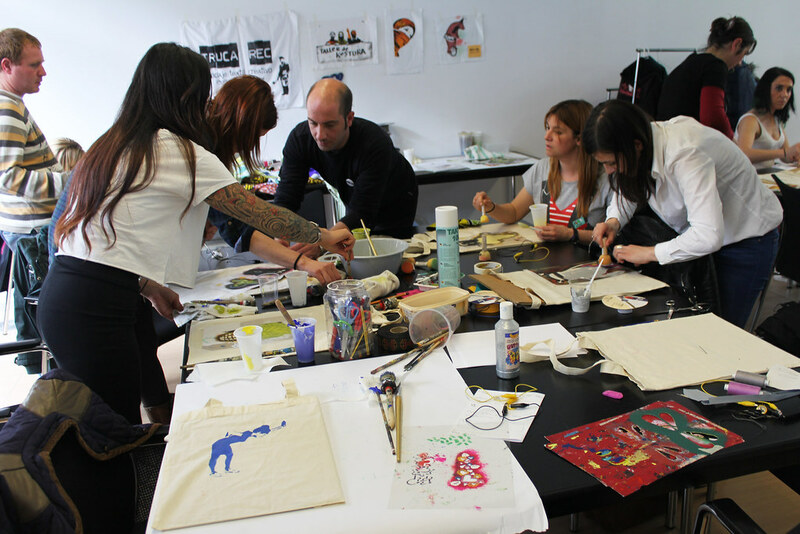 The workshop is aimed at people with creative practices who wish to diversify the interaction capacity of their projects. 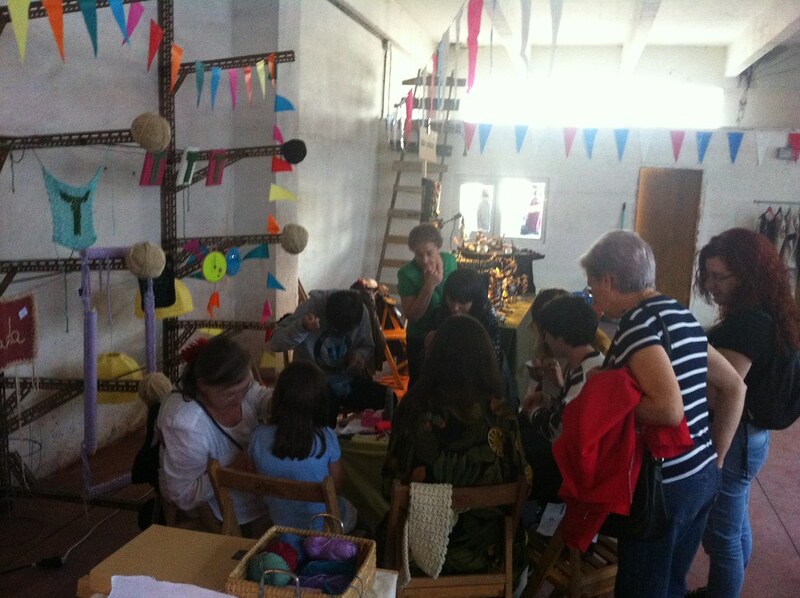 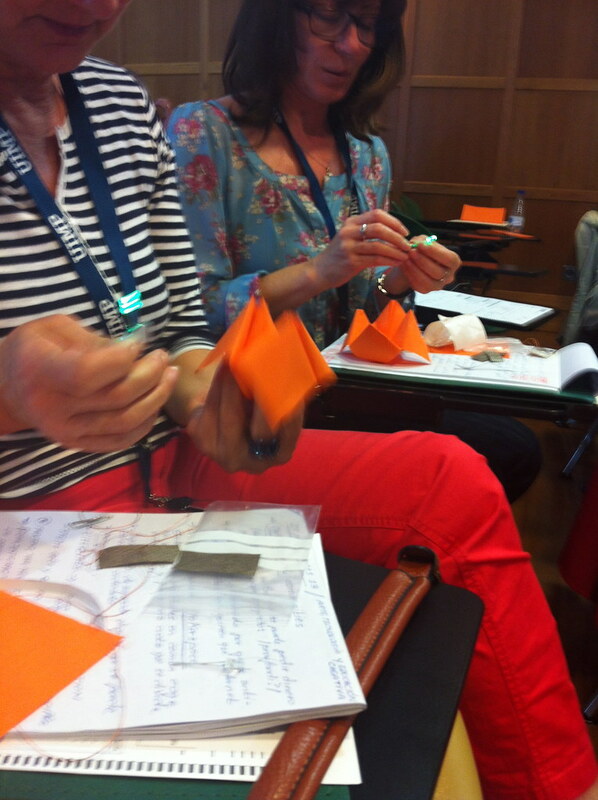 This workshop took places in the week of manufacture EGINZALEAK! 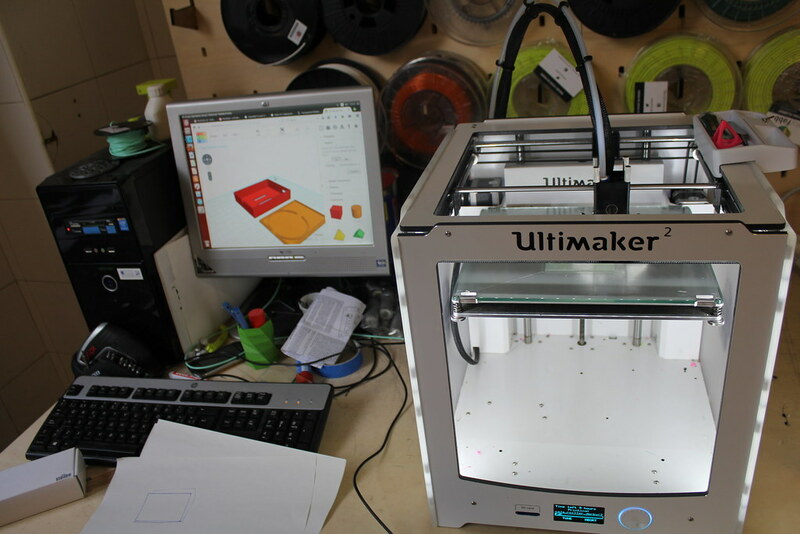 / Digital Craftsmen, which encompasses a series of activities around the digital manufacturing, DIY software / hardware, and the recovery of processes and craft techniques. 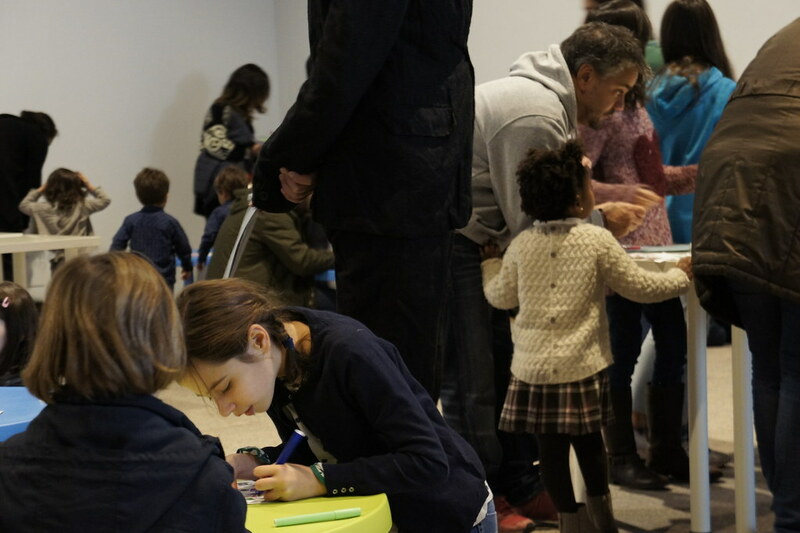 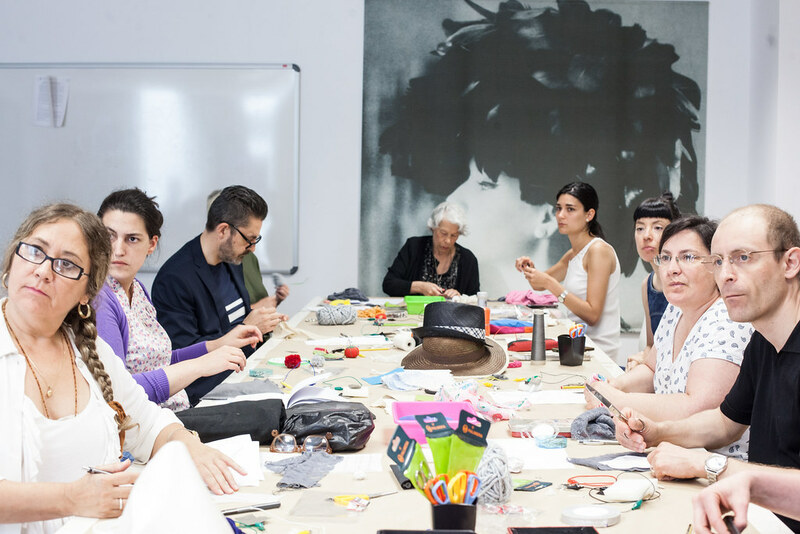 This series of activities establish a framework of joint work between the laboratories of Arteleku and Tabakalera International Center for Contemporary Culture. 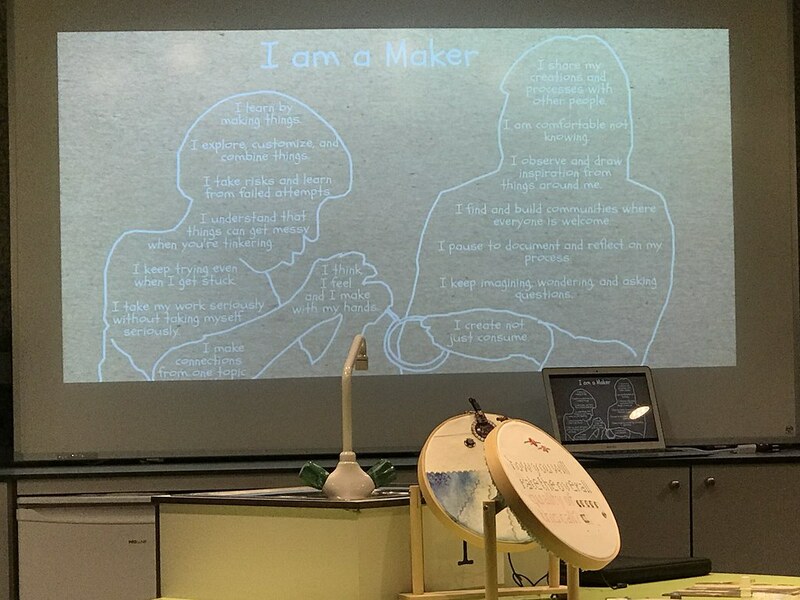 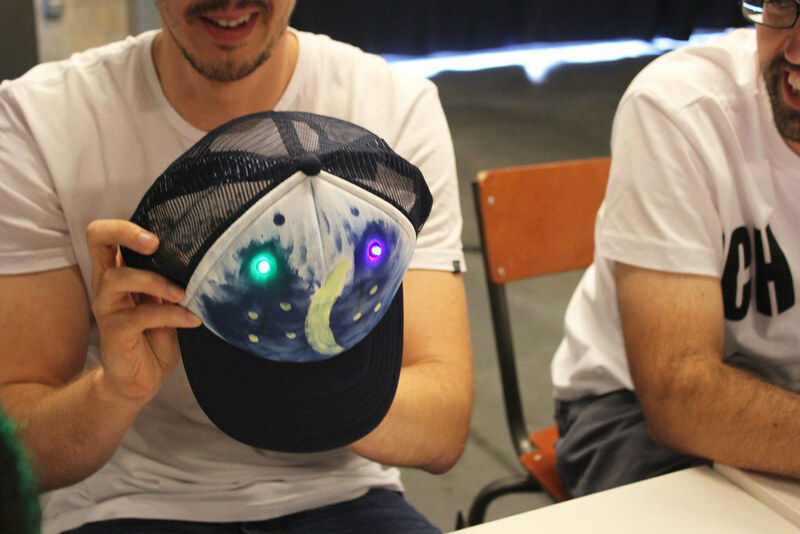 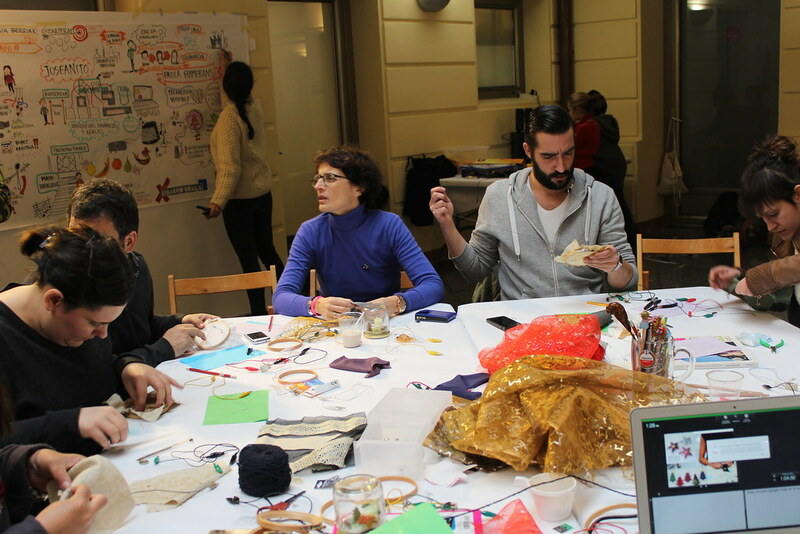 This workshop is aimed at partners of the makerspace Bilbaomakers who want to approach new techniques for the integration of technology in textiles and learn creative electronics do it yourself. 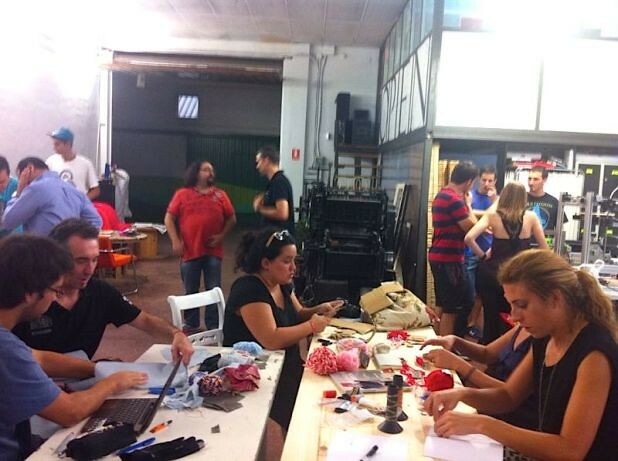 Bilbao Makers is a non-profit association that meets to learn in company. 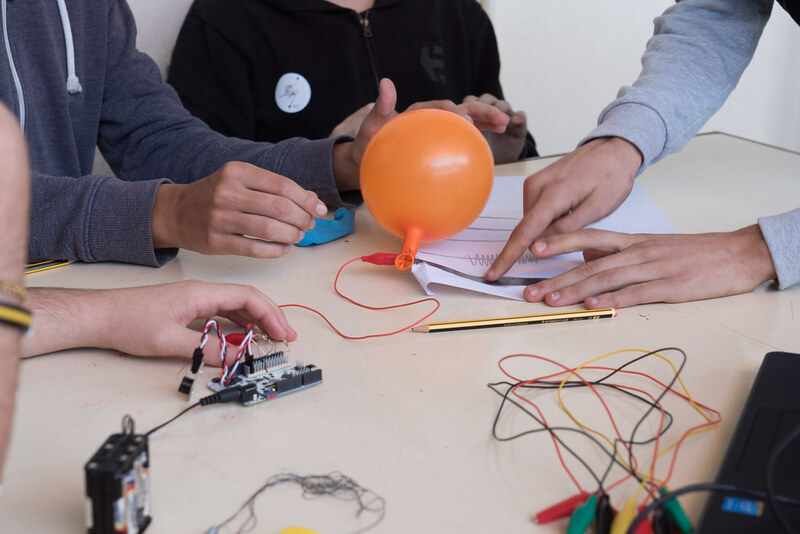 They are passionate about science and technology and try to promote their development and dissemination through the realization of projects. 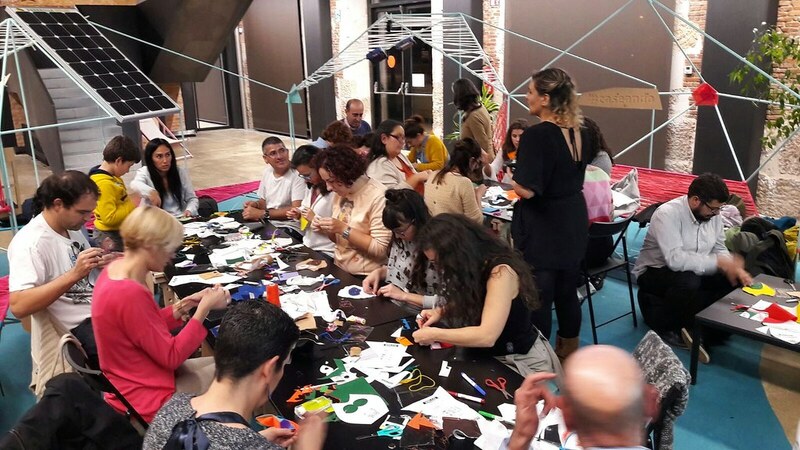 Este taller esta dirigido a artistas plásticos e ilustradores. 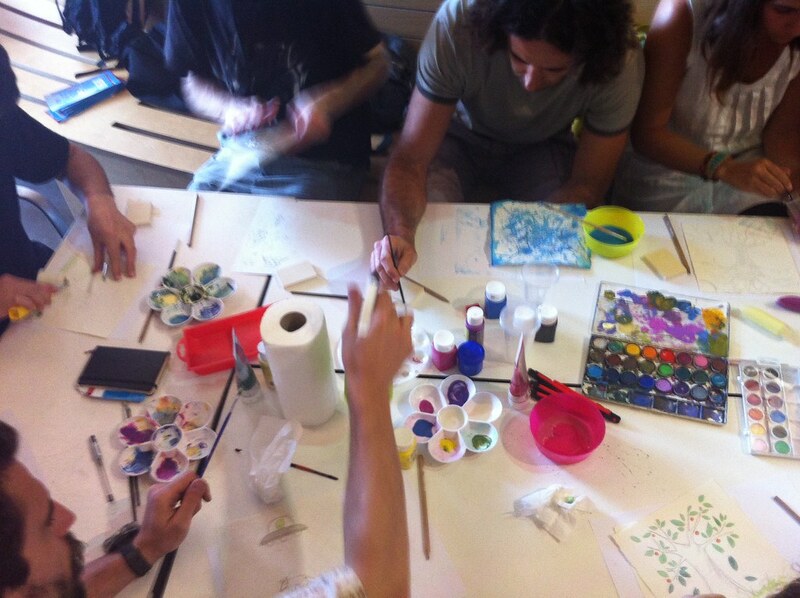 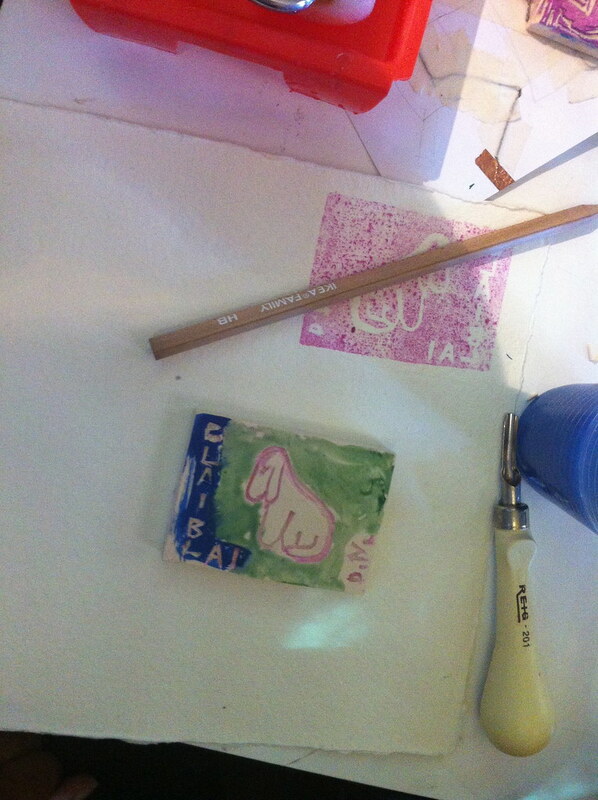 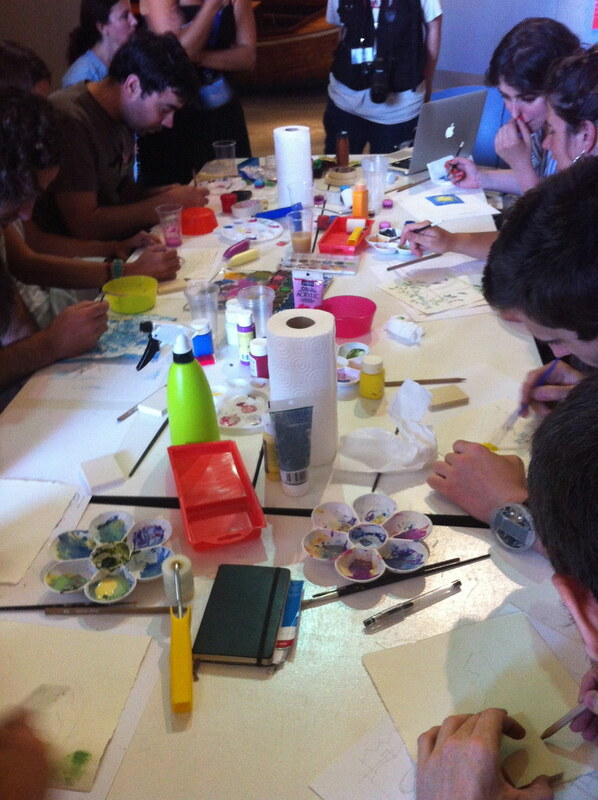 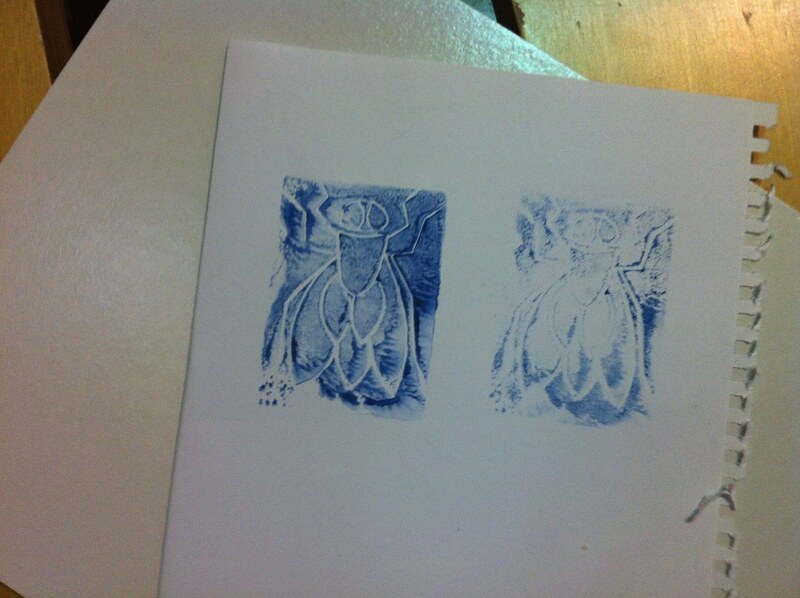 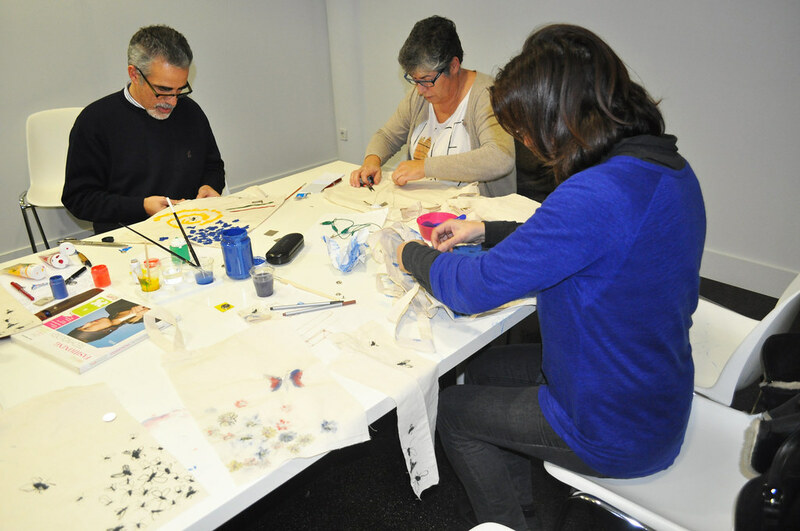 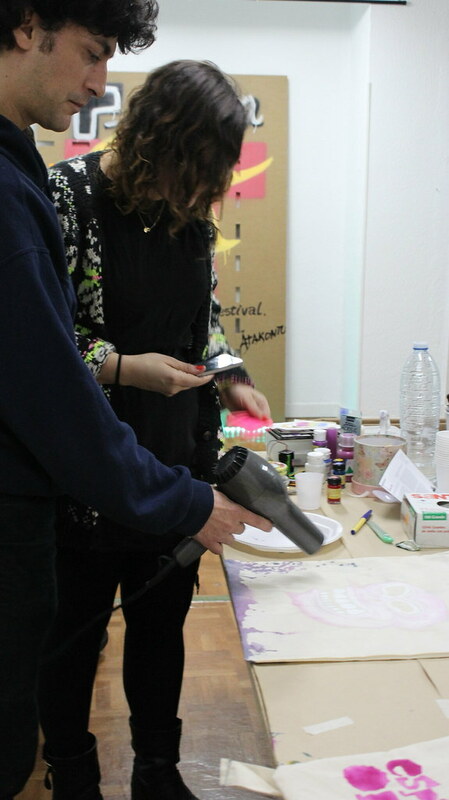 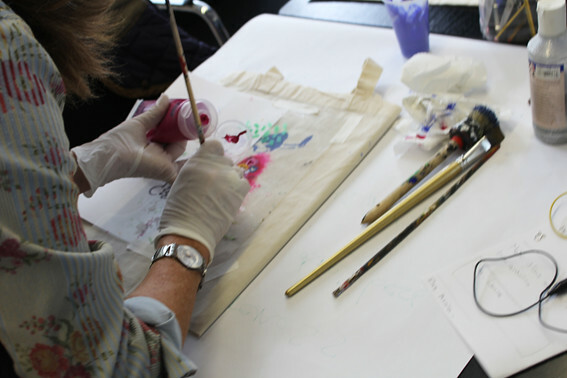 Durante el taller los participantes realizaran un grabado casero combinando pinturas reactivas al calor junto con temperas o acuarelas. 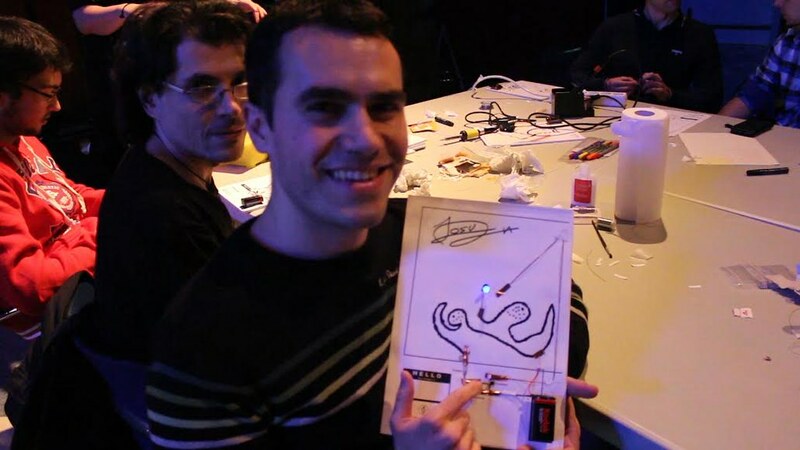 Ademas, aprenderán conceptos básicos de electrónica para poder realizar posteriormente una animación simple en sus grabados. 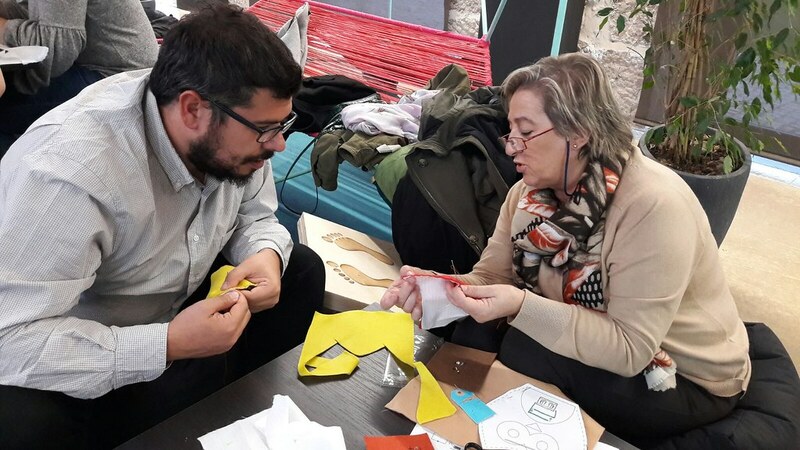 En el taller cada participante recibirá un kit con todos materiales necesarios para trabajar durante la actividad. 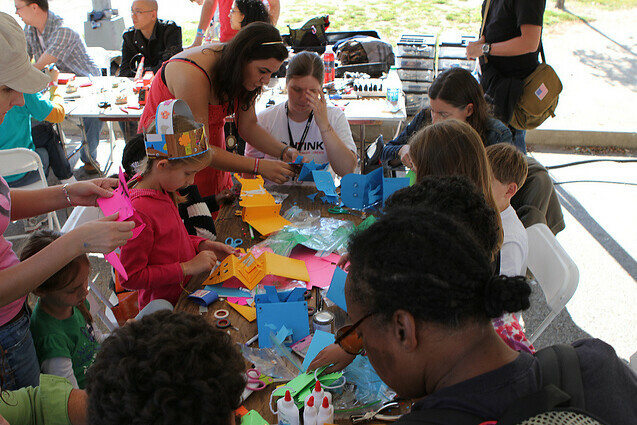 La Maker Faire es la mayor feria de inventores y creadores del mundo, un escaparate de invenciones, creatividad e ingenio pensado para todos los públicos, además de una celebración del Movimiento Maker. 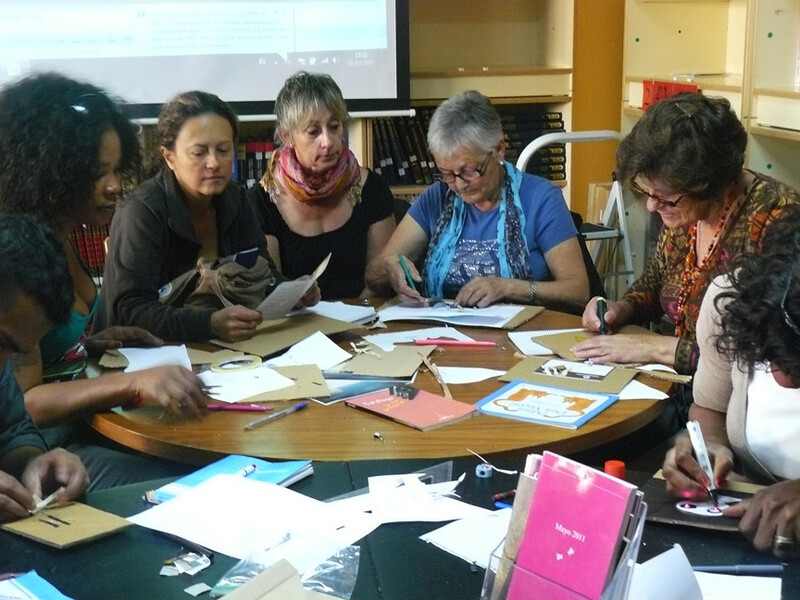 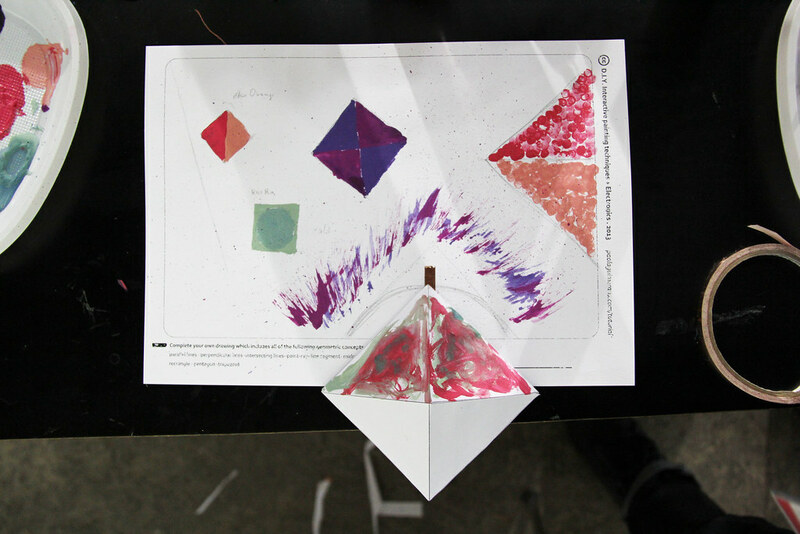 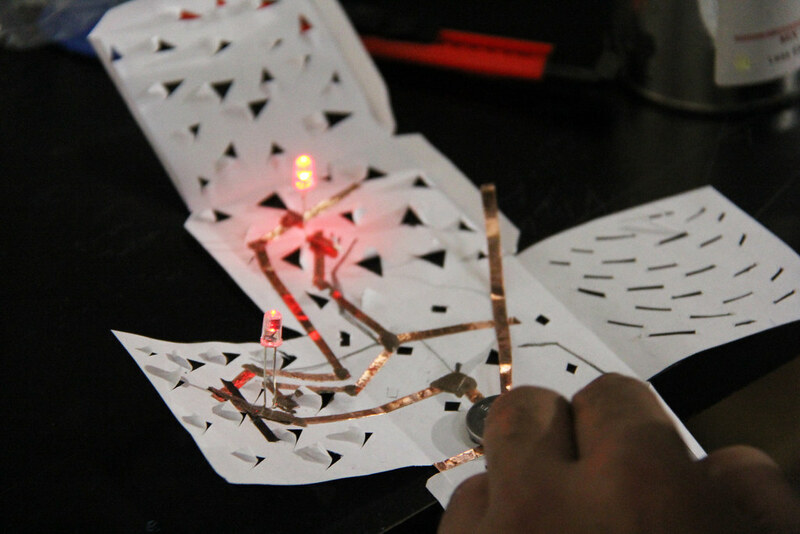 This introductory workshop serves as a basic introduction to electronics and exploration of new techniques for the integration of technology into paper. 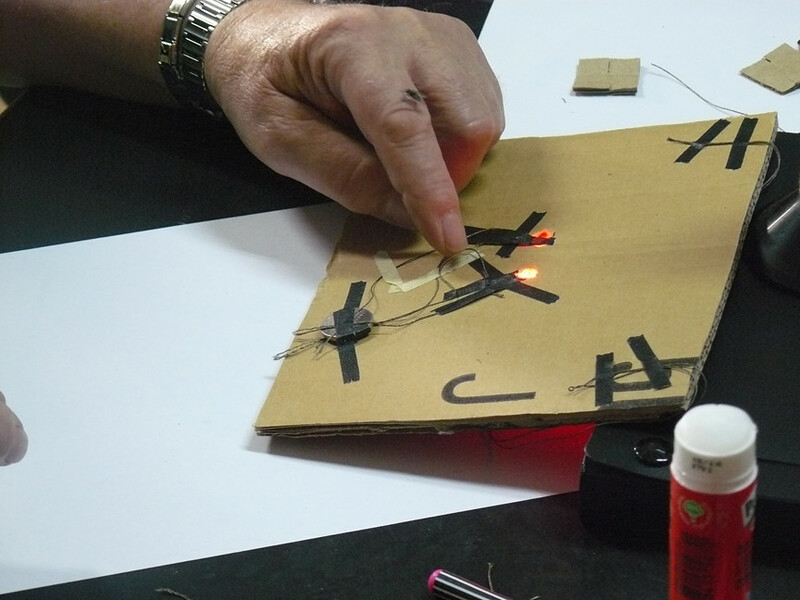 Teachers will be introduced to the basic concepts of electronics and how to apply them to paper based design projects. 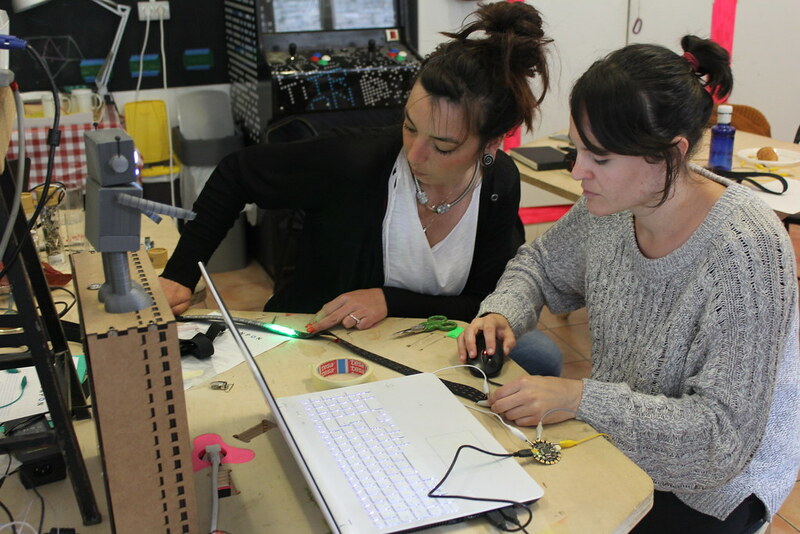 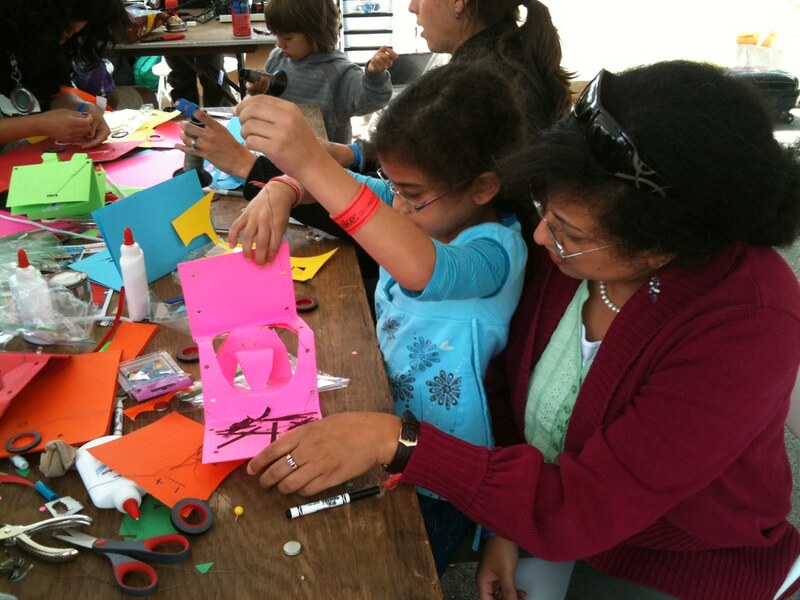 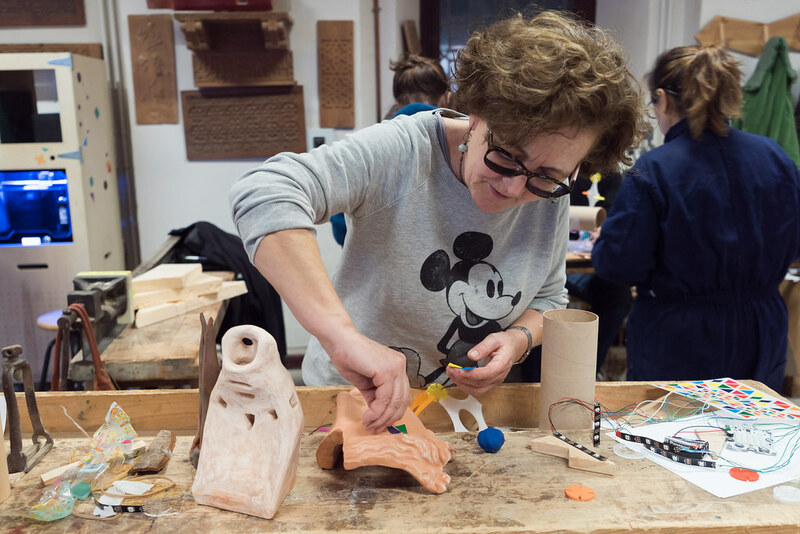 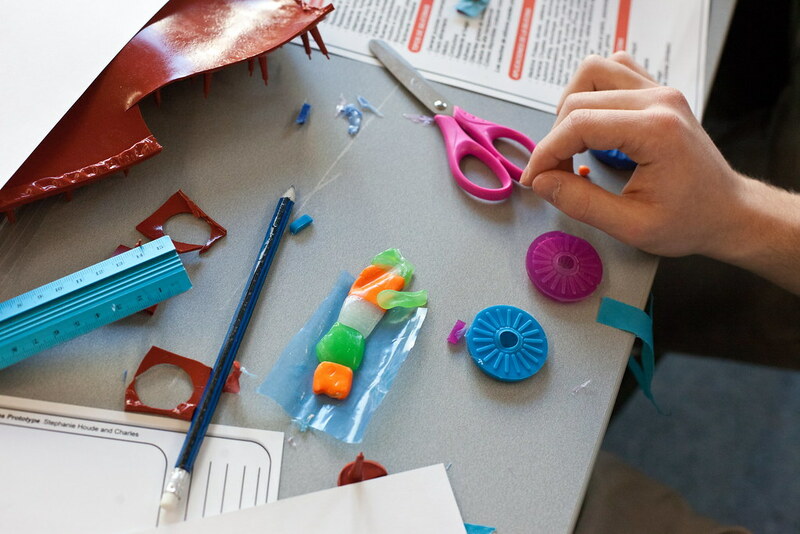 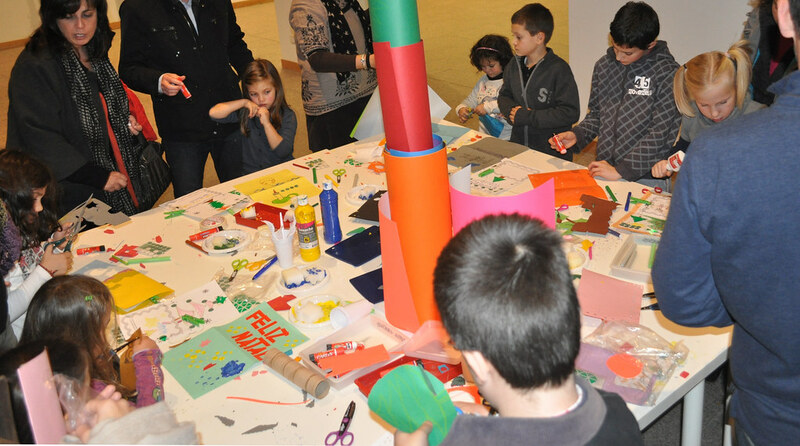 The workshoo will include a lecture about the STEM to STEAM movement and the maker culture. 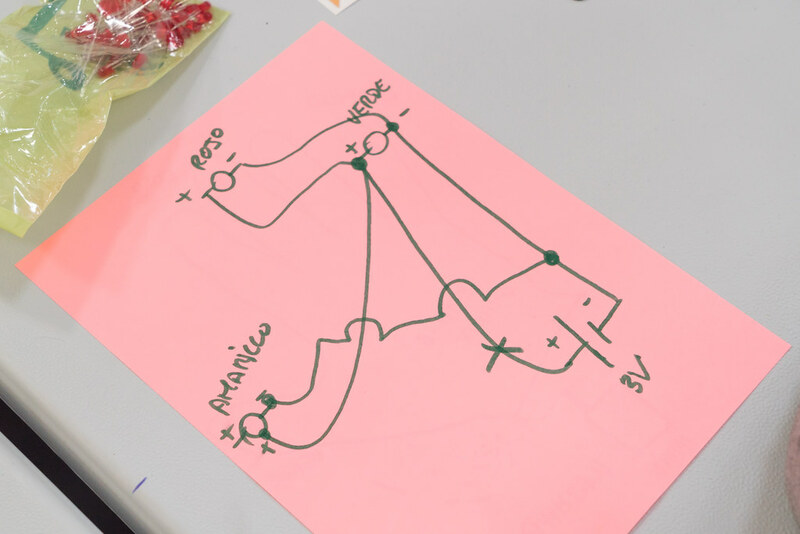 Also, an introduction to electronics theory, identification of simple components, and applying that knowledge to simple skill development projects. 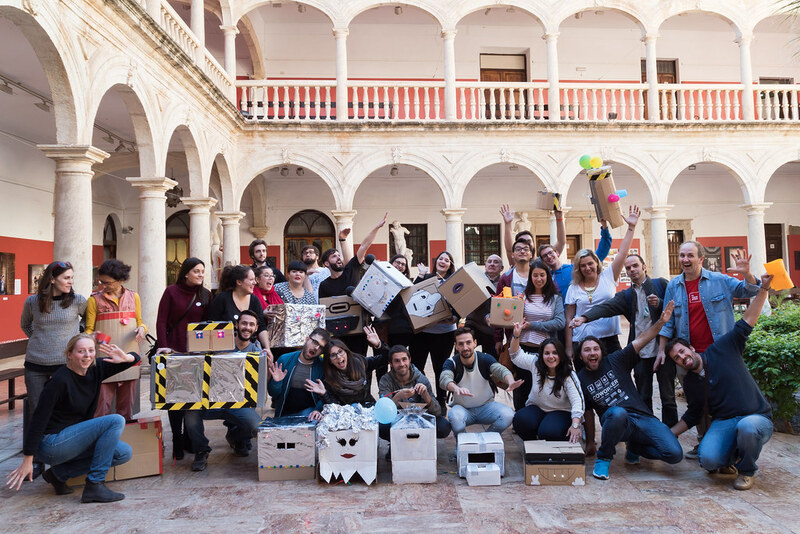 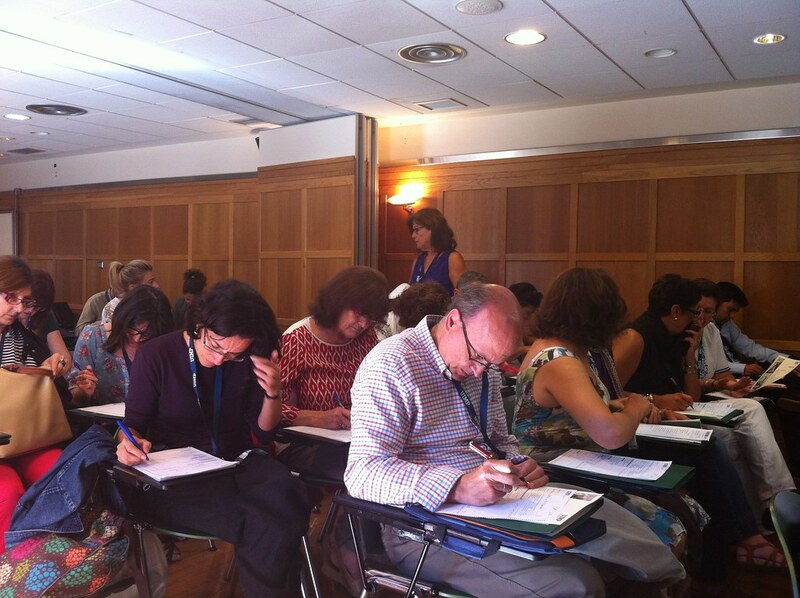 The workshop took place at Palacio de la Magdalena as one of the Menendez Pelayo International University Summer Courses. 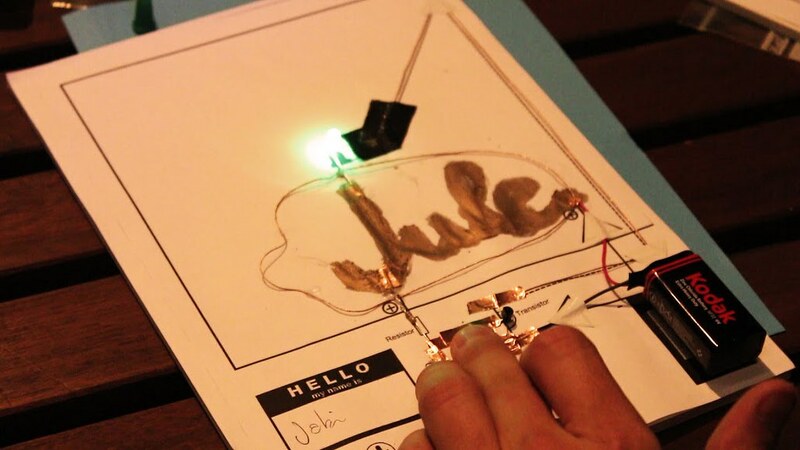 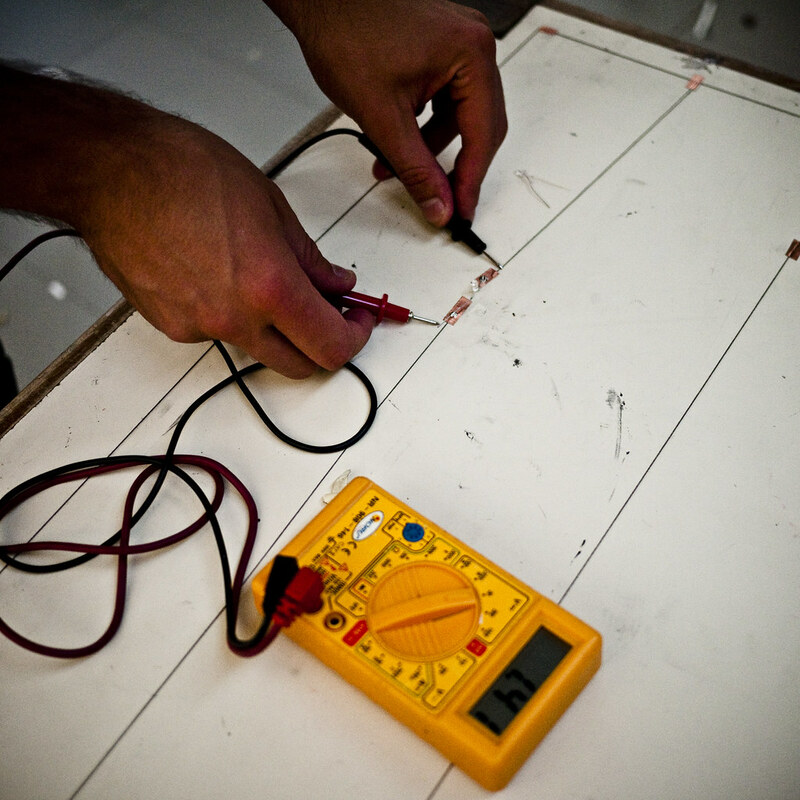 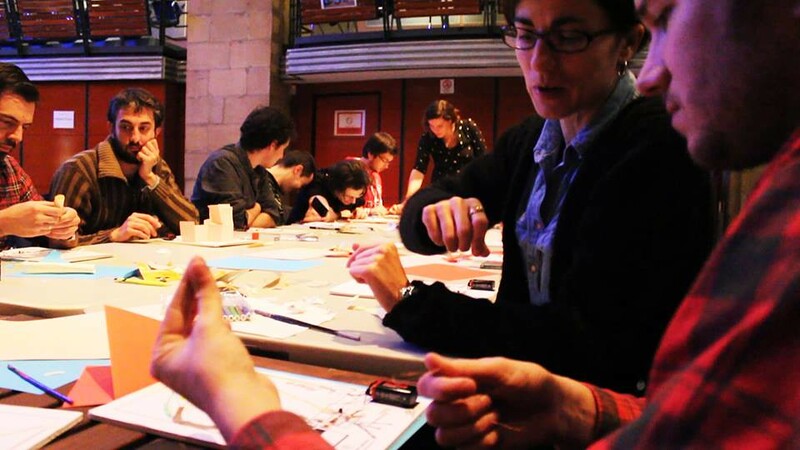 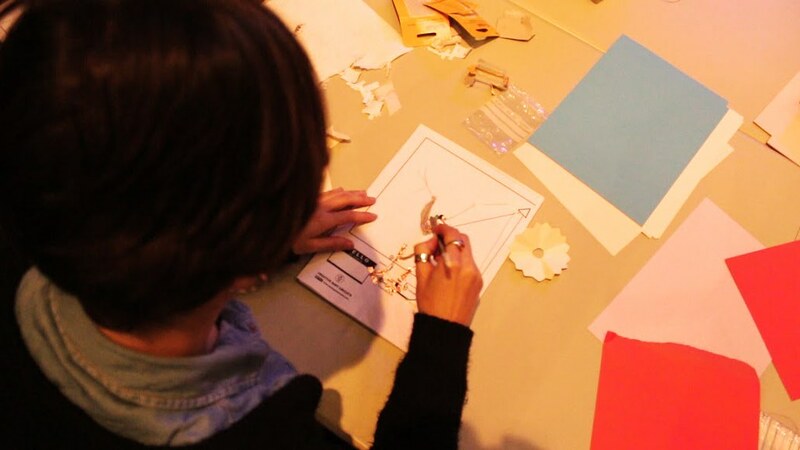 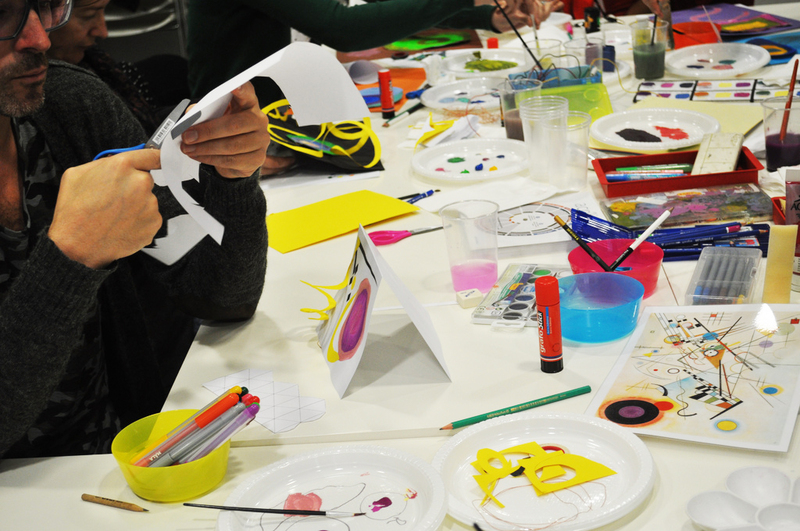 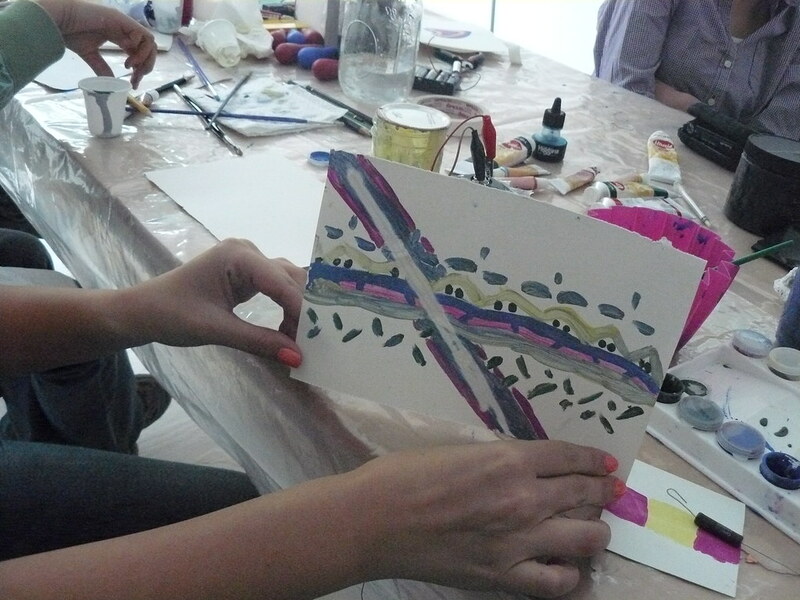 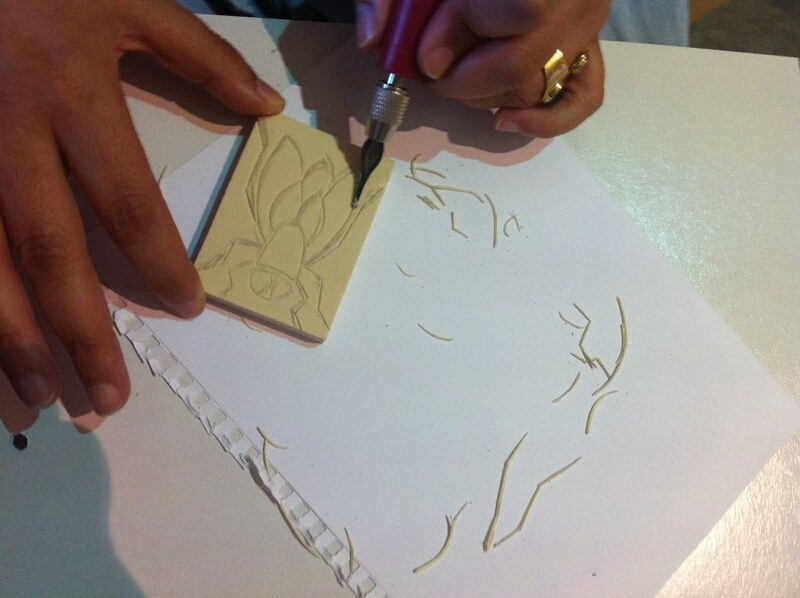 This workshop is an introduction to paper circuits for adults. 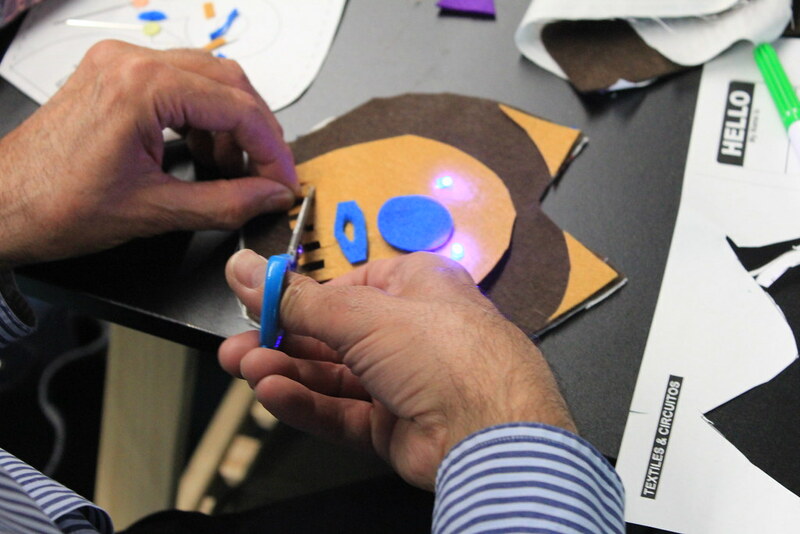 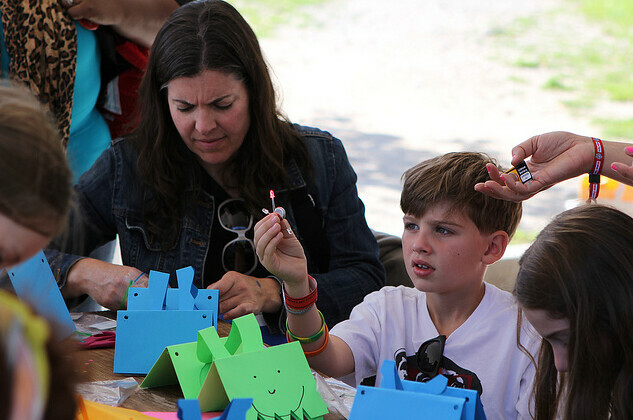 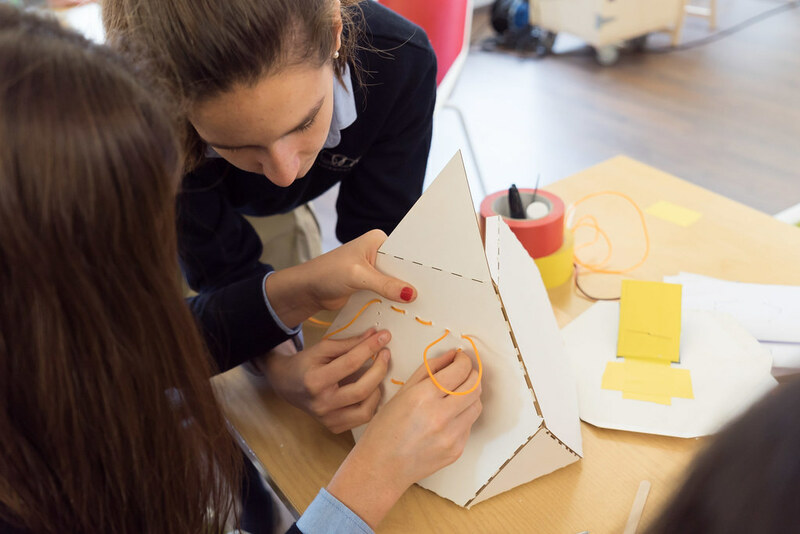 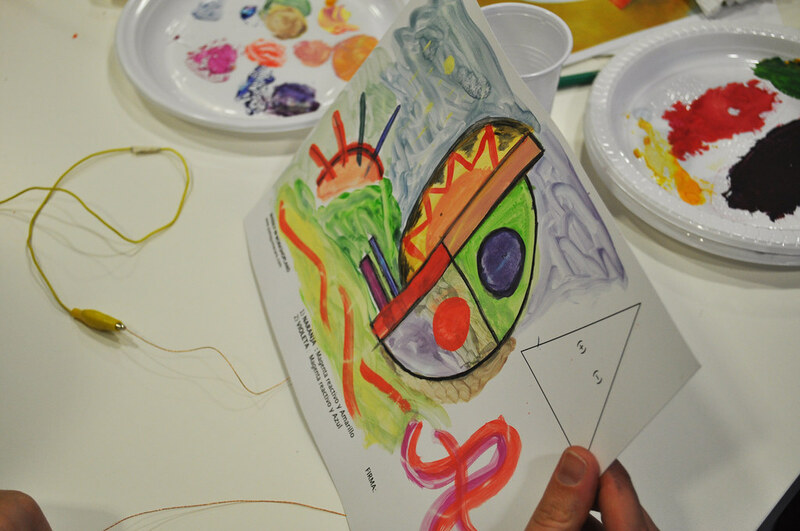 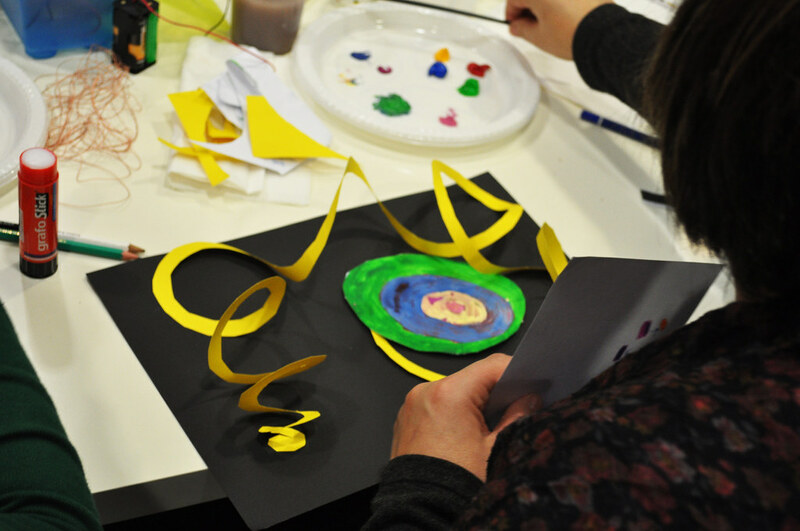 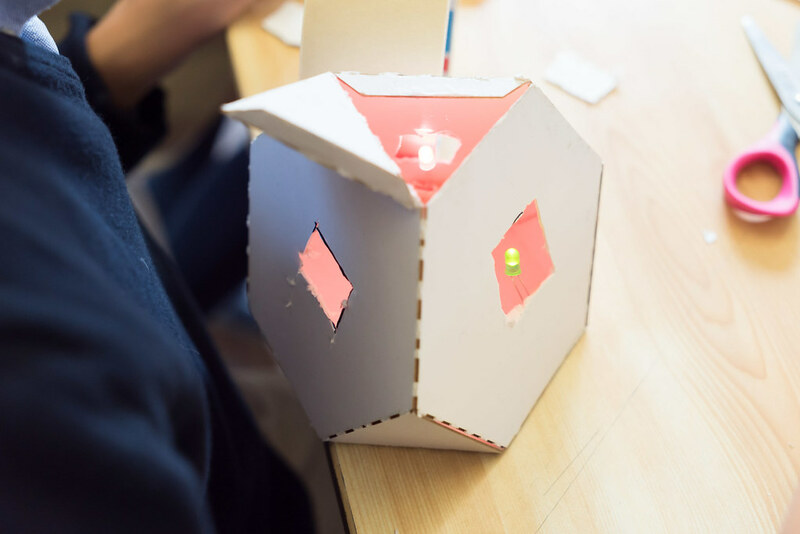 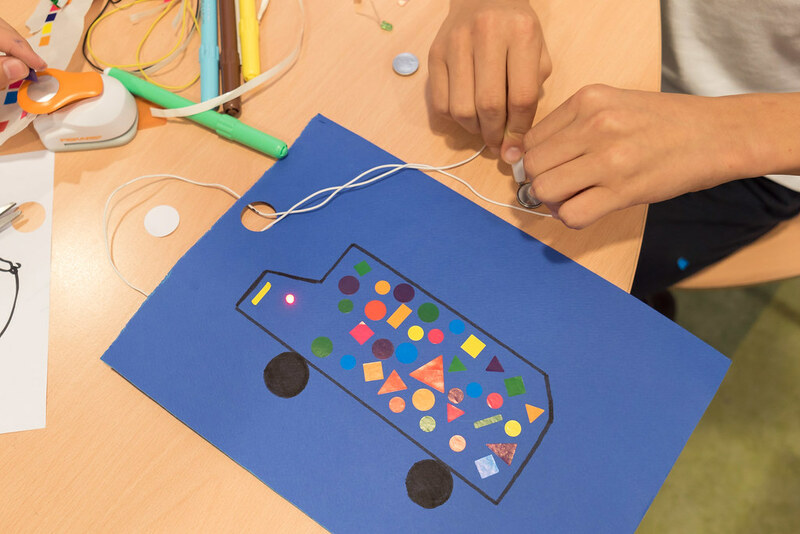 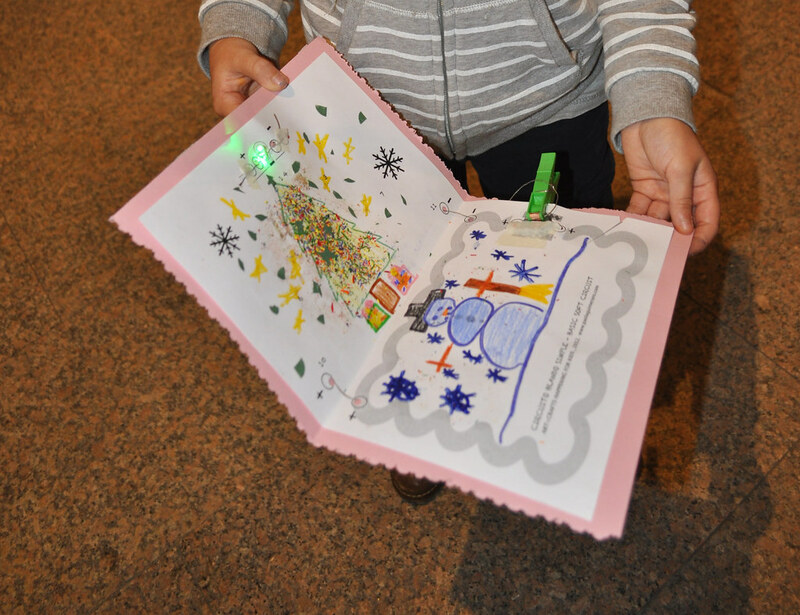 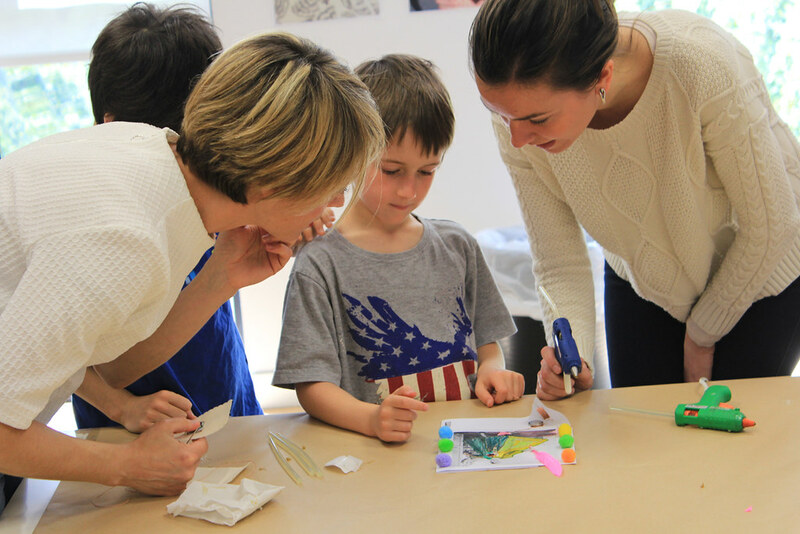 During this introduction to paper circuits, participants will use their creative skills, learn how to include a circuit into paper and blur the boundaries between old crafts and new technologies. 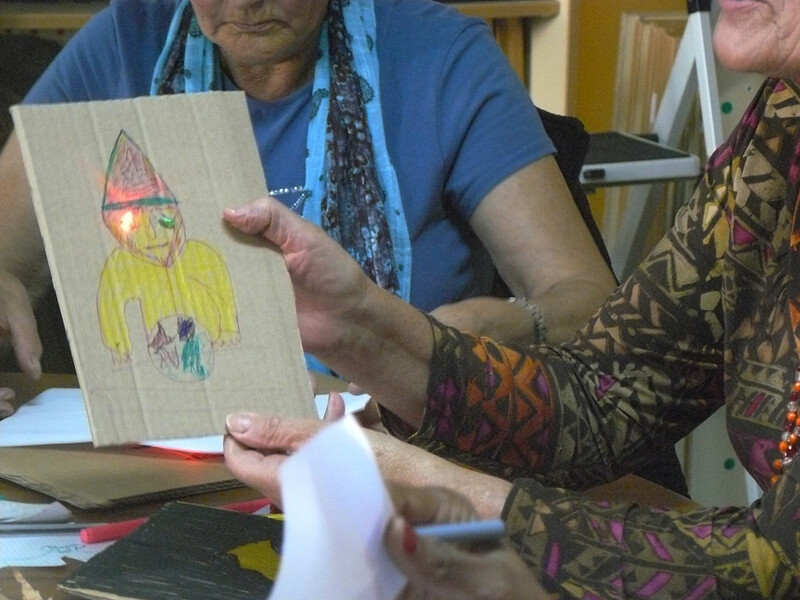 This workshop is taught as one of the activities of Samhain (Samain). 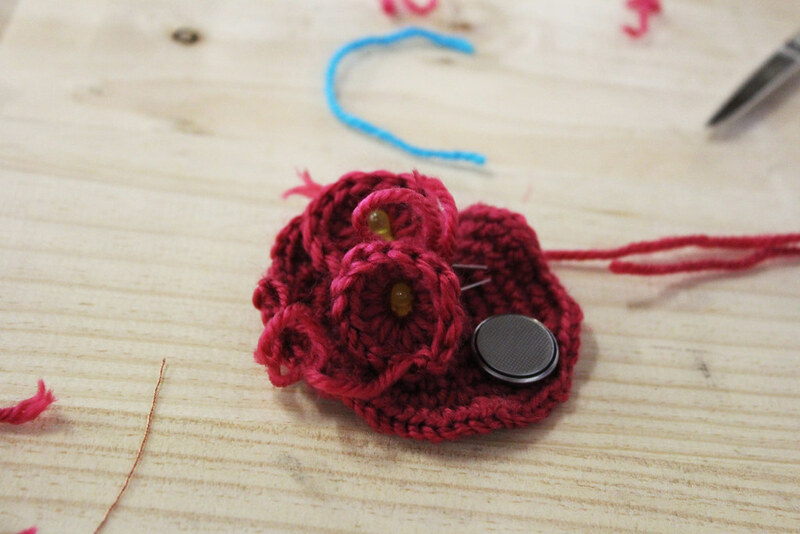 Samhain is a Gaelic festival marking the end of the harvest season and the beginning of winter or the “darker half” of the year. 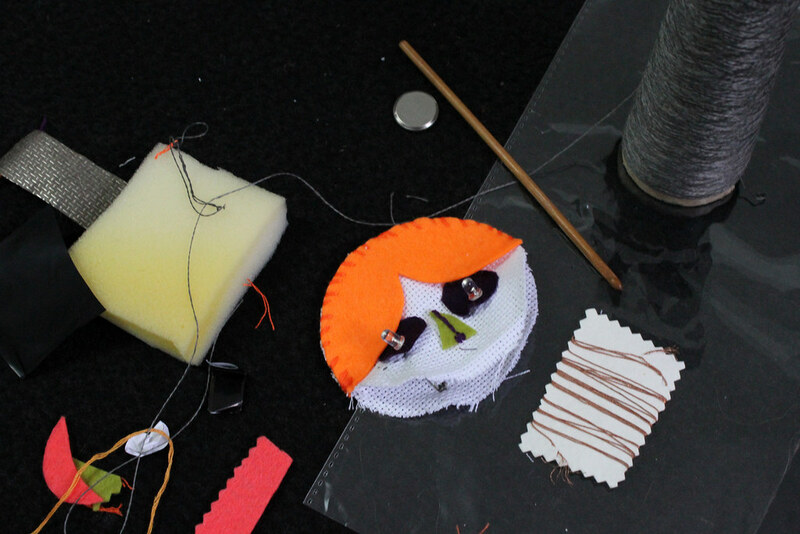 Traditionally, this fun Halloween is celebrated from 31 October to 1 November, as the Celtic day began and ended at sunset. 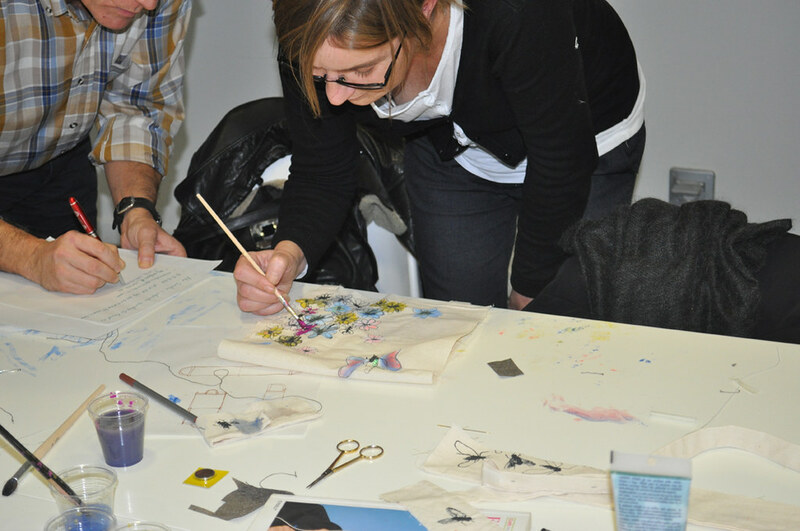 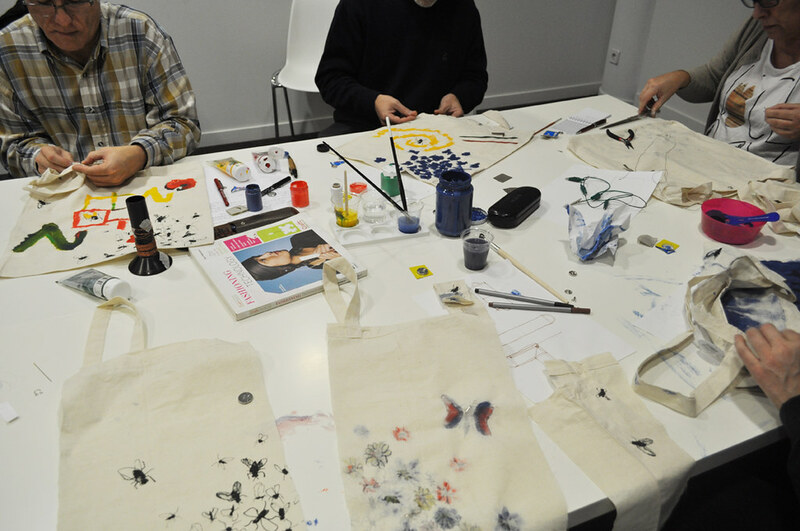 With the integration of sensory technology into our clothing and accessories, we have new avenues to communicate our thoughts, feelings and internal mechanisms, The aim of this workshop is to learn how to use heat-reactive paints to create an interactive design on a textile. 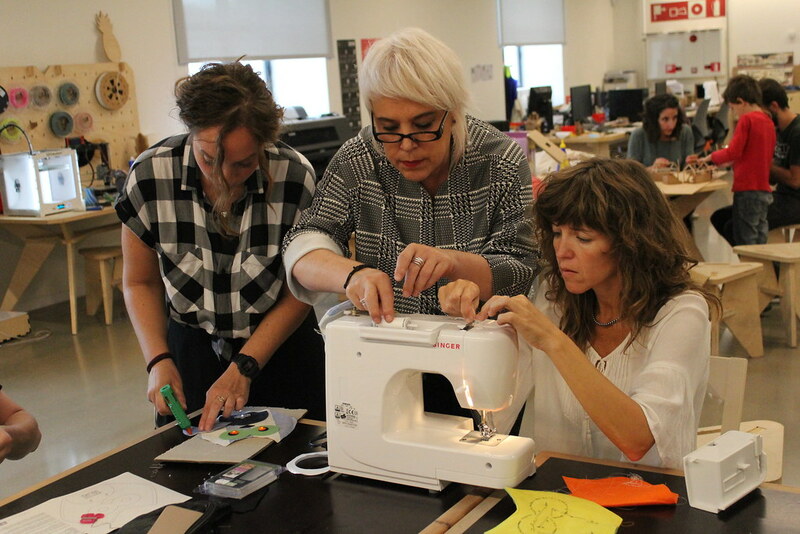 From the completion of a series of do-it-yourself exercises and methodologies, participants will learn how to make a garment or interactive accessory . 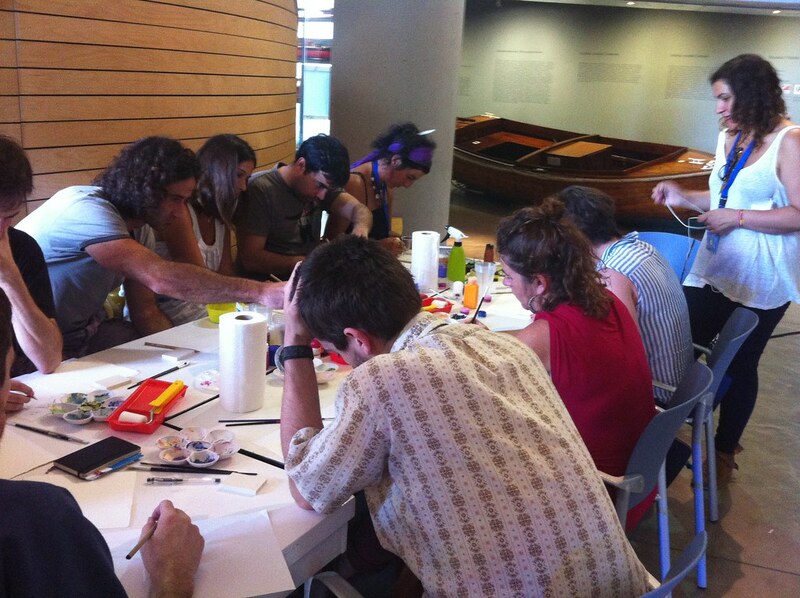 I run this workshop when I was doing an Art Artists-in-Residency Program at the MAC Gas Natural Fenosa Museum of Contemporary. 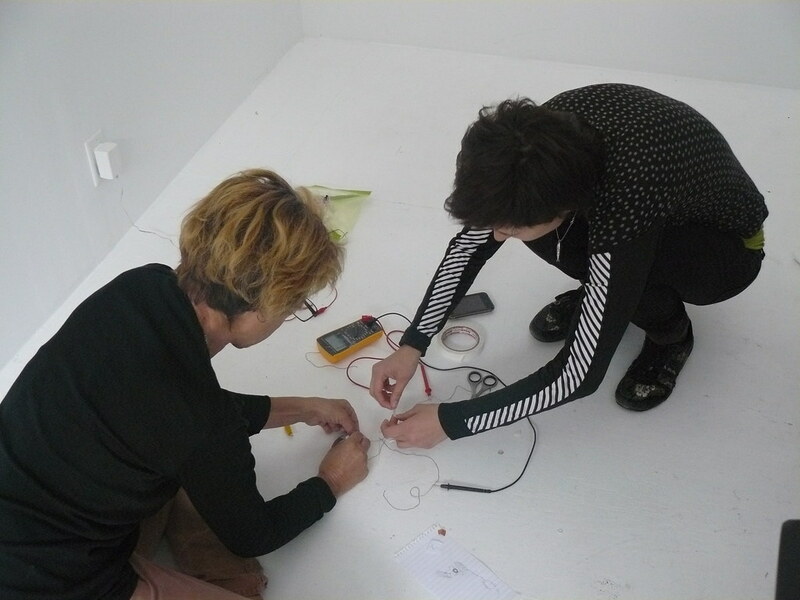 This residency programme is aimed at artists at key stages in their career and encourages research, experimentation, critical discourse and production. 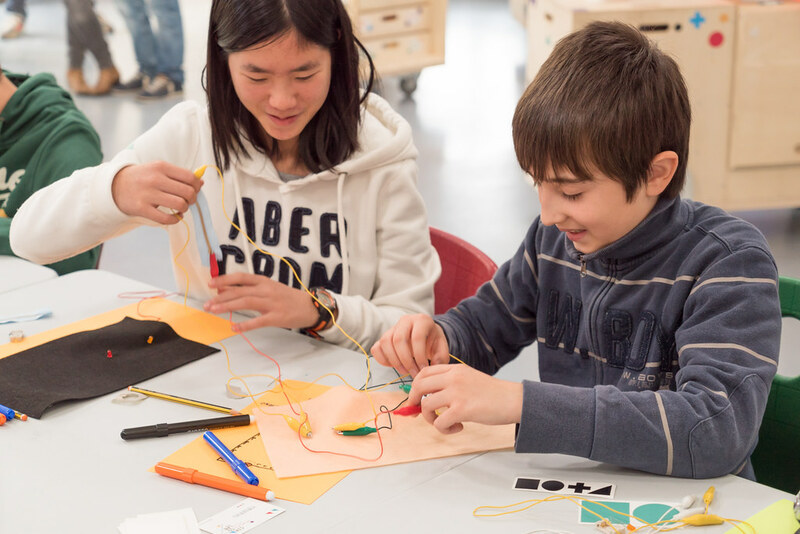 This workshop teaches kids about circuits and electricity. 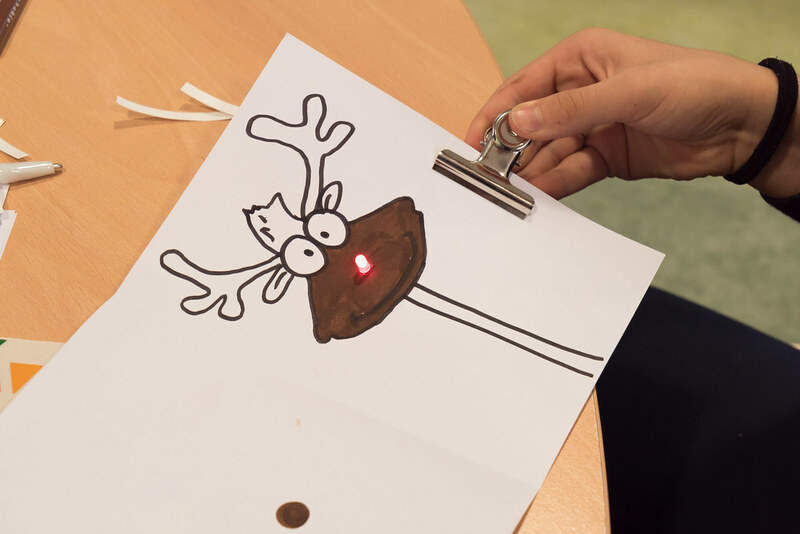 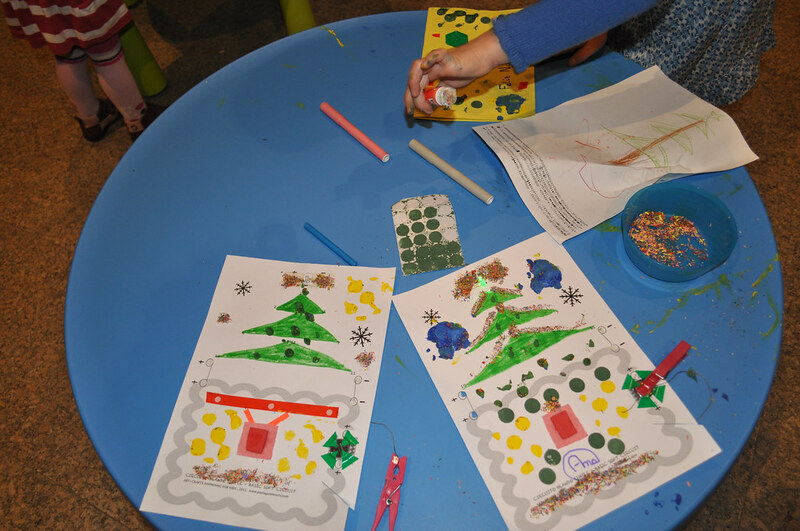 The goal is the kids learn to construct a simple circuit to light an LED and when get the light to come on, design your their own chistmas picture using coloring markers and paper. 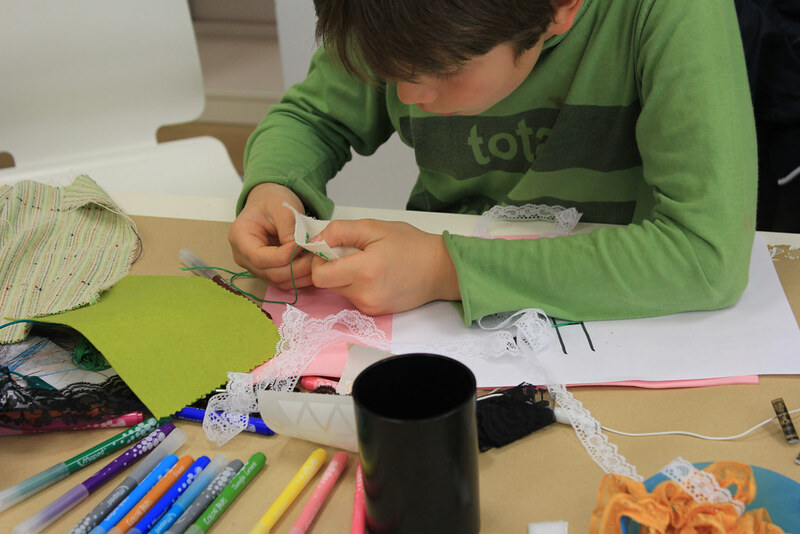 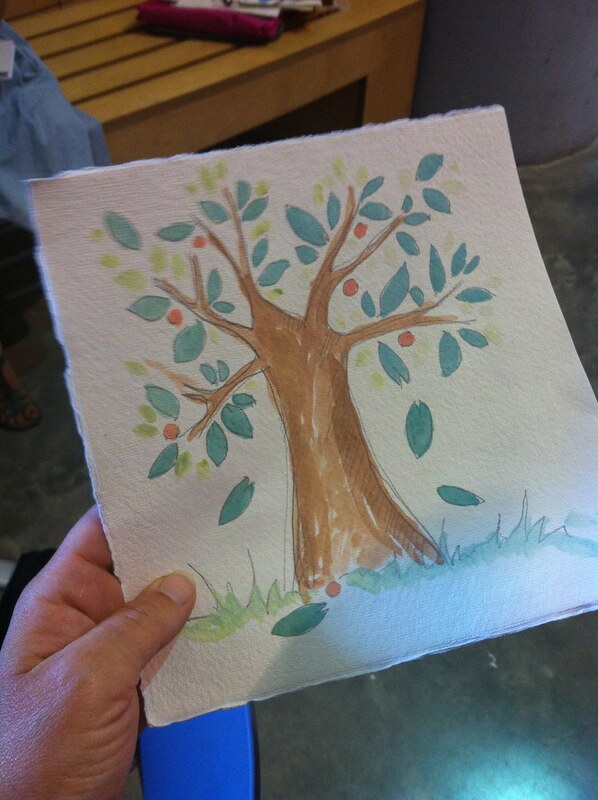 The workshop is for all and kids below the age of 10 need to be accompanied by a parent. 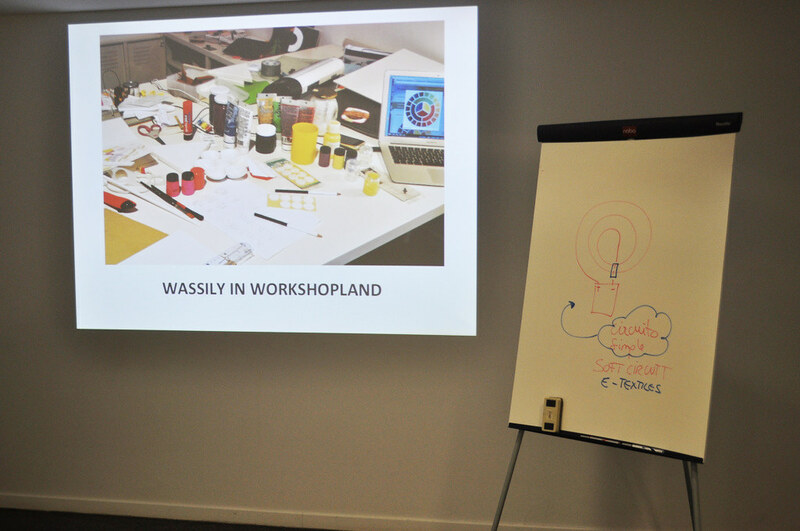 The series of workshops Wassily in Workshopland explore the artistic possibilities offered by the field of e-textiles and paper ircuits applied to art education. 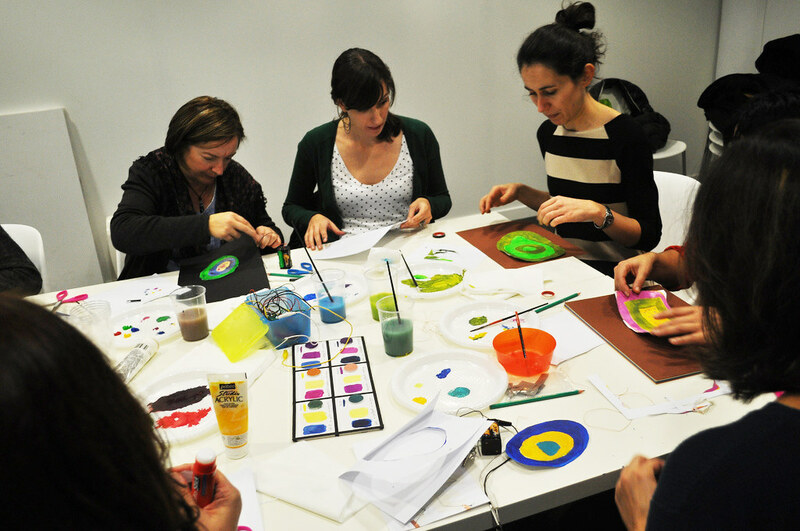 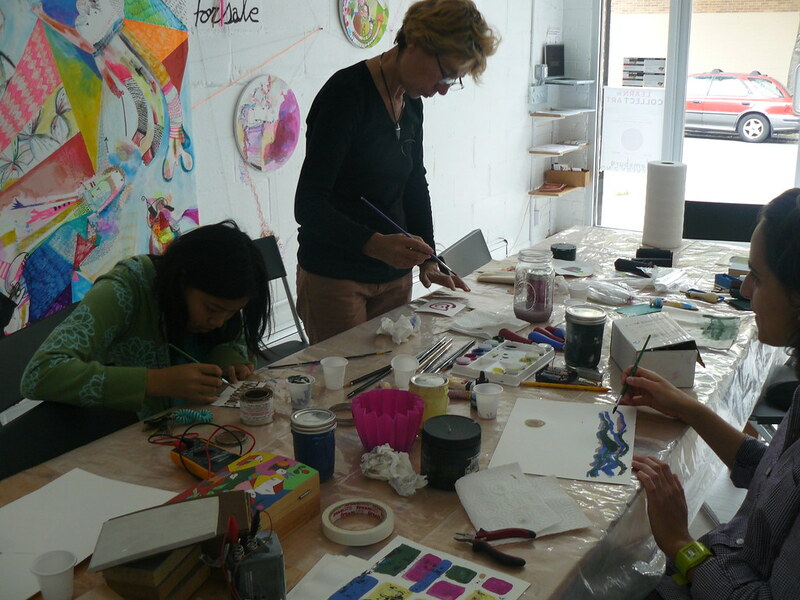 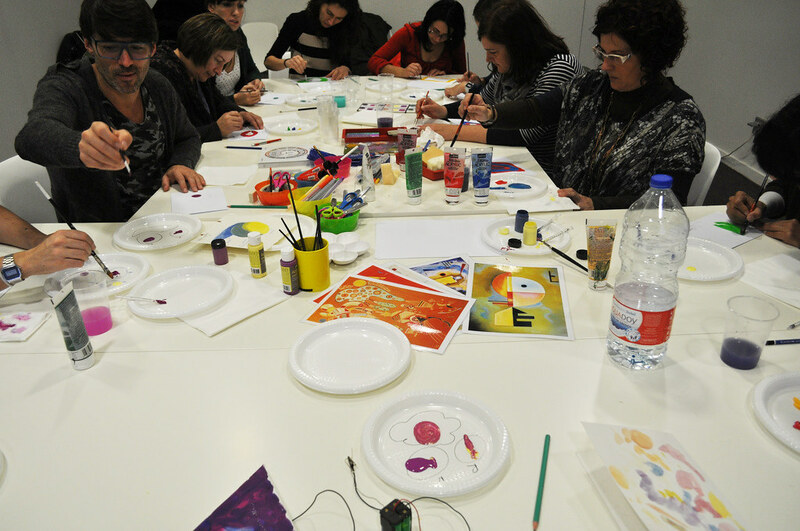 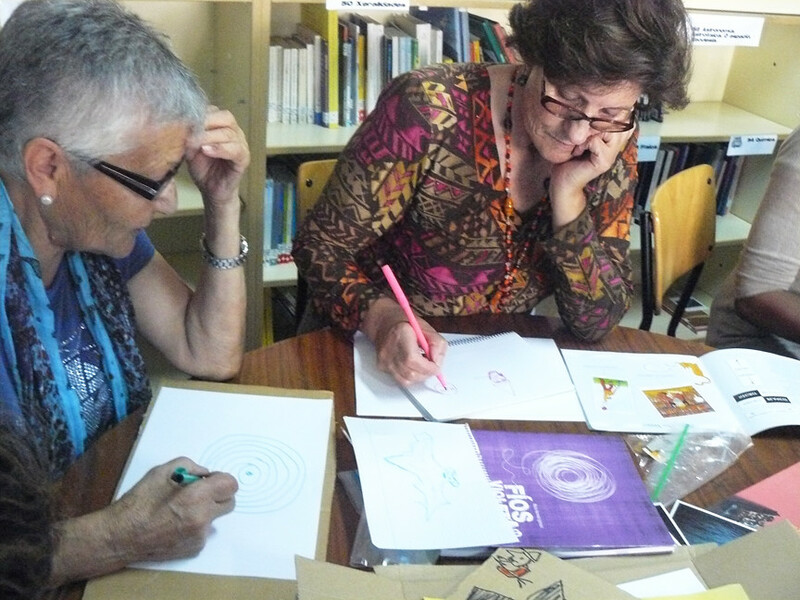 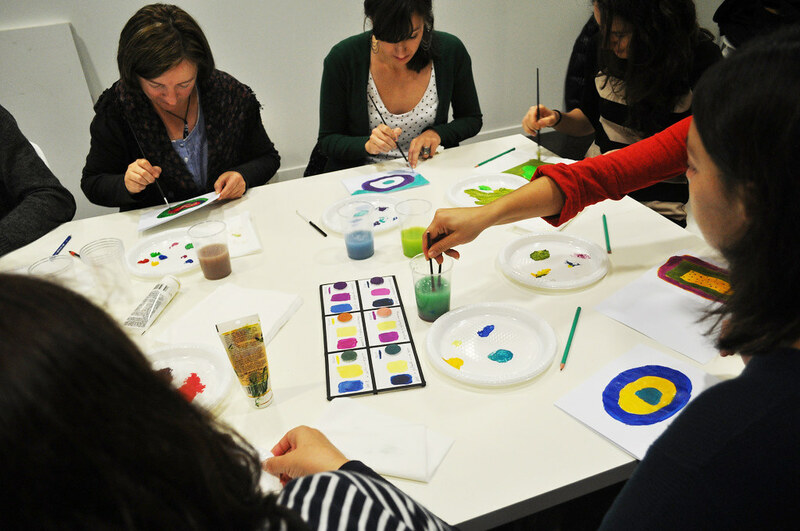 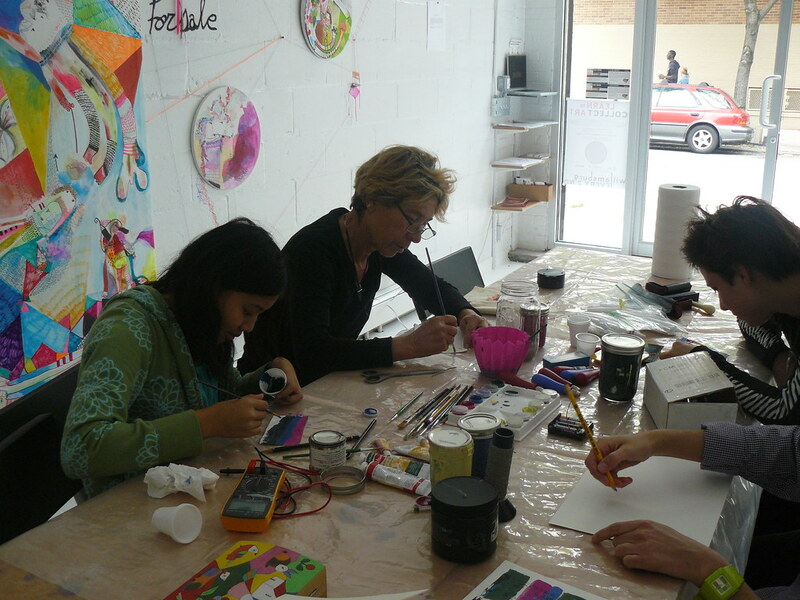 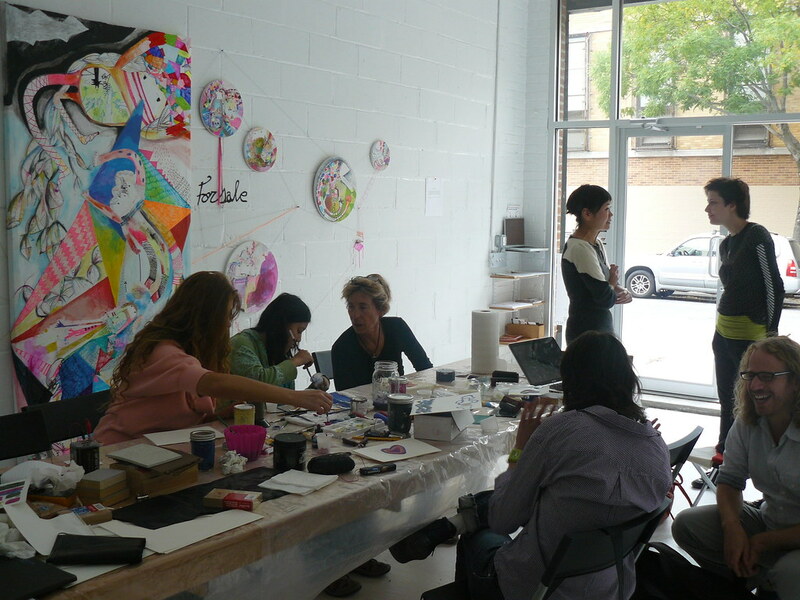 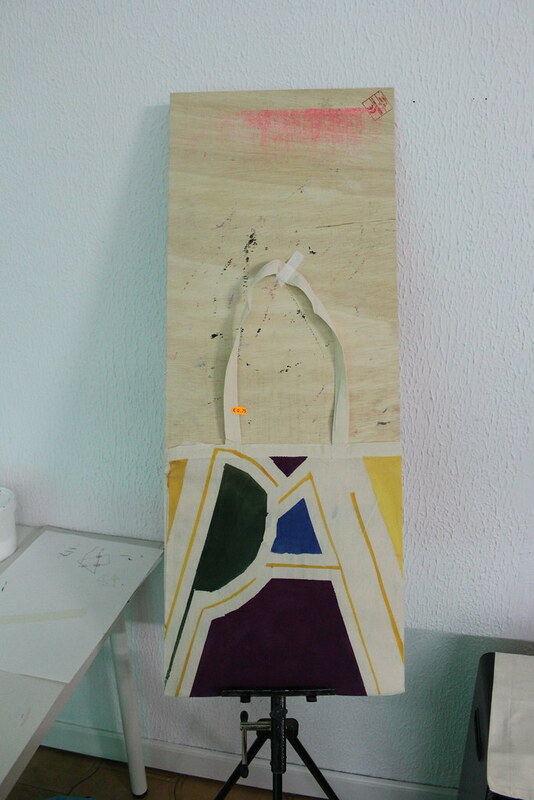 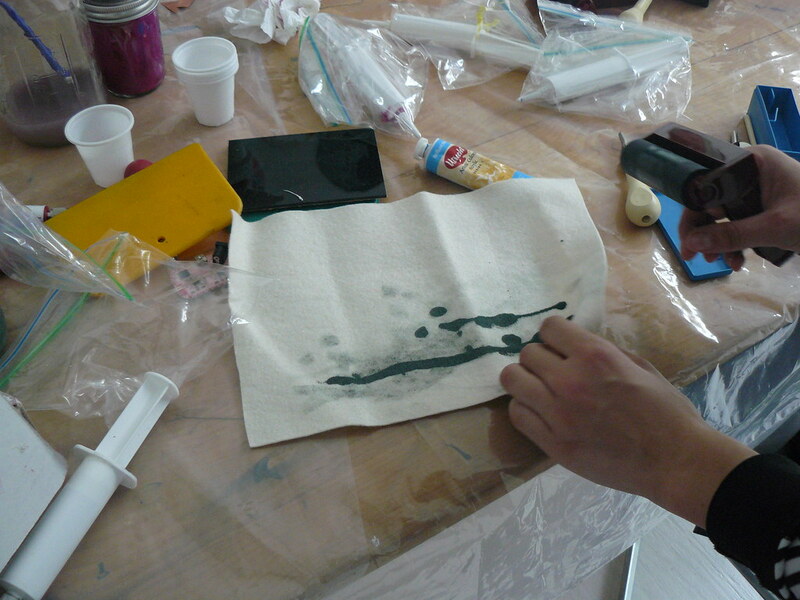 Beginning with the introduction of techniques for color exploration, the manufacture of soft circuits and the use of predesigned templates, participants will implement interactivity and animation in their paintings. 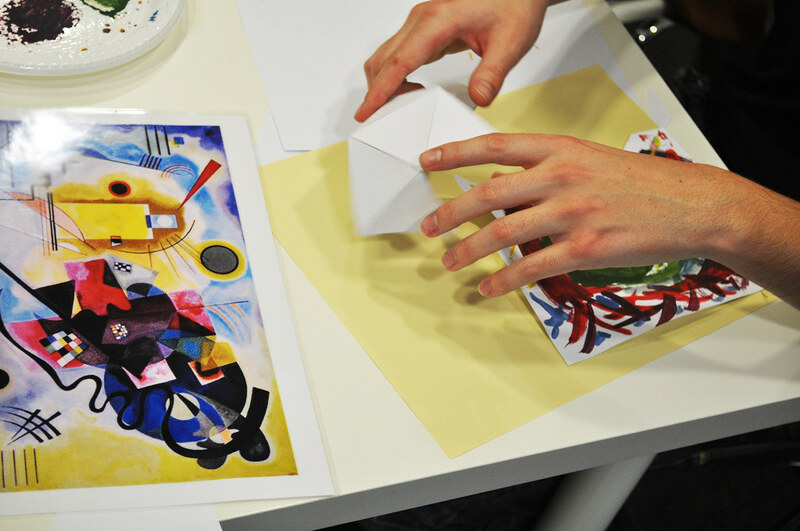 During these workshops, with the aim of approaching the technology from the art, the most representative paintings of the artist Wassily Kandinsky will be analyzed and a series of exercises of composition of forms, colors or textures will be realized according to its aesthetic principles. 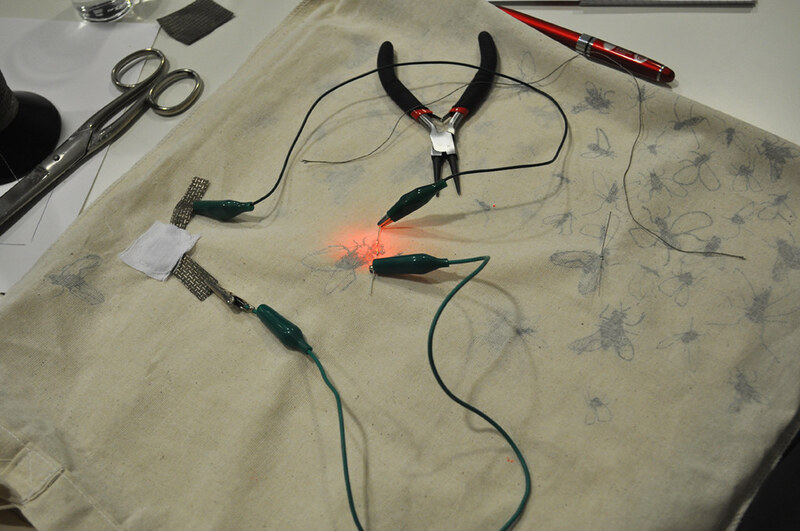 Soft circuits es como se denomina a la reciente alternativa de fabricar circuitos utilizando nuevos materiales suaves como telas, tintas o hilos conductores de electricidad . 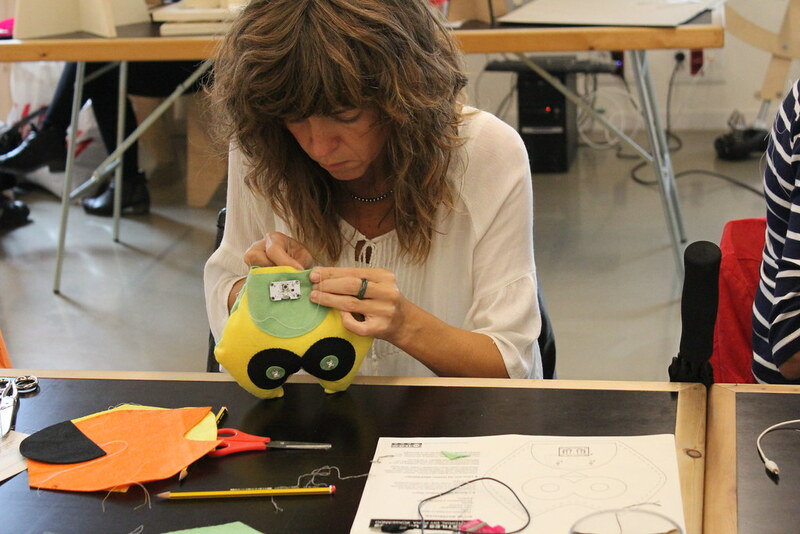 Durante el SummerLab el nodo sketching soft circuits propone un espacio abierto para la experimentación y exploración de estos nuevos materiales y sus posibles aplicaciones en proyectos educativos y artísticos. 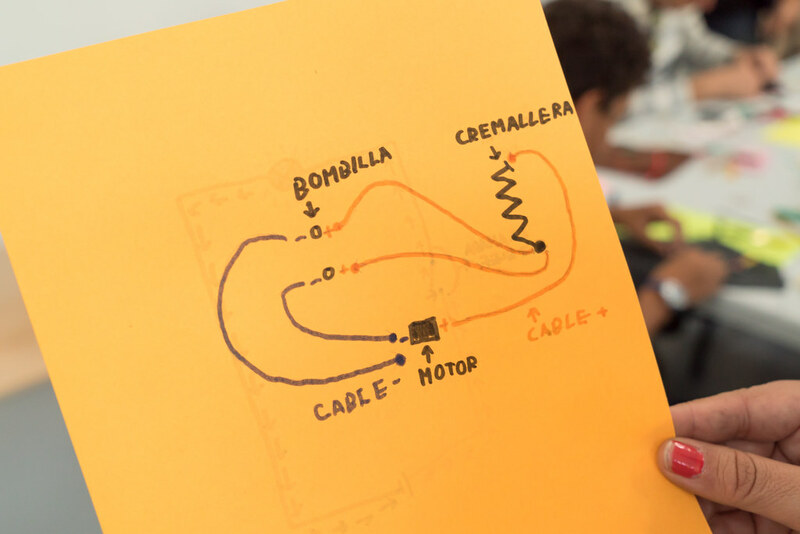 A partir de la introducción de conceptos básicos de electrónica, el objetivo es enseñar a los participantes a diseñar de circuitos simples, así como documentar sus proyectos, En el taller se realizara una prototipo de soft interfaces controlado vía teléfono móvil. 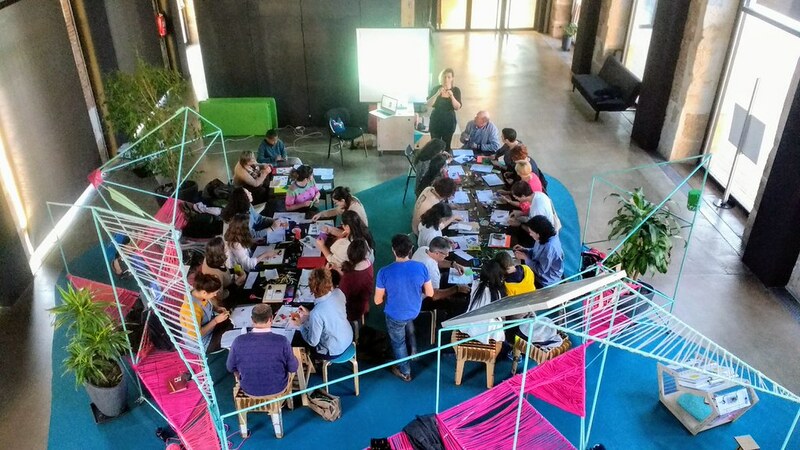 El SummerLAB es un evento participativo, una oportunidad para trabajar juntos, compartiendo ideas, códigos y mucho más. 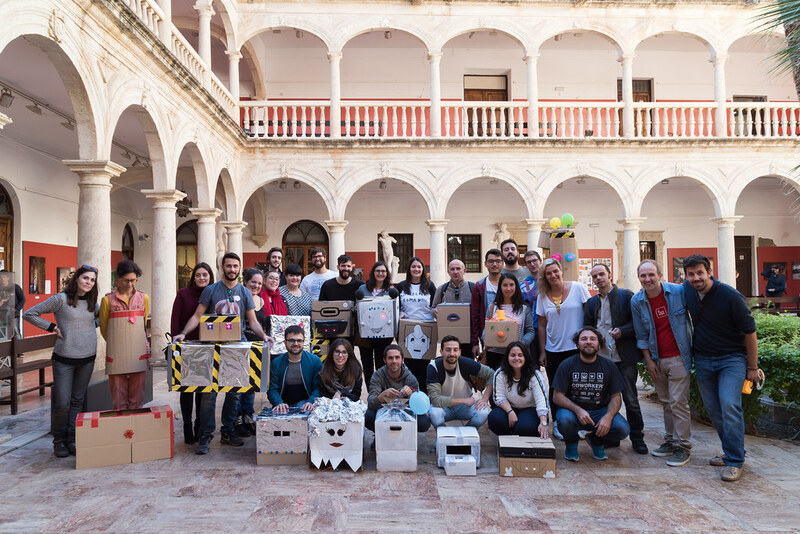 Su organización reproduce la manera en que se desarrolla el software libre –no hay jerarquía, tan sólo la creación de un contexto donde el deseo libre y la ayuda mutua fluyen al servicio de la creación. 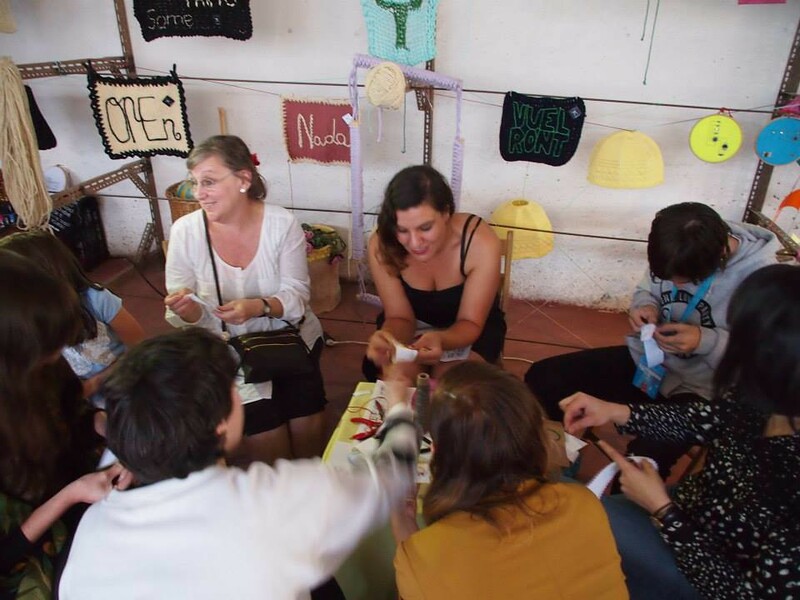 Este nodo lo desarrollo en colaboración con Horacio González. 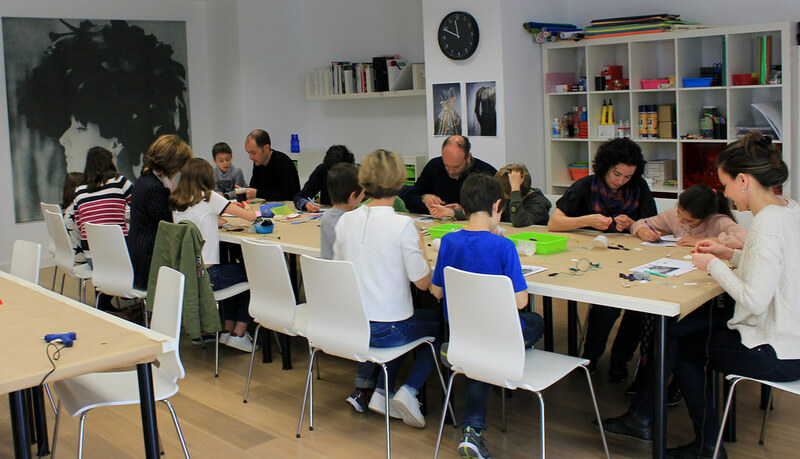 This paper circuit workshop is offered as a basic introduction to electronics for parents and children. 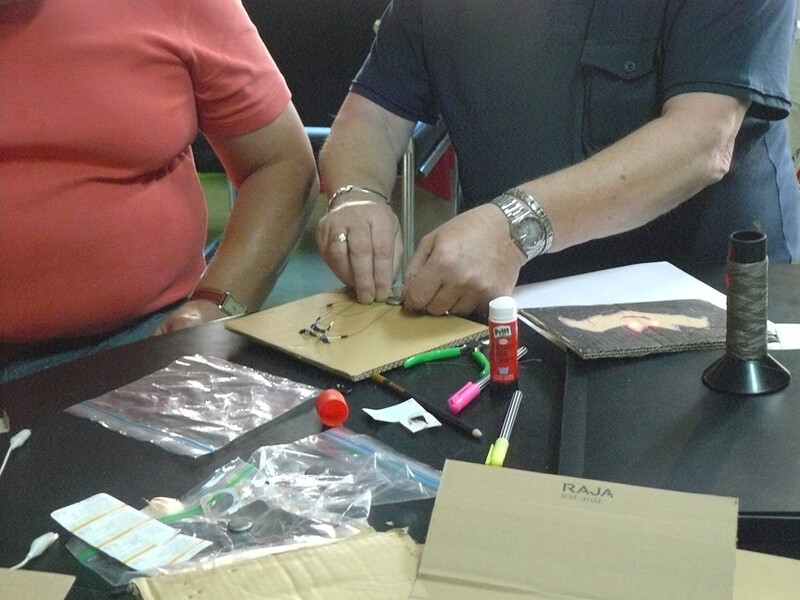 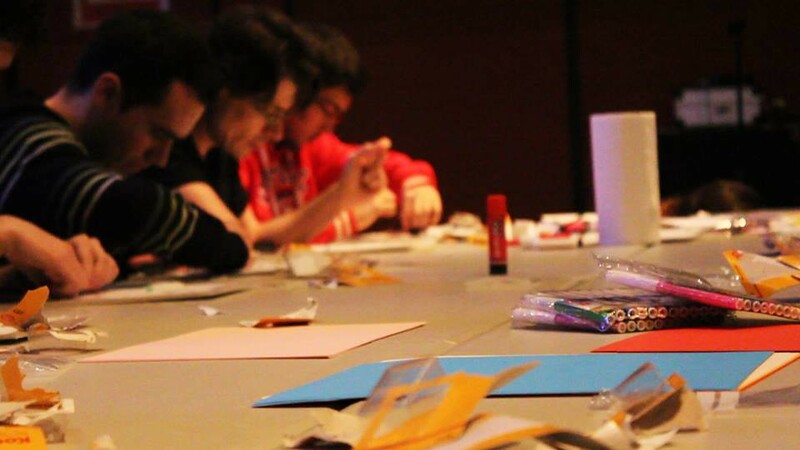 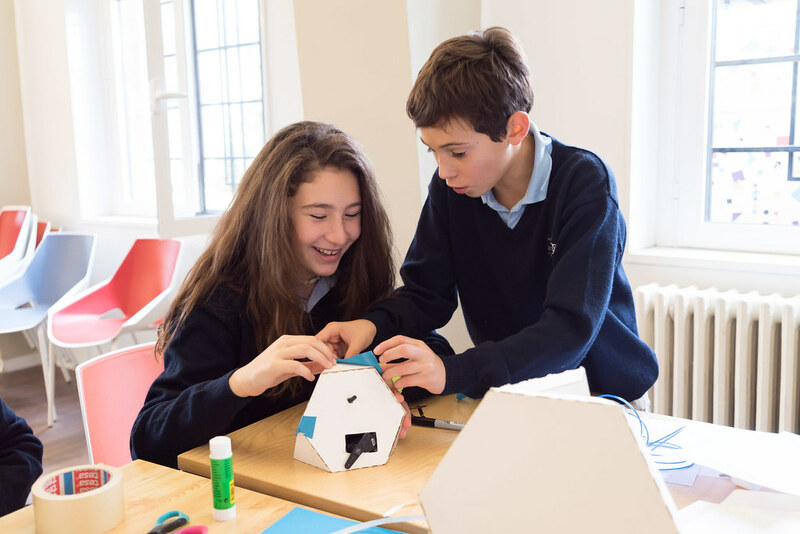 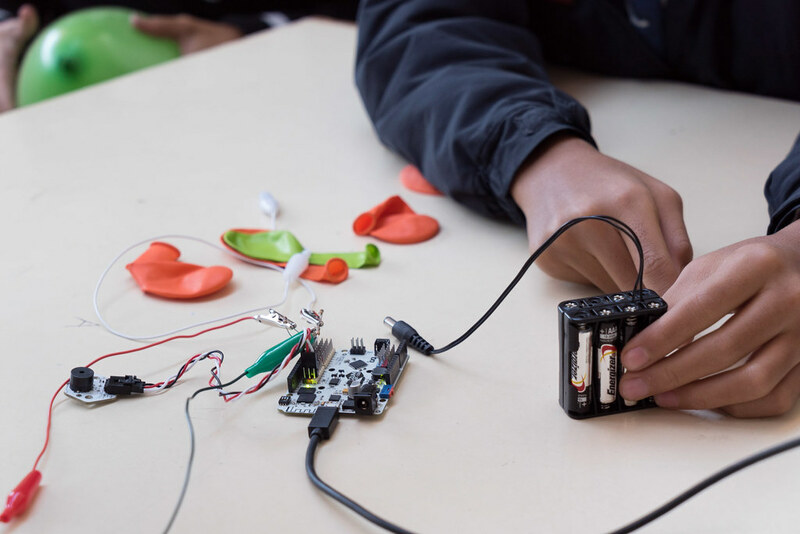 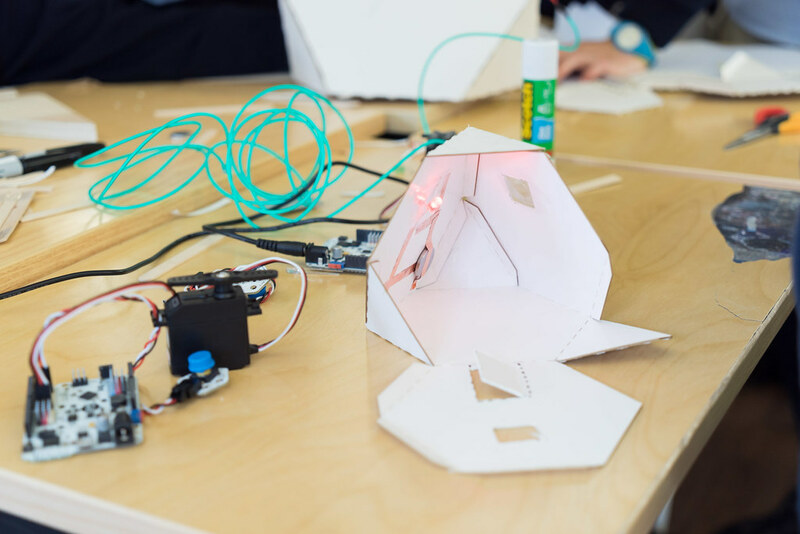 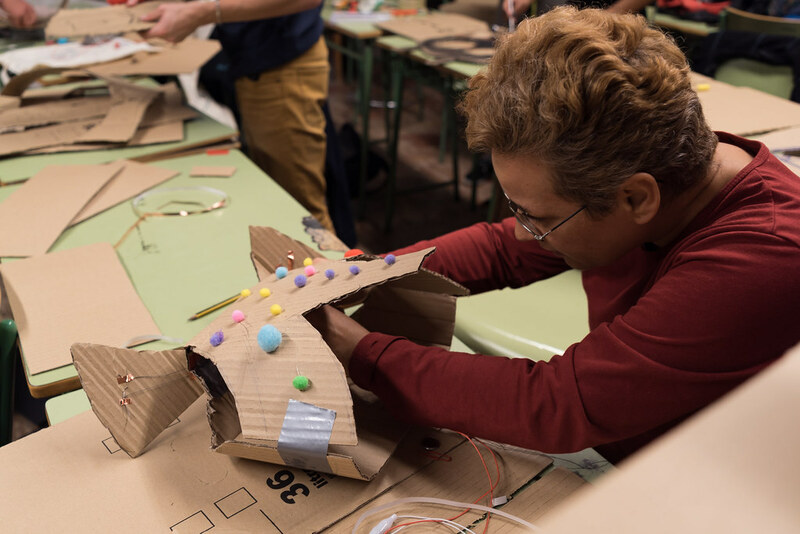 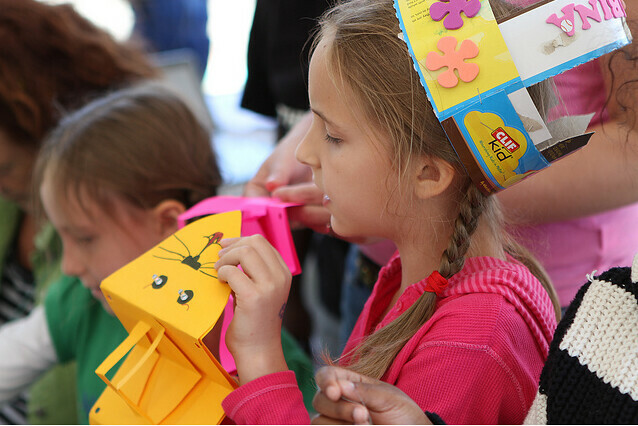 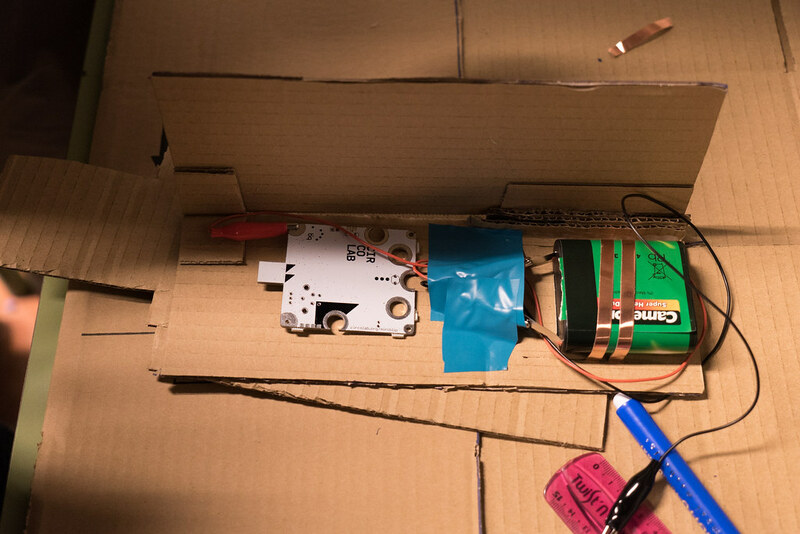 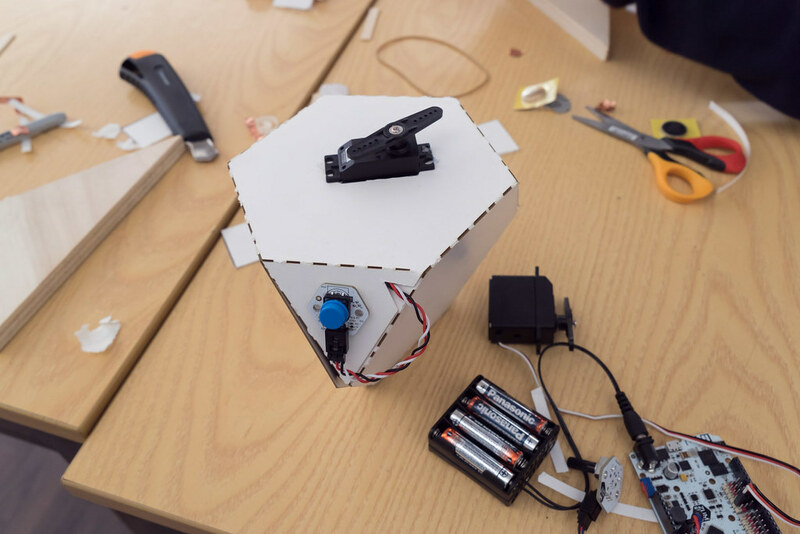 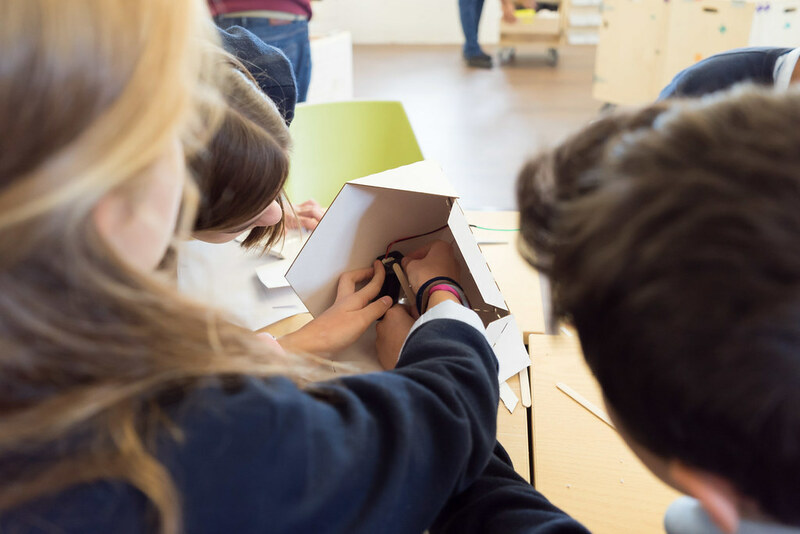 Participants will learn how to build a circuit, experiment with new materials and explore the creative potential of integrating electronics into materials such as cardboard or foam. 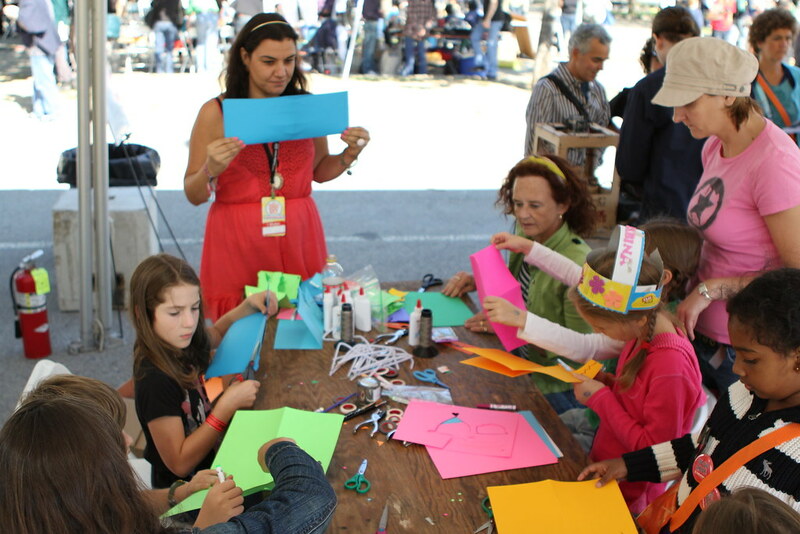 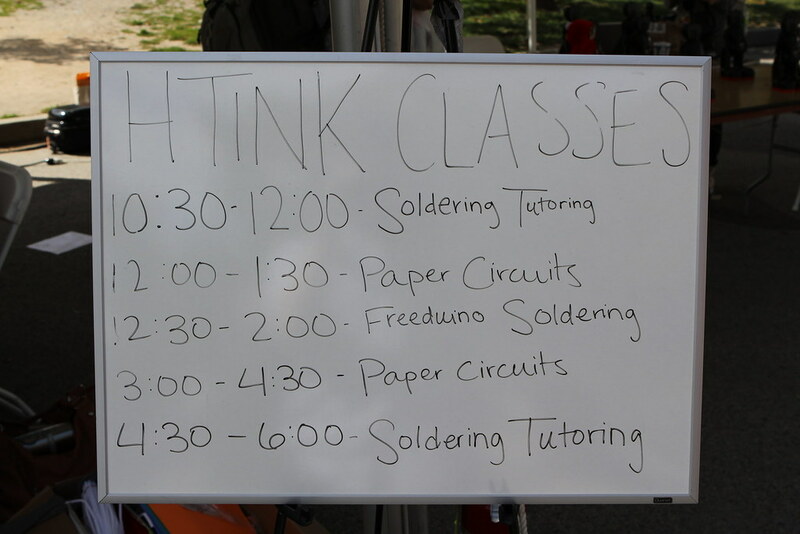 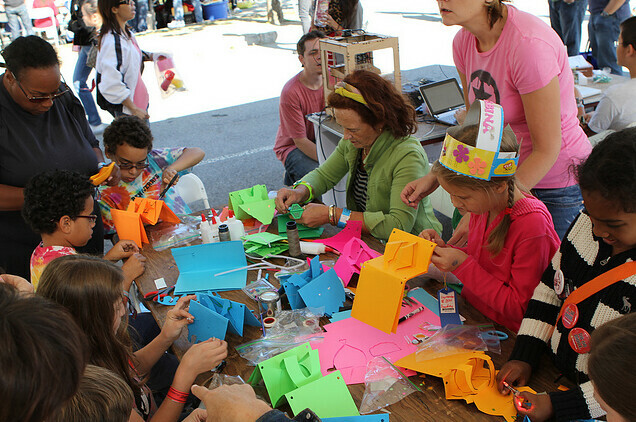 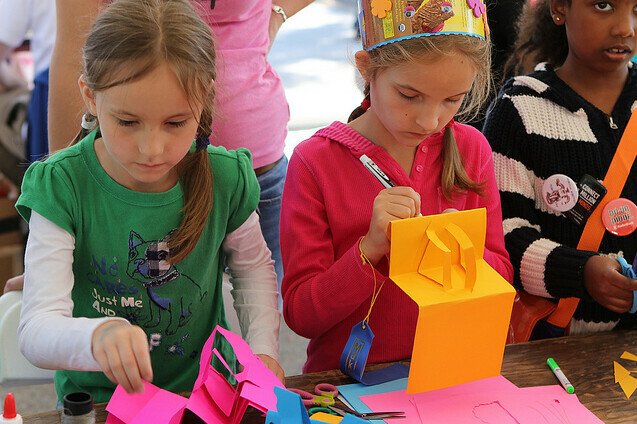 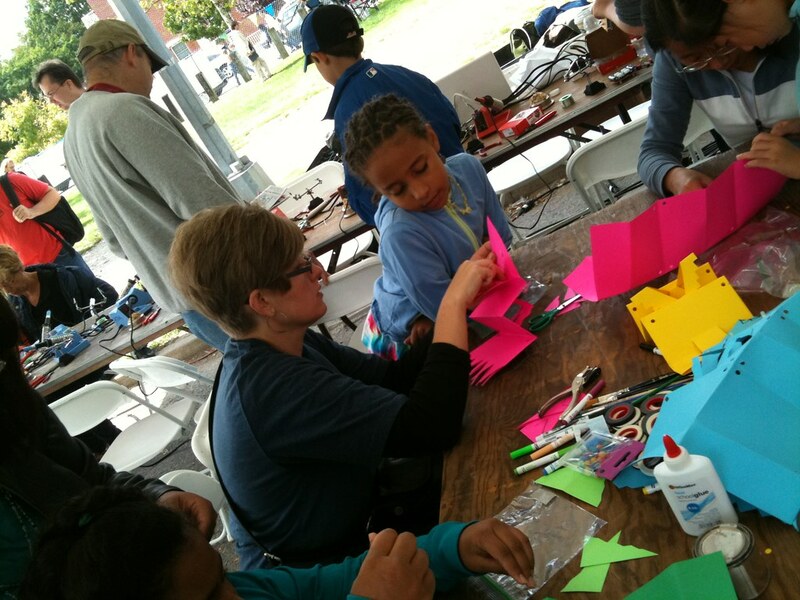 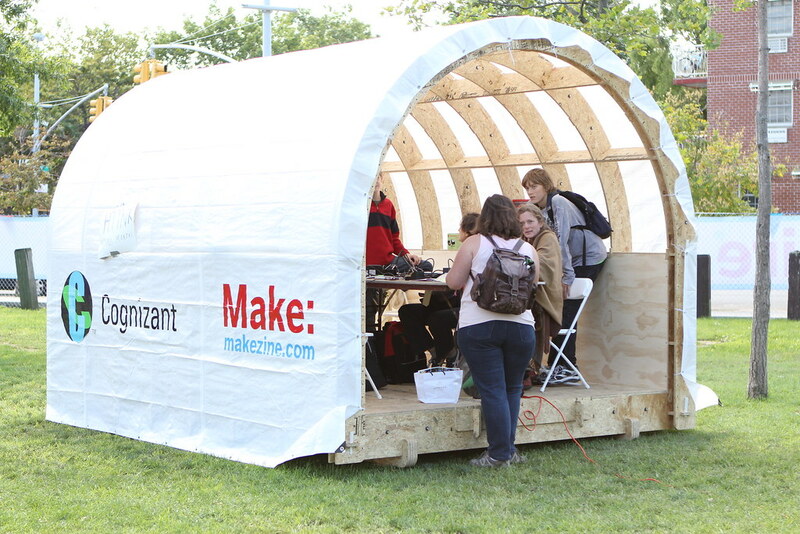 The workshop took place at World Maker Faire, New York and in collaboration n with the team HTINK that teaches technical and creative problem-solving skills to people of all ages. 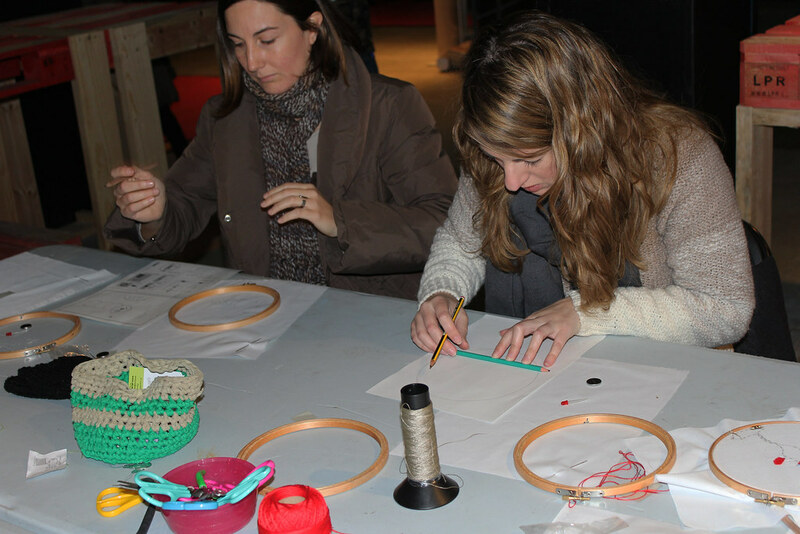 This workshop introduces the participants to the construction of e-textiles and paper- based interactive display. 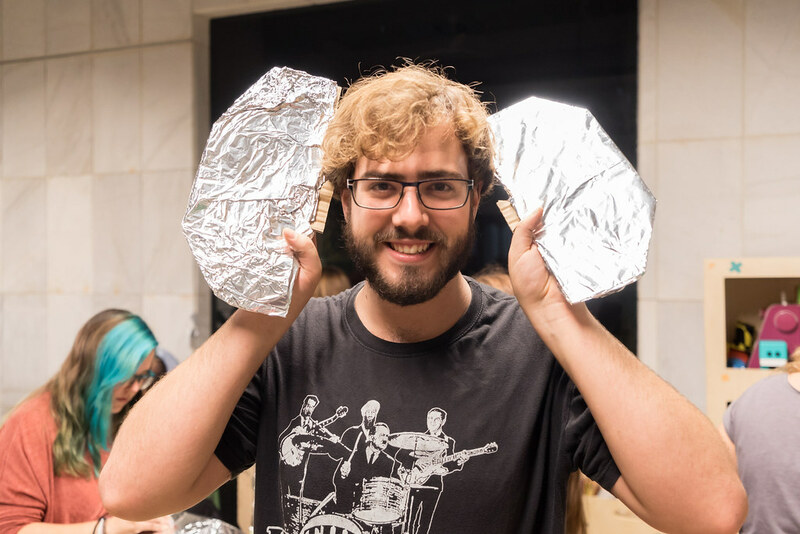 Participants will learn how to combine analog and digital techniques with new materials that react to temperature and electric charges. 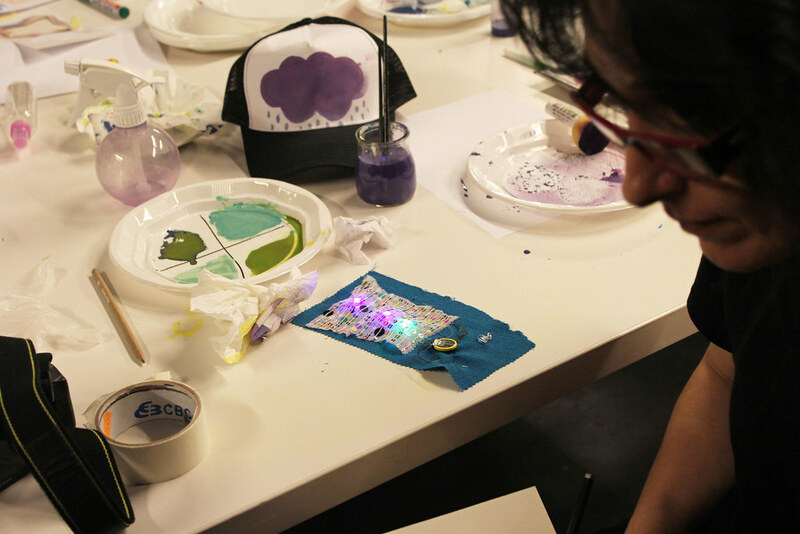 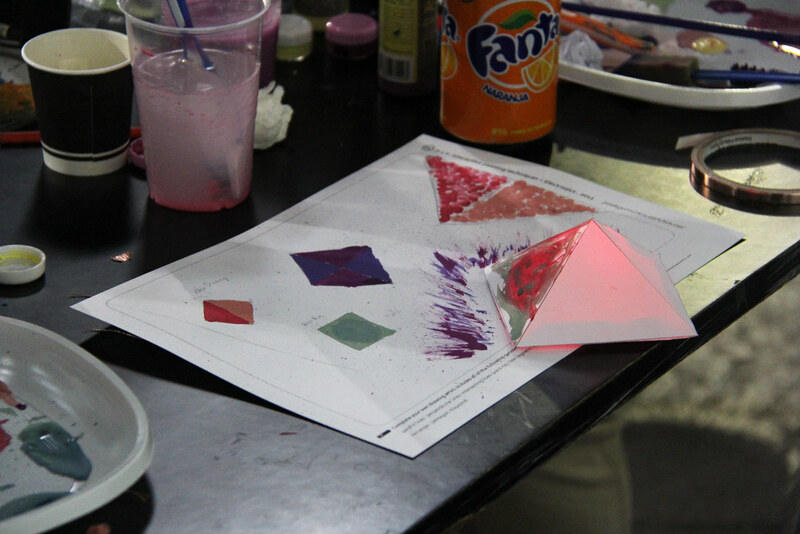 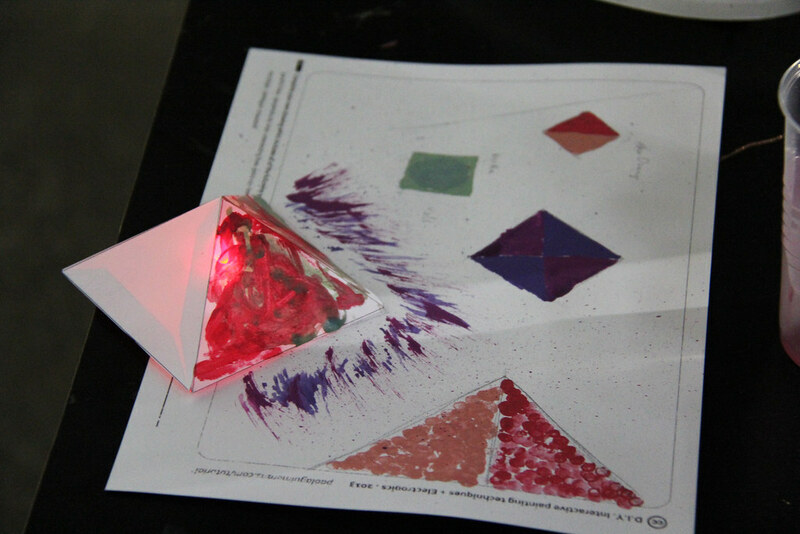 During the session participants will be introduce to DIY electronic pritmaking techniques based on thermochromic inks and soft circuits. 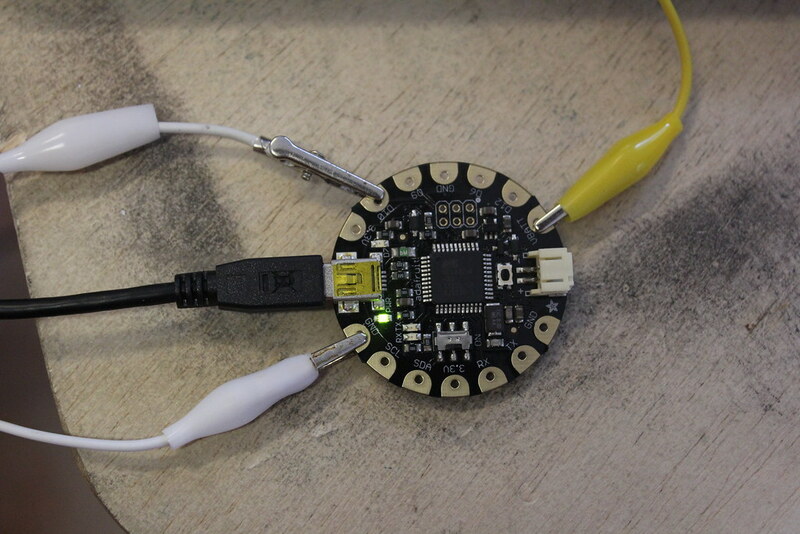 Also, they will have a presentation of Heatit (beta), an open soruce electronic kit designed to easily heat conductiva materials . 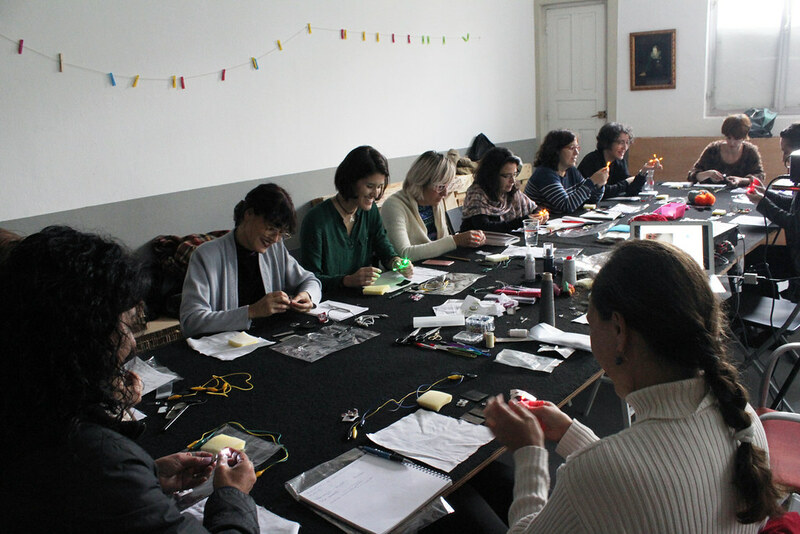 This workshop took places in an art gallery, during the presentation of the installation “Beyond the sleeping lighthouse”.